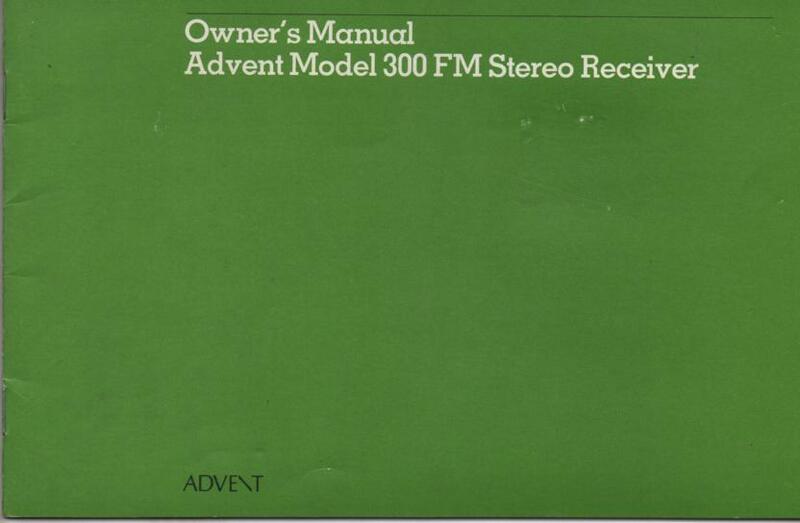 Manual ADVENT300 FM Receiver Owners Manual PHOTO COPY! 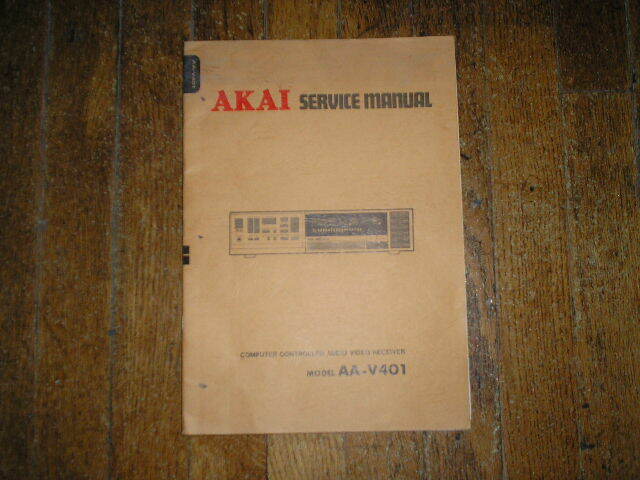 Manual AKAIAA-A25L Receiver Operators Manual PHOTO COPY! Manual AKAIAA-A25L Receiver Manual de l'utilisateur PHOTO COPY! Manual AKAIAA-A25L Receiver Bruksanvisning PHOTO COPY! Manual AKAIAA-A25L Receiver Gebruiksaanwijzing PHOTO COPY! 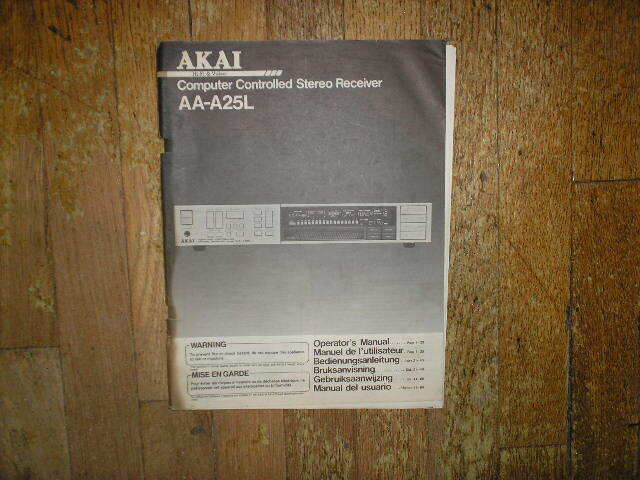 Manual AKAIAA-A25L Receiver Owners Manual de usuario PHOTO COPY! 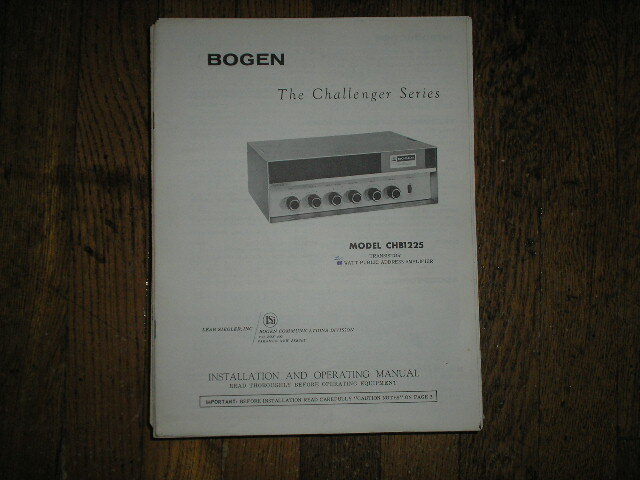 Manual BogenCHB1225 Challenger P. A. Amplifier Service and Instruction Manual with Schematic PHOTO COPY! 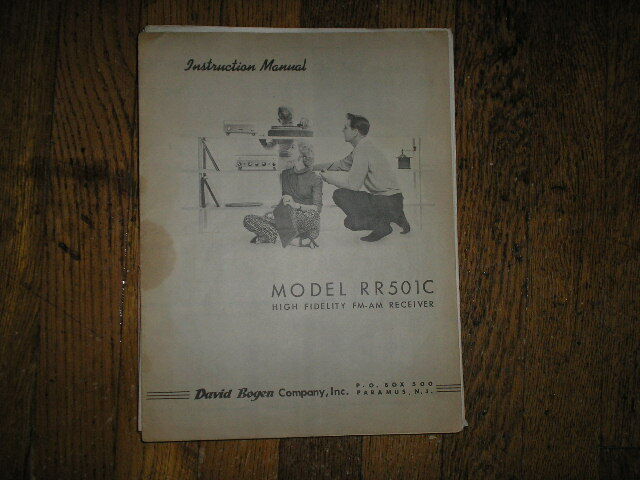 Manual BogenRR501C RECEIVER Service and Instruction Manual with Schematic PHOTO COPY! 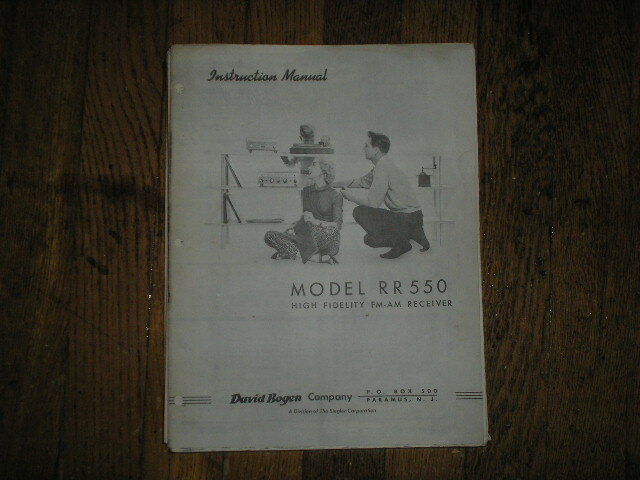 Manual BogenRR550C RECEIVER Service and Instruction Manual with Schematic PHOTO COPY! 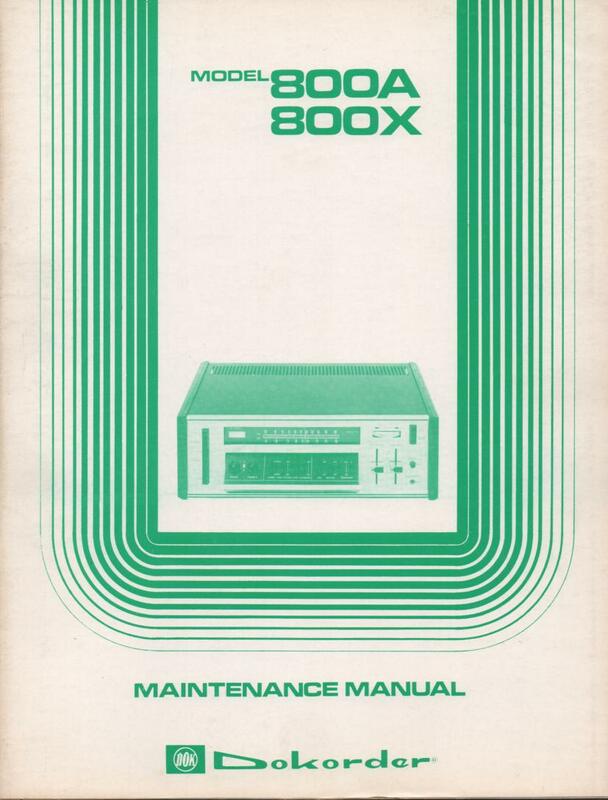 Manual BoseXM-6 Extramixer Service Manual PHOTO COPY! 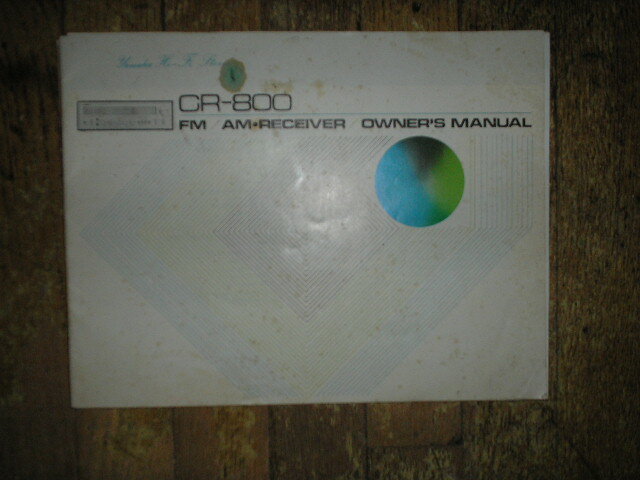 Manual Dokorder800A 800X Receiver Service Manual PHOTO COPY! Manual DynacoPS-1 Dual Power Supply Assembly Manual. Serial on the manual is Serial no. 4432040.. Contains a schematic,parts list, and the assembly instructions PHOTO COPY! 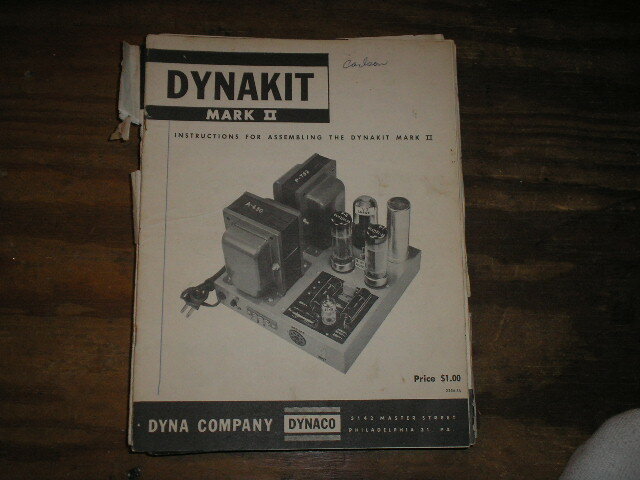 Manual DynacoMARK 2 II Pre-Amplifier Assembly Manual. Serial on the manual is Serial no. 2514803.. contains a schematic, parts list, and the assembly instructions PHOTO COPY! Manual DynacoMARK 2 II POWER AMPLIFIER Assembly Manual.. This manual contains a schematic,parts list, and the assembly instructions PHOTO COPY! 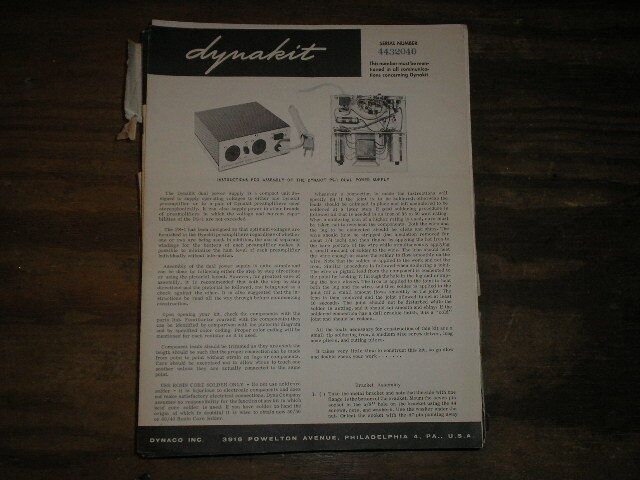 Manual DynacoMARK 3 III POWER AMPLIFIER Assembly Manual.. Serial no. on the manual is Serial no. 3750179...This manual contains a schematic,parts list, and the assembly instructions.. PHOTO COPY! 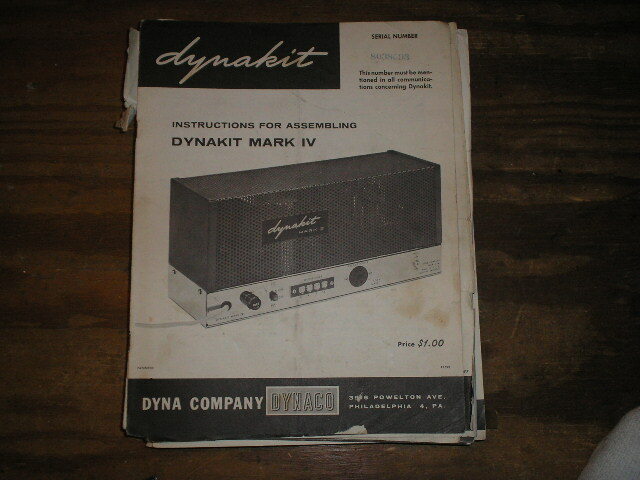 Manual DynacoMARK 4 IV POWER AMPLIFIER Assembly Manual.. Serial no. on the manual is Serial no. 8038093. This manual contains a schematic,parts list, and the assembly instructions.. PHOTO COPY! 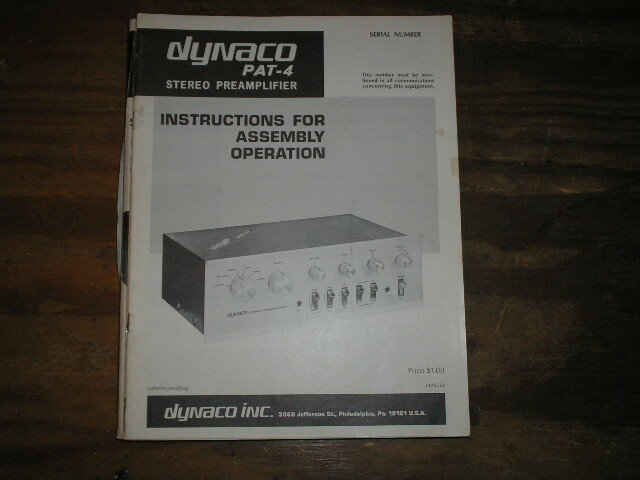 Manual DynacoPAS-2 PREAMPLIFIER Assembly Manual.. This manual contains a schematic,parts list, and the assembly instructions.. PHOTO COPY! 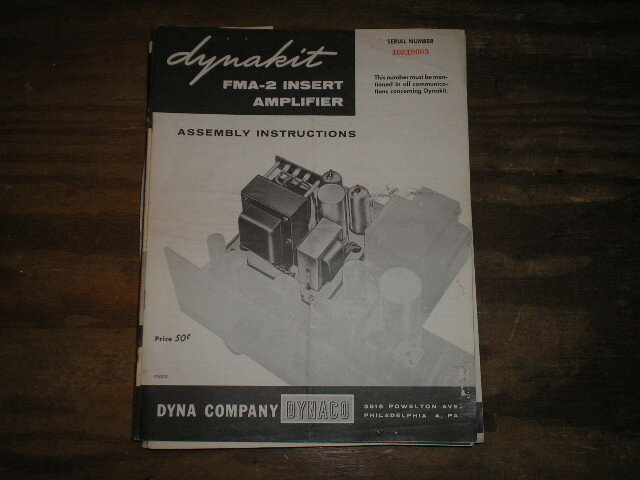 Manual DynacoFMA-2 INSERT AMPLIFIER Assembly Manual.. for Serial no. 10219003.. This manual contains a schematic,parts list, and the assembly instructions.. PHOTO COPY! 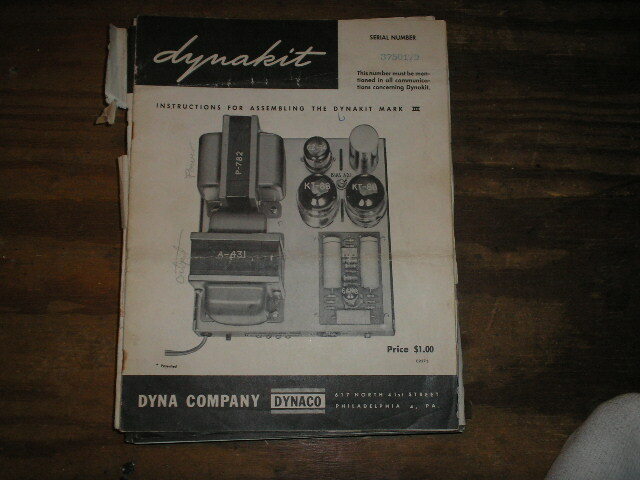 Manual DynacoPAT-4 PREAMPLIFIER Assembly Manual..This manual contains a schematic,parts list, and the assembly instructions.. PHOTO COPY! 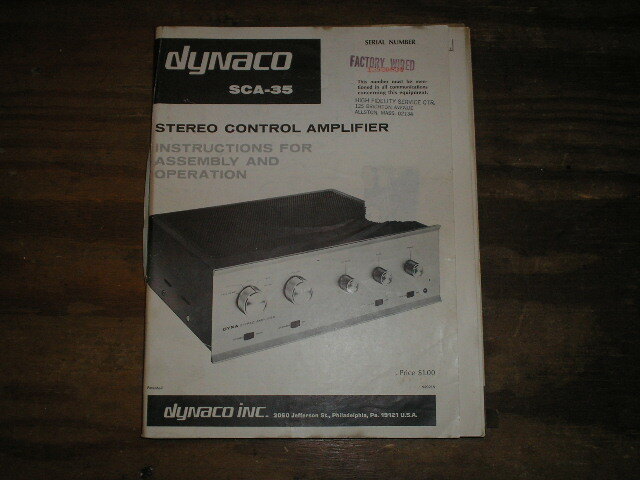 Manual DynacoSCA-35 STEREO CONTROL AMPLIFIER assembly manual.. serial no. 15920834.. contains a schematic,parts list, and the assembly instructions PHOTO COPY! Manual DynacoSCA-35 STEREO CONTROL AMPLIFIER Assembly PICTORAL DIAGRAM (large size photocopy) PICTORAL 1 PHOTO COPY! Manual DynacoSCA-35 STEREO CONTROL AMPLIFIER Assembly PICTORAL DIAGRAM (large size photocopy) PICTORAL 2 PHOTO COPY! 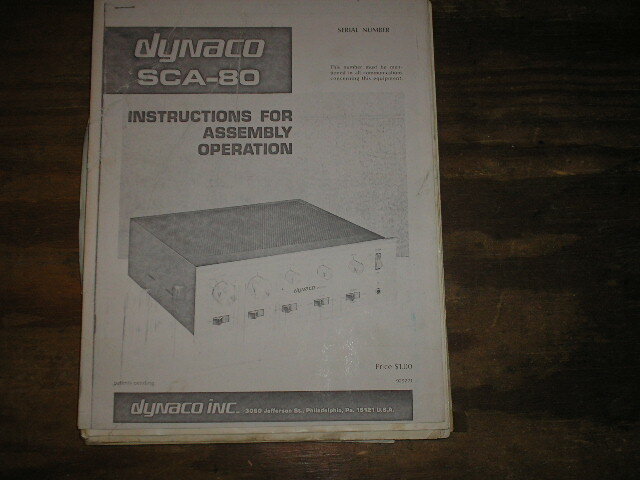 Manual DynacoSCA-80 CONTROL AMPLIFIER Assembly Manual contains a schematic,parts list, and the assembly instructions PHOTO COPY! 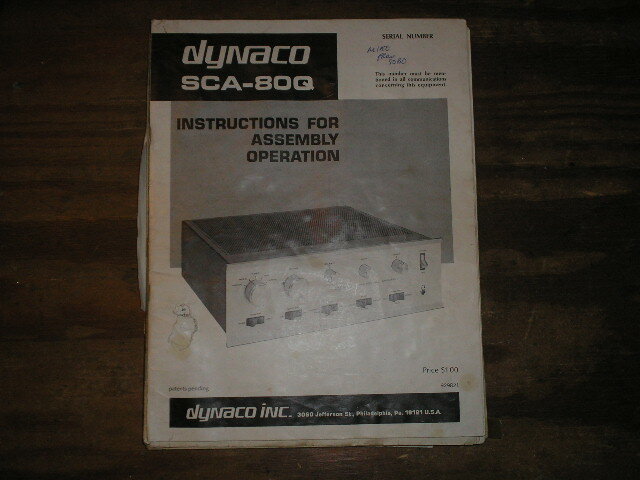 Manual DynacoSCA-80Q CONTROL AMPLIFIER Assembly Manual contains a schematic,parts list, and the assembly instructions PHOTO COPY! Manual DynacoSTEREO 400 CONTROL AMPLIFIER Assembly PICTORAL DIAGRAM (large size photocopy) PHOTO COPY! 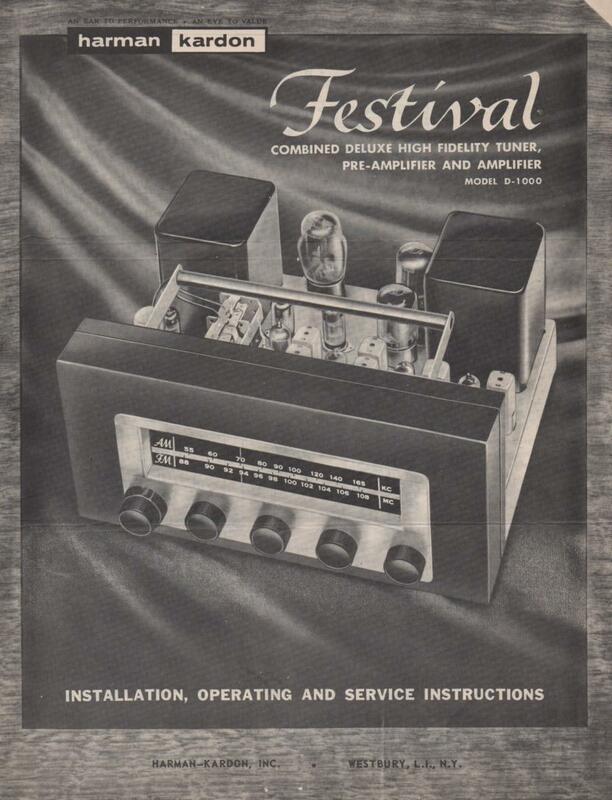 Manual DynacoSCA-50 CONTROL AMPLIFIER Assembly Manual contains a schematic,parts list, and the assembly instructions PHOTO COPY! 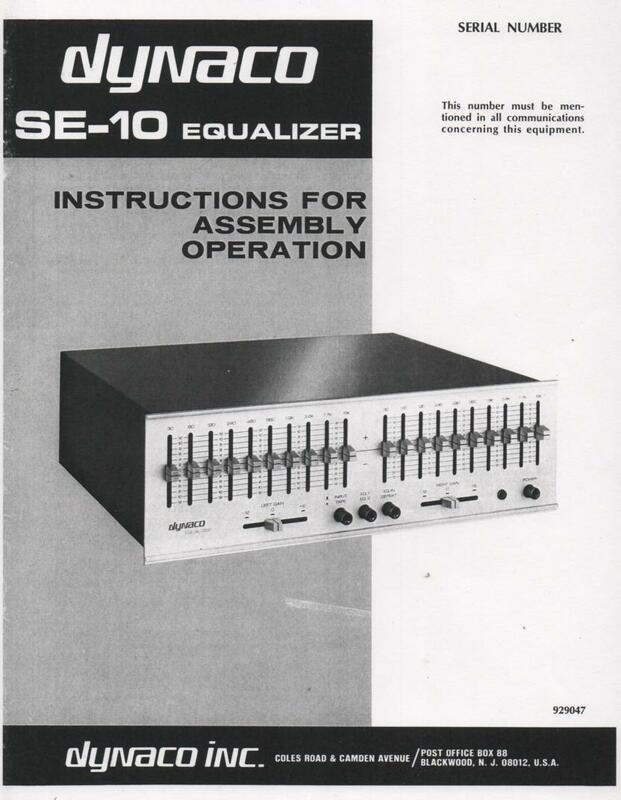 Manual DynacoSE-10 Equalizer Assembly Manual. contains a schematic, parts list, and the assembly instructions PHOTO COPY! 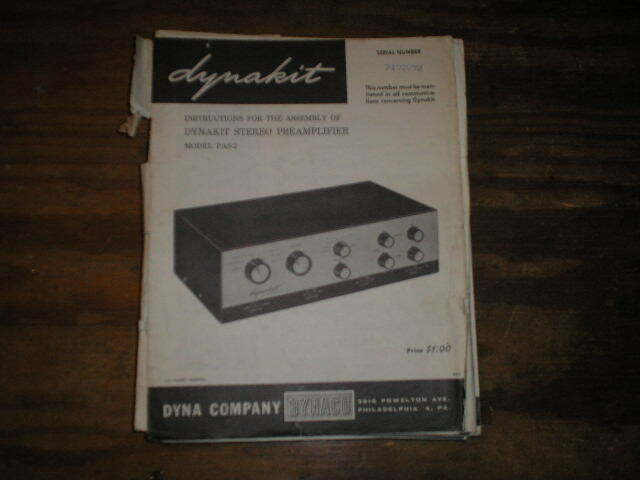 Manual DynacoPAT-4A Pre-Amplifier Owners Manual PHOTO COPY! 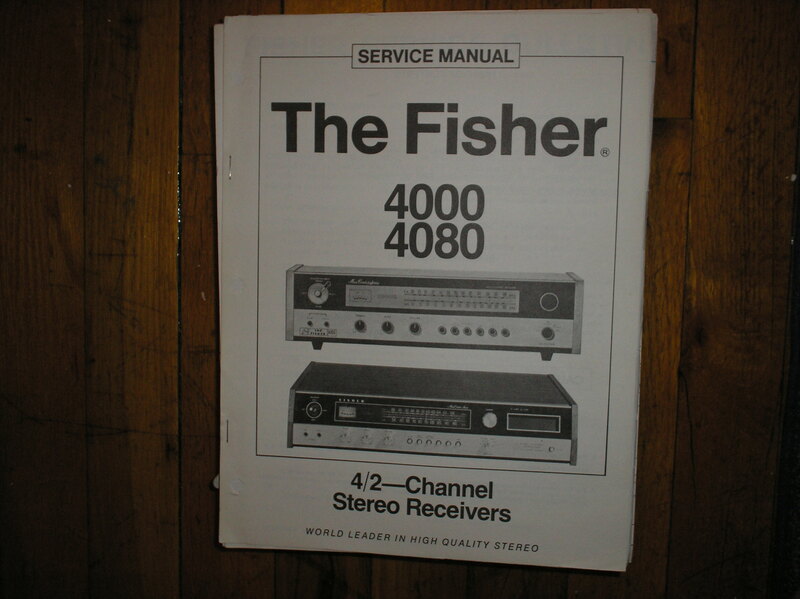 Manual Fisher 400 Receiver Service Manual for Serial no. 10001 - 19999 .. PHOTO COPY! 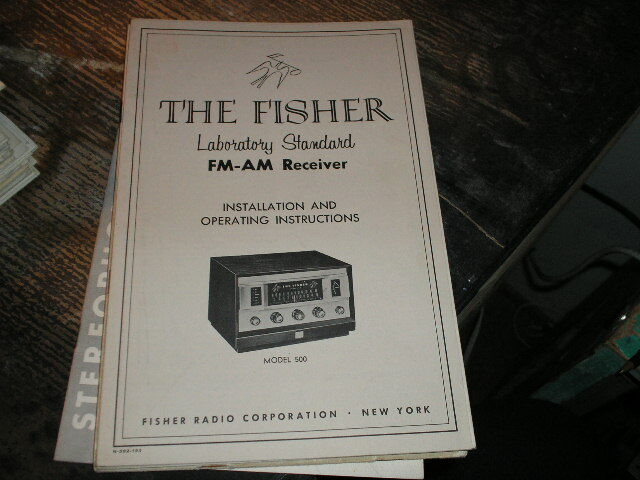 Manual Fisher 400 Receiver from Serial no. 10001 - 29999 PHOTO COPY! 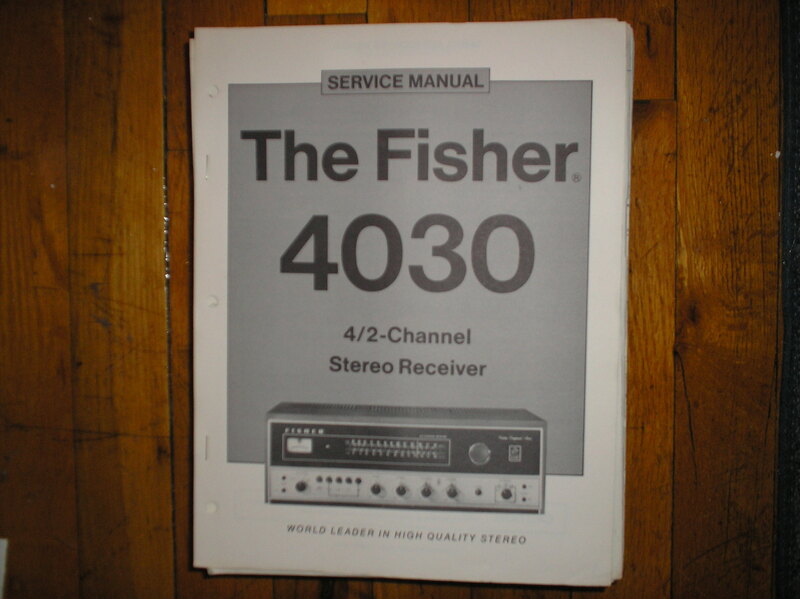 Manual Fisher 400 Receiver Service Manual from Serial no. 48001 and up PHOTO COPY! 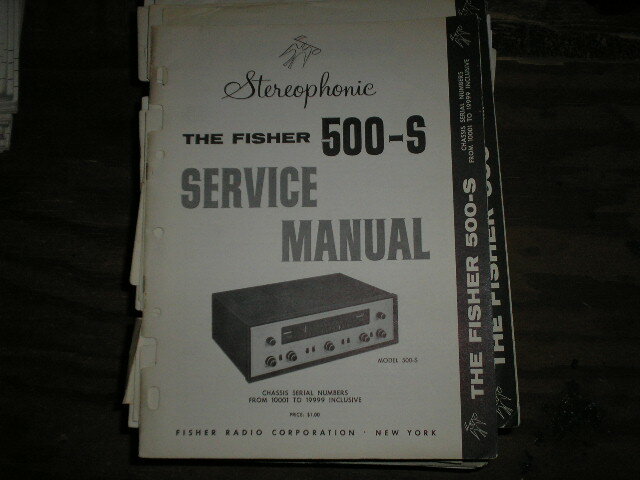 Manual Fisher500 Receiver Service Manual from Serial no. 10001 - 19999 PHOTO COPY! 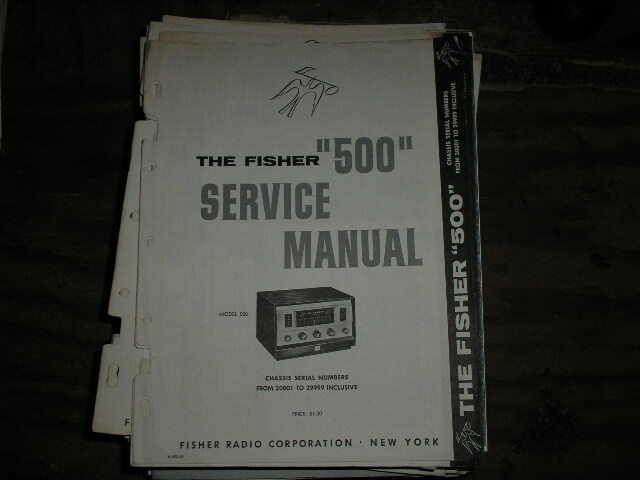 Manual Fisher500 Receiver Service Manual from Serial no. 20001 - 29999 PHOTO COPY! 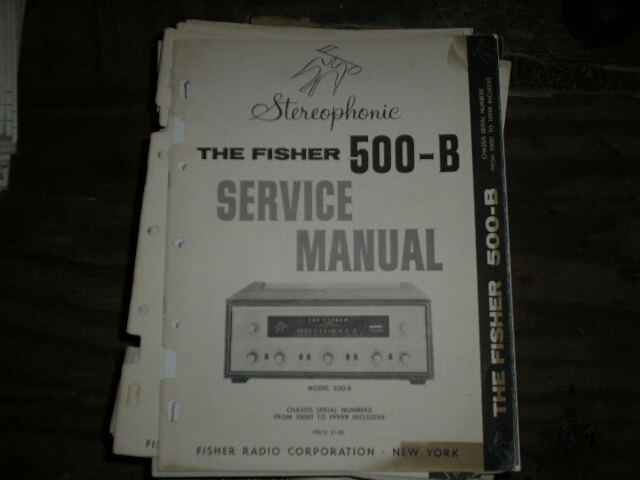 Manual Fisher 500-B Receiver Service Manual from Serial no. 10001 - 19999 PHOTO COPY! 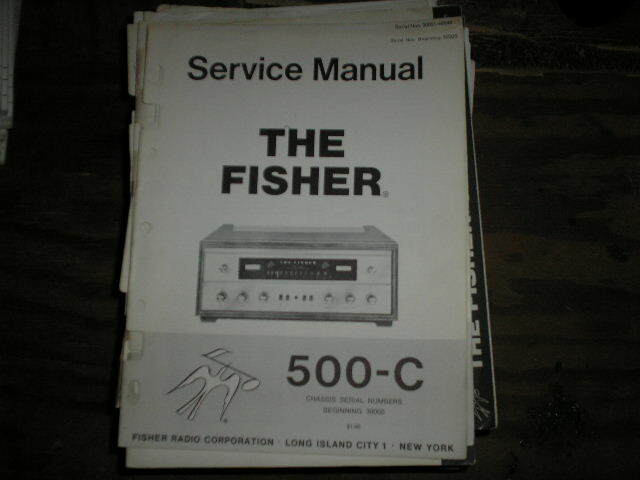 Manual Fisher 500-C Receiver Service Manual from Serial no. 10001 - 19999 PHOTO COPY! 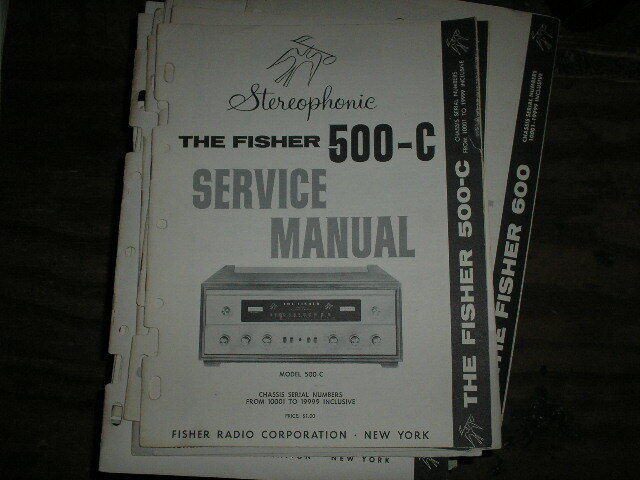 Manual Fisher 500-C Receiver Service Manual from Serial no. 30000 PHOTO COPY! 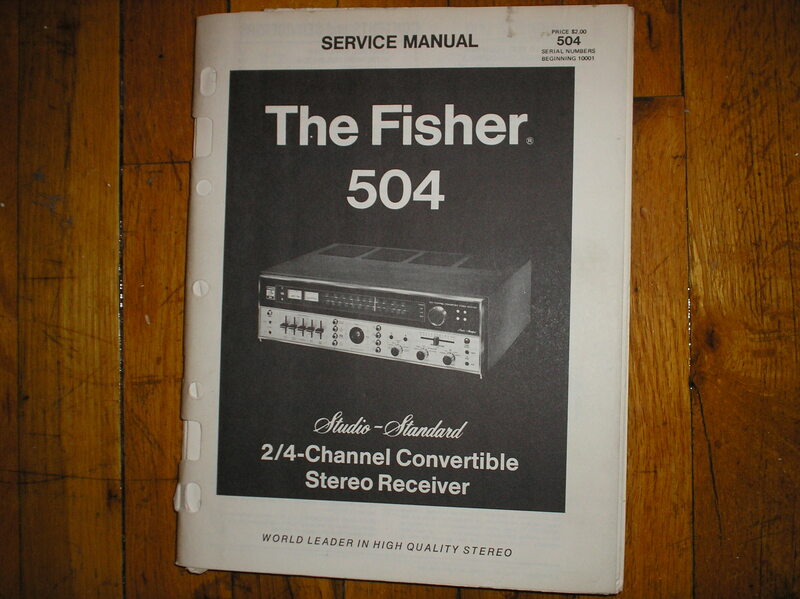 Manual Fisher 500-C Receiver Service Manual from Serial no. 30001 - 49999 PHOTO COPY! 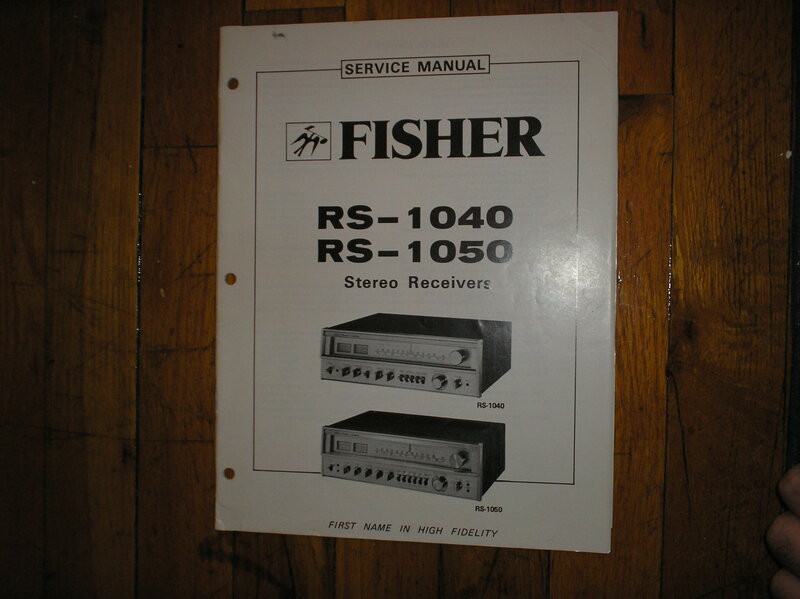 Manual Fisher500-S Receiver Service Manual from Serial no. 10001 - 19999 PHOTO COPY! 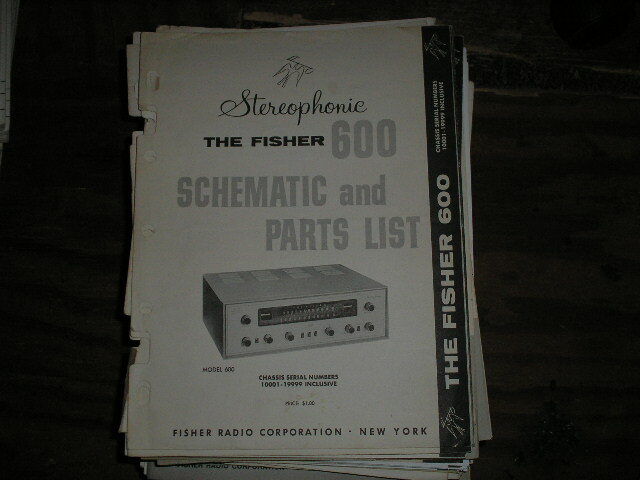 Manual Fisher 600 Receiver Service Manual from Serial no. 10001 - 19999 PHOTO COPY! 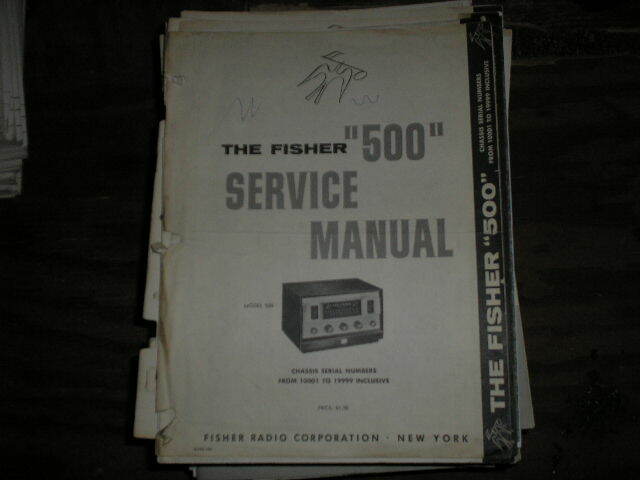 Manual Fisher 600 Receiver Service Manual from Serial no. 20001 - 29999 PHOTO COPY! 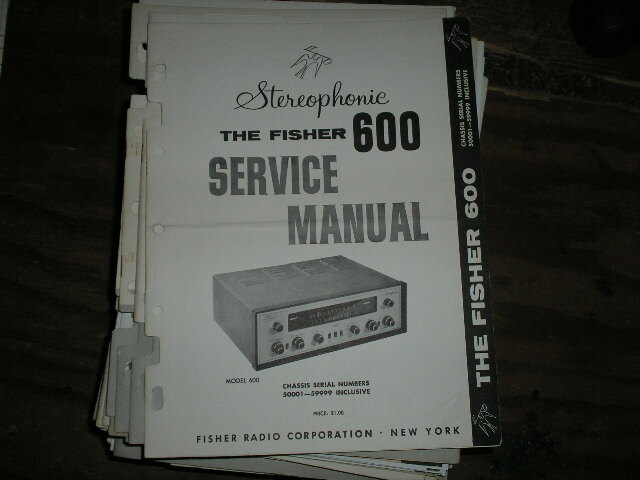 Manual Fisher 600 Receiver Service Manual from Serial no. 30001 - 39999 PHOTO COPY! 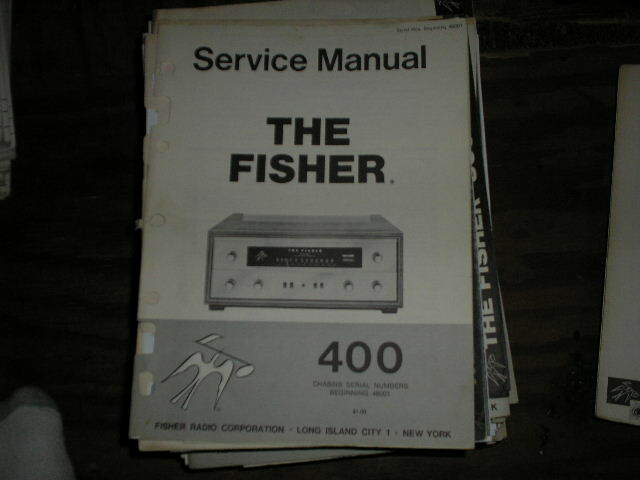 Manual Fisher 600 Receiver Service Manual from Serial no. 50001 - 59999 PHOTO COPY! 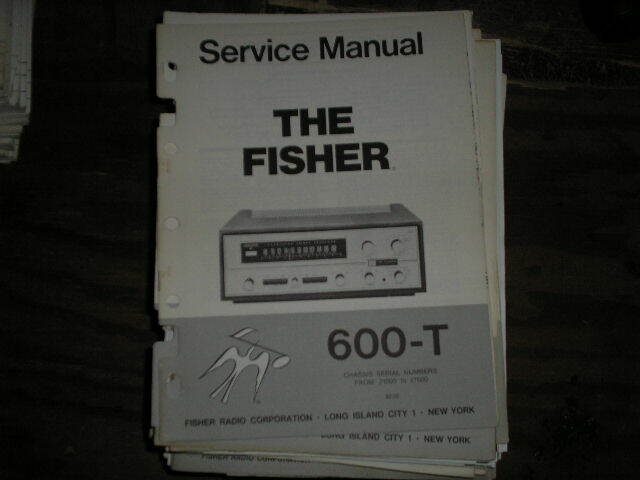 Manual Fisher 600-T Receiver Service Manual from Serial no. 10001 - 19999 PHOTO COPY! 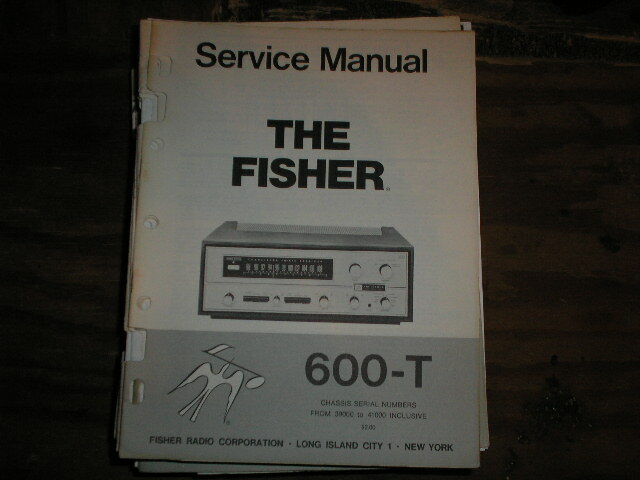 Manual Fisher 600-T Receiver Service Manual from Serial no. 21000 - 27000 PHOTO COPY! 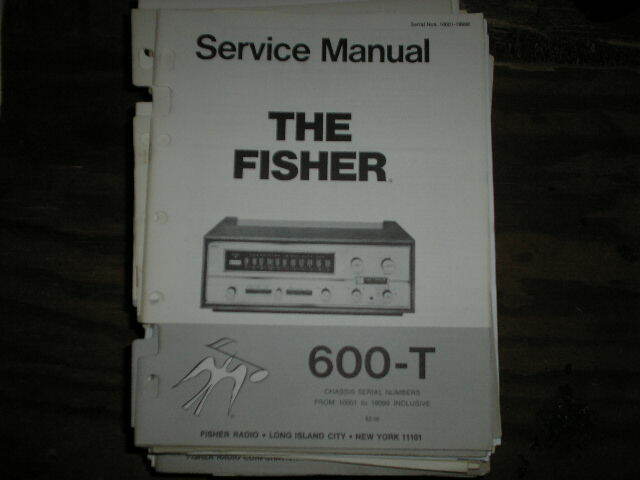 Manual Fisher 600-T Receiver Service Manual from Serial no. 37000 - 38999 PHOTO COPY! 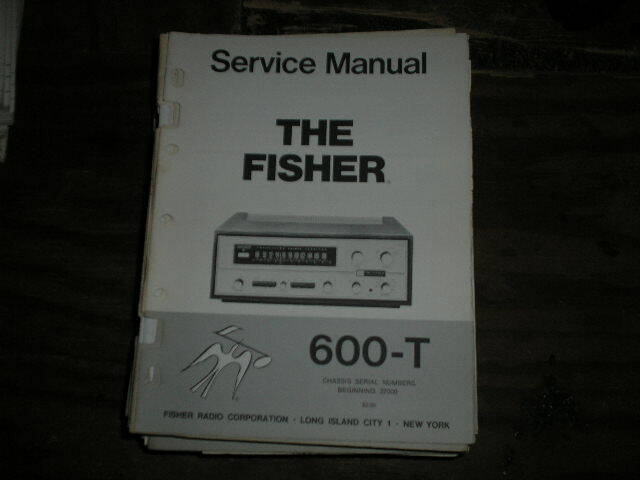 Manual Fisher 600-T Receiver Service Manual from Serial no. 39000 - 41000 PHOTO COPY! 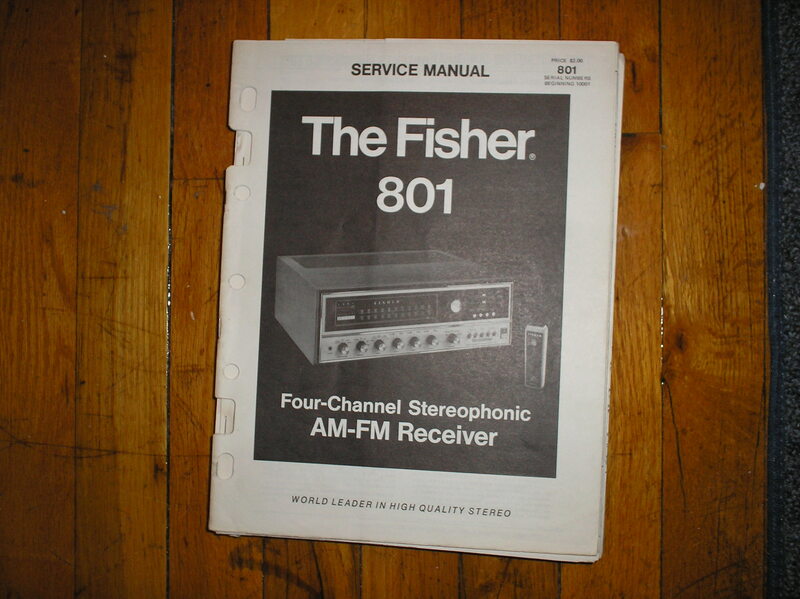 Manual Fisher 800 Receiver Service Manual from Serial no. 10001 - 19999 PHOTO COPY! 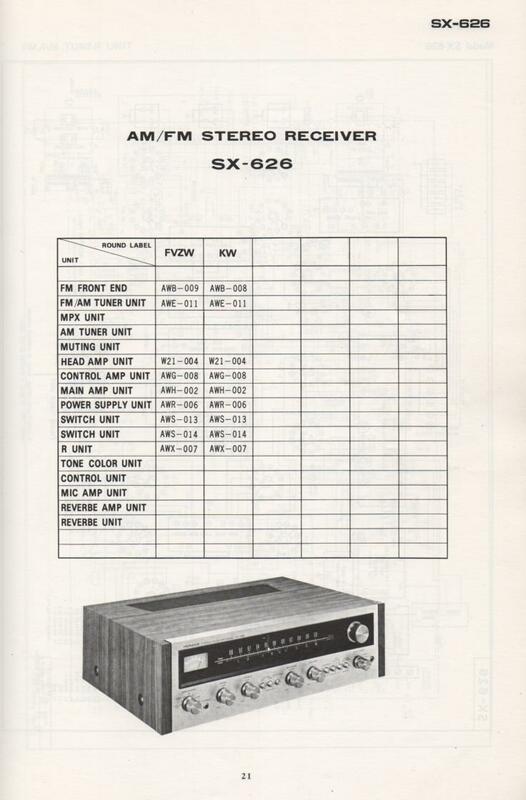 Manual Fisher 800 Receiver Service Manual from Serial no. 20001 - 29999 PHOTO COPY! 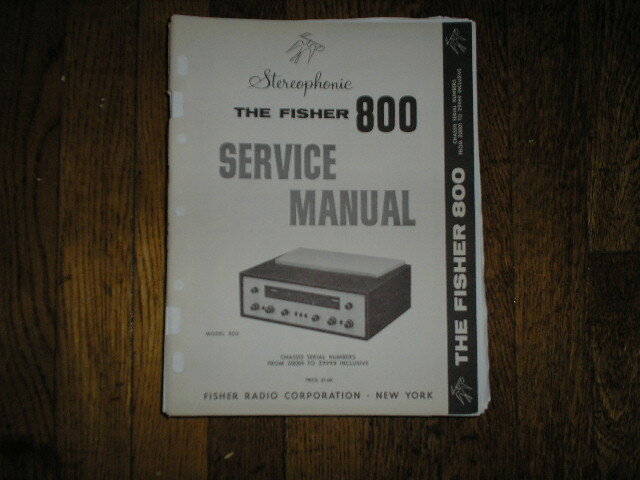 Manual Fisher 800-B Receiver Service Manual from Serial no. 10001 - 19999 WXYZ INCLUSIVE PHOTO COPY! 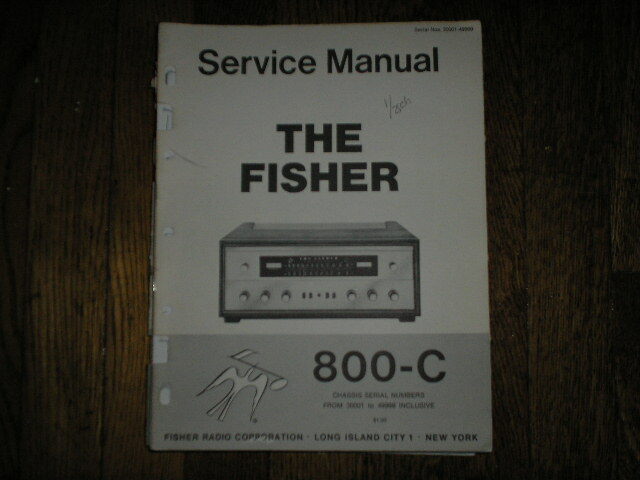 Manual Fisher 800-C Receiver Service Manual from Serial no. 30001 - 39999 PHOTO COPY! 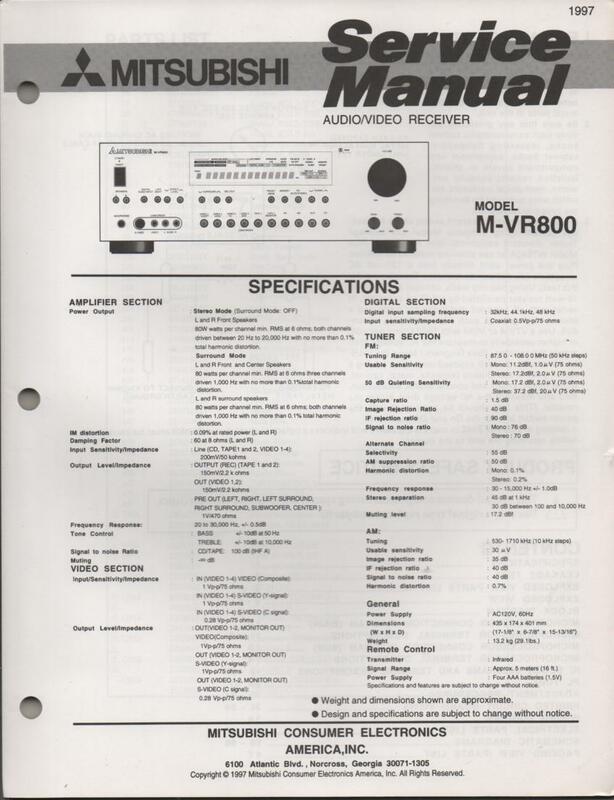 Manual Fisher 800-C Receiver Service Manual from Serial no. 48500 - 51500 PHOTO COPY! 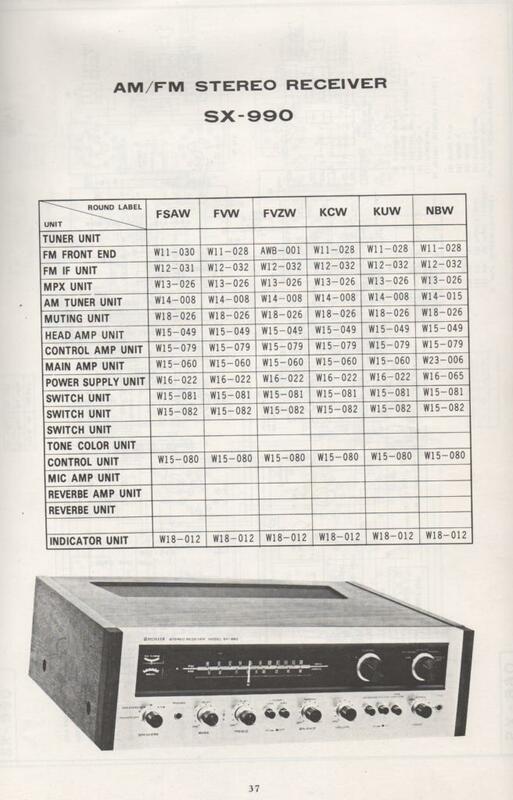 Manual Fisher 800-C Receiver Service Manual from Serial no. 51501 AND UP PHOTO COPY! 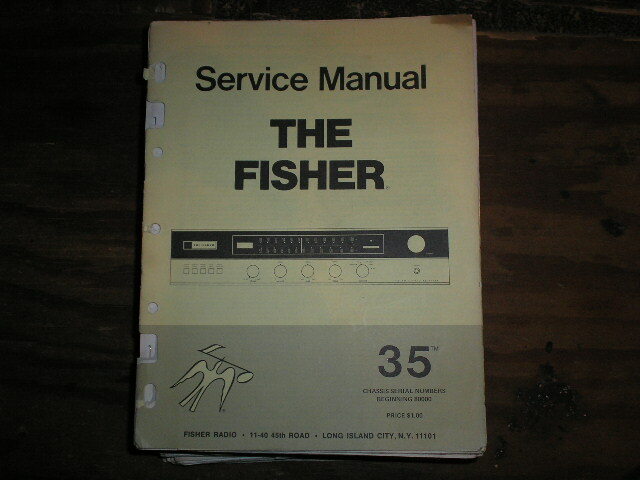 Manual Fisher 35 Receiver Service Manual for Serial no. 80000 and up PHOTO COPY! 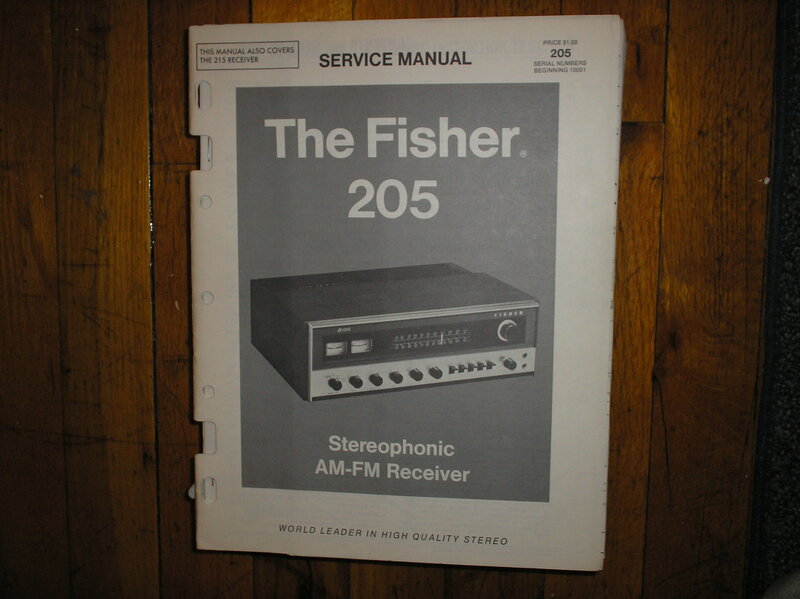 Manual Fisher 500 FM-AM Receiver Installation Operating and Instruction Manual PHOTO COPY! 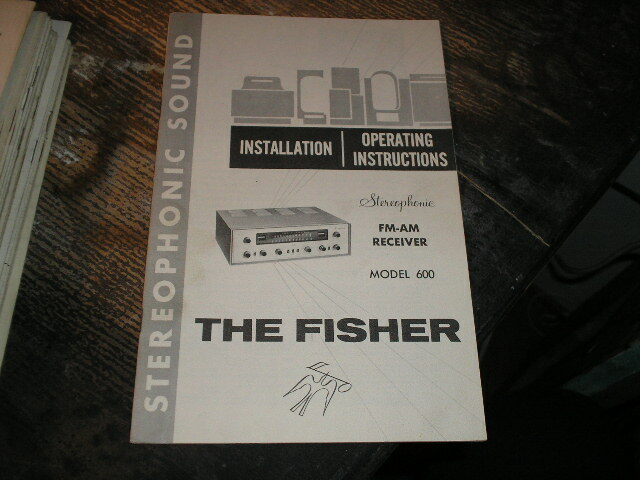 Manual Fisher 600 FM-AM Receiver Installation Operating and Instruction Manual.. PHOTO COPY! 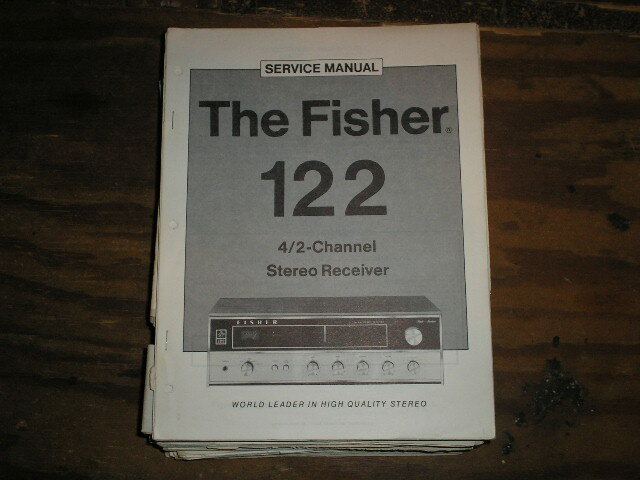 Manual Fisher122 Receiver Service Manual PHOTO COPY! 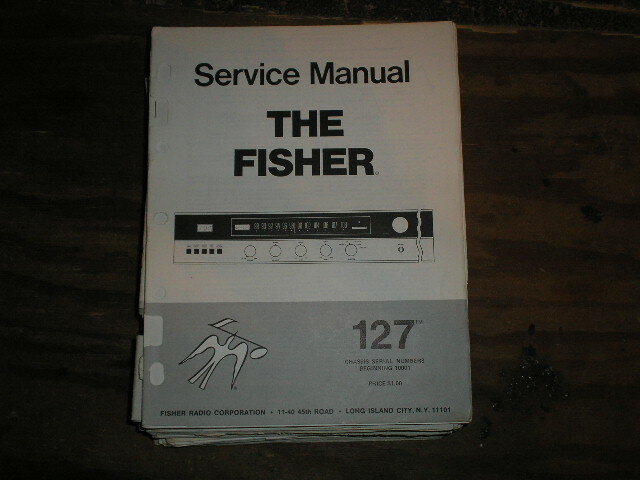 Manual Fisher 127 Receiver Service Manual PHOTO COPY! 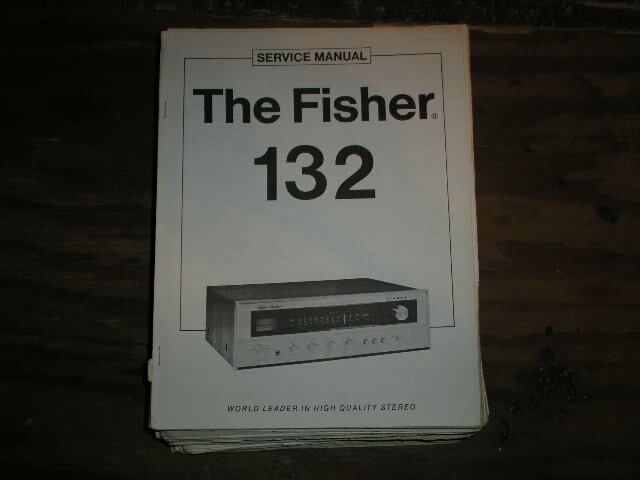 Manual Fisher132 Receiver Service Manual PHOTO COPY! 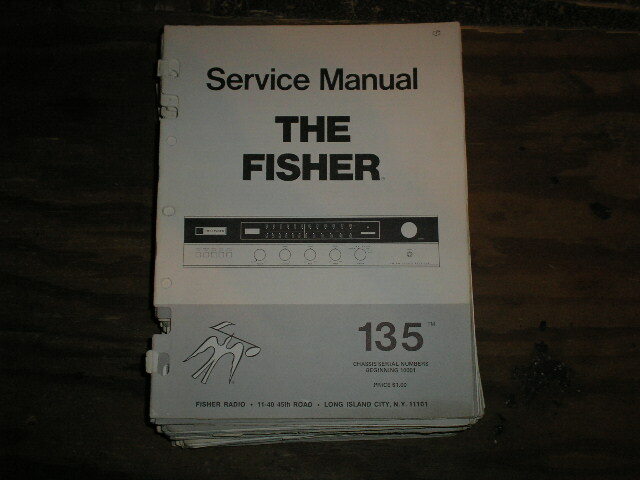 Manual Fisher135 Receiver Service Manual PHOTO COPY! 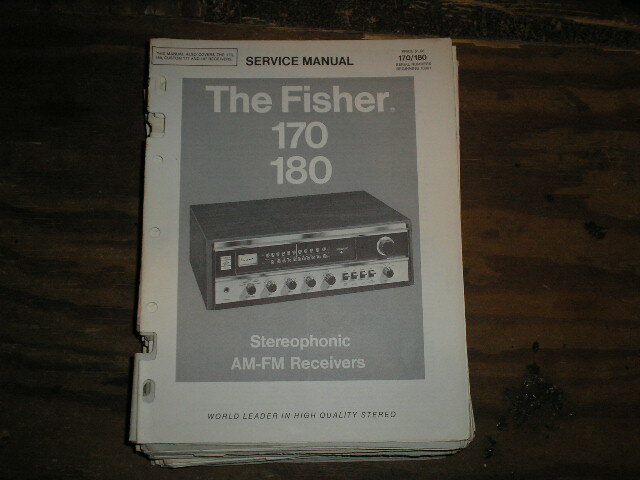 Manual Fisher 170 180 Receiver Service Manual PHOTO COPY! 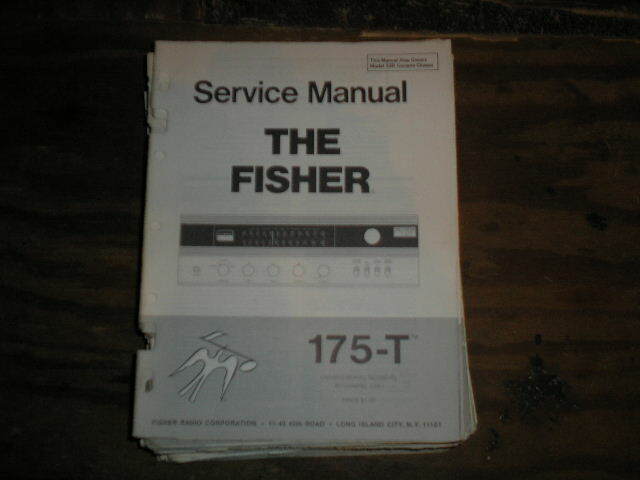 Manual Fisher175-T Receiver Service Manual PHOTO COPY! 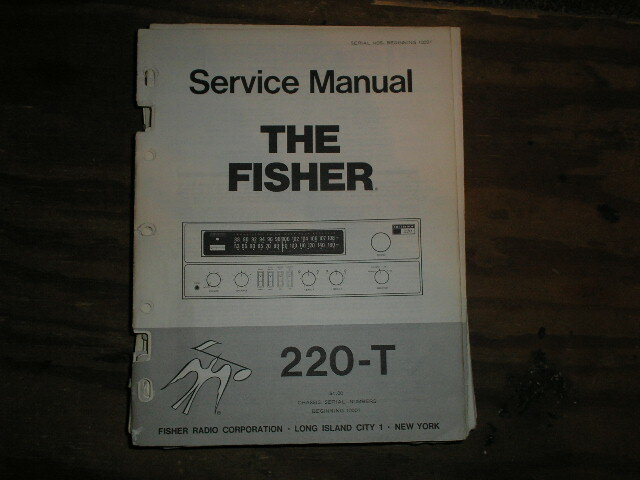 Manual Fisher 200-T Receiver Service Manual PHOTO COPY! 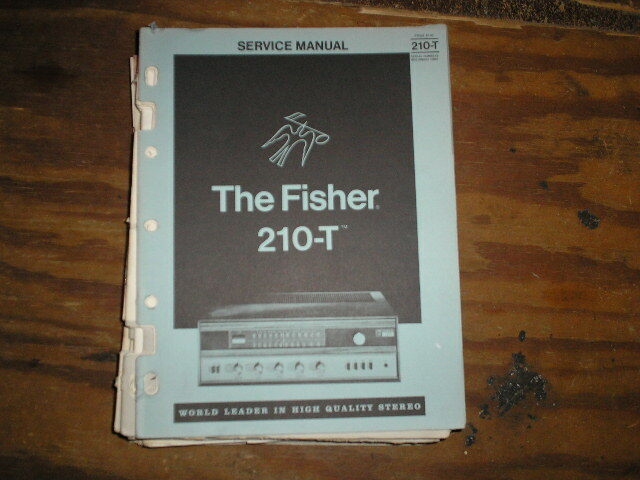 Manual Fisher 210-T Receiver Service Manual PHOTO COPY! 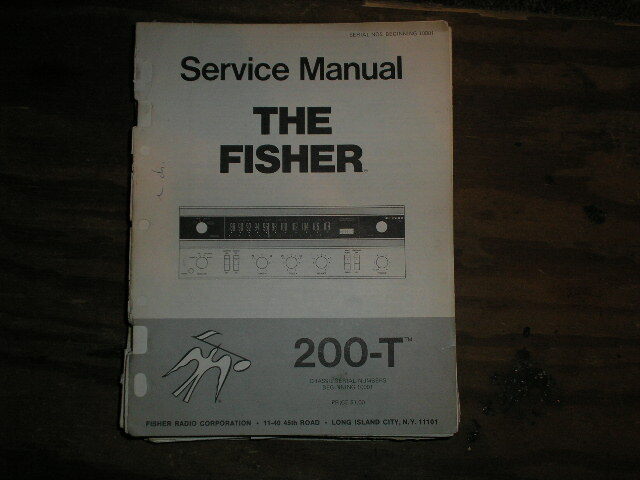 Manual Fisher 220-T Receiver Service Manual For Serial no.10001 and up PHOTO COPY! 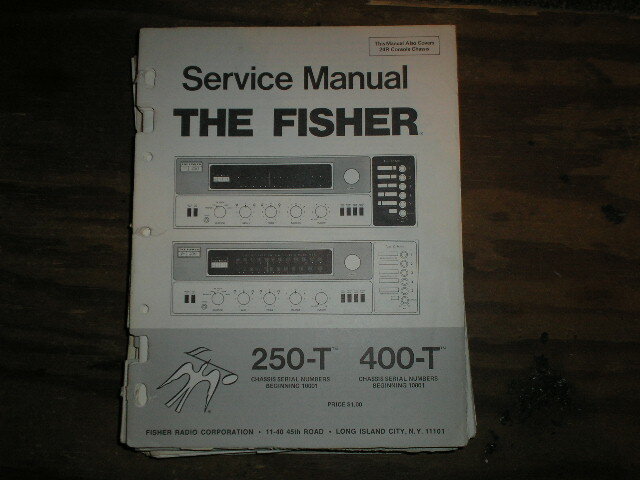 Manual Fisher 250-T 400-T Receiver Service Manual 250-T for Serial no. 10001 and up 400-T for Serial no. 10001 and up PHOTO COPY! 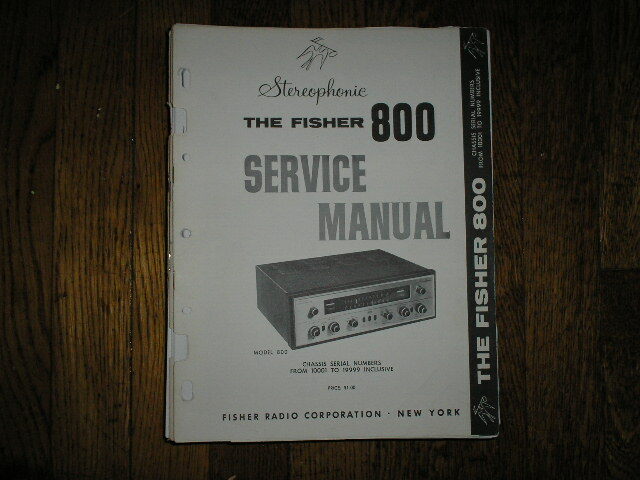 Manual Fisher 800-B Receiver Service Manual from Serial no. 20001 - 29999 Inclusive PHOTO COPY! 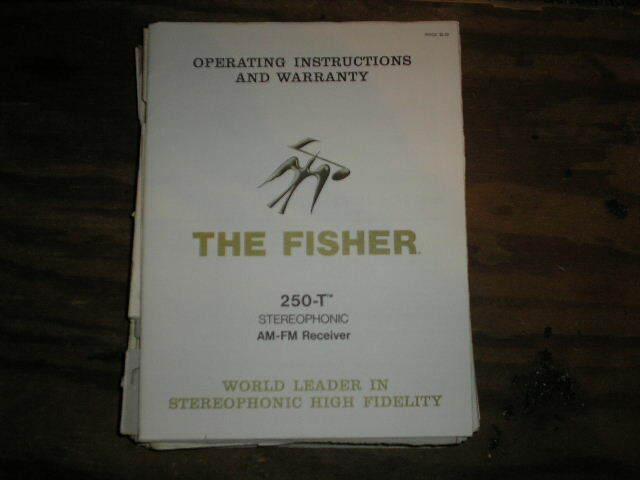 Manual Fisher 250-T Receiver Operating Instruction Manual PHOTO COPY! 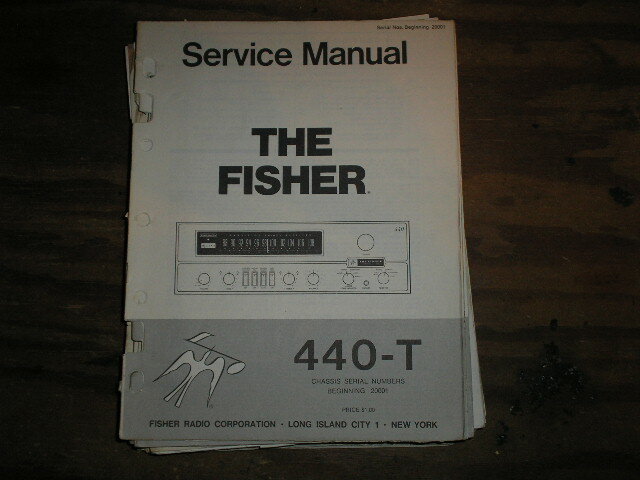 Manual Fisher 440-T Receiver Service Manual from Serial no. 20001 PHOTO COPY! 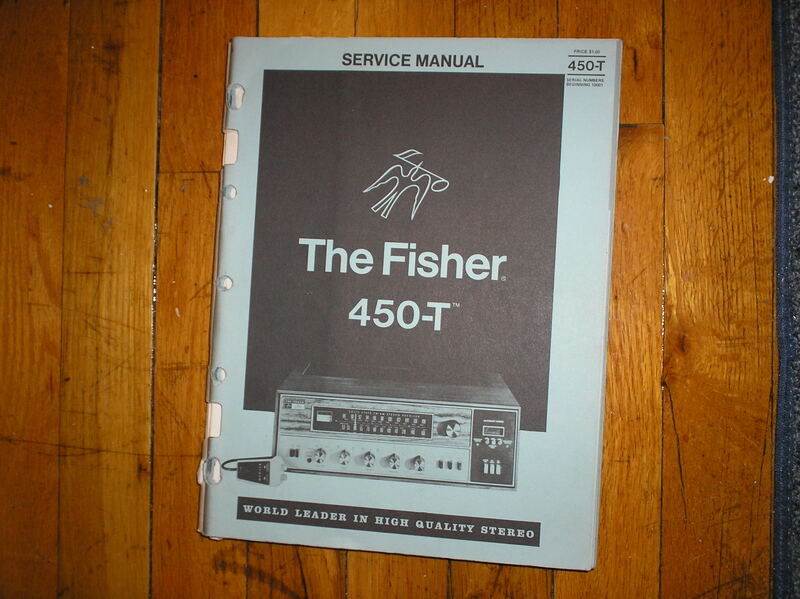 Manual Fisher 440-T Receiver Service Manual from Serial no. 47001 PHOTO COPY! 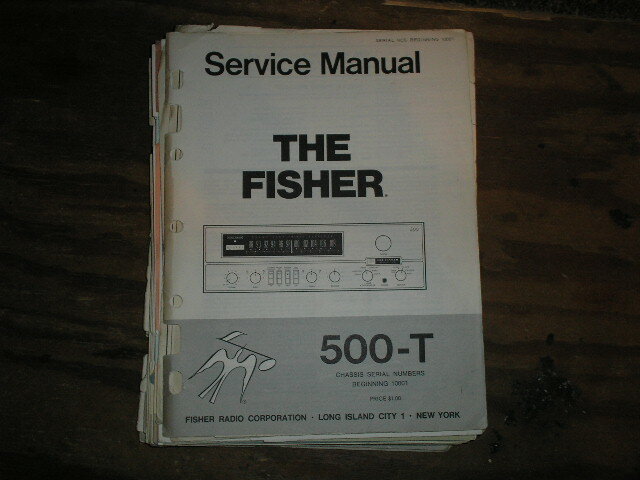 Manual Fisher 500-T RECEIVER Service Manual from Serial no. 10001 PHOTO COPY! 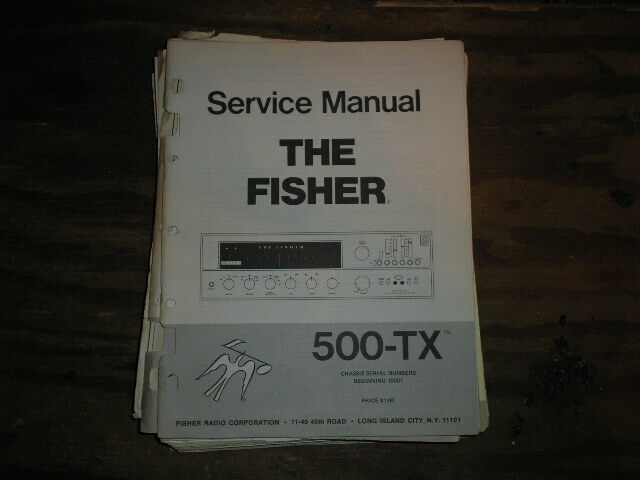 Manual Fisher 500-TX RECEIVER Service Manual from Serial no. 10001 PHOTO COPY! 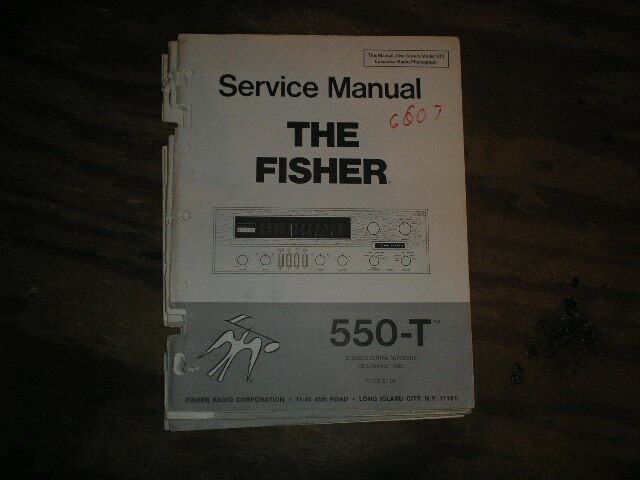 Manual Fisher 550-T RECEIVER Service Manual from Serial no. 10001 PHOTO COPY! 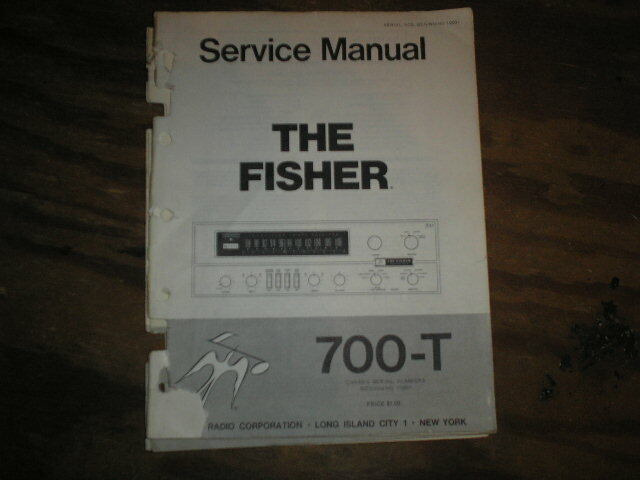 Manual Fisher 700-T Receiver Service Manual from Serial no. 10001 PHOTO COPY! 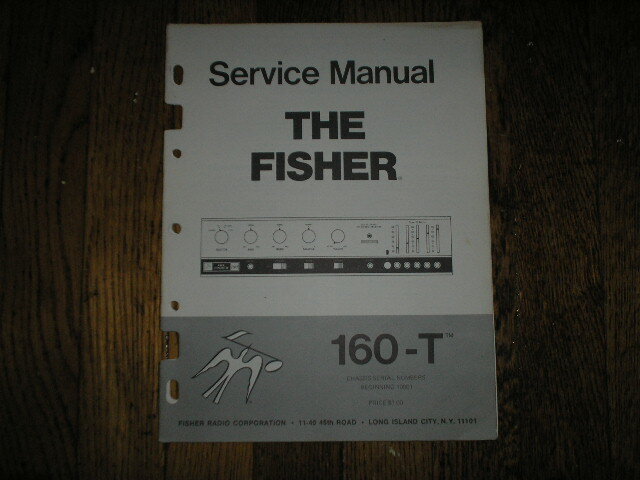 Manual Fisher 160-T Receiver Service Manual for Serial number 10001 and up PHOTO COPY! Manual Fisher205 215 Receiver Service Manual. 205 s/n 10001 and up.. PHOTO COPY! 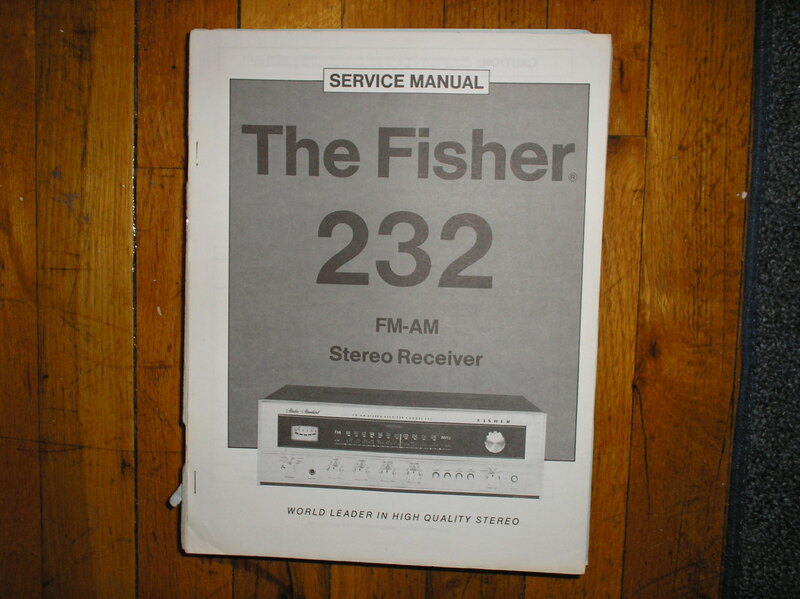 Manual Fisher232 Receiver Service Manual PHOTO COPY! 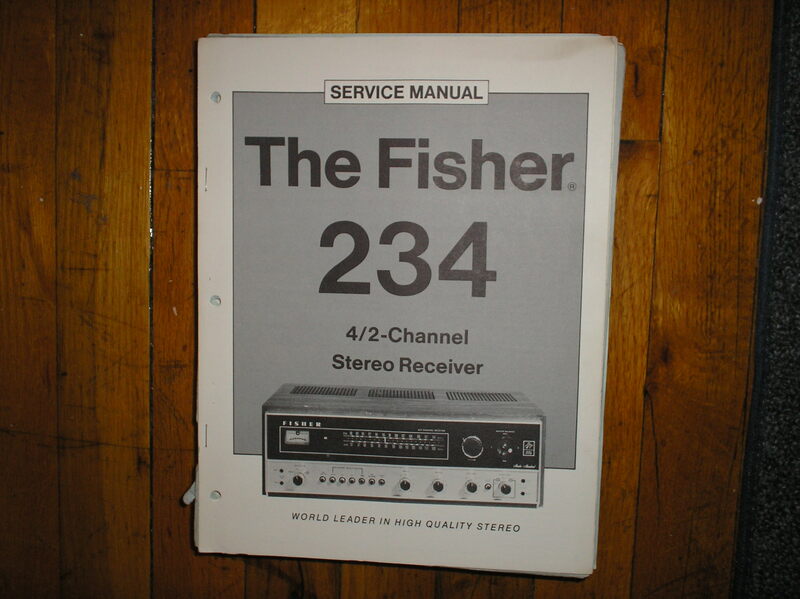 Manual Fisher234 Receiver Service Manual PHOTO COPY! 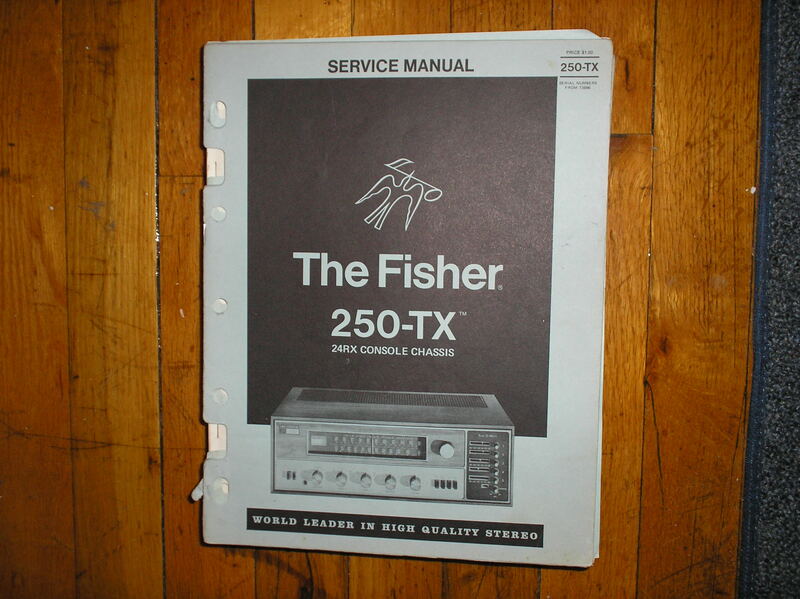 Manual Fisher250-TX Receiver Service Manual PHOTO COPY! 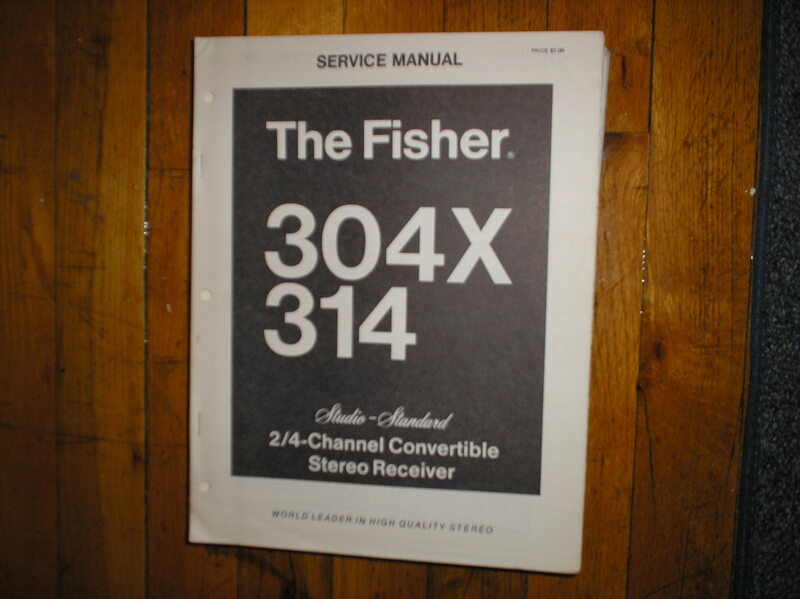 Manual Fisher304X 314 Receiver Service Manual PHOTO COPY! 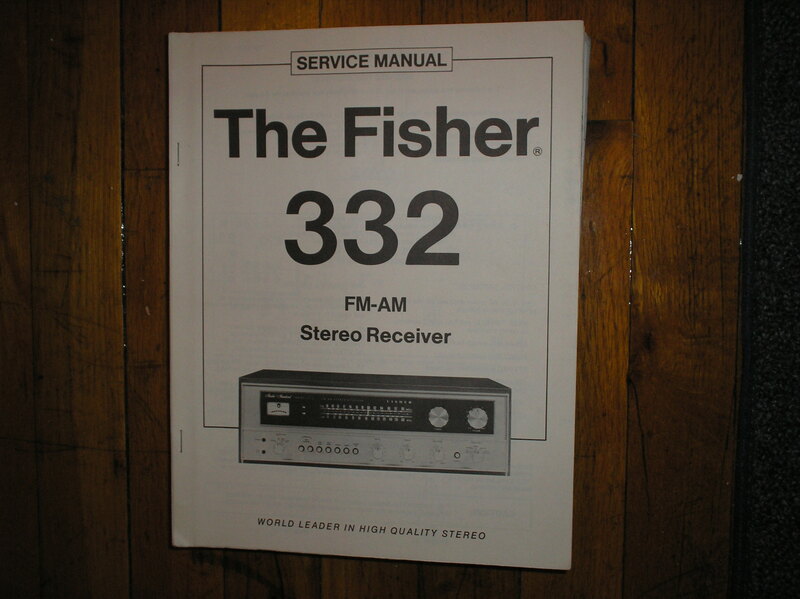 Manual Fisher332 Receiver Service Manual PHOTO COPY! 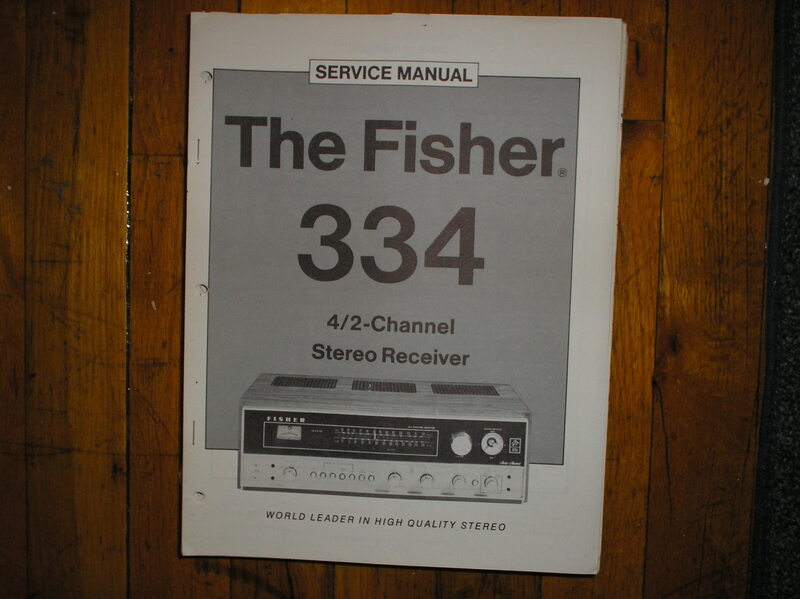 Manual Fisher334 Receiver Service Manual PHOTO COPY! 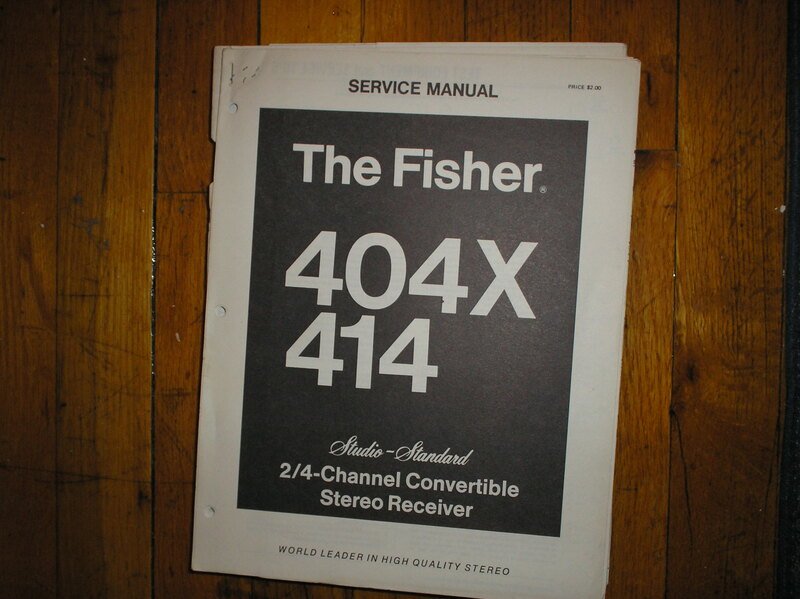 Manual Fisher404X 414 Receiver Service Manual PHOTO COPY! 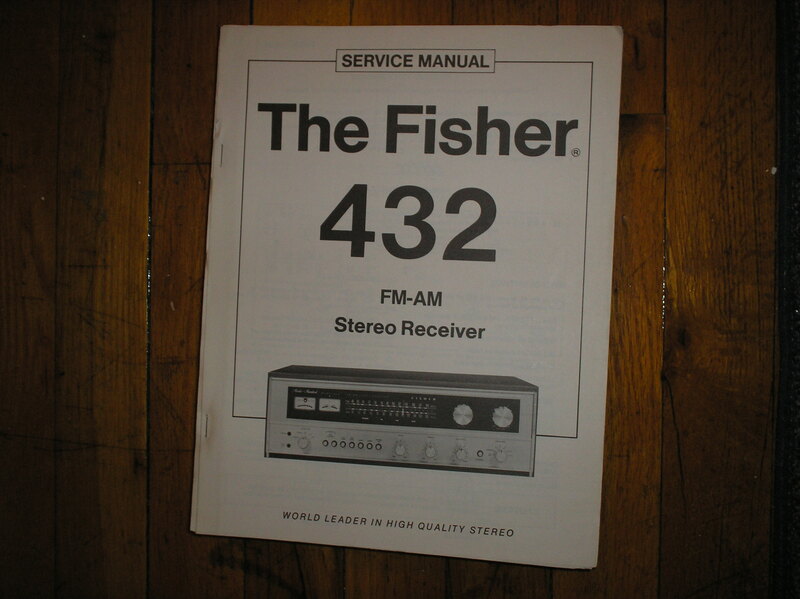 Manual Fisher432 Receiver Service Manual PHOTO COPY! 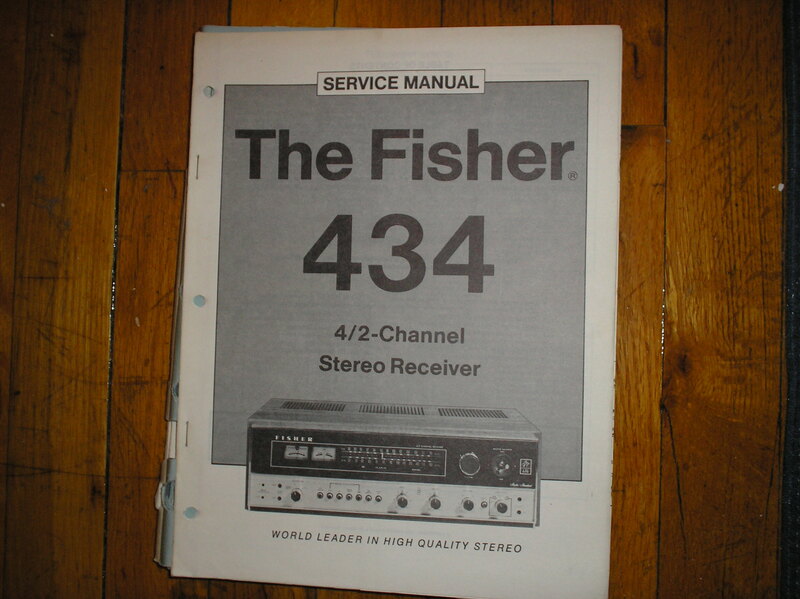 Manual Fisher434 Receiver Service Manual PHOTO COPY! 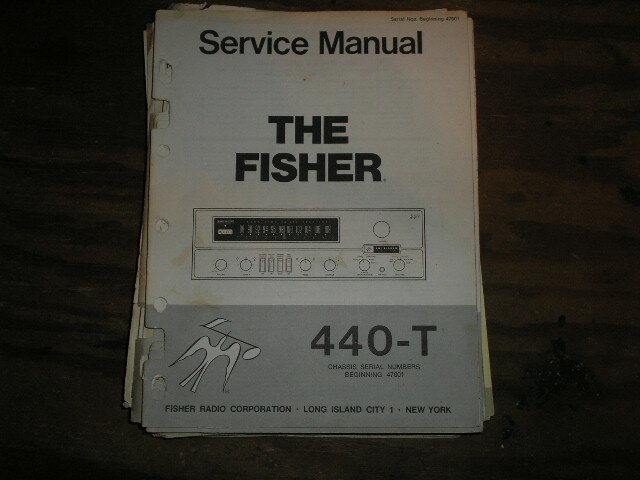 Manual Fisher450-T Receiver Service Manual PHOTO COPY! 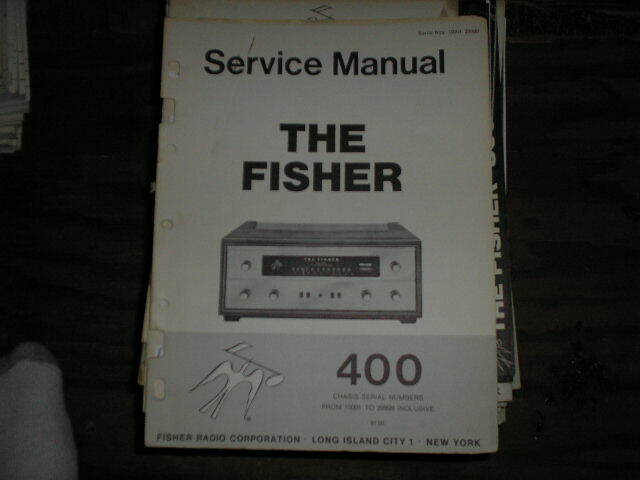 Manual Fisher474 495 674 895 4020 4025 4060 Receiver Service Manual PHOTO COPY! 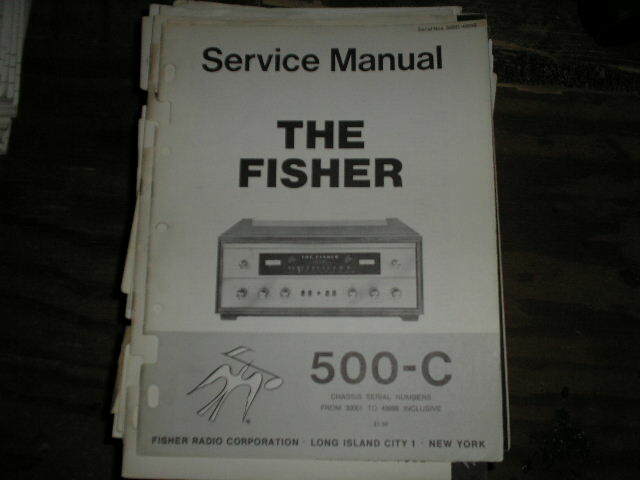 Manual Fisher504 Receiver Service Manual PHOTO COPY! 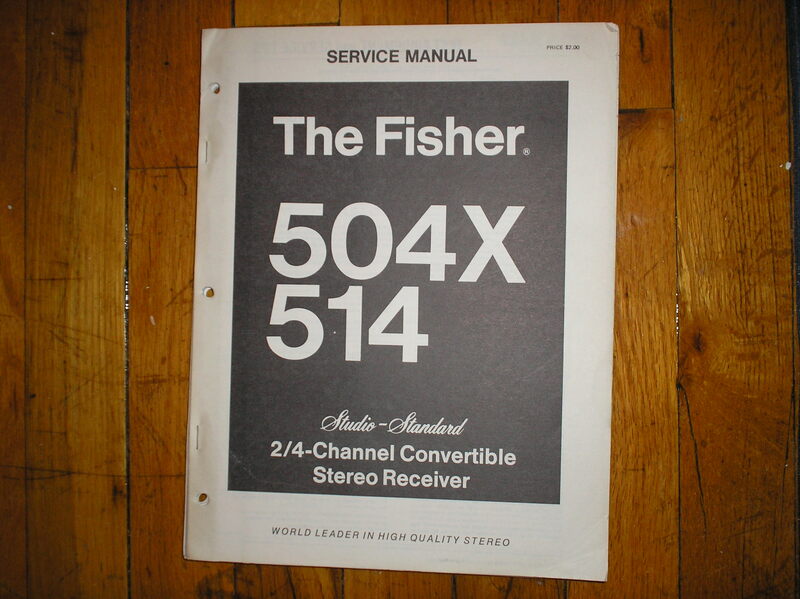 Manual Fisher504X 514 Receiver Service Manual PHOTO COPY! 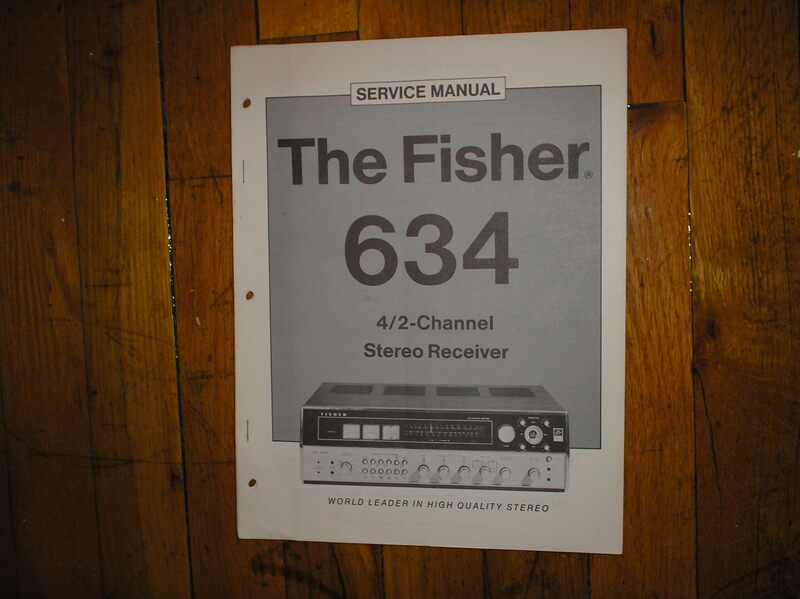 Manual Fisher634 Receiver Service Manual PHOTO COPY! 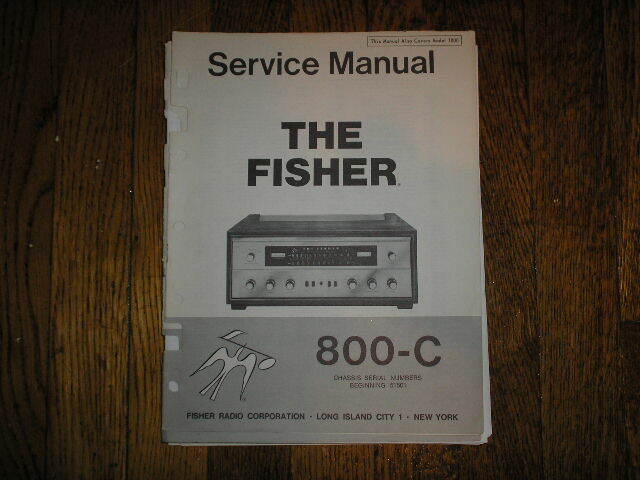 Manual Fisher801 Receiver Service Manual PHOTO COPY! 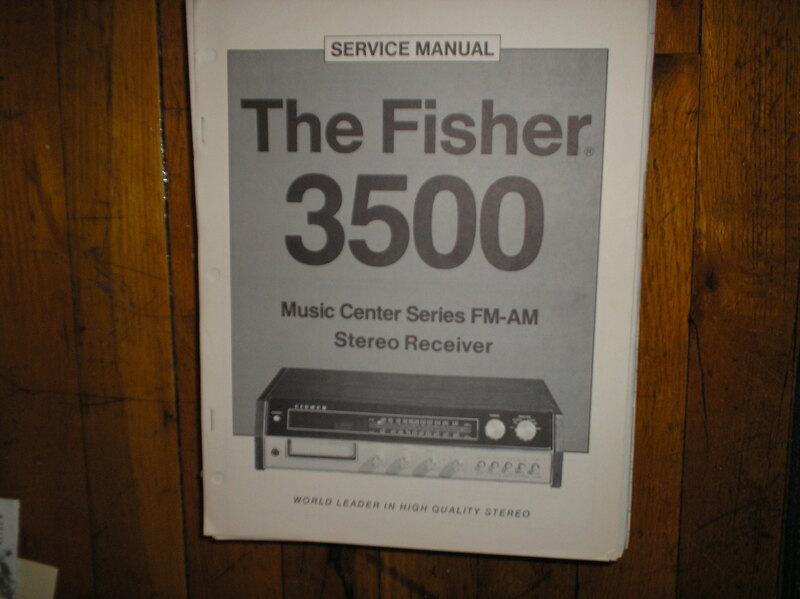 Manual Fisher3500 Receiver Service Manual PHOTO COPY! 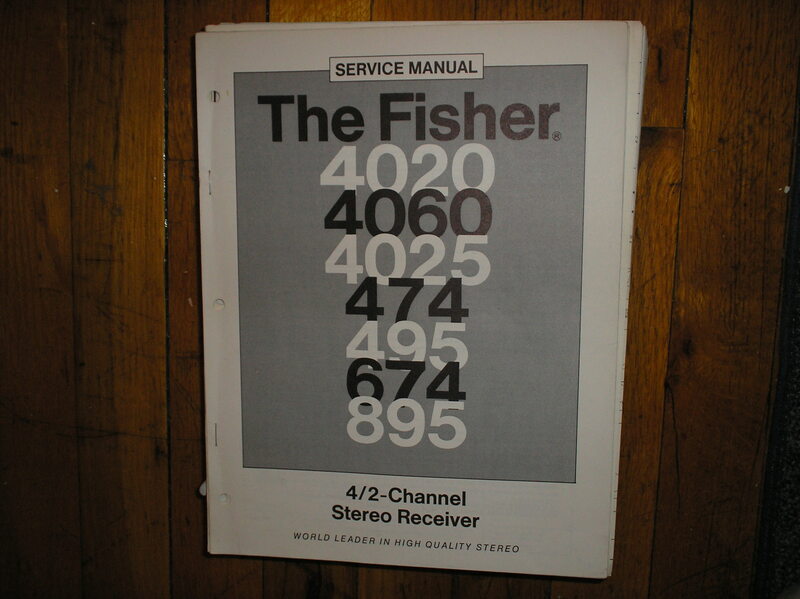 Manual Fisher4000 4080 Receiver Service Manual PHOTO COPY! 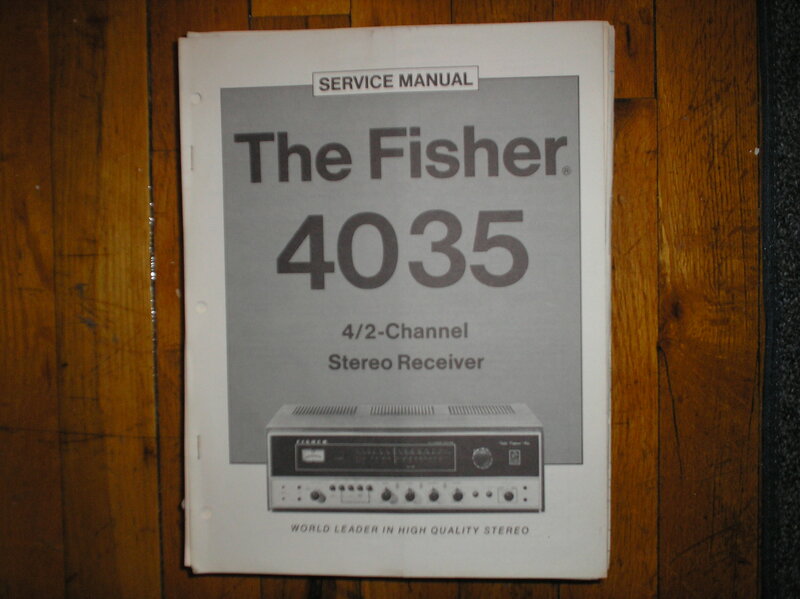 Manual Fisher4030 Receiver Service Manual PHOTO COPY! 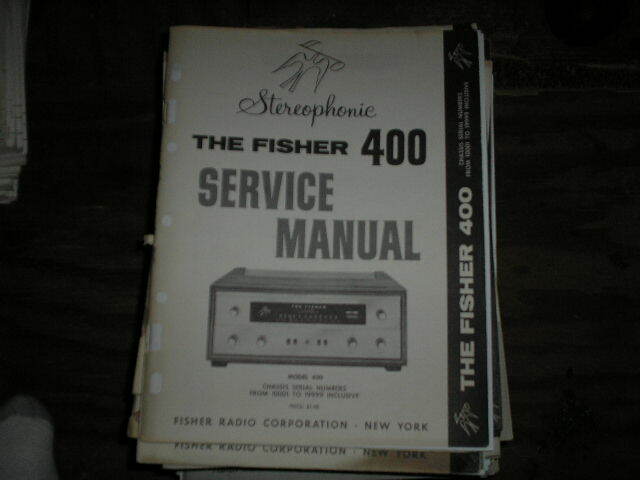 Manual Fisher4035 Receiver Service Manual PHOTO COPY! 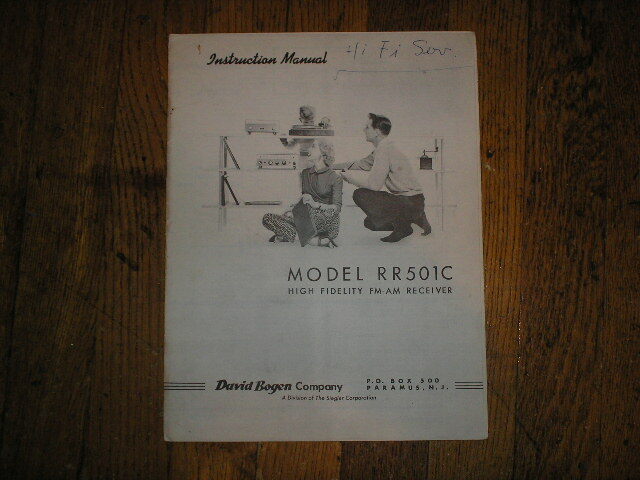 Manual FisherRS-1040 RS-1050 Receiver Service Manual PHOTO COPY! 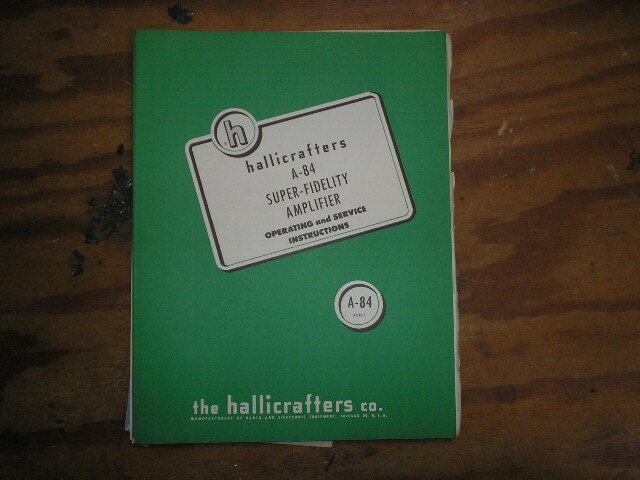 Manual HallicraftersSR-34 Transceiver spec sheet PHOTO COPY! 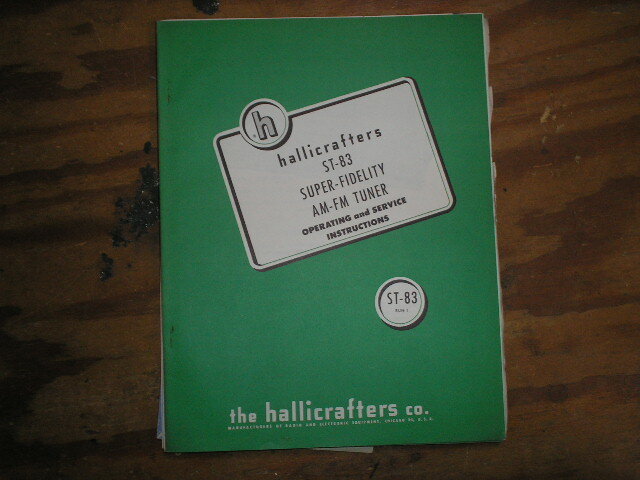 Manual HallicraftersS-38 Service Bulletin no 2 PHOTO COPY! 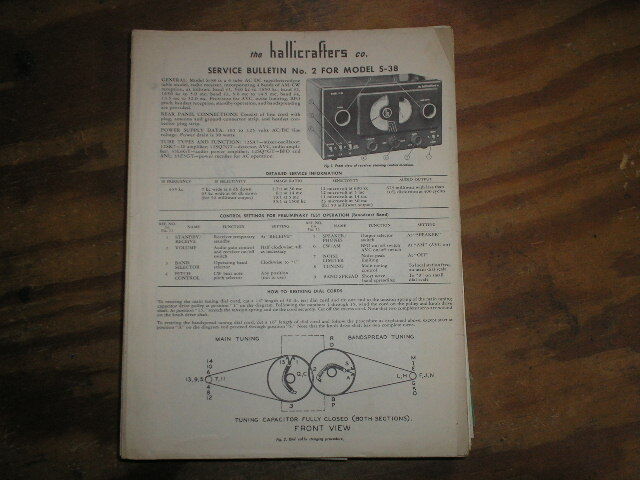 Manual HallicraftersS-38A Receiver Service Manual PHOTO COPY! 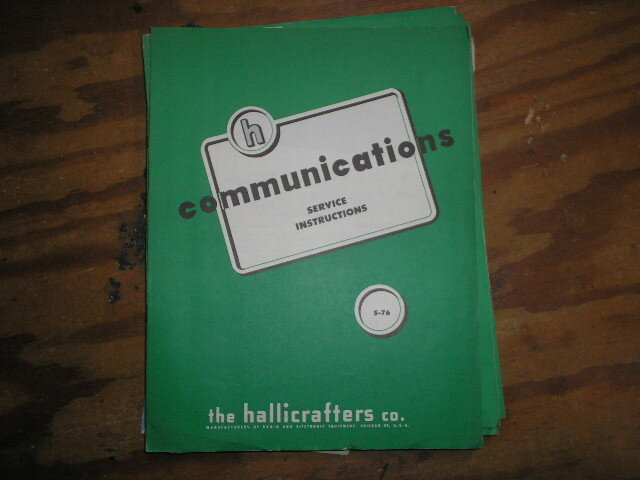 Manual HallicraftersS-38B Receiver Operator Service Instructions PHOTO COPY! 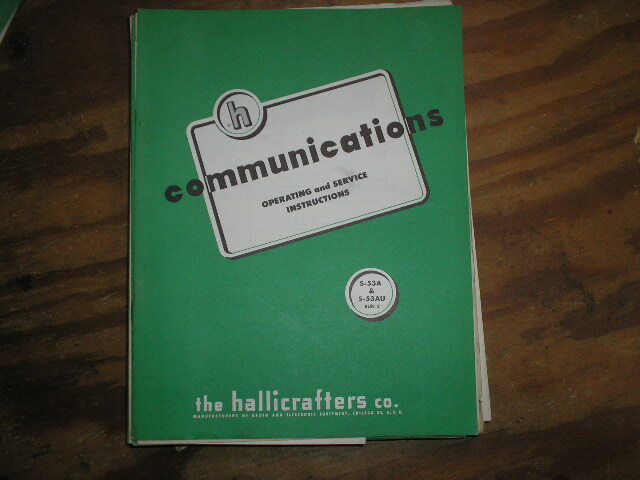 Manual HallicraftersS-40B Receiver Run-3 Service Bulletin Nov. 1948 PHOTO COPY! 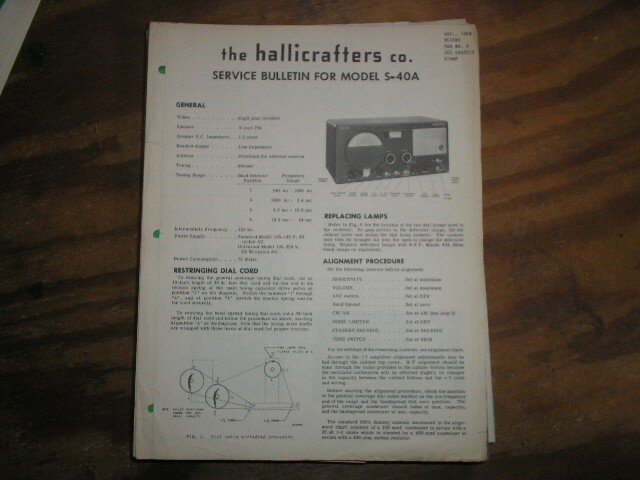 Manual HallicraftersS-40B S-40BU Receiver Operator Service Manual PHOTO COPY! 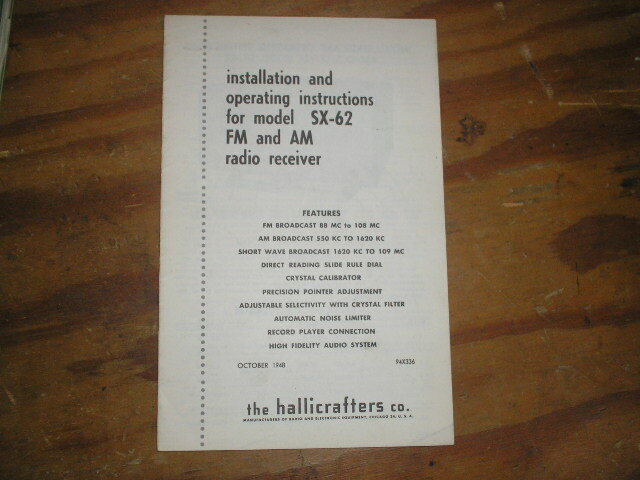 Manual HallicraftersSX-42 Receiver Operating Instruction Manual PHOTO COPY! 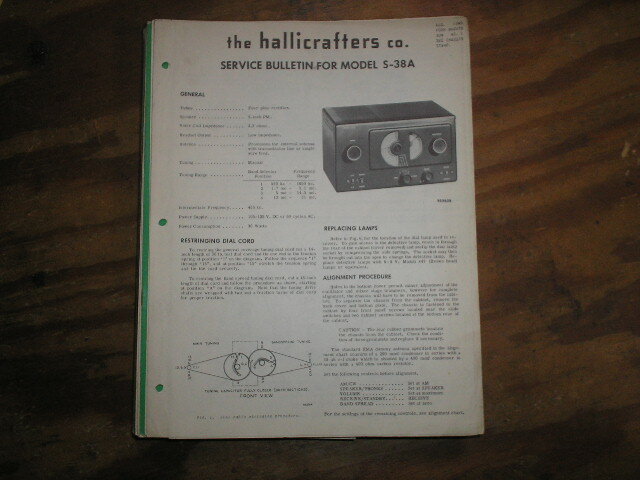 Manual HallicraftersSX-42 Receiver Service Bulletin for RUN 2 PHOTO COPY! 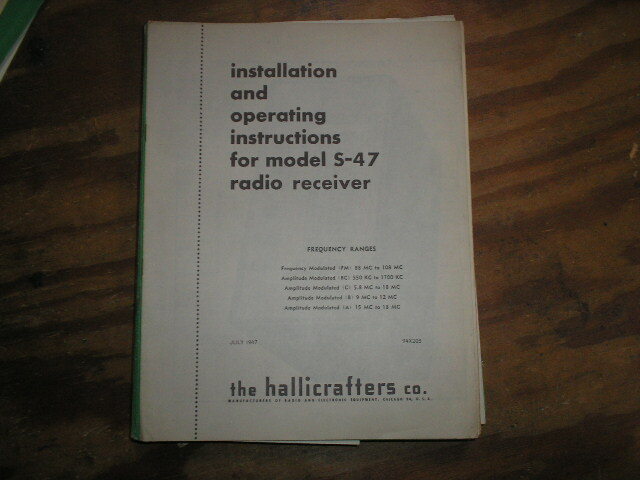 Manual HallicraftersS-47 Receiver Owners Manual PHOTO COPY! 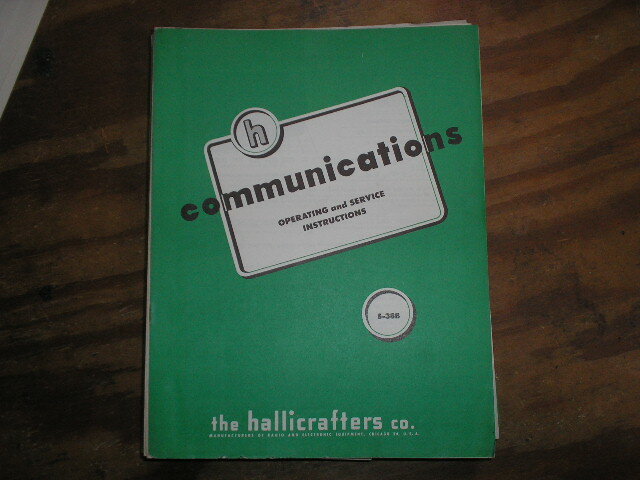 Manual HallicraftersS-47 Run-1 Service Bulletin dated October 1947 PHOTO COPY! 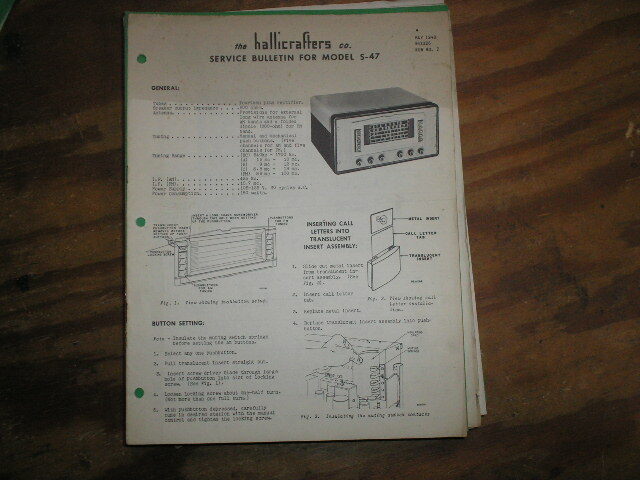 Manual HallicraftersS-47 Receiver Run-2 Service Manual PHOTO COPY! 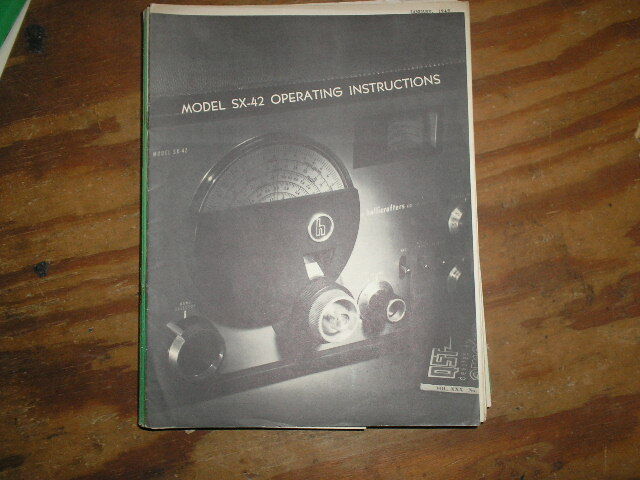 Manual HallicraftersS-53A S-53AU Run-2 Operator Service Instruction Manual PHOTO COPY! 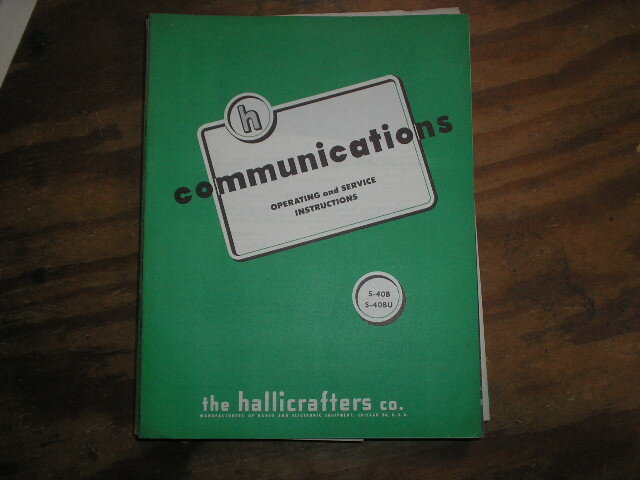 Manual HallicraftersS-59 Run-1 Service Bulletin PHOTO COPY! 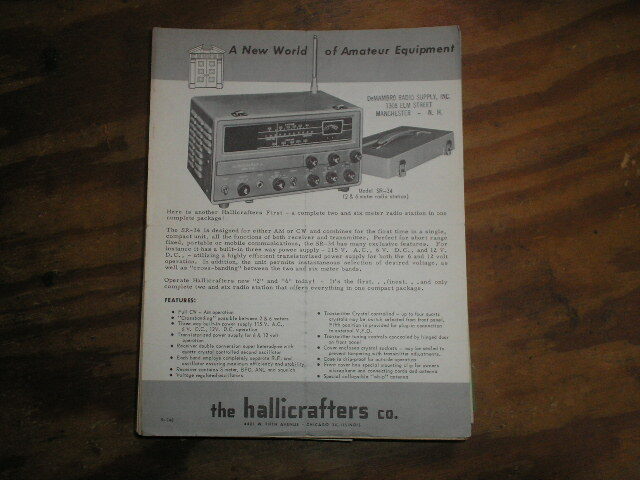 Manual HallicraftersSX-62 Receiver Installation and Operating Manual PHOTO COPY! 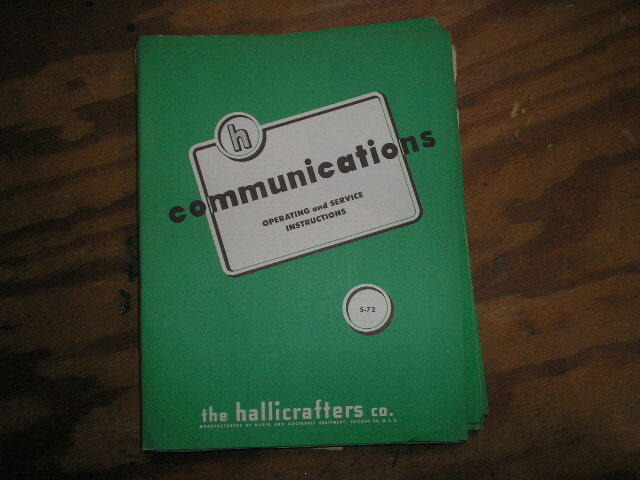 Manual HallicraftersSX-62 Operator Service Manual PHOTO COPY! 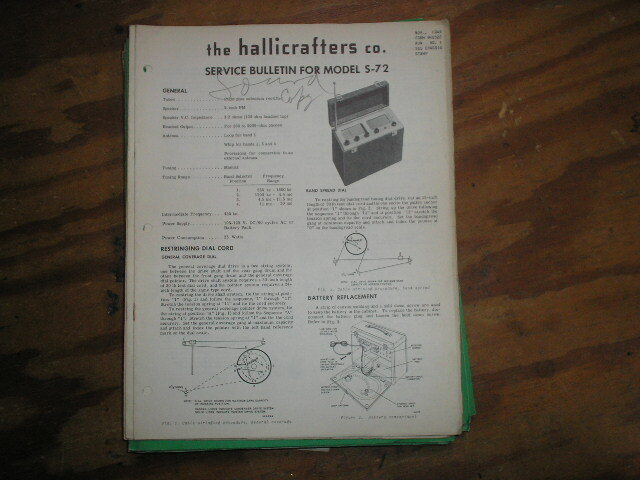 Manual HallicraftersS-72 Run-1 Service Bulletin PHOTO COPY! 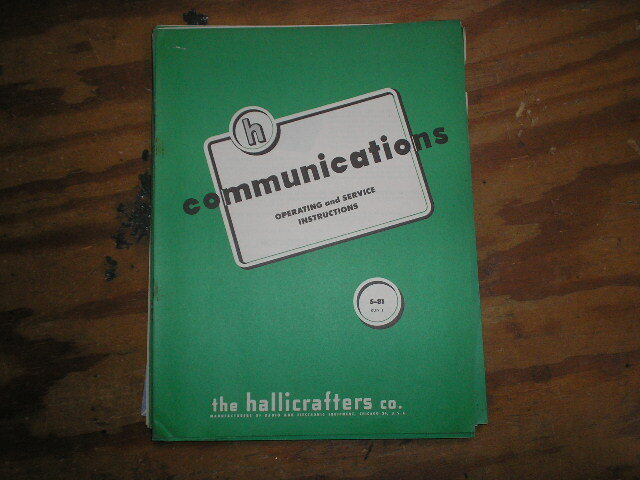 Manual HallicraftersS-72 Receiver Run-3 Operator Service Manual PHOTO COPY! 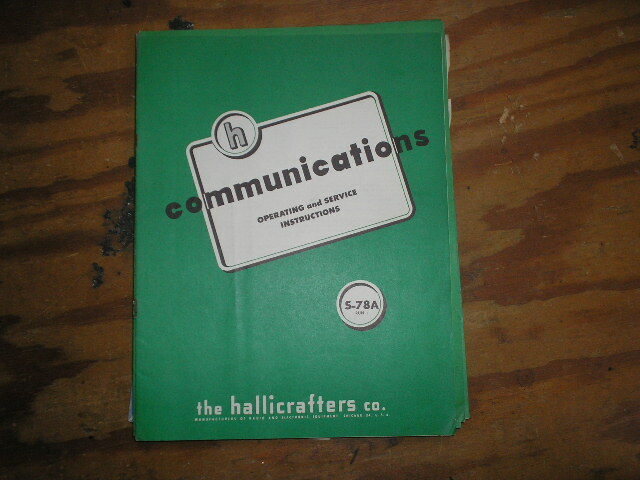 Manual HallicraftersS-72L Receiver Run-3 Operator Service Manual PHOTO COPY! 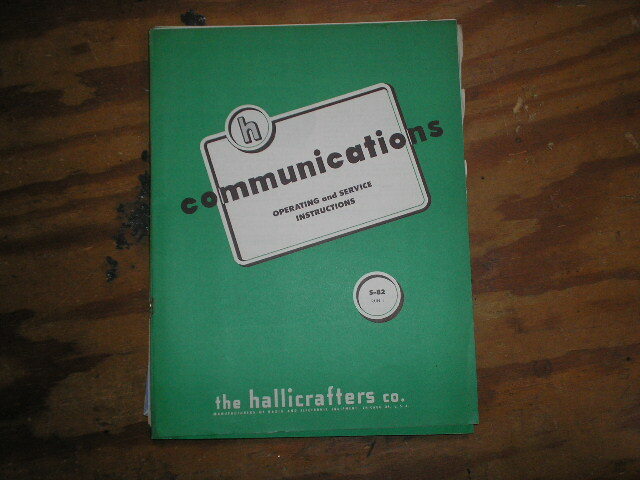 Manual HallicraftersS-76 Receiver Operating Instruction Manual PHOTO COPY! 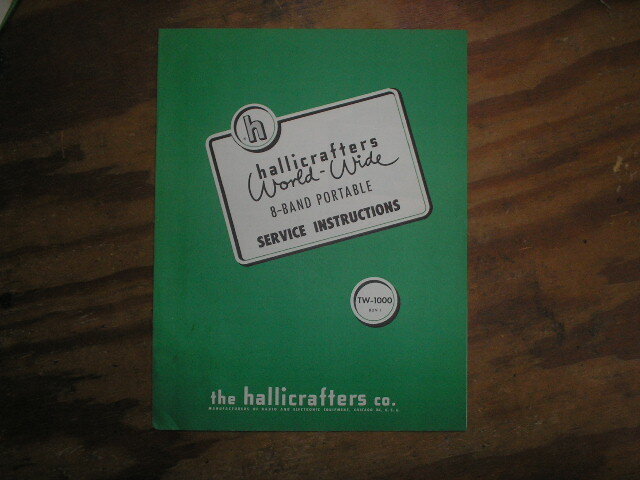 Manual HallicraftersS-76 Receiver Service Manual PHOTO COPY! 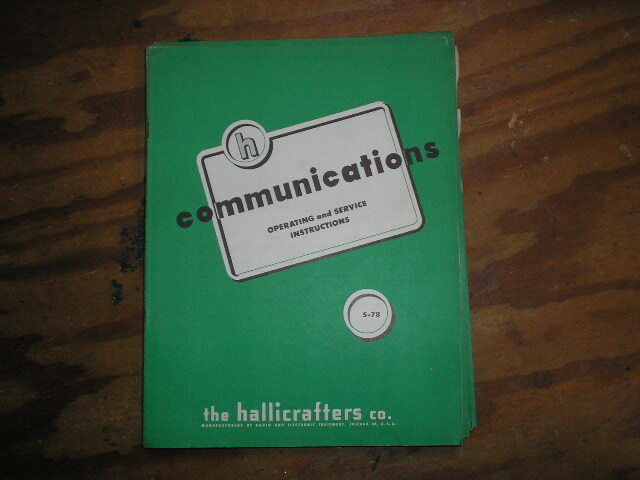 Manual HallicraftersS-78 Receiver Operator Service Manual PHOTO COPY! 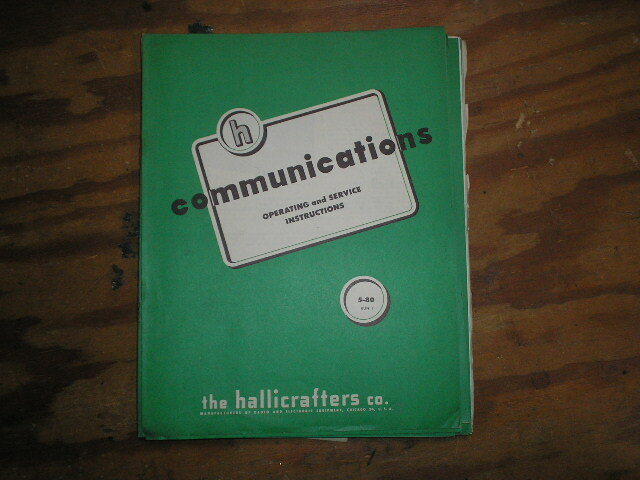 Manual HallicraftersS-78A Receiver Run-1 Operator Service Manual PHOTO COPY! 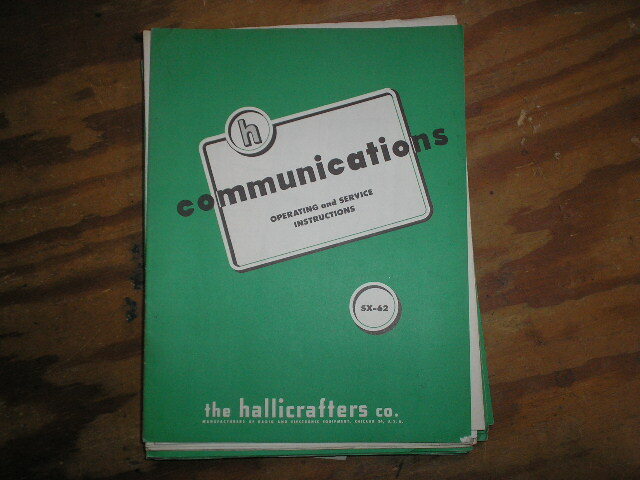 Manual HallicraftersS-80 Receiver Run-1 Operator Service Manual PHOTO COPY! 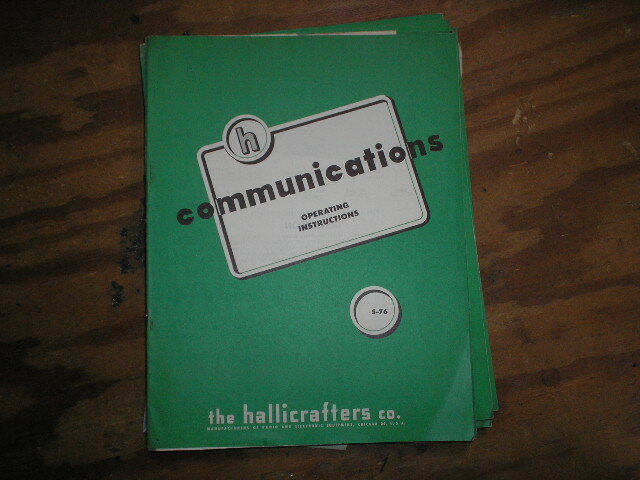 Manual HallicraftersS-81 Receiver Run-1 Operator Service Manual PHOTO COPY! 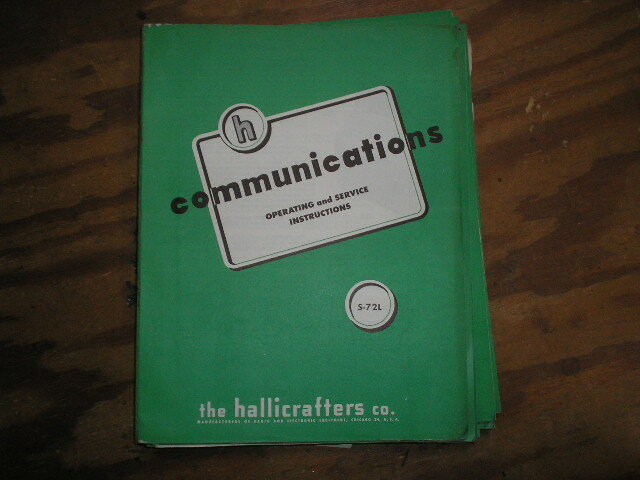 Manual HallicraftersS-82 Receiver Run-1 Operator Service Manual PHOTO COPY! 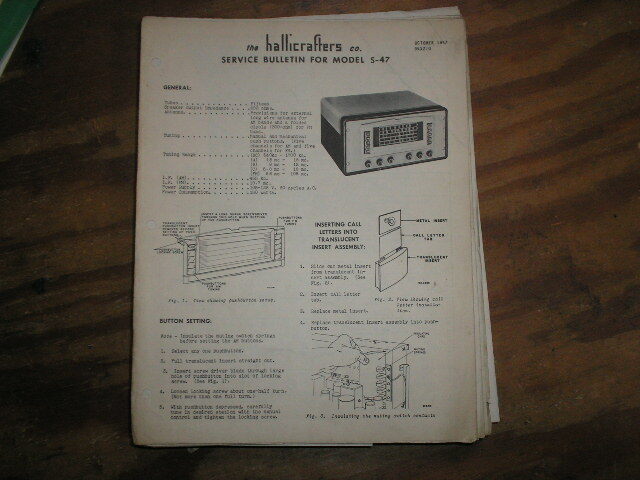 Manual HallicraftersST-83 Receiver Run-1 Operator Service Manual PHOTO COPY! Manual HallicraftersA-84 Receiver Run-1 Operator Service Manual PHOTO COPY! 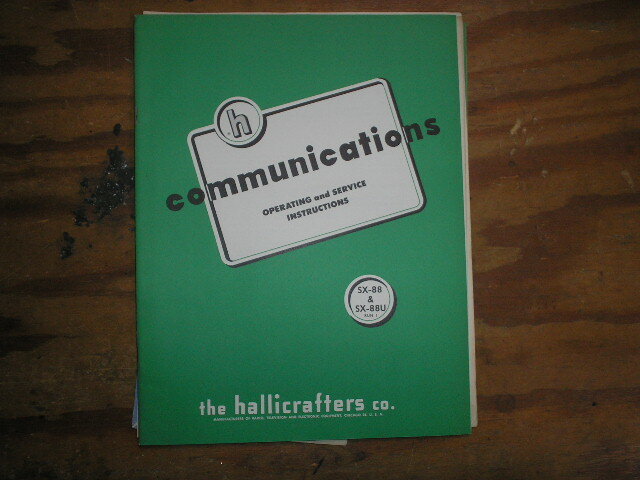 Manual HallicraftersSX-88 SX-88U Receiver Run-1 Operator Service Manual PHOTO COPY! 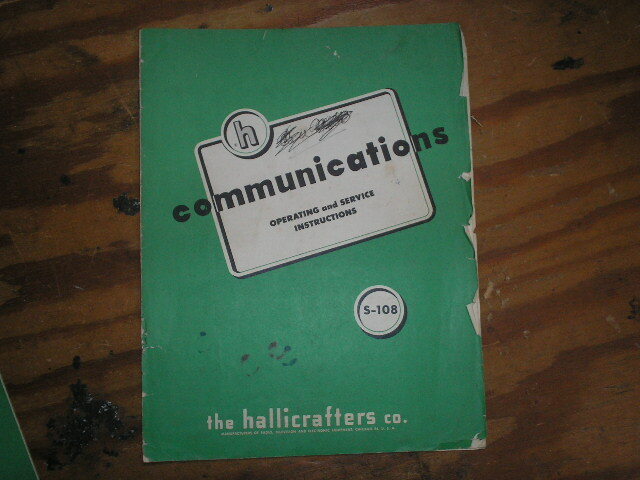 Manual HallicraftersEX-102 Receiver Operator Manual PHOTO COPY! 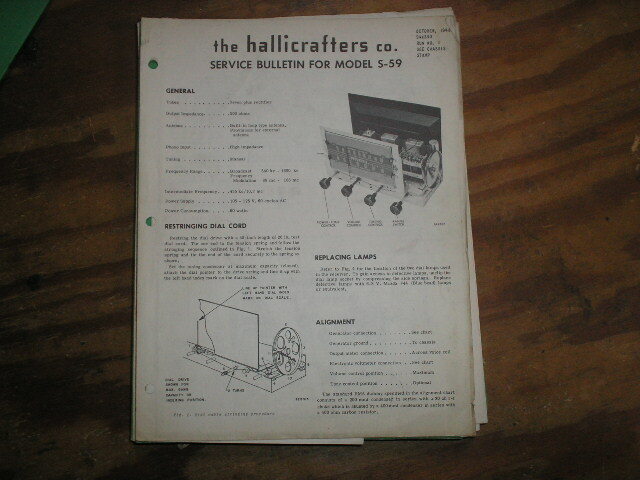 Manual HallicraftersS-108 Receiver Installation Operator Manual PHOTO COPY! Manual HallicraftersTW-1000 Receiver Run-1 Service Manual PHOTO COPY! 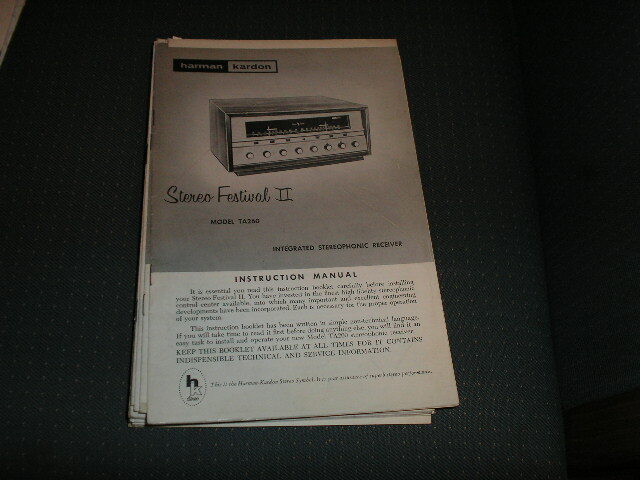 Manual Harman KardonTA230 Stereo Festival Receiver manual with schematic PHOTO COPY! 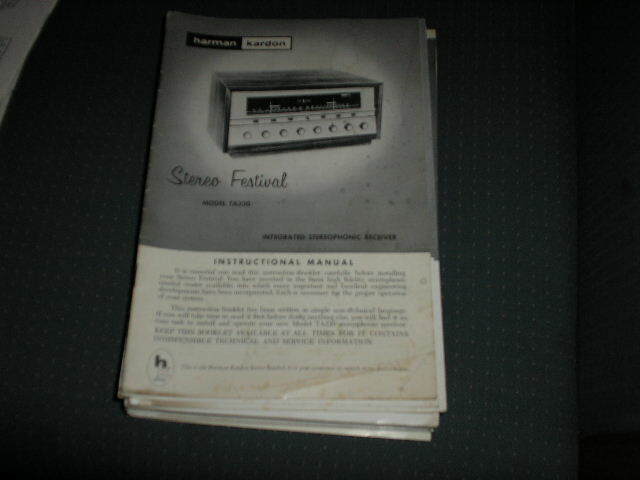 Manual Harman KardonTA260 Stereo Festival 2 Receiver manual with schematic PHOTO COPY! 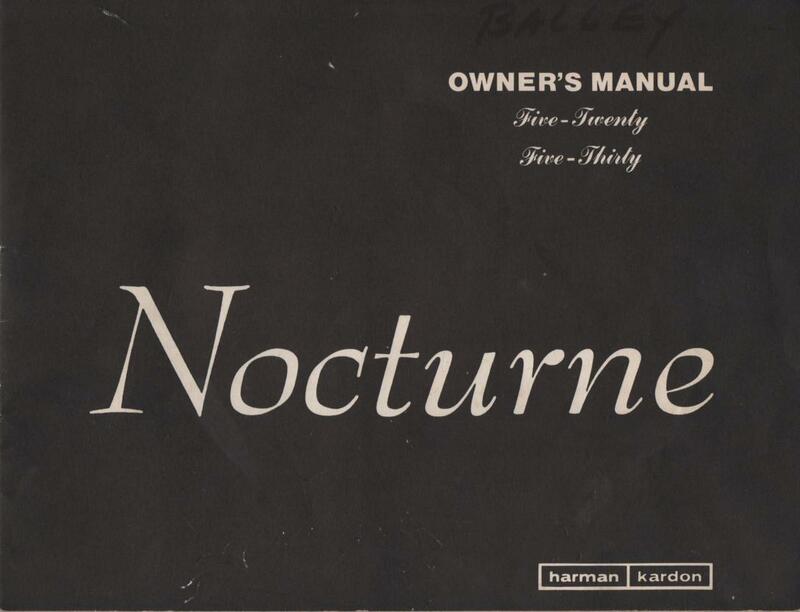 Manual Harman Kardon520 530 Nocturne Receiver Operating Instruction Manual PHOTO COPY! Manual Harman KardonD-1000 Music Center Service Instruction Manual PHOTO COPY! 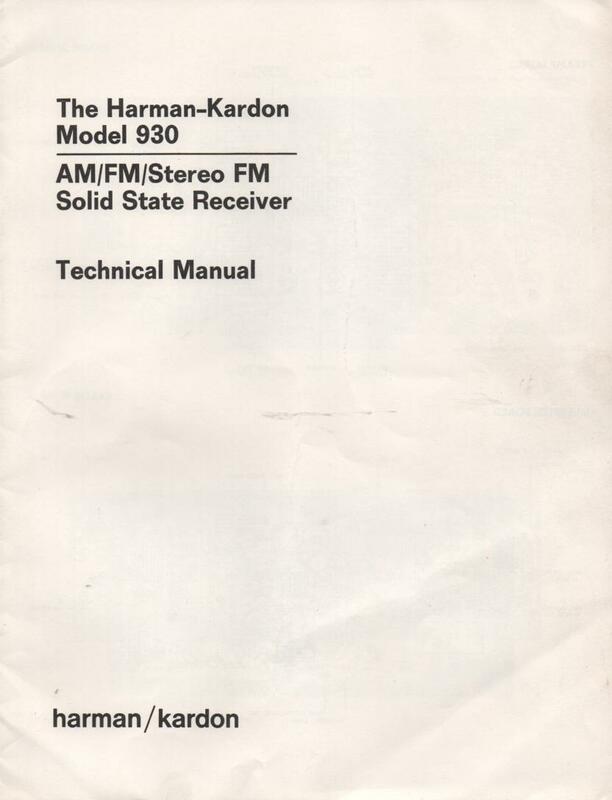 Manual Harman Kardon930 Stereo Receiver Service Manual PHOTO COPY! 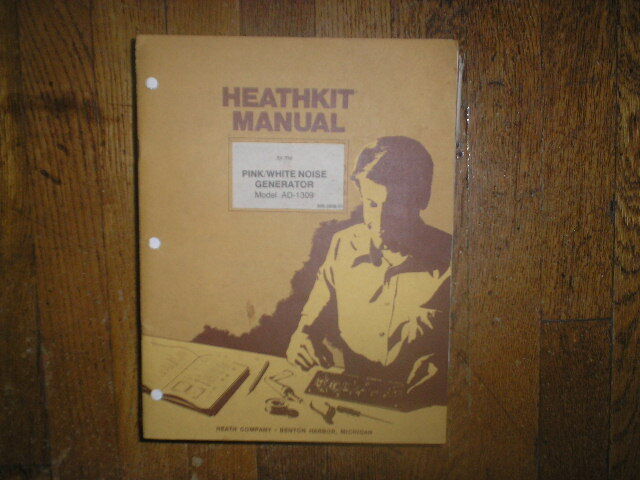 Manual HeathkitAD-1309 Pink/White Noise Generator Assembly Manual with Schematic PHOTO COPY! 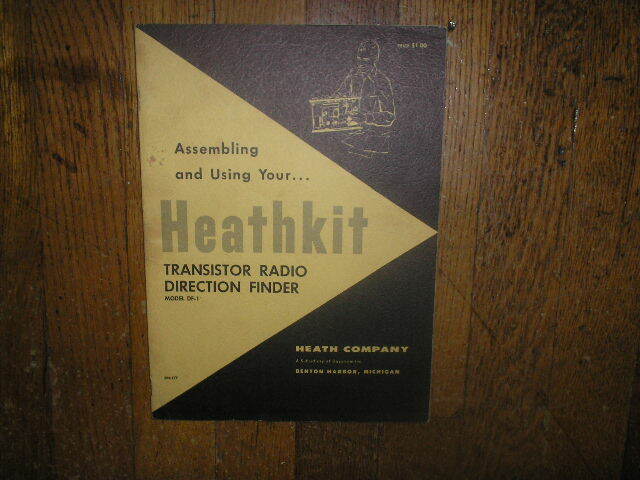 Manual HeathkitDF-1 Direction Finder Assembly Service Manual with Schematic PHOTO COPY! 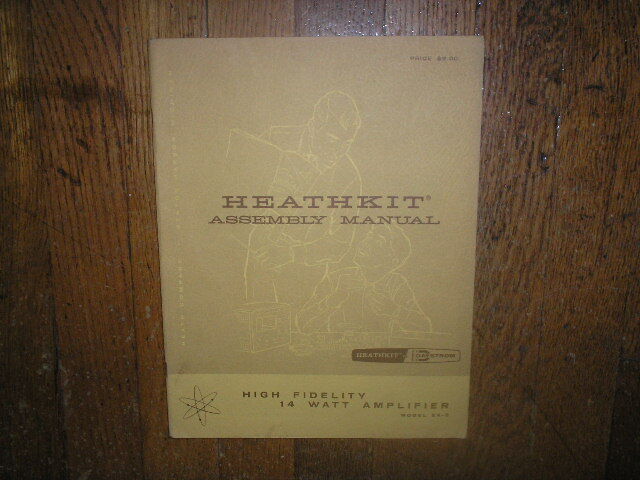 Manual HeathkitEA-3 Amplifier Assembly Service Manual with Schematic PHOTO COPY! 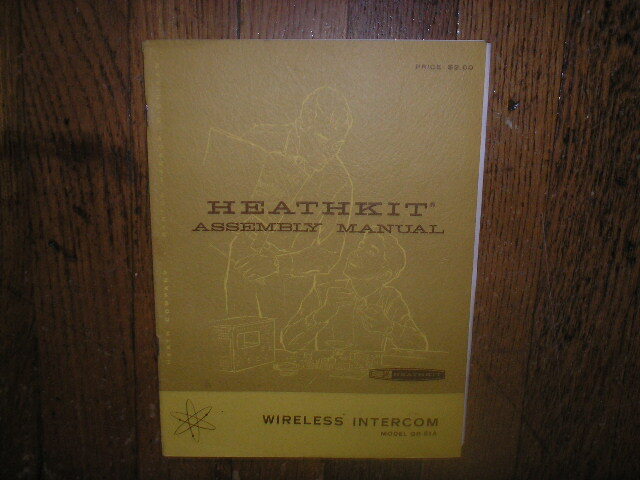 Manual HeathkitGD-51 Wireless Intercom Assembly Manual with Schematic PHOTO COPY! 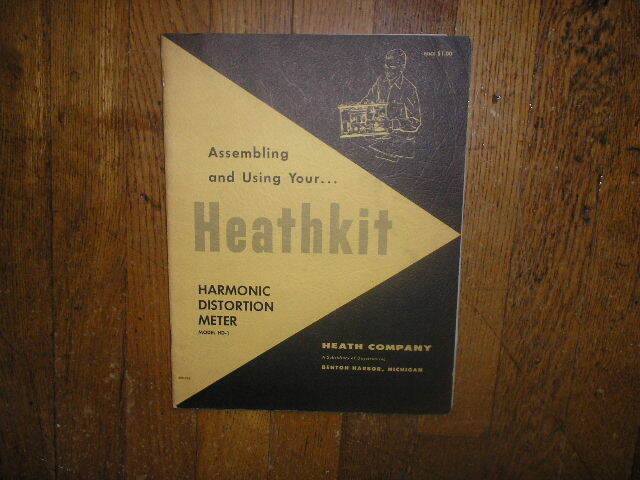 Manual HeathkitHD-1 Harmonic Distortiopn Meter Assembly Service Manual with Schematic PHOTO COPY! 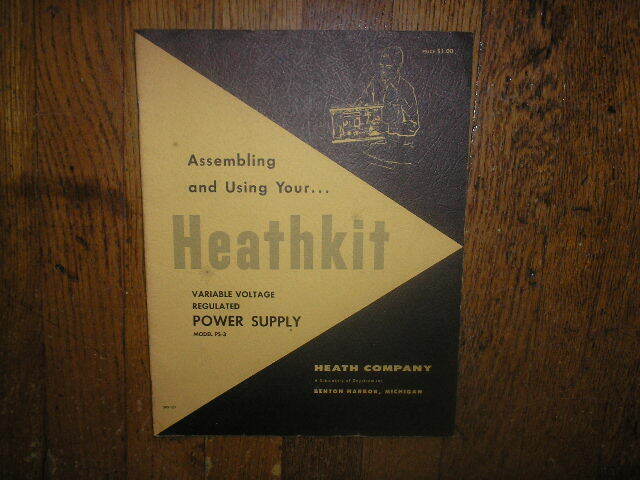 Manual HeathkitPS-3 Variable Voltage Regulated Power Supply Assembly Service Manual with Schematic PHOTO COPY! 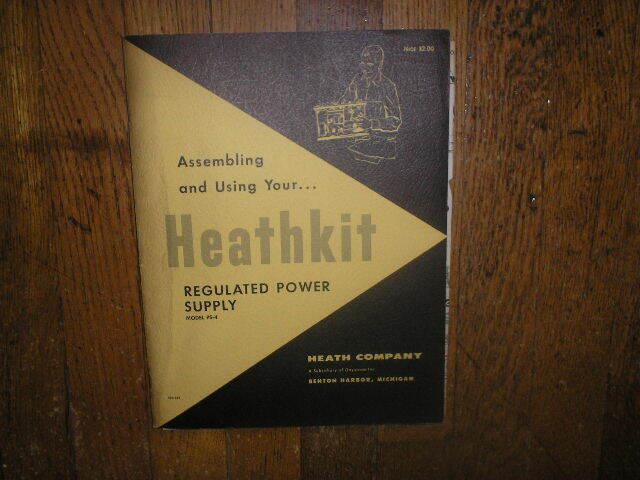 Manual HeathkitPS-4 Regulated Power Supply Assembly Service Manual with Schematic PHOTO COPY! 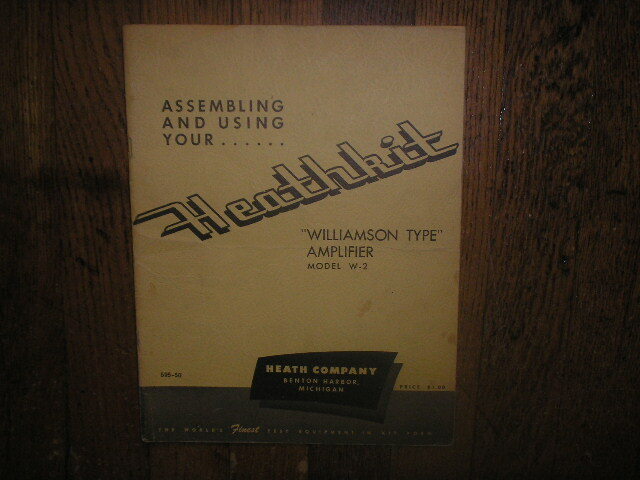 Manual HeathkitW-2 Williamson Type Amplifier Assembly Service Manual with Schematic PHOTO COPY! 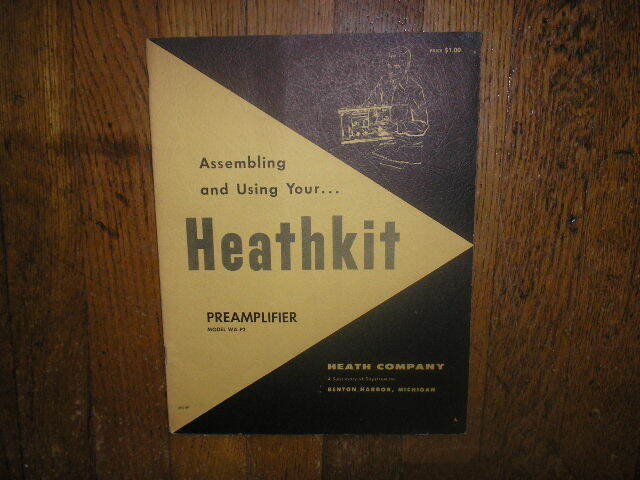 Manual HeathkitWA-P2 Pre-Amplifier Assembly Service Manual with Schematic PHOTO COPY! 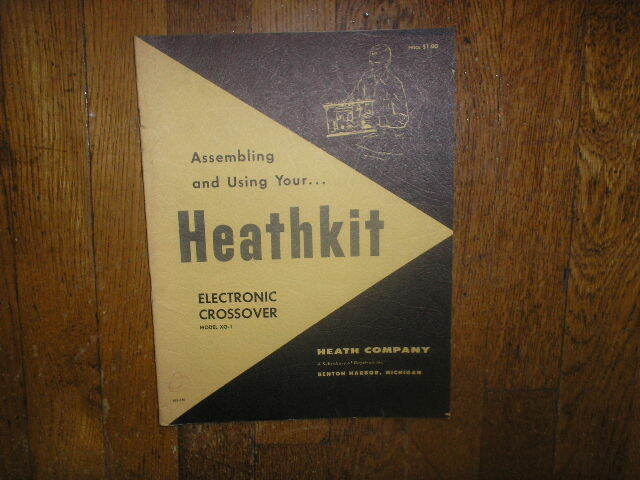 Manual HeathkitXO-1 Electronic Crossover Assembly Manual with Schematic PHOTO COPY! 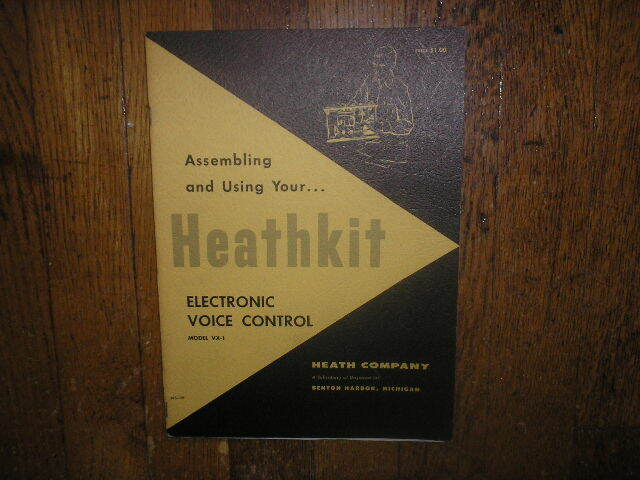 Manual HeathkitVX-1 Electronic Voice Control Service Assembly Manual with Schematic PHOTO COPY! 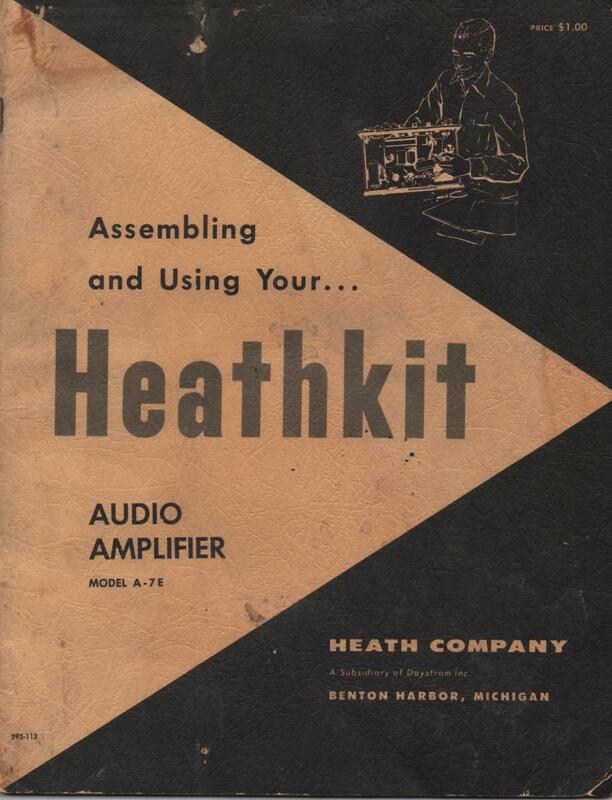 Manual HeathkitSP-2 PRE-AMPLIFIER Assembly Manual with Schematic PHOTO COPY! 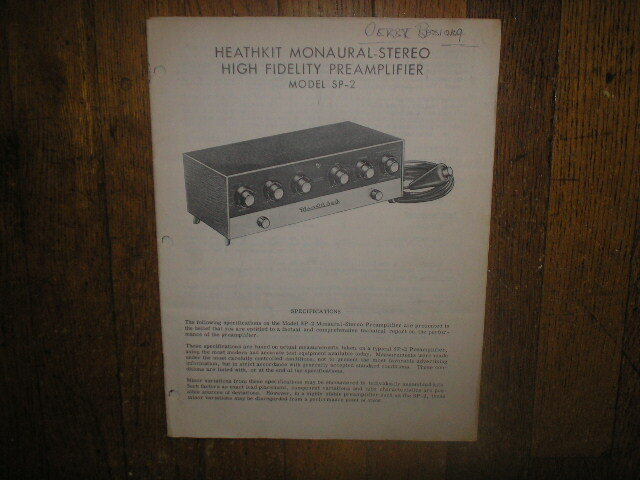 Manual HeathkitA-7E Amplifier Assembly Service Manual PHOTO COPY! 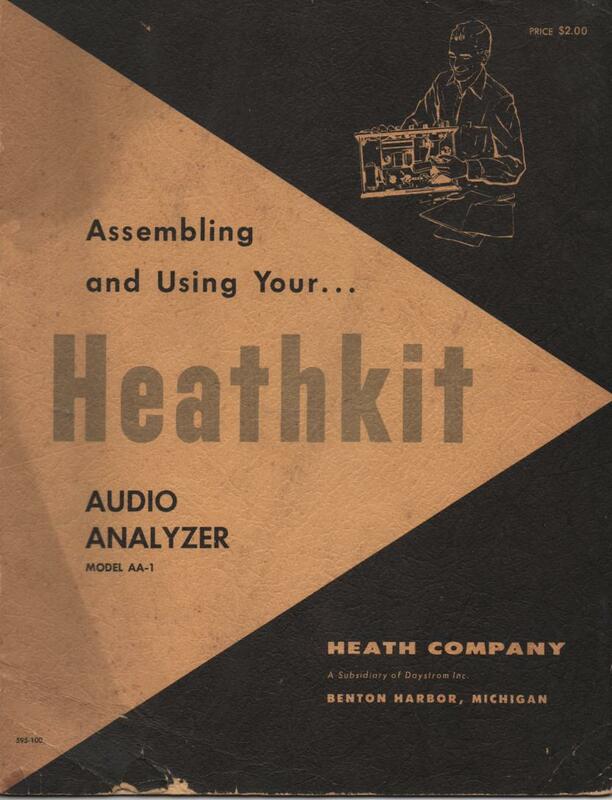 Manual HeathkitAA-1 Audio Analyzer Assembly Service Manual PHOTO COPY! 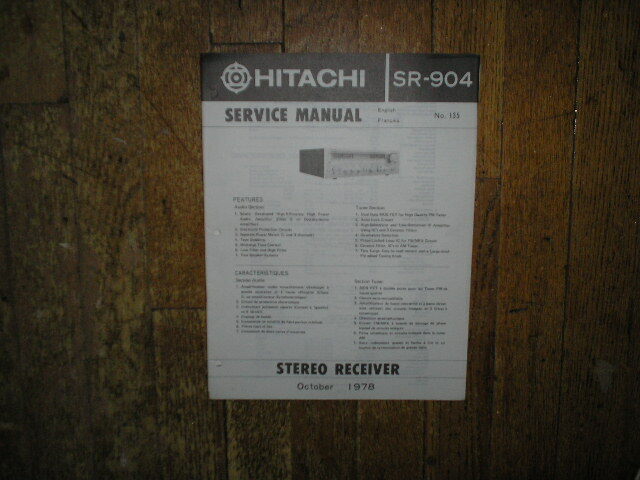 Manual HitachiSR-300 Stereo Receiver Service Manual PHOTO COPY! 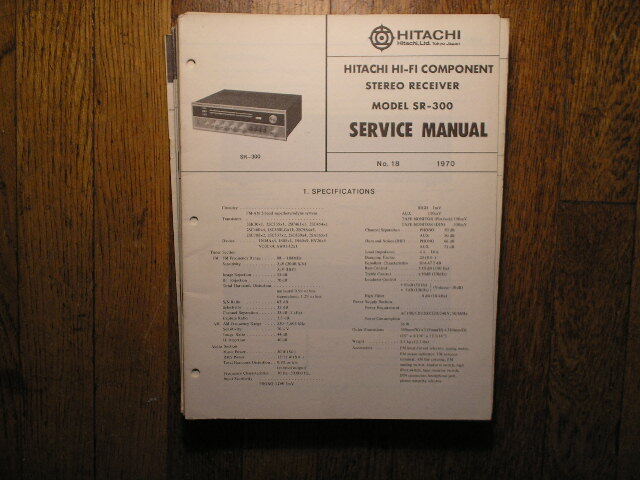 Manual HitachiSR-301 Receiver Service Manual PHOTO COPY! 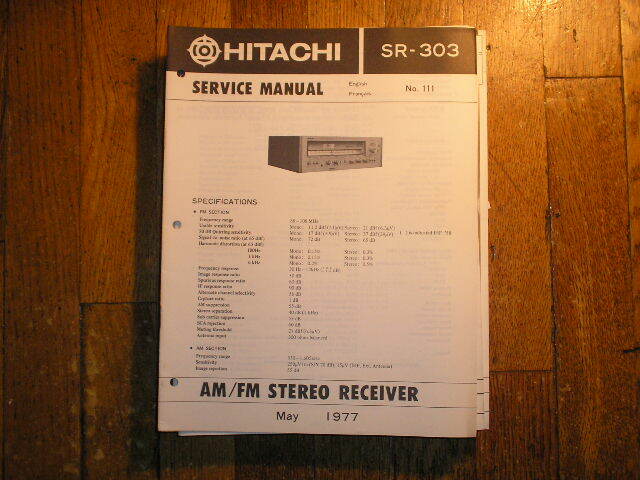 Manual HitachiSR-303 Stereo Receiver Service Manual PHOTO COPY! 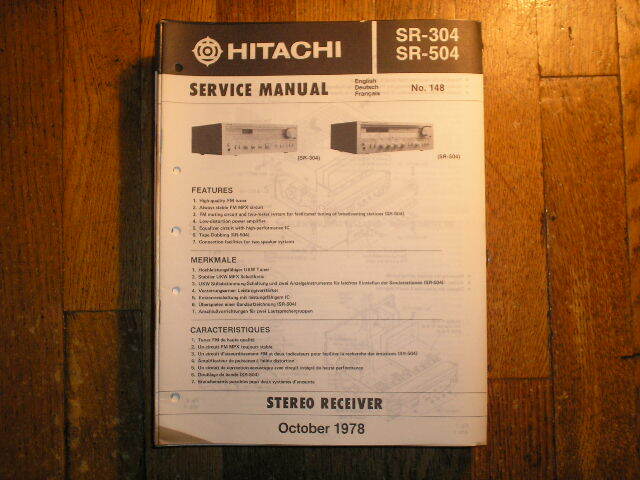 Manual HitachiSR-304 SR-504 Receiver Service Manual PHOTO COPY! 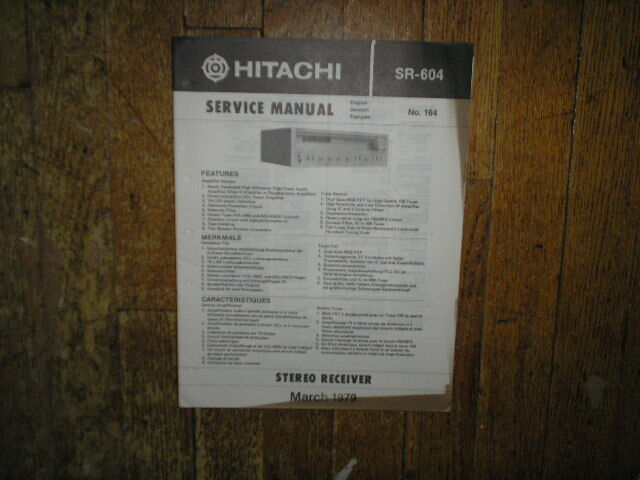 Manual HitachiSR-503 SR-603 Receiver Service Manual PHOTO COPY! 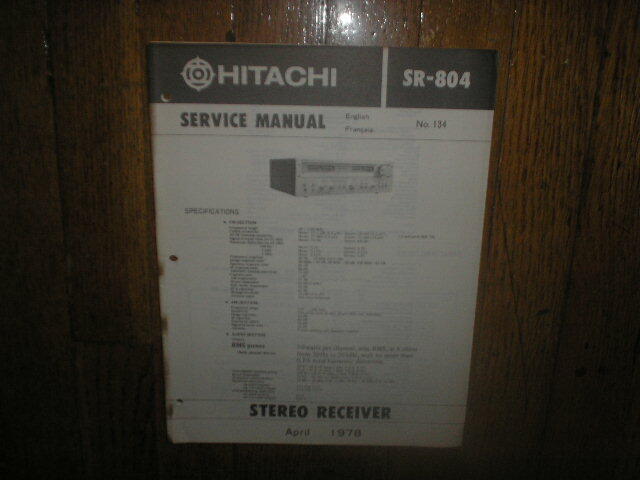 Manual HitachiSR-600 Stereo Receiver Service Manual PHOTO COPY! 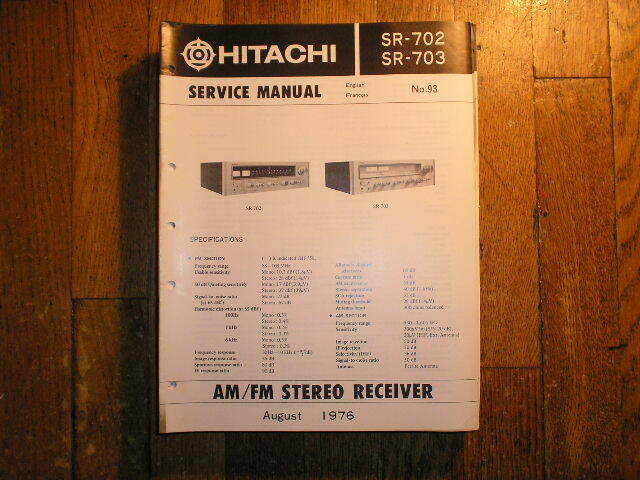 Manual HitachiSR-700 Receiver Service Manual PHOTO COPY! 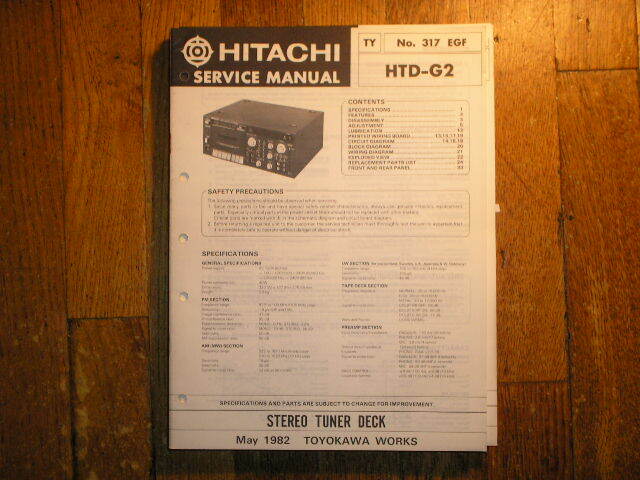 Manual HitachiSR-702 SR-703 Receiver Service Manual PHOTO COPY! 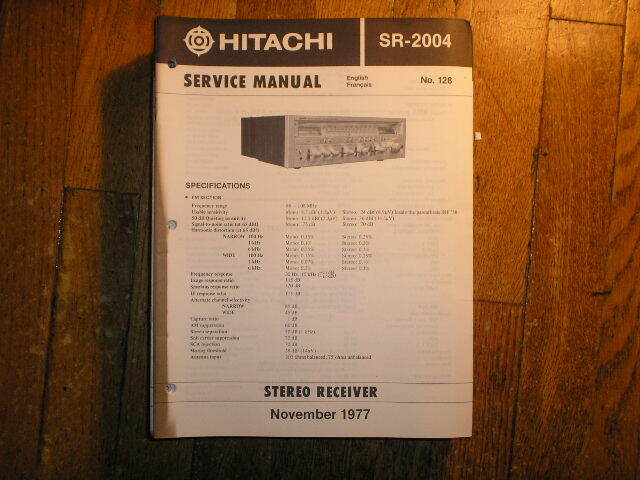 Manual HitachiSR-704 Receiver Service Manual PHOTO COPY! 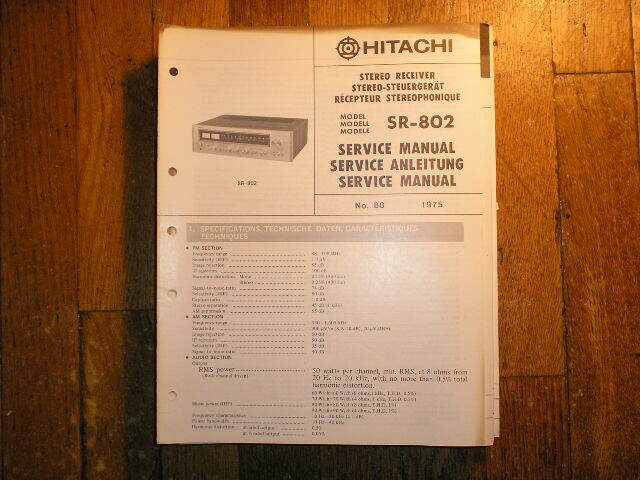 Manual HitachiSR-800 Receiver Service Manual PHOTO COPY! 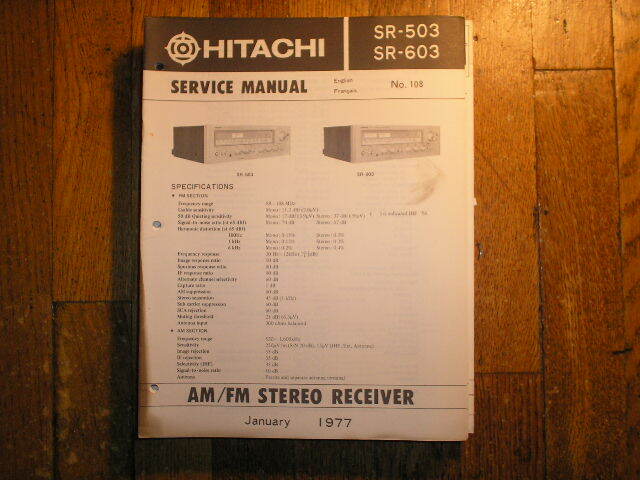 Manual HitachiSR-802 Receiver Service Manual PHOTO COPY! 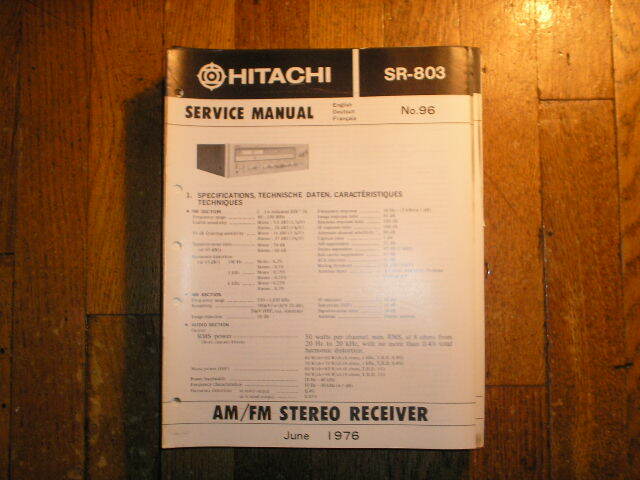 Manual HitachiSR-803 Receiver Service Manual PHOTO COPY! 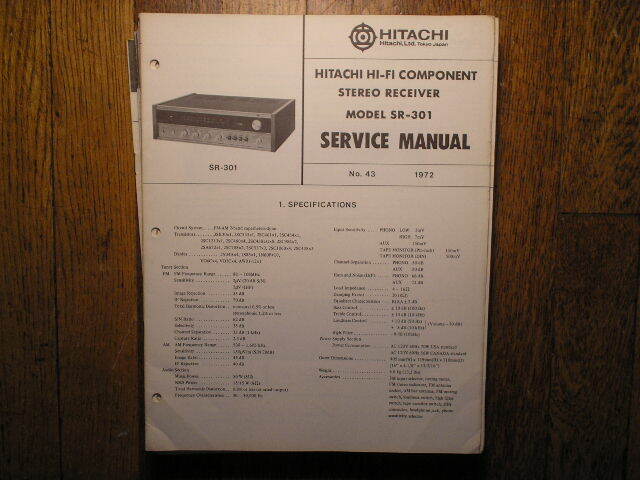 Manual HitachiSR-804 Receiver Service Manual PHOTO COPY! 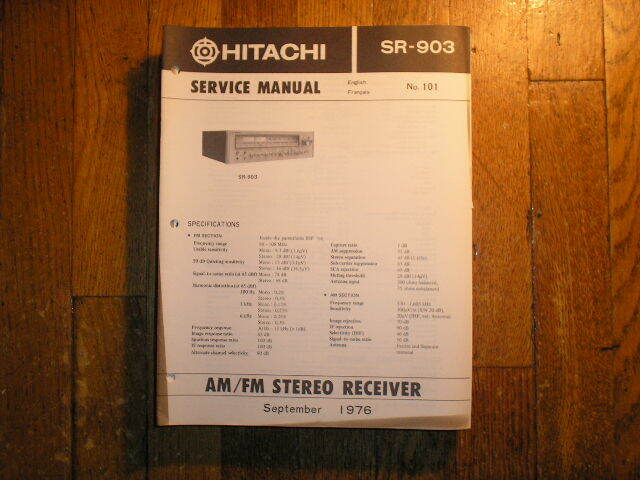 Manual HitachiSR-903 Stereo Receiver Service Manual PHOTO COPY! 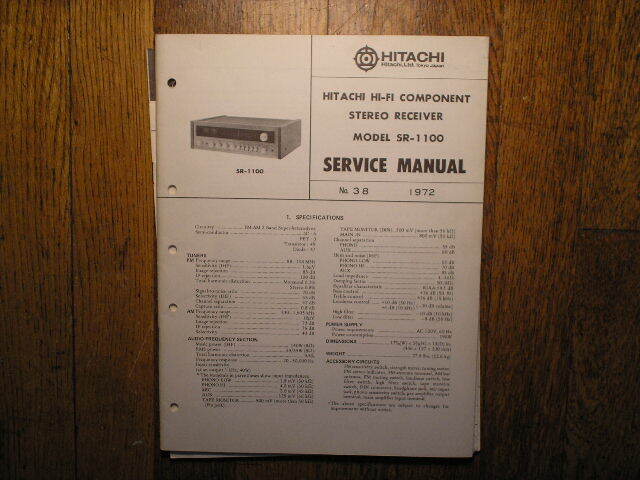 Manual HitachiSR-1100 Receiver Service Manual PHOTO COPY! 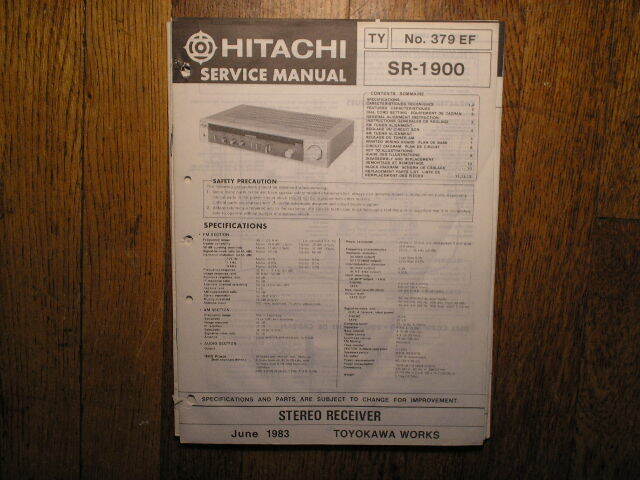 Manual HitachiSR-1900 Receiver Service Manual PHOTO COPY! 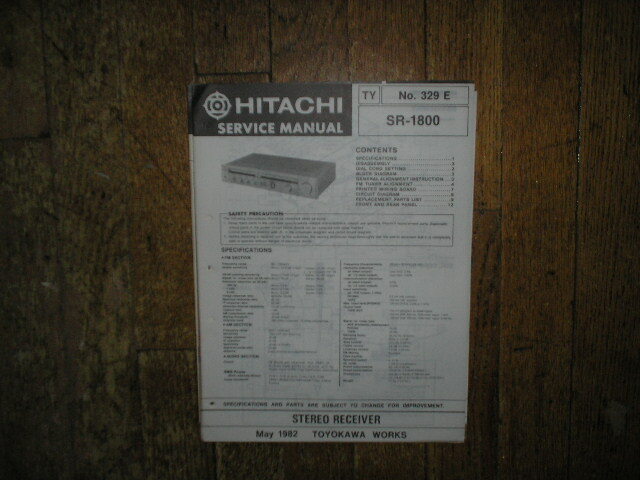 Manual HitachiSR-2004 Receiver Service Manual PHOTO COPY! 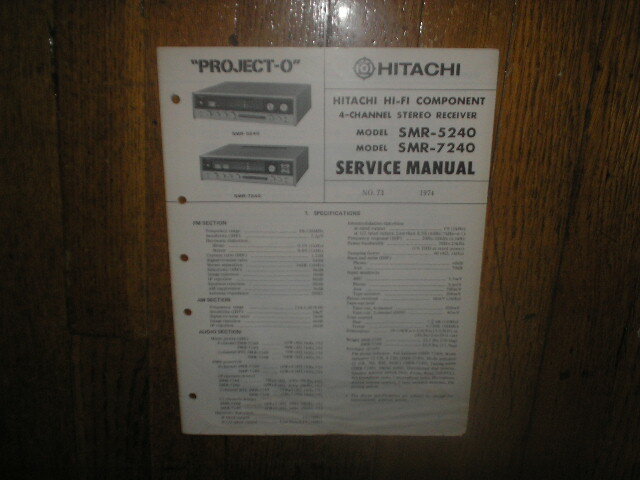 Manual HitachiSR-2010 Receiver Service Manual PHOTO COPY! 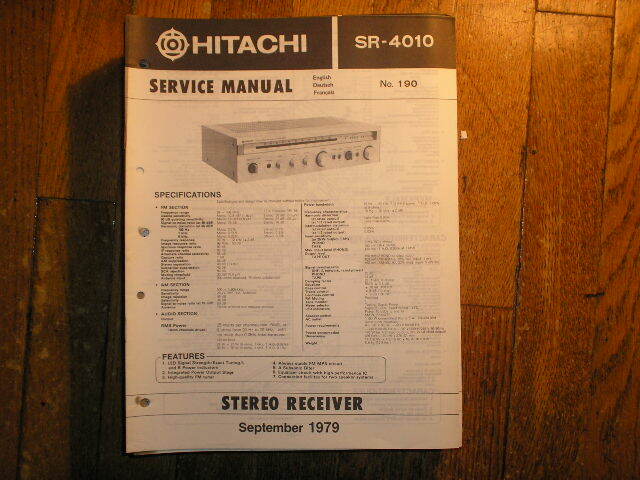 Manual HitachiSR-4010 Receiver Service Manual PHOTO COPY! 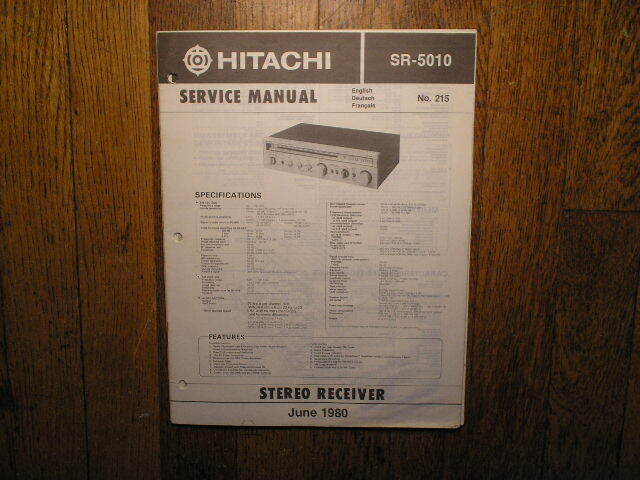 Manual HitachiSR-5010 Receiver Service Manual PHOTO COPY! 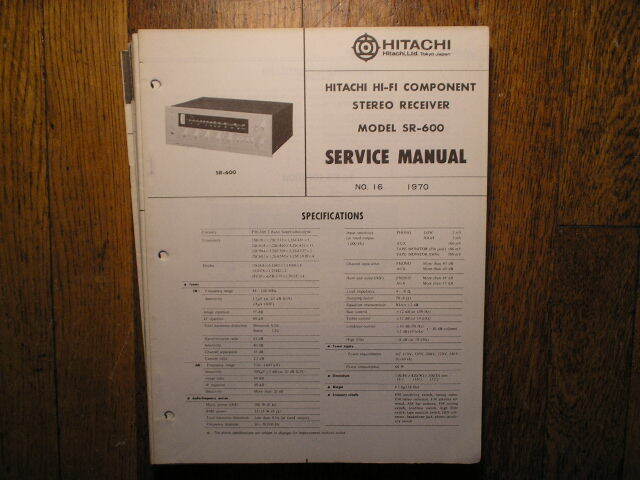 Manual HitachiSR-6010 Receiver Owners Manual PHOTO COPY! 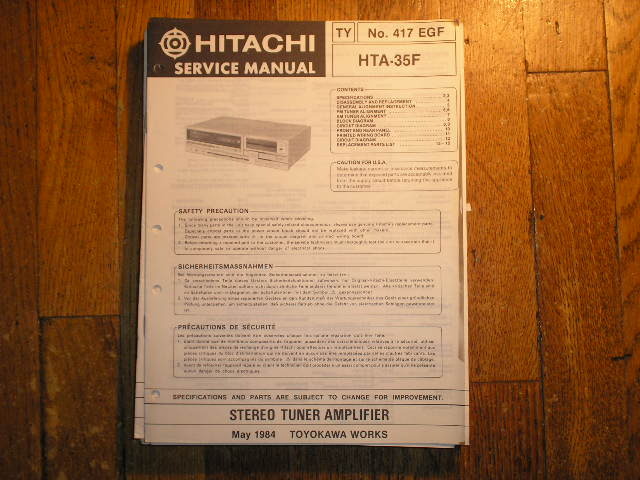 Manual HitachiSMR-5240 SMR-7240 Stereo Receiver Service Manual PHOTO COPY! 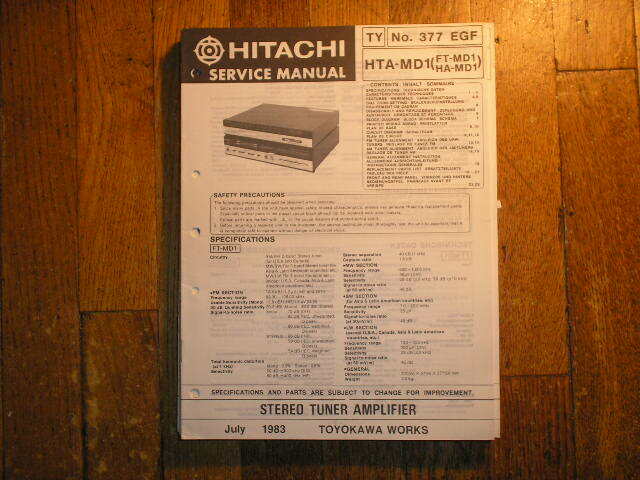 Manual HitachiHitachi SR-604 Receiver Instruction Manual PHOTO COPY! 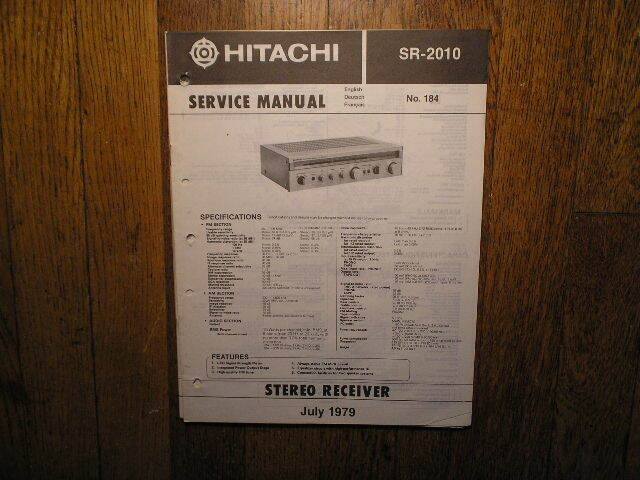 Manual HitachiHitachi SR-904 Receiver Instruction Manual PHOTO COPY! 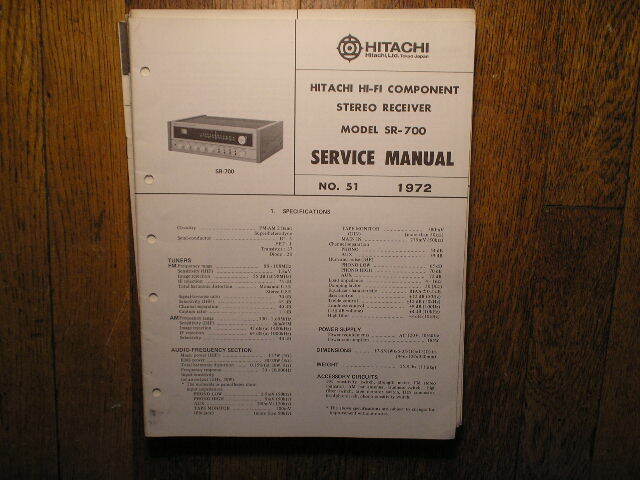 Manual HitachiSR-1800 Receiver Service Manual PHOTO COPY! 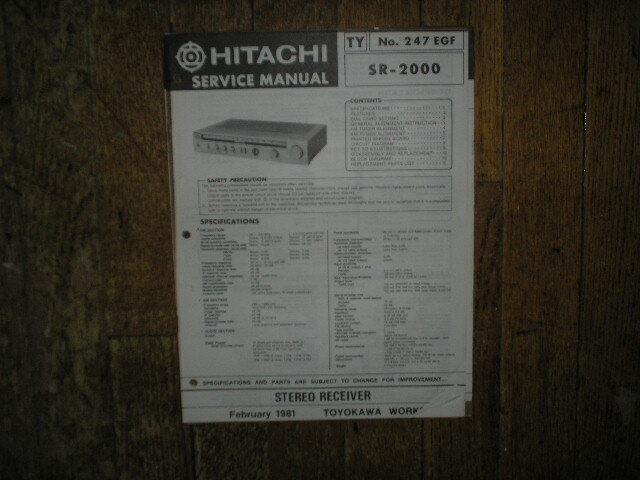 Manual HitachiSR-2000 Receiver Service Manual PHOTO COPY! 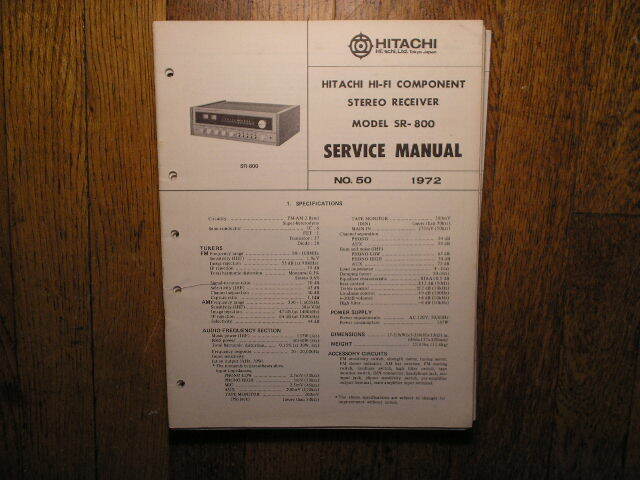 Manual HitachiSR-8010 Receiver Service Manual PHOTO COPY! 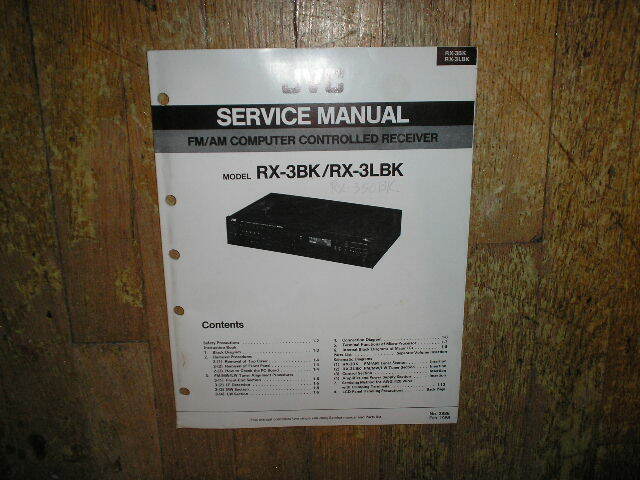 Manual JVCRX-3BK RX-3LBK Receiver Service Manual PHOTO COPY! 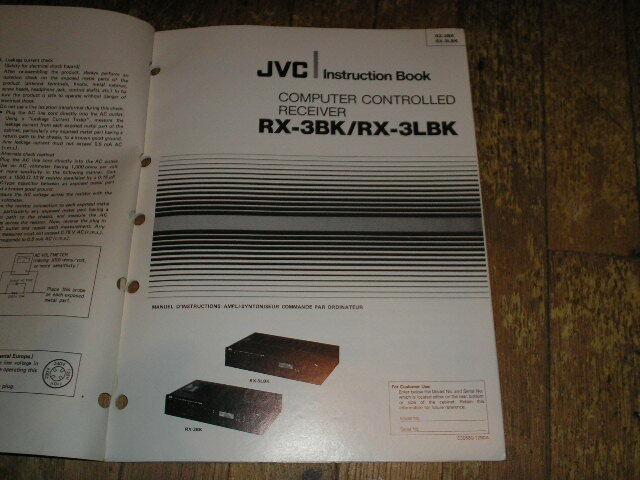 Manual JVCRX-3BK RX-3LBK Receiver Operating Instruction Manual PHOTO COPY! 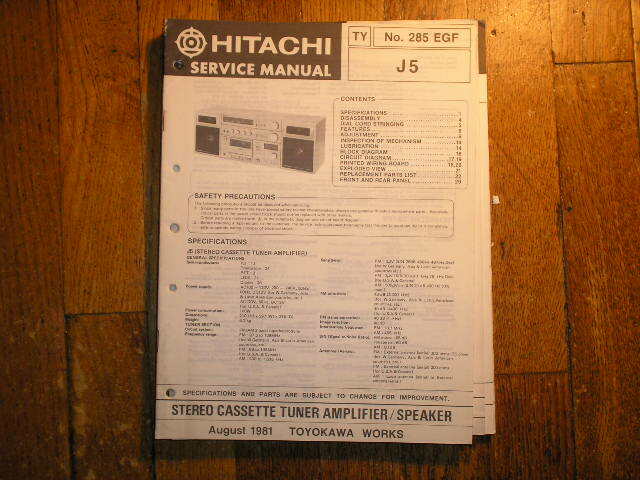 Manual JVCR-S33 Receiver Service Manual PHOTO COPY! 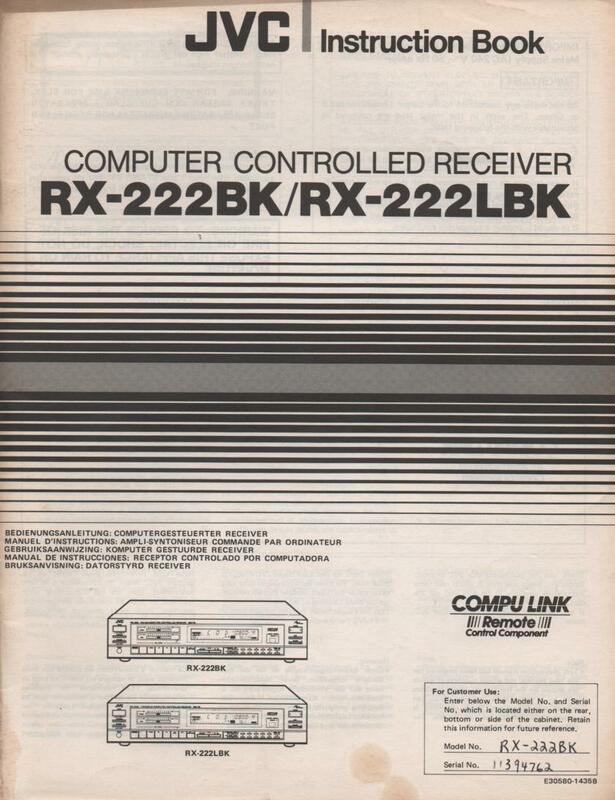 Manual JVCRX-222BK RX-222LBK Receiver Owners Instruction Manual PHOTO COPY! 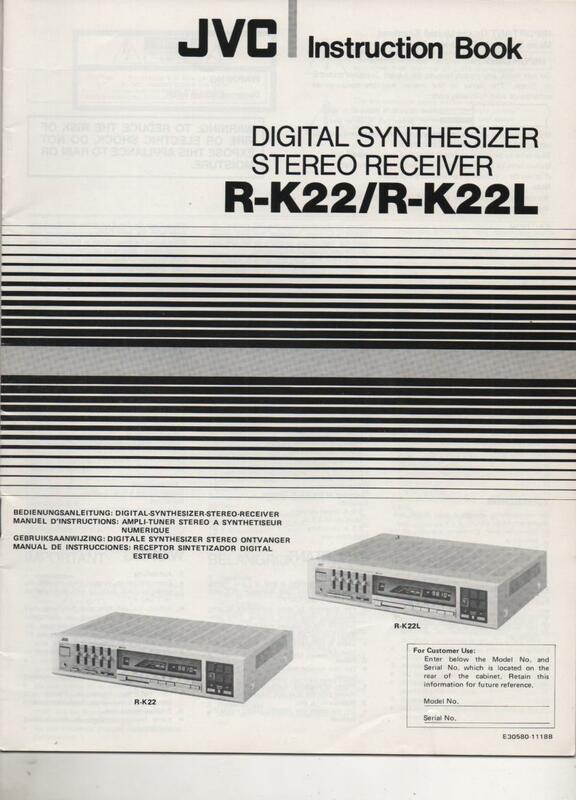 Manual JVCR-K22 R-K22L Receiver Owners Manual PHOTO COPY! 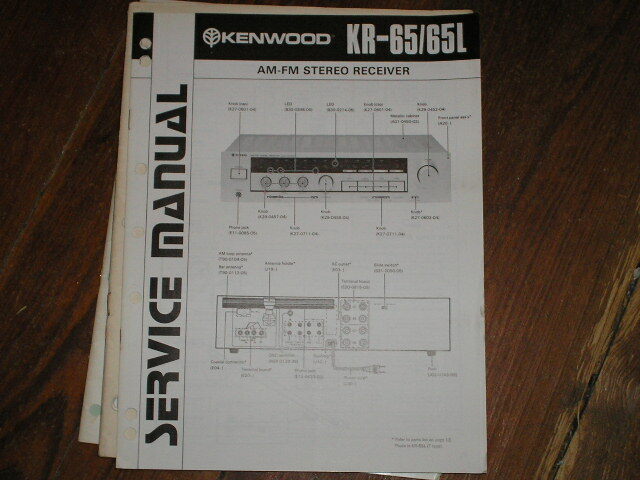 Manual KenwoodKR-9600 Receiver Service Manual with a 6 page Service Bulletin on the Protection Circuit PHOTO COPY! 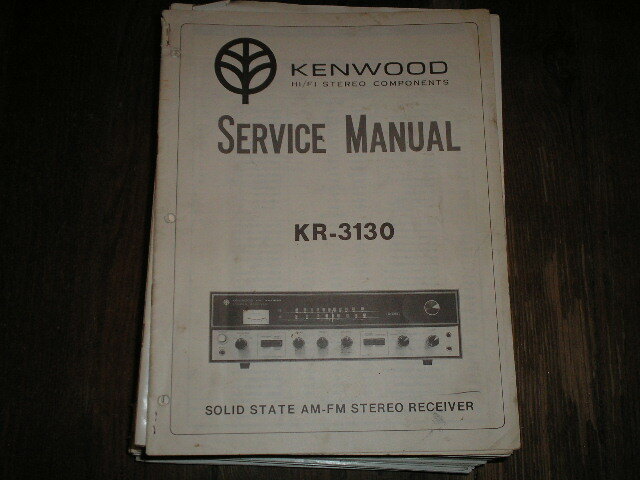 Manual KenwoodKR-33 Receiver Service Manual PHOTO COPY! 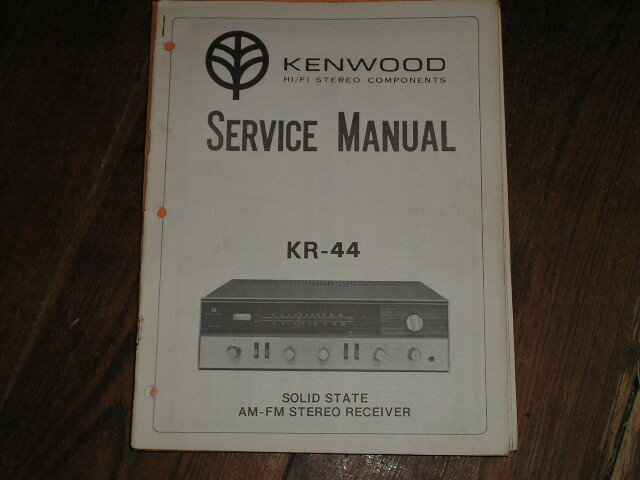 Manual KenwoodKR-44 Receiver Service Manual PHOTO COPY! Manual KenwoodKR-55 KR-55L Receiver Service Manual B51-0783...880 PHOTO COPY! Manual KenwoodKR-65 KR-65L Receiver Service Manual B51-1304...880 PHOTO COPY! 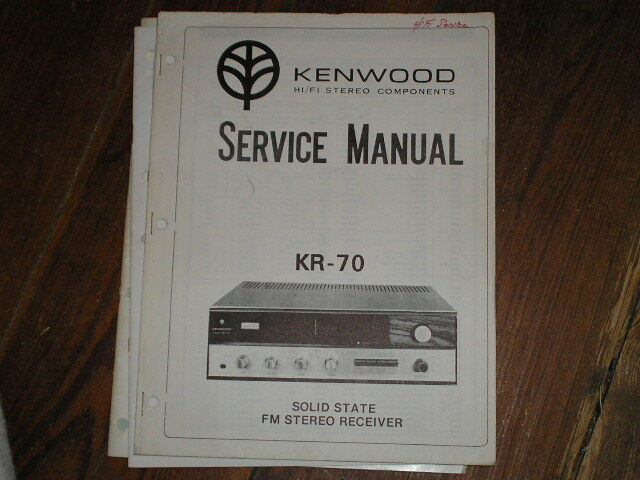 Manual KenwoodKR-70 Receiver Service Manual PHOTO COPY! Manual KenwoodKR-80 KR-80L Receiver Service Manual PHOTO COPY! Manual KenwoodKR-90 Receiver Service Manual B51-1284...880 PHOTO COPY! 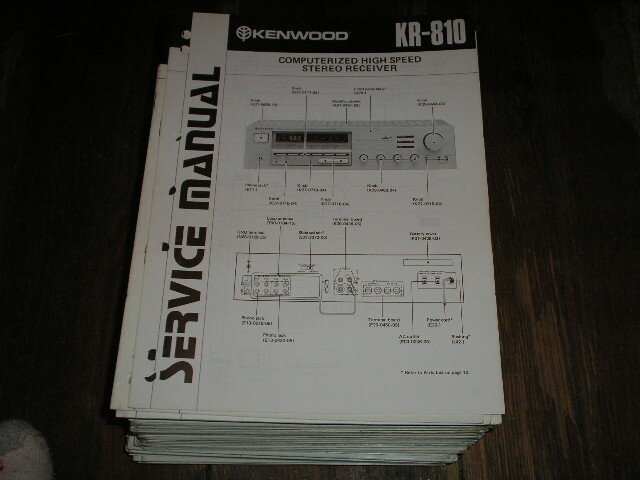 Manual KenwoodKR-100 Receiver Service Manual PHOTO COPY! 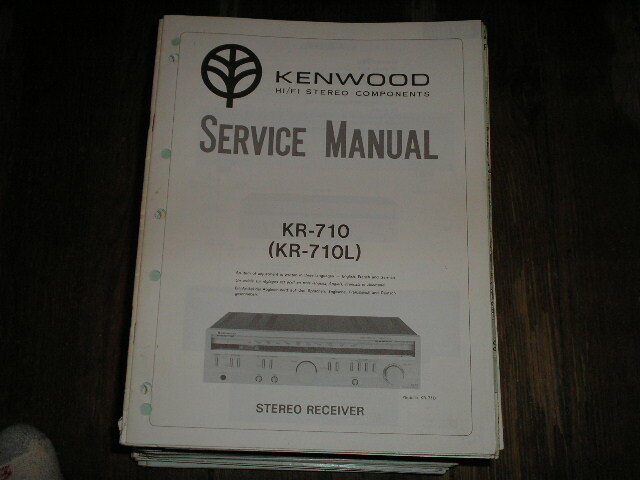 Manual KenwoodKR-710 KR-710L Receiver Service Manual PHOTO COPY! 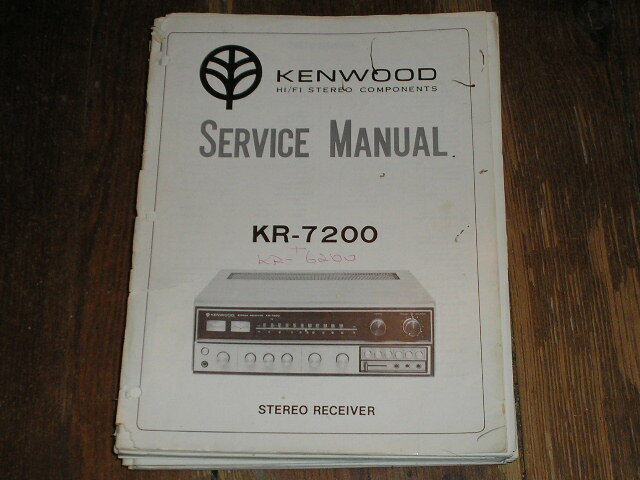 Manual KenwoodKR-720 KR-720L KR-725 Receiver Service Manual PHOTO COPY! 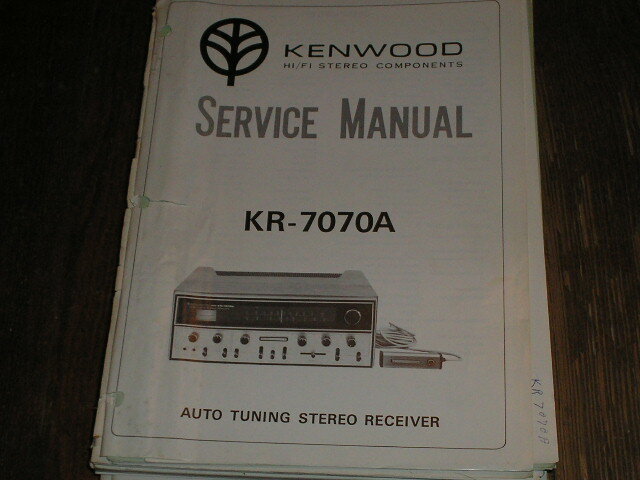 Manual KenwoodKR-730 KR-750 Receiver Service Manual PHOTO COPY! 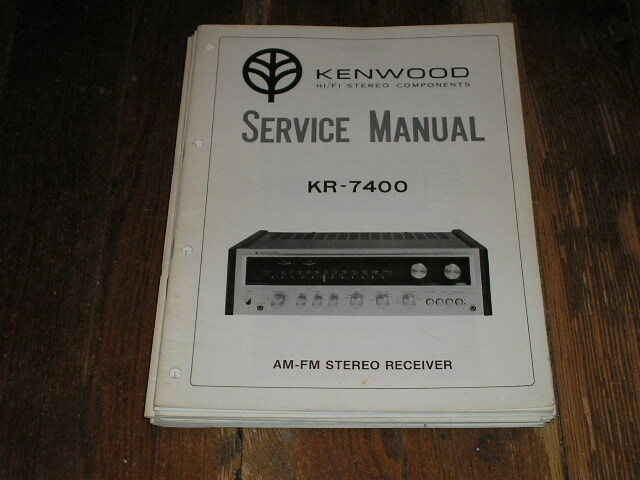 Manual KenwoodKR-770 Receiver Service Manual PHOTO COPY! Manual KenwoodKR-810 Receiver Service Manual B51-1342...880 PHOTO COPY! 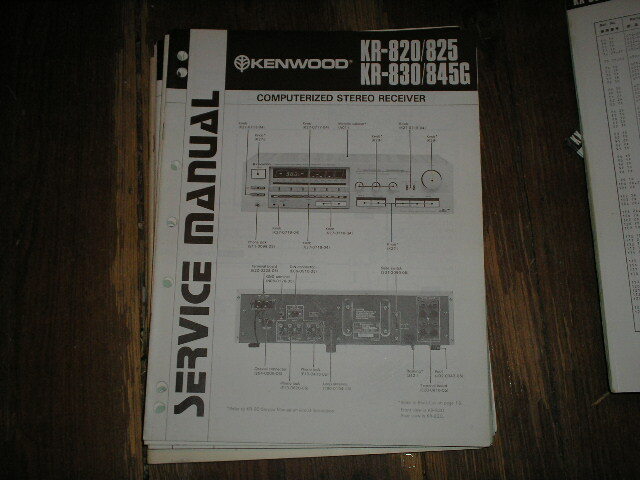 Manual KenwoodKR-820 KR-825 KR-830 KR-845G Receiver Service Manual PHOTO COPY! Manual KenwoodKR-825 KR-0820 KR-830 KR-845G Receiver Service Manual PHOTO COPY! Manual KenwoodKR-830 KR-0820 KR-825 KR-845G Receiver Service Manual PHOTO COPY! Manual KenwoodKR-845G KR-0820 KR-825 KR-830 Receiver Service Manual PHOTO COPY! Manual KenwoodKR-850 KR-856G Receiver Service Manual PHOTO COPY! 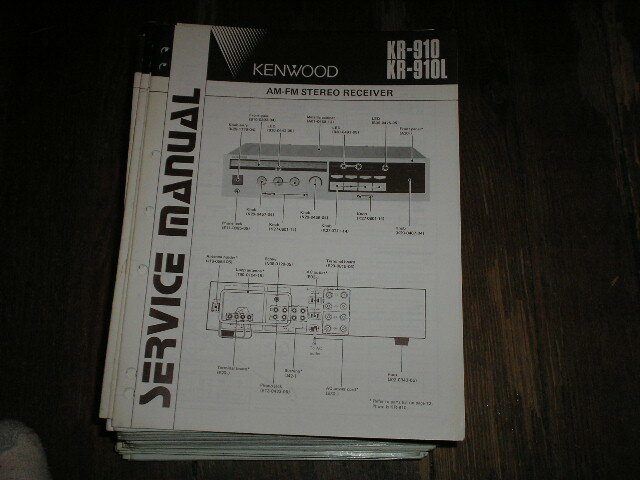 Manual KenwoodKR-910 KR-910L Receiver Service Manual B51-1468...1320 PHOTO COPY! Manual KenwoodKR-920 KR-920L Receiver Service Manual B51-1506...880 PHOTO COPY! Manual KenwoodKR-930 KR-930B Receiver Service Manual B51-1486...880 PHOTO COPY! 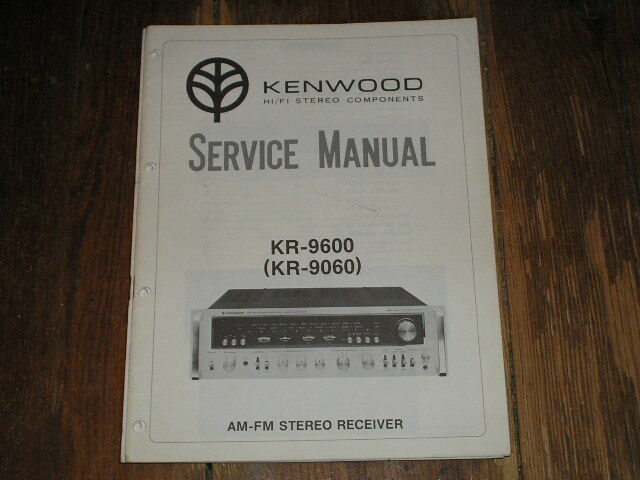 Manual KenwoodKR-950 KR-950B Receiver Service Manual PHOTO COPY! 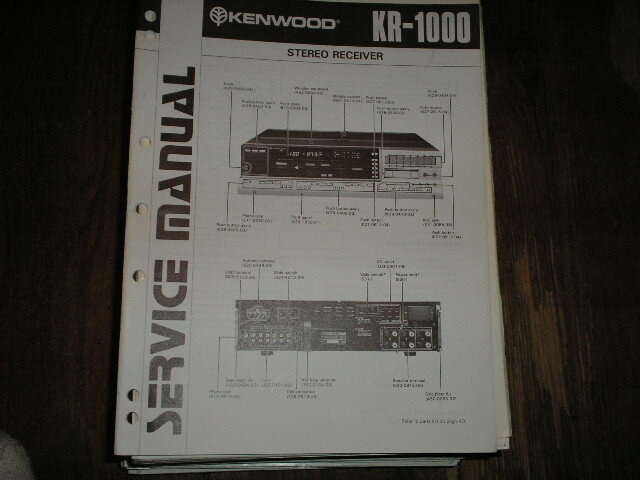 Manual KenwoodKR-1000 Receiver Service Manual PHOTO COPY! 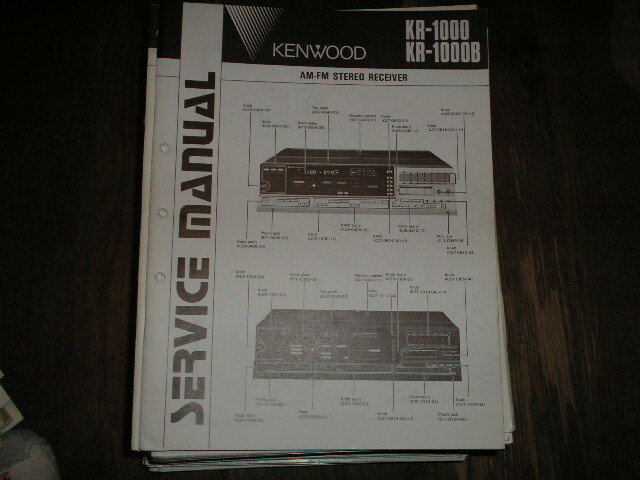 Manual KenwoodKR-1000 KR-1000B Receiver Service Manual PHOTO COPY! 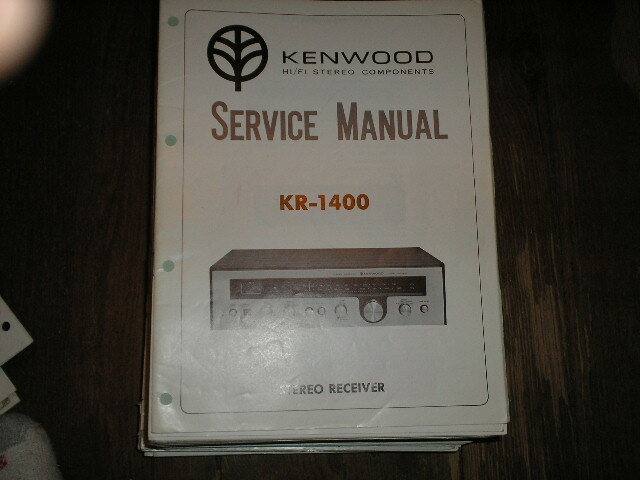 Manual KenwoodKR-1400 Receiver Service Manual PHOTO COPY! Manual KenwoodKR-2010 Receiver Service Manual PHOTO COPY! 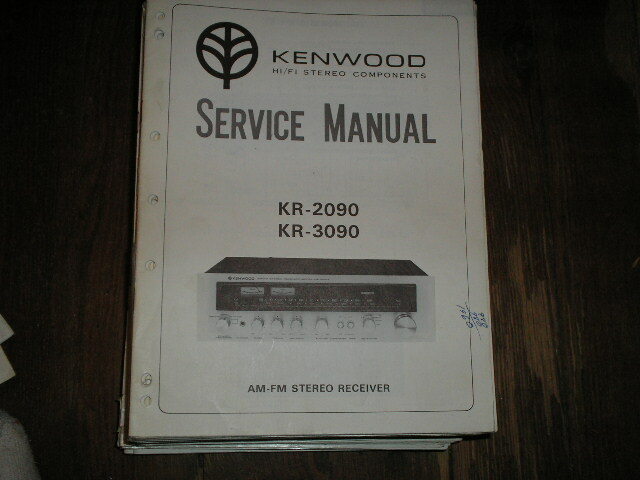 Manual KenwoodKR-2090 KR-3090 Receiver Service Manual PHOTO COPY! 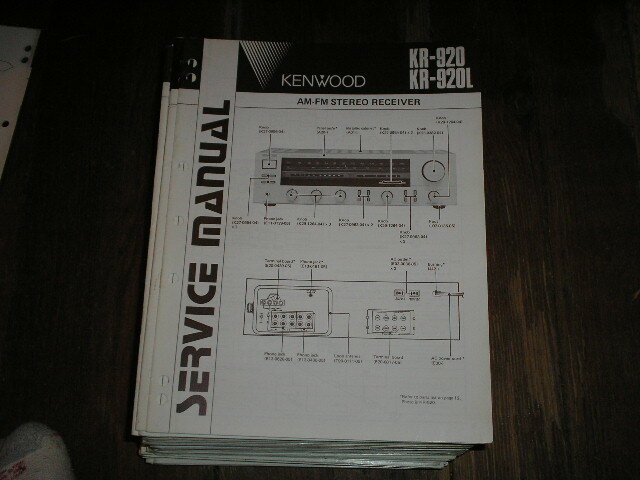 Manual KenwoodKR-2120 Receiver Service Manual PHOTO COPY! 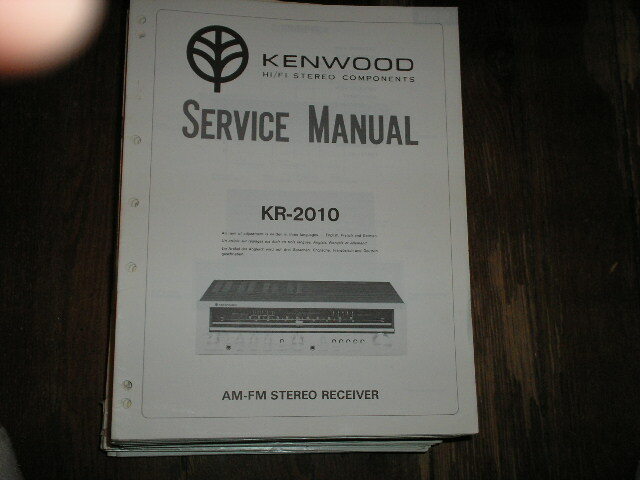 Manual KenwoodKR-2200 Receiver Service Manual PHOTO COPY! 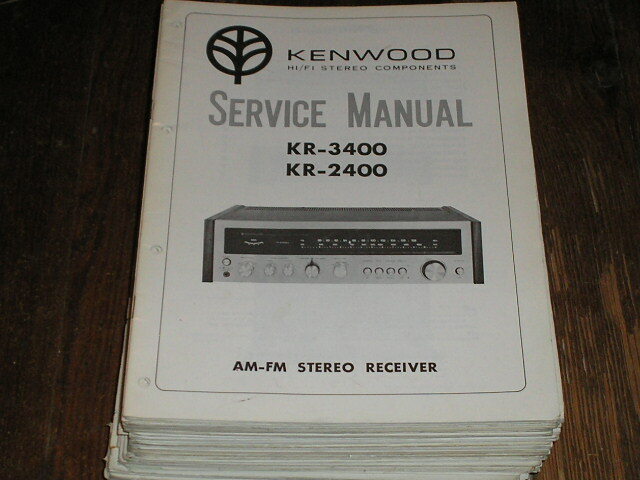 Manual KenwoodKR-2400 KR-3400 Receiver Service Manual PHOTO COPY! 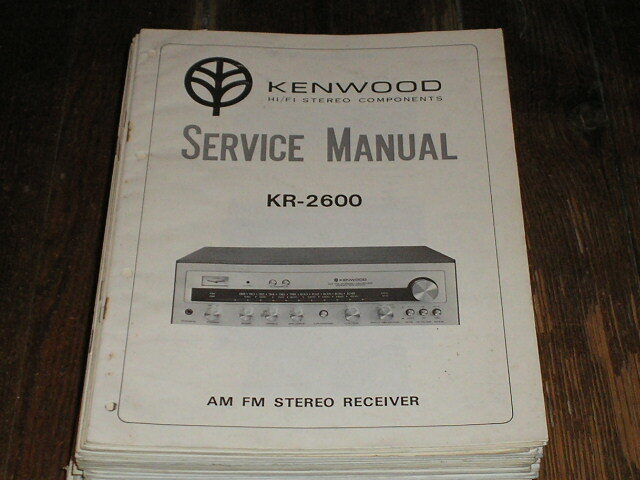 Manual KenwoodKR-2600 Receiver Service Manual. Includes Both the Operating Instruction Manual and Service Manual PHOTO COPY! Manual KenwoodKR-3010 KR-3010L Receiver Service Manual PHOTO COPY! 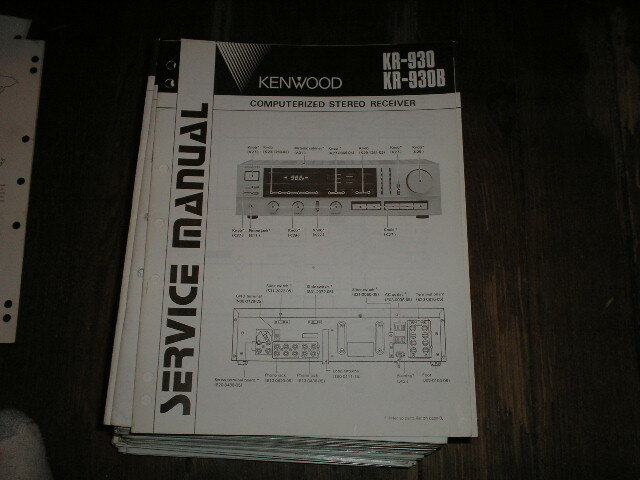 Manual KenwoodKR-3200 Receiver Service Manual PHOTO COPY! 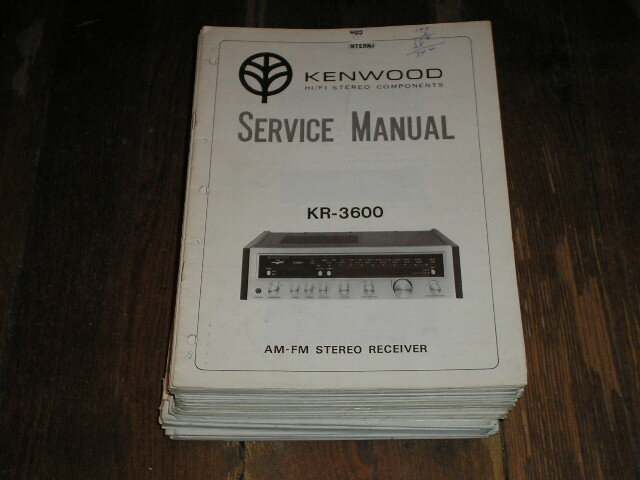 Manual KenwoodKR-3600 Receiver Service Manual PHOTO COPY! 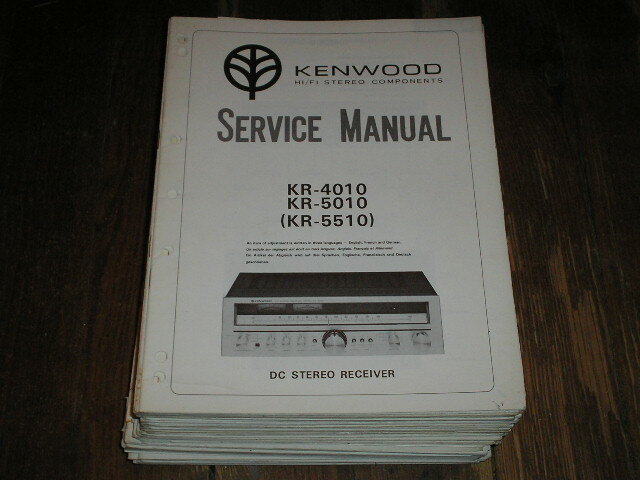 Manual KenwoodKR-4010 KR-5010 KR-5510 Receiver Service Manual PHOTO COPY! 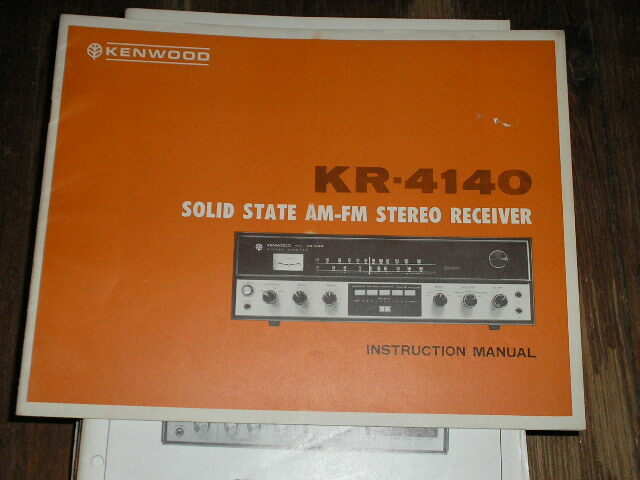 Manual KenwoodKR-4070 KR-4770 Receiver Service Manual PHOTO COPY! 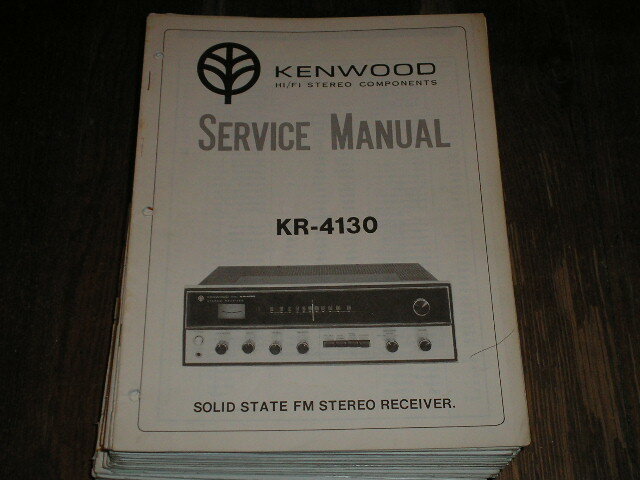 Manual KenwoodKR-4130 Receiver Service Manual PHOTO COPY! 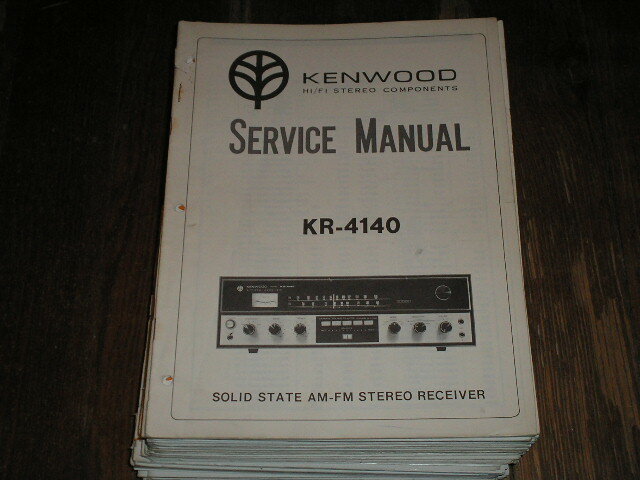 Manual KenwoodKR-4140 Receiver Service Manual PHOTO COPY! Manual KenwoodKR-4140 Operating Manual PHOTO COPY! 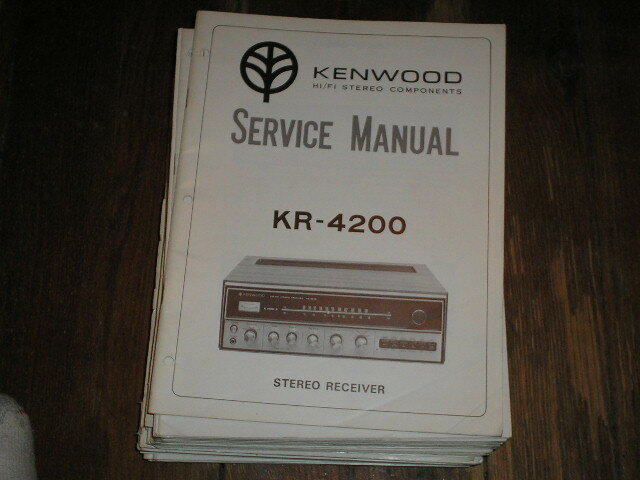 Manual KenwoodKR-4200 Receiver Service Manual PHOTO COPY! 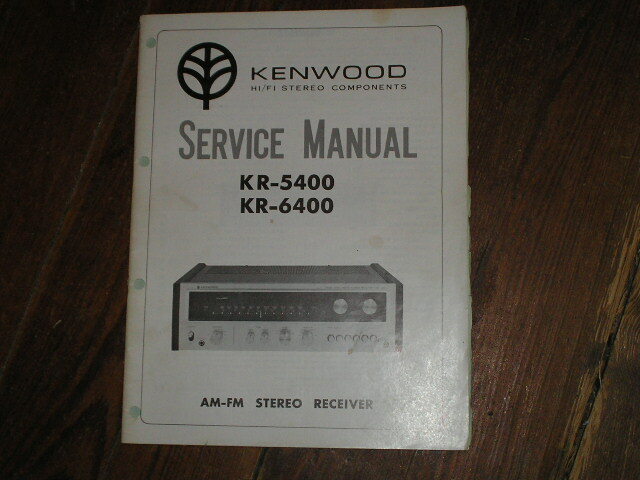 Manual KenwoodKR-4400 Receiver Service Manual PHOTO COPY! 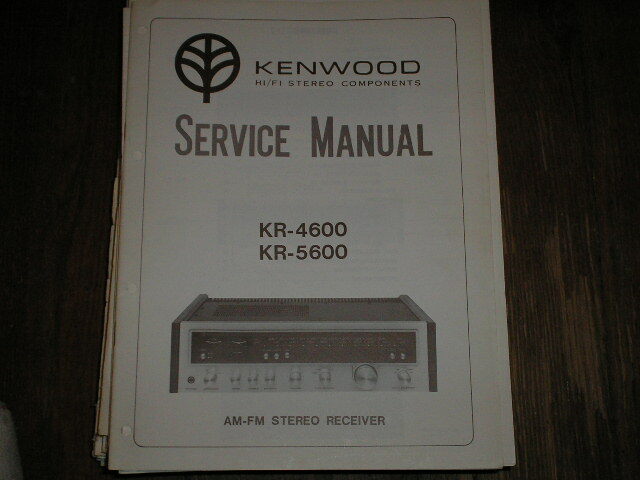 Manual KenwoodKR-4600 KR-5600 Receiver Service Manual PHOTO COPY! 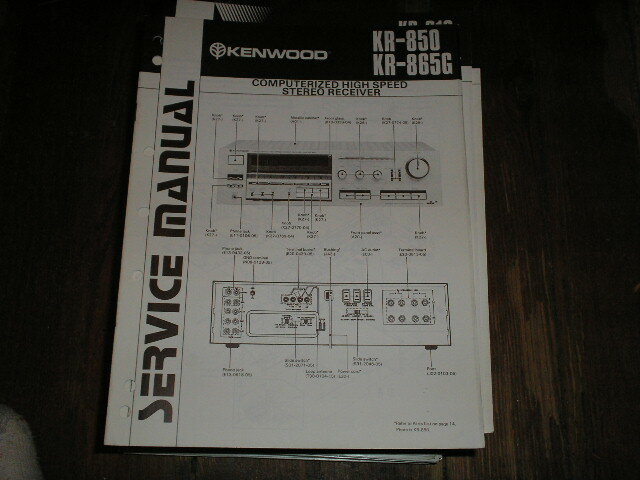 Manual KenwoodKR-5030_KR-5330 Receiver Service Manual PHOTO COPY! 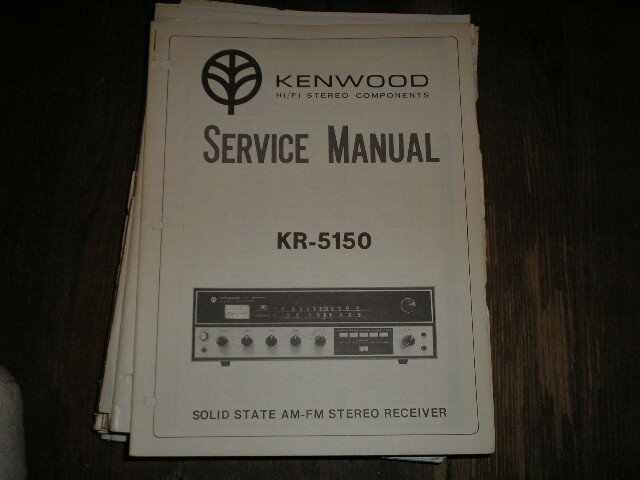 Manual KenwoodKR-5150 Receiver Service Manual PHOTO COPY! 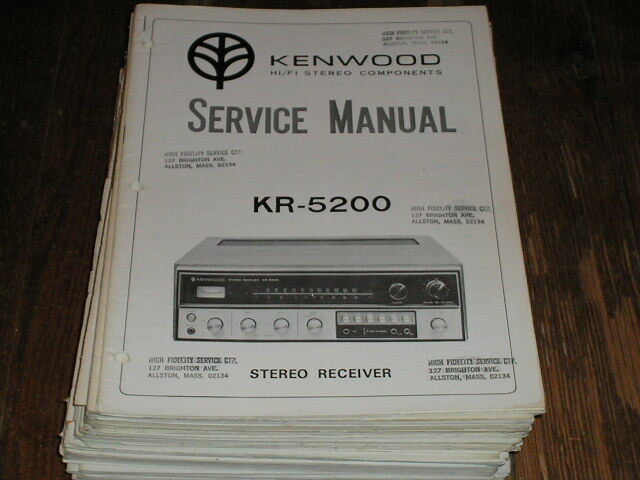 Manual KenwoodKR-5200 Receiver Service Manual PHOTO COPY! 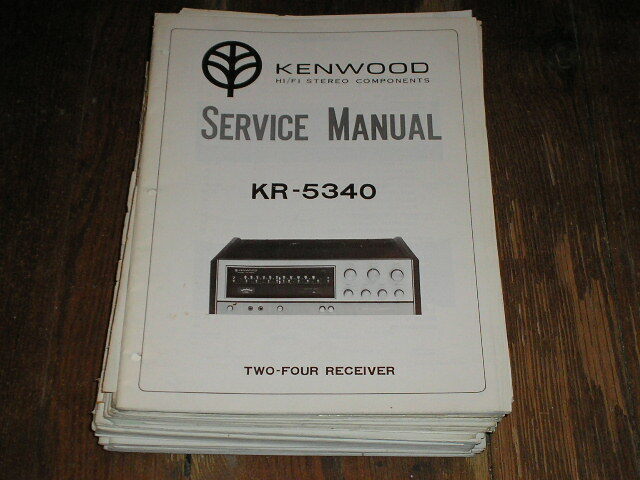 Manual KenwoodKR-5340 Receiver Service Manual PHOTO COPY! Manual KenwoodKR-5400 KR-6400 Receiver Service Manual PHOTO COPY! 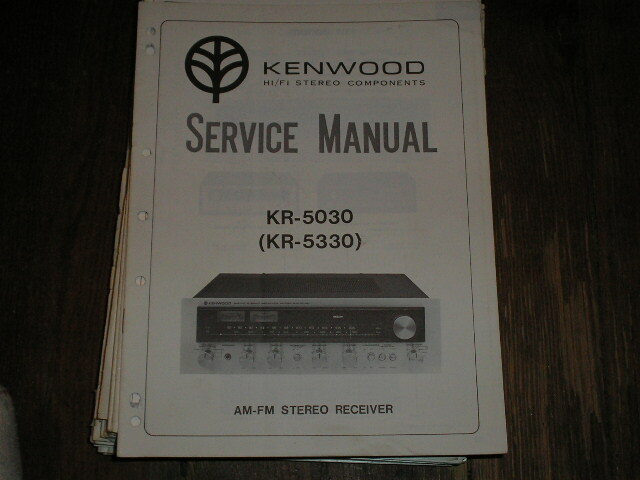 Manual KenwoodKR-5510 KR-4010 KR-5010 Receiver Service Manual PHOTO COPY! 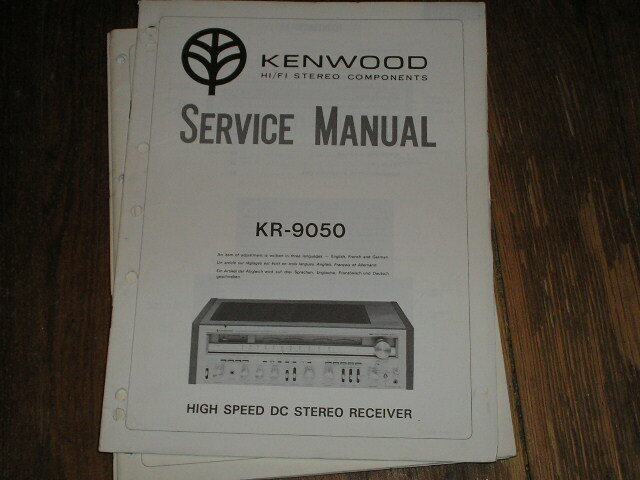 Manual KenwoodKR-6030 KR-6300 Receiver Service Manual PHOTO COPY! 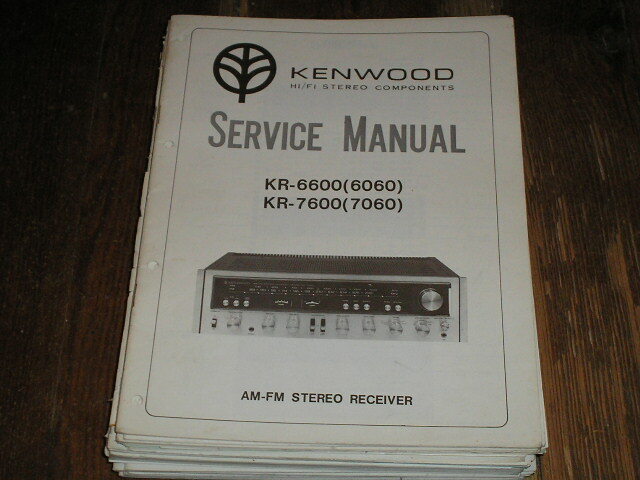 Manual KenwoodKR-6060 KR-6600 KR-7060 KR-7600 Receiver Service Manual PHOTO COPY! 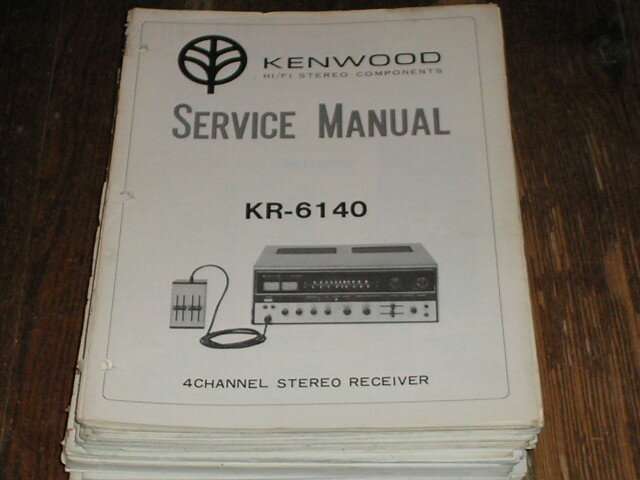 Manual KenwoodKR-6140 Receiver Service Manual PHOTO COPY! 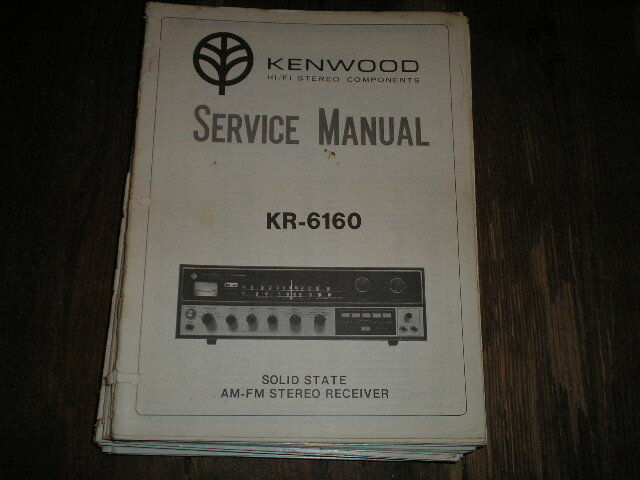 Manual KenwoodKR-6160 Receiver Service Manual PHOTO COPY! 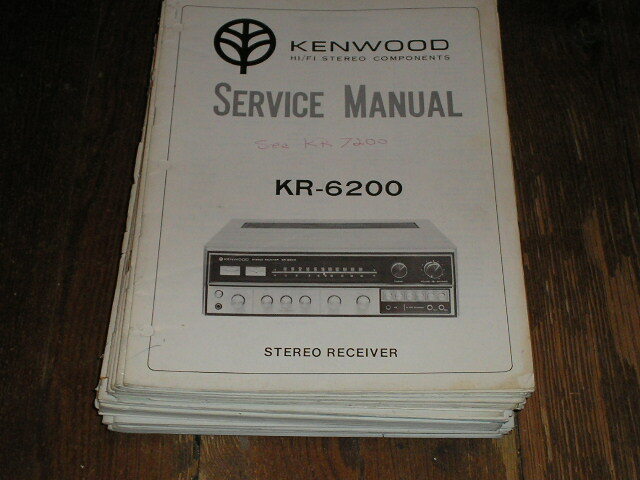 Manual KenwoodKR-6200 Receiver Service Manual PHOTO COPY! 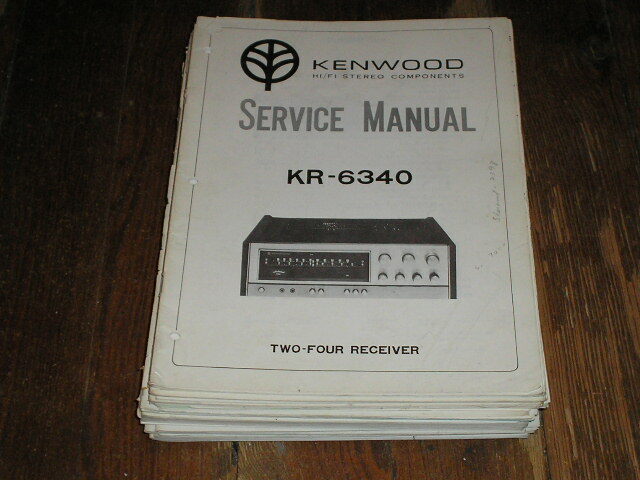 Manual KenwoodKR-6340 Receiver Service Manual PHOTO COPY! 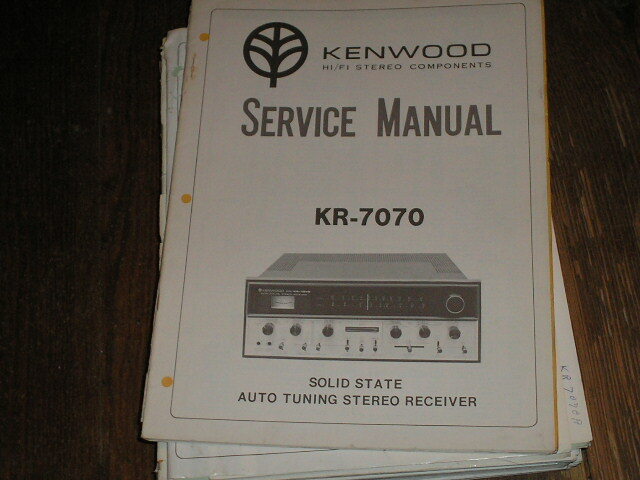 Manual KenwoodKR-7070 Receiver Service Manual PHOTO COPY! 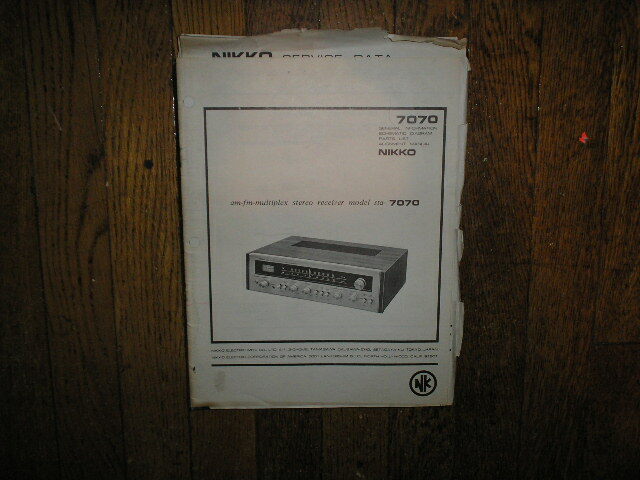 Manual KenwoodKR-7070A Receiver Service Manual PHOTO COPY! 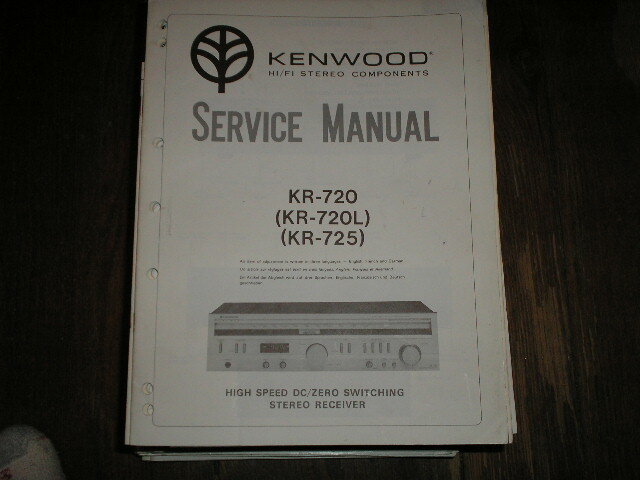 Manual KenwoodKR-7200 Receiver Service Manual PHOTO COPY! 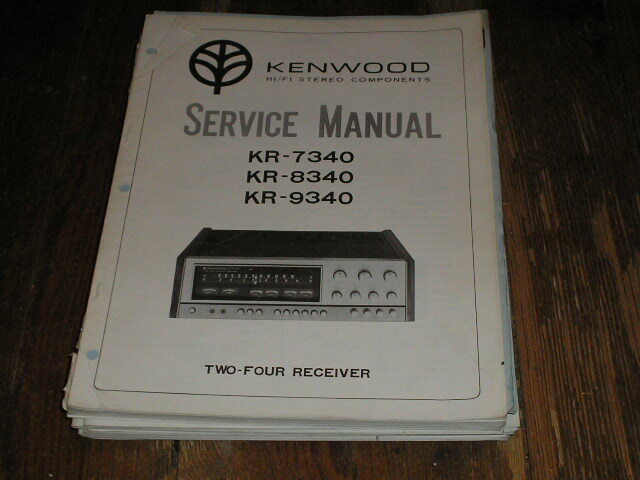 Manual KenwoodKR-7340 KR-8340 KR-9340 Receiver Service Manual PHOTO COPY! 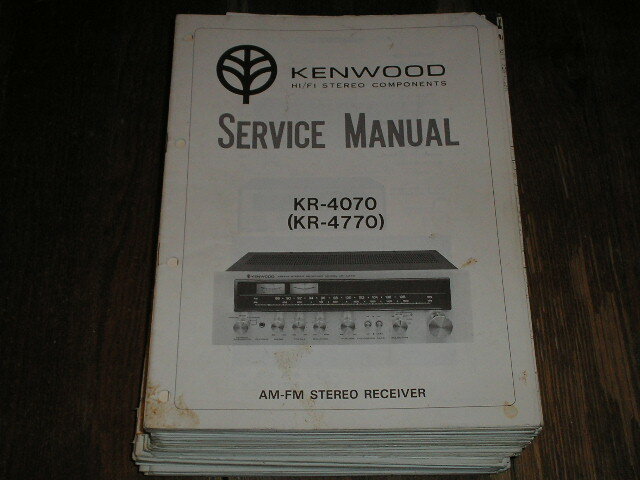 Manual KenwoodKR-7400 Receiver Service Manual PHOTO COPY! 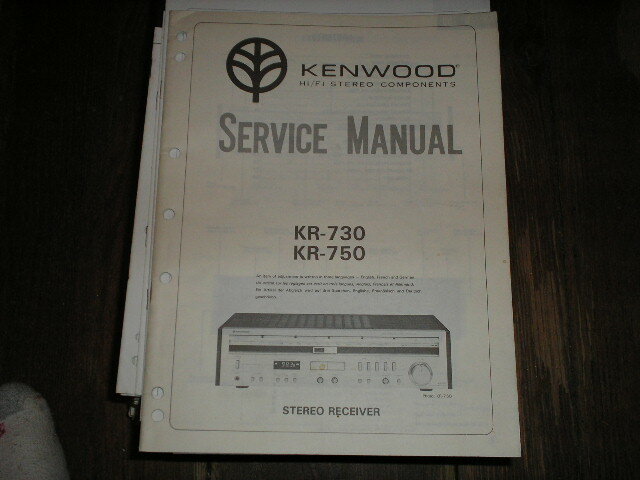 Manual KenwoodKR-7600 KR-6060 KR-6600 KR-7060 Receiver Service Manual PHOTO COPY! 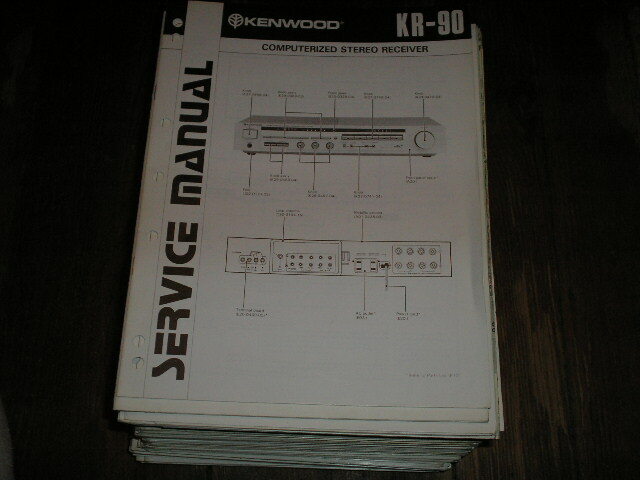 Manual KenwoodKR-8010 KR-8110 Receiver Service Manual PHOTO COPY! 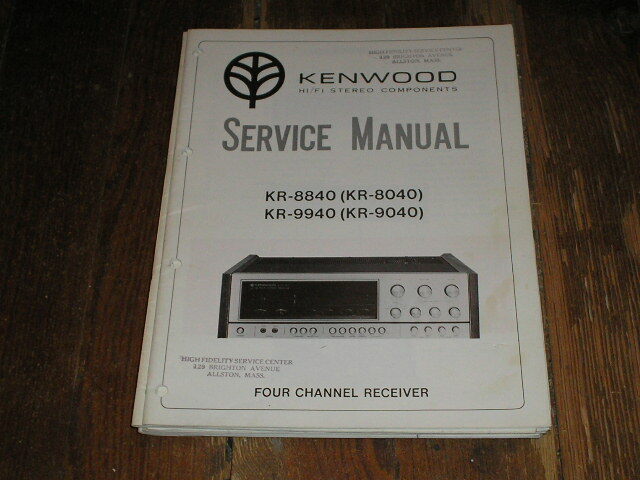 Manual KenwoodKR-8040 KR-8840 KR-9040 KR-9940 Receiver Service Manual PHOTO COPY! 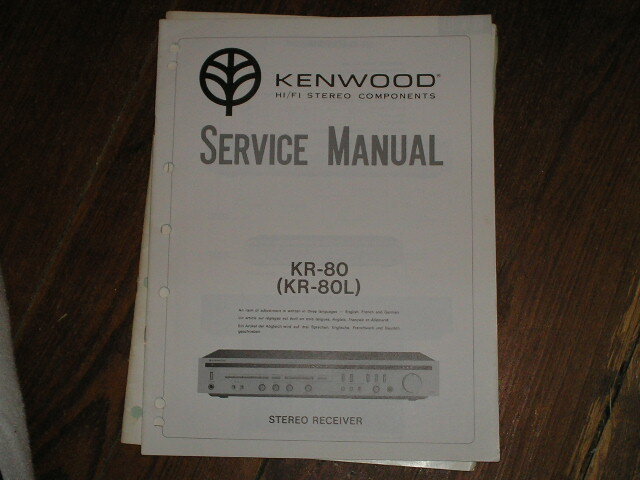 Manual KenwoodKR-8050 KR-8850 Receiver Service Manual PHOTO COPY! 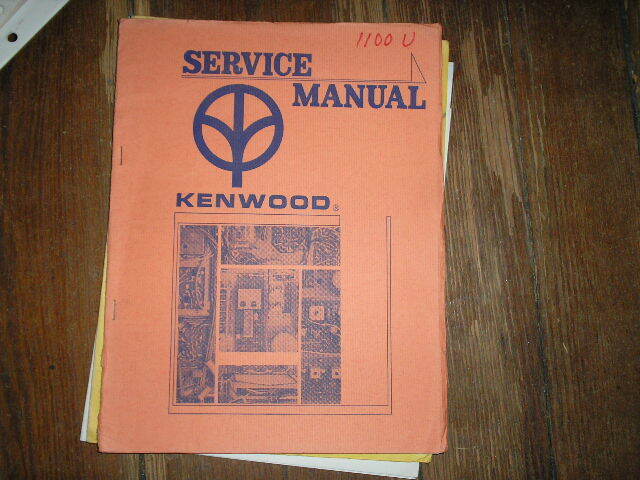 Manual KenwoodKR-8340 KR-7340 KR-9340 Service Manual PHOTO COPY! 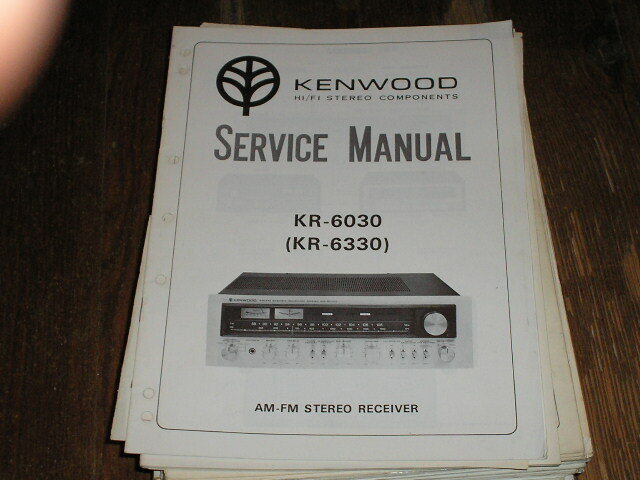 Manual KenwoodKR-9050 Receiver Service Manual PHOTO COPY! 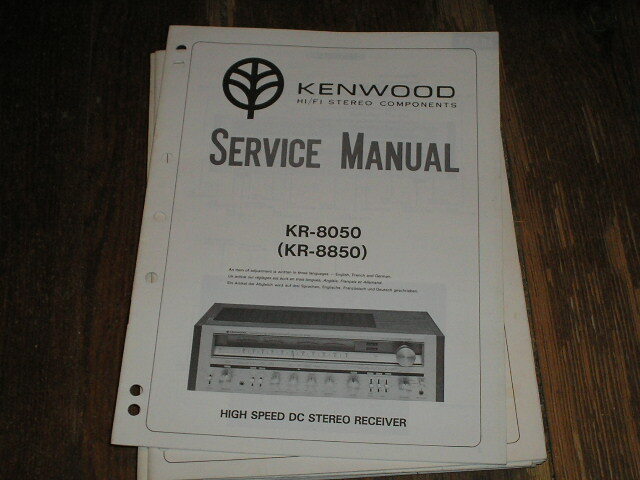 Manual KenwoodKR-9060 KR-9600 Service Manual PHOTO COPY! Manual KenwoodKR-9340 KR-7340 KR-8340 Manual PHOTO COPY! Manual KenwoodKR-9600 KR-9060 Receiver Service Manual and 6 page protection circuit service bulletin.. PHOTO COPY! 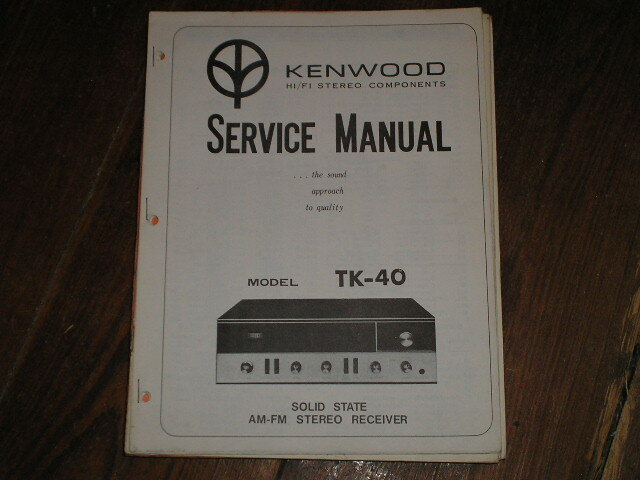 Manual KenwoodTK-40 Receiver Service Manual PHOTO COPY! 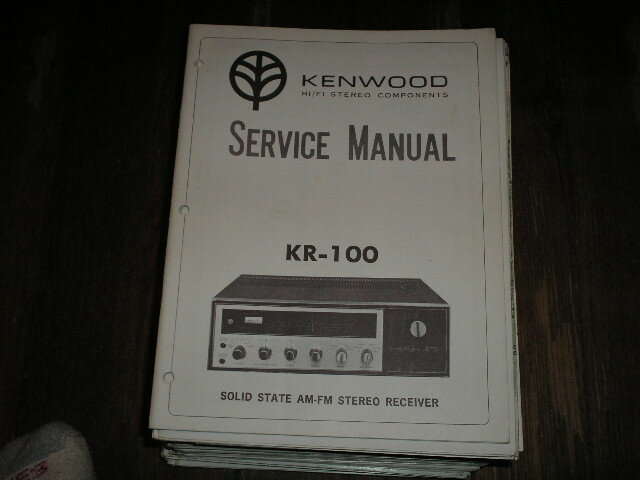 Manual KenwoodKW-1100U Receiver Service Manual PHOTO COPY! 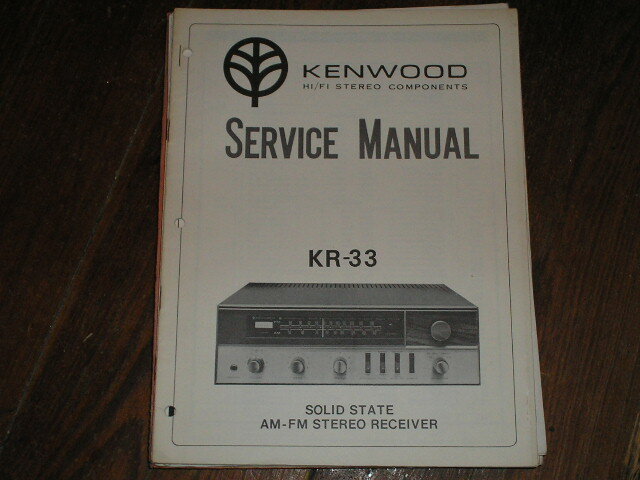 Manual Kenwood KW-33 Receiver Service Manual PHOTO COPY! Manual Kenwood KR-2600 Receiver Instruction Manual PHOTO COPY! 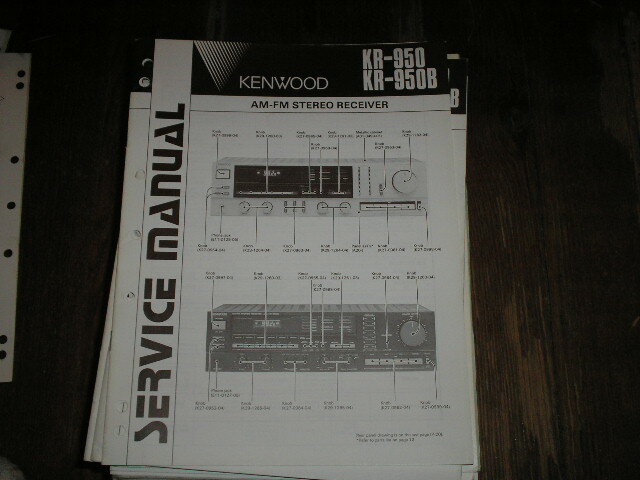 Manual Kenwood KW-55AU Receiver Service Manual PHOTO COPY! 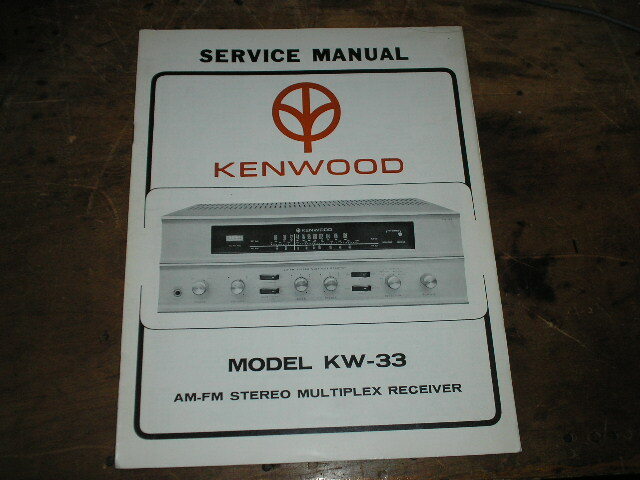 Manual KenwoodKW-30 AM FM Stereo Multiplex Receiver Owners Operating Instruction Manual with schematic only. PHOTO COPY! 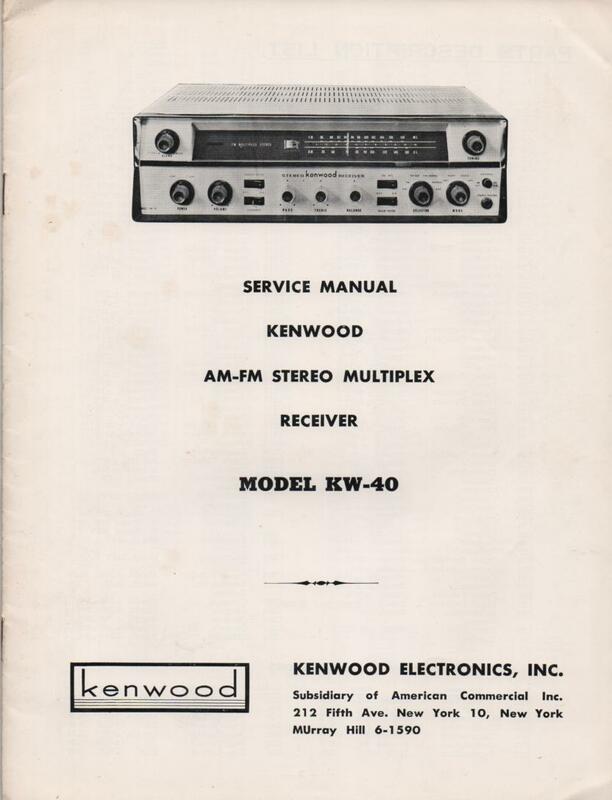 Manual KenwoodKW-40 AM FM Stereo Multiplex Receiver Owners Operating Instruction Service Manual PHOTO COPY! 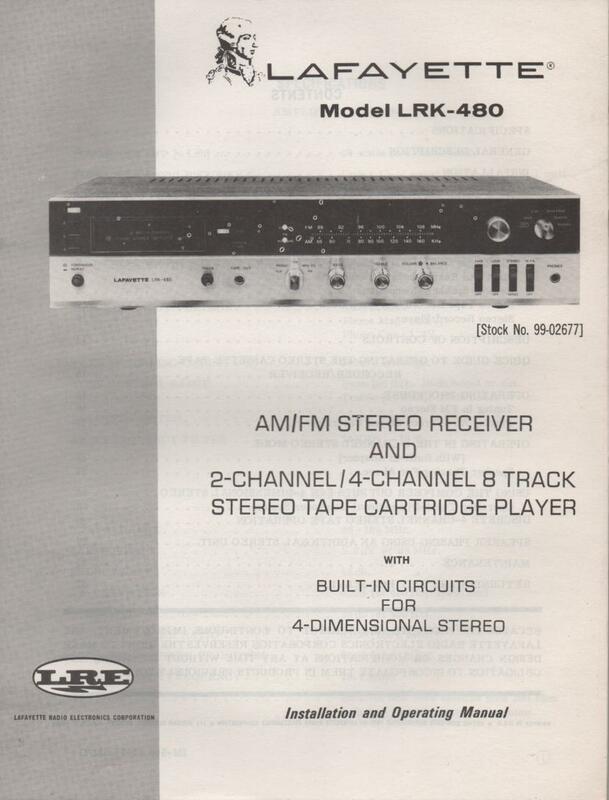 Manual KenwoodKW-40 AM FM Stereo Multiplex Receiver Manual. Complete service manual with parts list, schematics, alignments, dial cord stringing, schematics.. PHOTO COPY! Manual KenwoodKW-40 AM FM Stereo Multiplex Receiver Mounting Template... Large foldout photocopy.. PHOTO COPY! 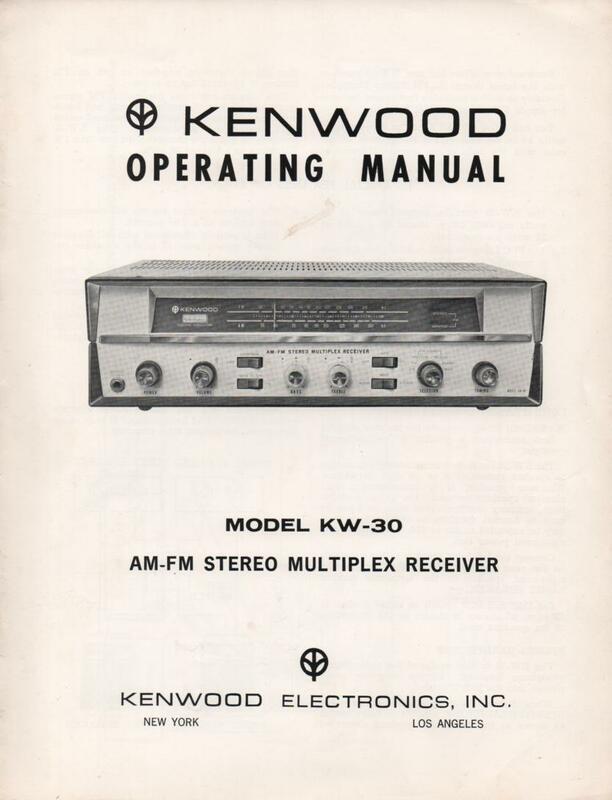 Manual KenwoodKW-50 AM FM Stereo Multiplex Receiver Owners Operating Instruction Manual with schematic only. PHOTO COPY! 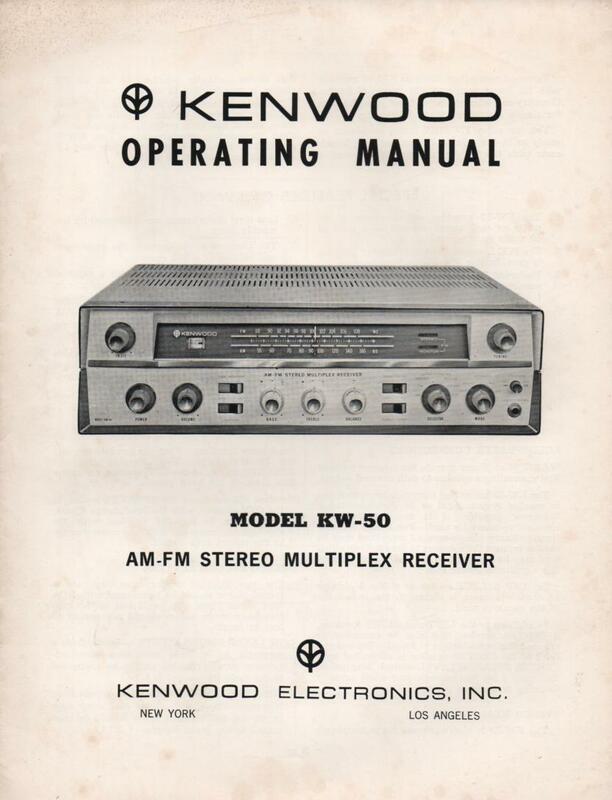 Manual KenwoodKW-60 AM FM Stereo Multiplex Receiver Owners Operating Instruction Manual with schematic only. PHOTO COPY! 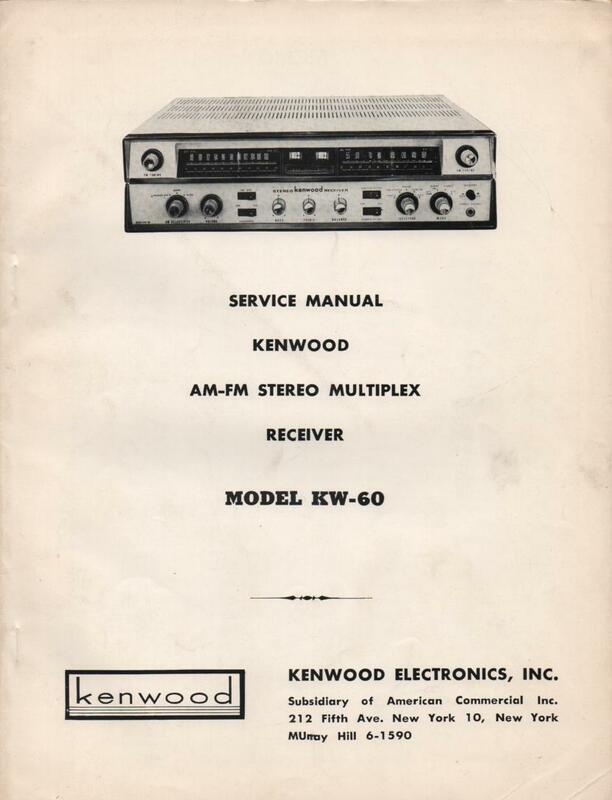 Manual KenwoodKW-60 AM FM Stereo Multiplex Receiver Manual. Complete service manual with parts list, schematics, alignments, dial cord stringing, schematics.. PHOTO COPY! 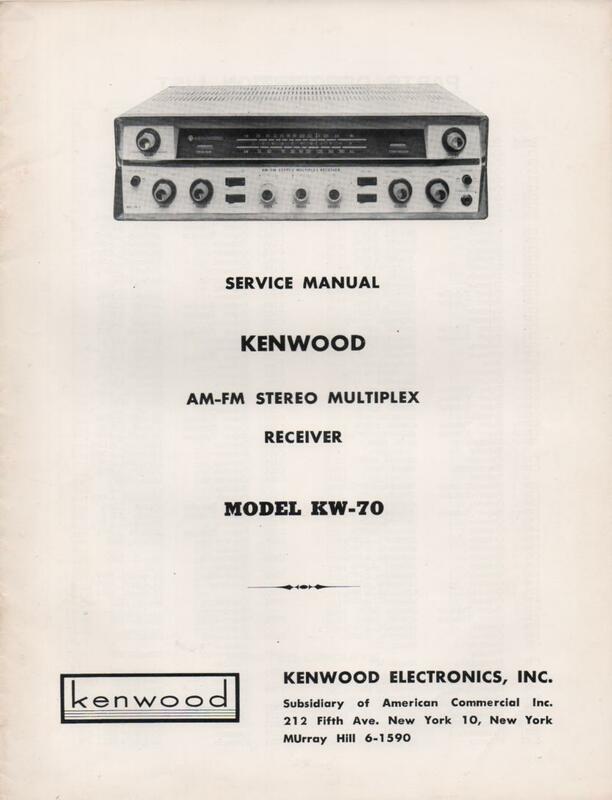 Manual KenwoodKW-70 AM FM Stereo Multiplex Receiver Owners Operating Instruction Manual with schematic only. PHOTO COPY! 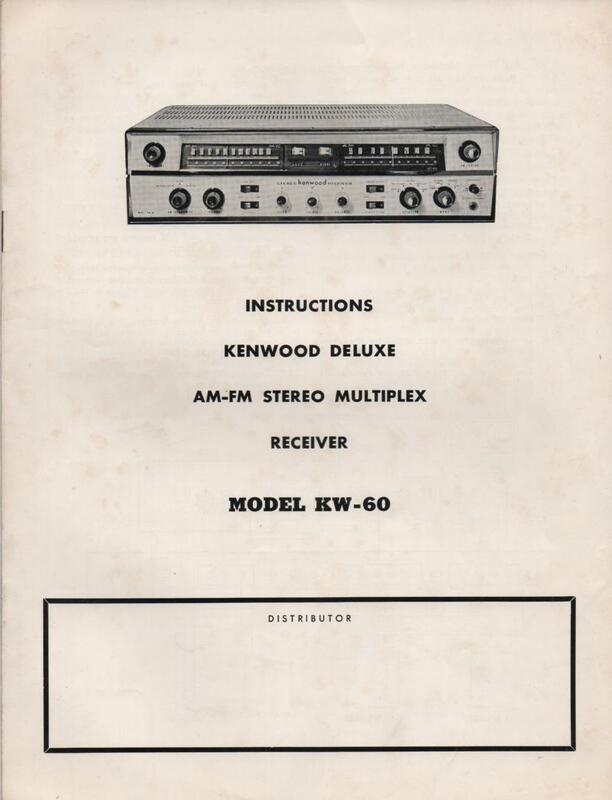 Manual KenwoodKW-70 AM FM Stereo Multiplex Receiver Manual. Complete service manual with parts list, schematics, alignments, dial cord stringing, schematics.. PHOTO COPY! 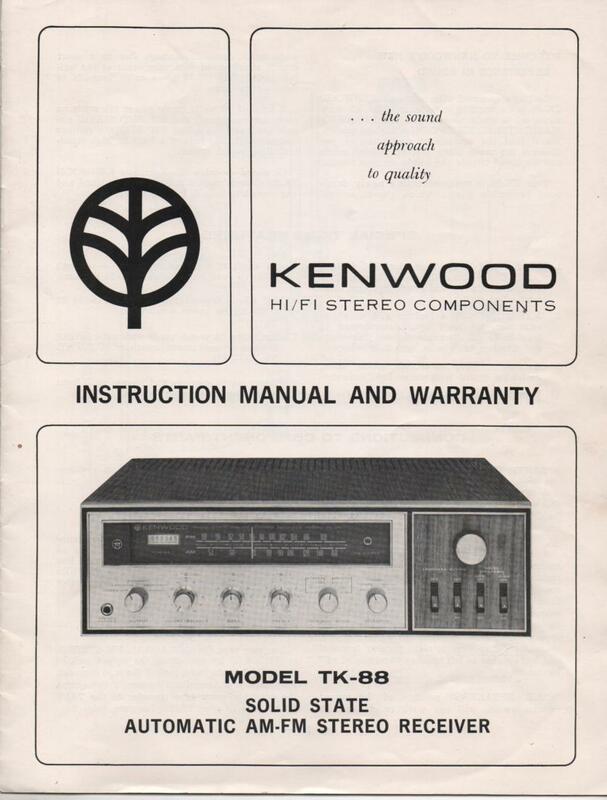 Manual Kenwood TK-88 Receiver Owners Manual with schematic PHOTO COPY! 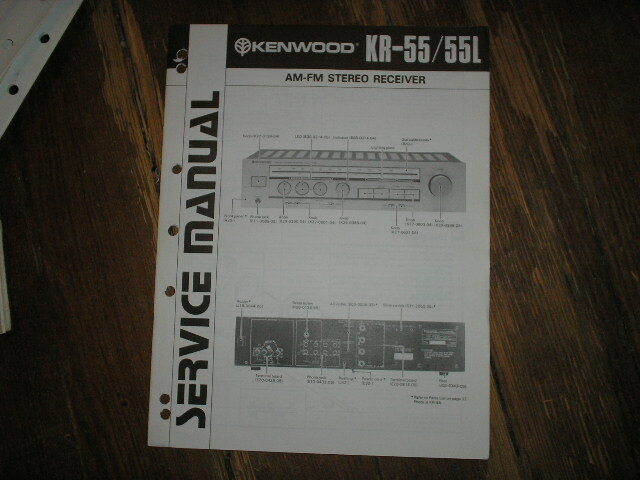 Manual KLH55 Receiver Service Manual PHOTO COPY! 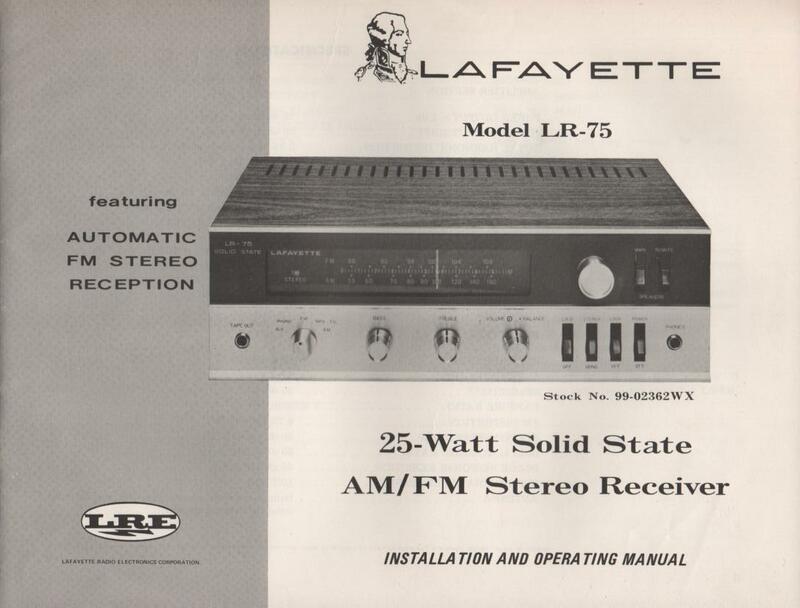 Manual LAFAYETTELR-75 Receiver Owners Service Manual. Owners manual with 2 large foldouts. 1 foldout is the schematic. Stock No. 99-02362WX . PHOTO COPY! 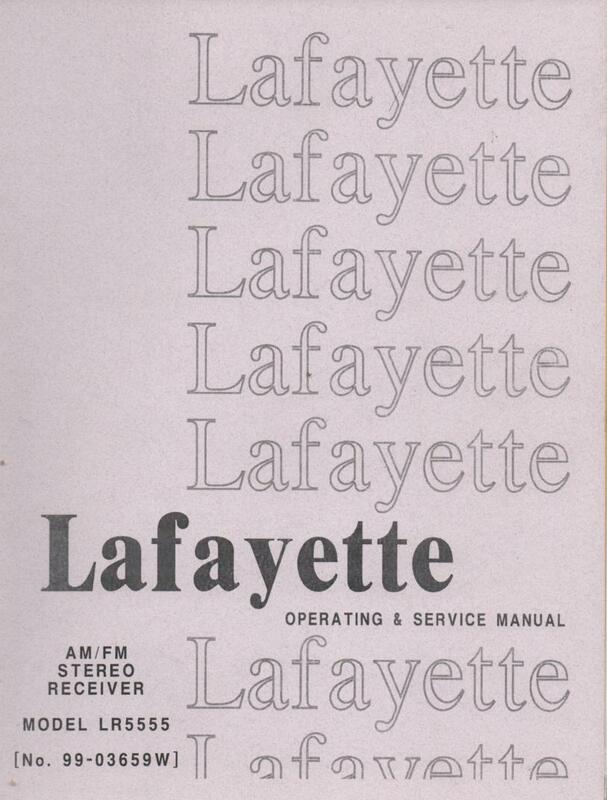 Manual LAFAYETTELR-75A Receiver Owners Service Manual. Owners manual with 2 large foldouts. 1 foldout is the schematic. Stock No. 99-02545W . PHOTO COPY! 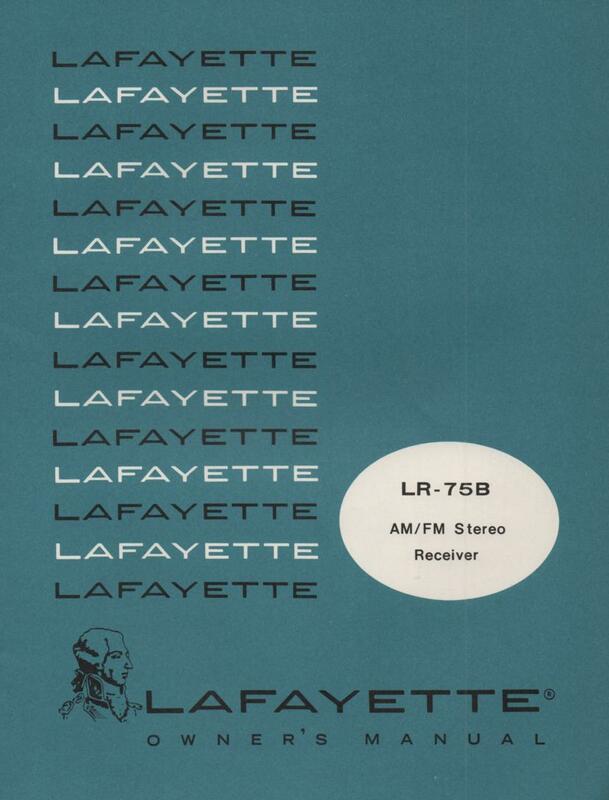 Manual LAFAYETTELR-75B Receiver Owners Service Manual. Owners manual with A schematic. Stock No. 99-03014W . PHOTO COPY! 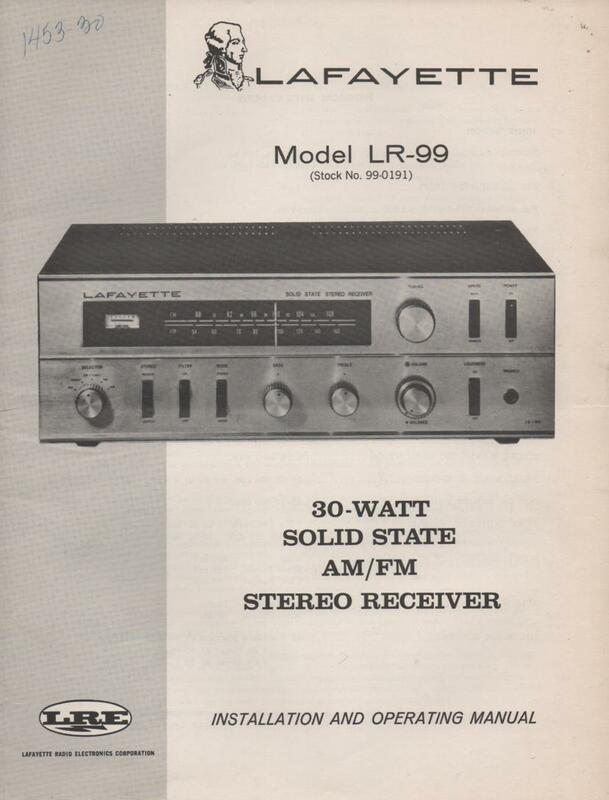 Manual LAFAYETTELR-99 Receiver Owners Service Manual. Owners manual with a Large foldout schematic. Stock No. 99-0191 . PHOTO COPY! 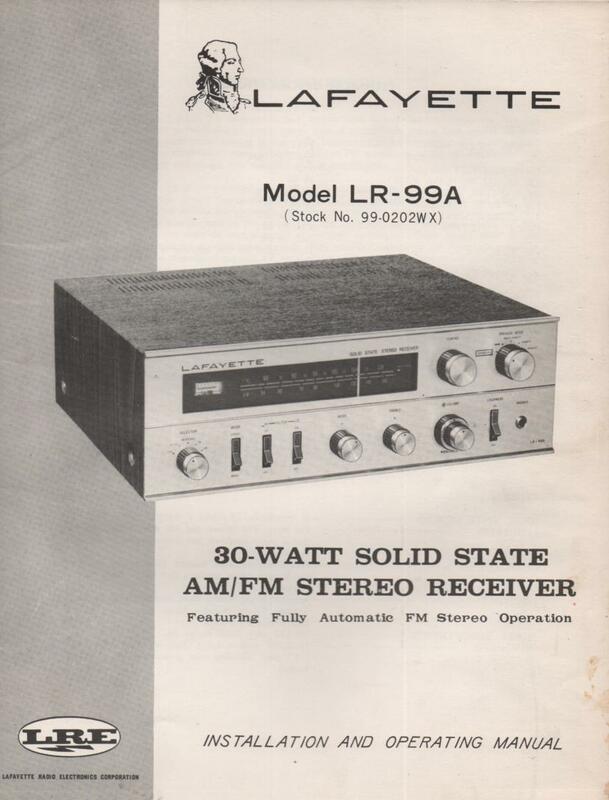 Manual LAFAYETTELR-99A Receiver Owners Service Manual. Owners manual with a Large foldout schematic. Stock No. 99-0202WX . PHOTO COPY! Manual LAFAYETTELR-200A Receiver Owners Service Manual. Owners manual with schematic.. Stock No. 99-03105W . PHOTO COPY! 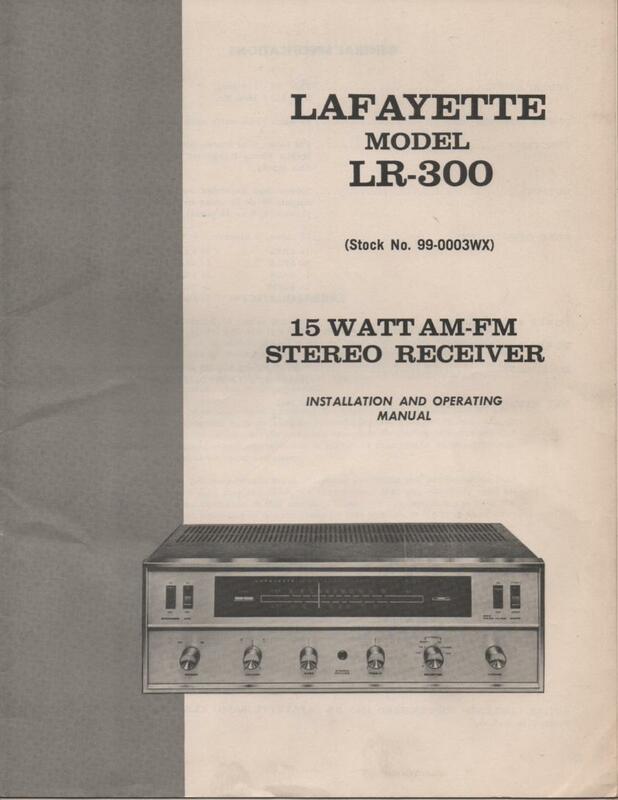 Manual LAFAYETTELR-300 Receiver Owners Service Manual. Owners manual with large foldout schematic. Stock No. 99-0003WX . PHOTO COPY! 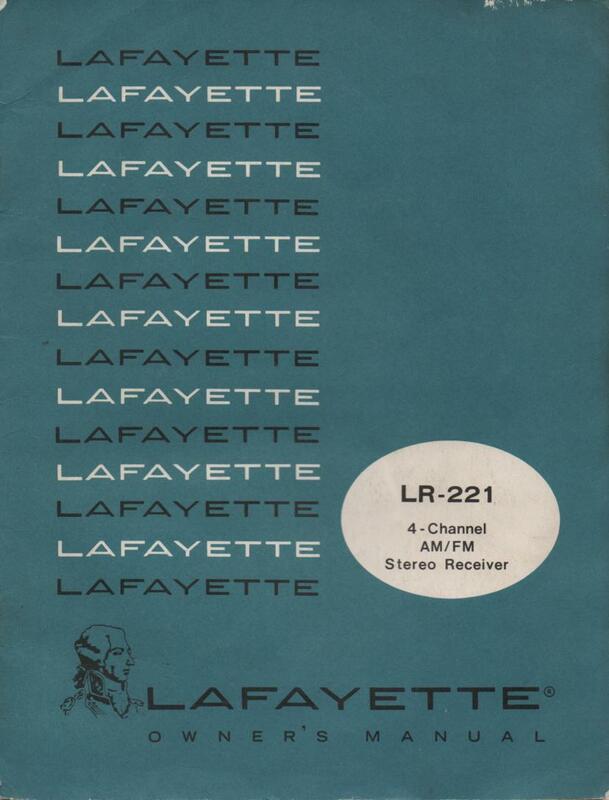 Manual LAFAYETTELR-440 Receiver Owners Manual with large foldouts and schematic. Stock No. 99-02644W . PHOTO COPY! 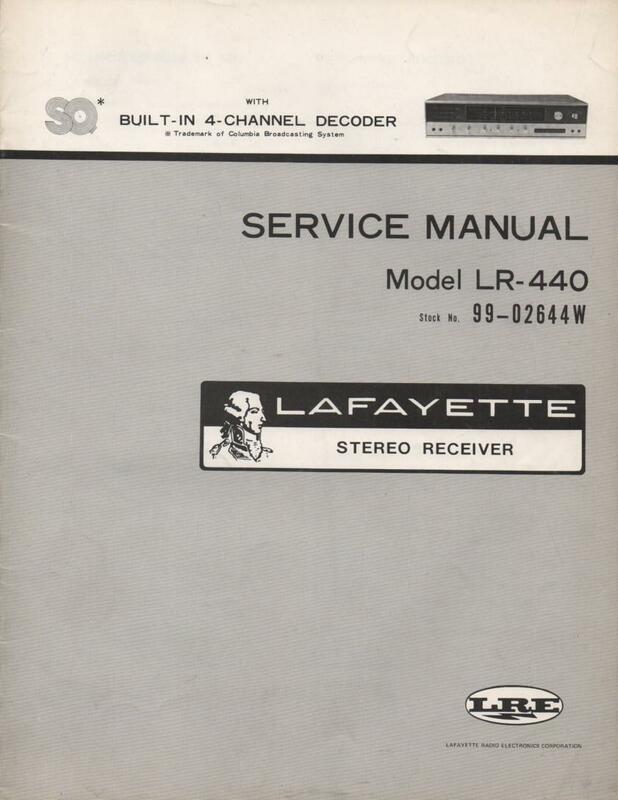 Manual LAFAYETTELR-440 Receiver Service Manual with large foldouts and schematic. Stock No. 99-02644W . PHOTO COPY! 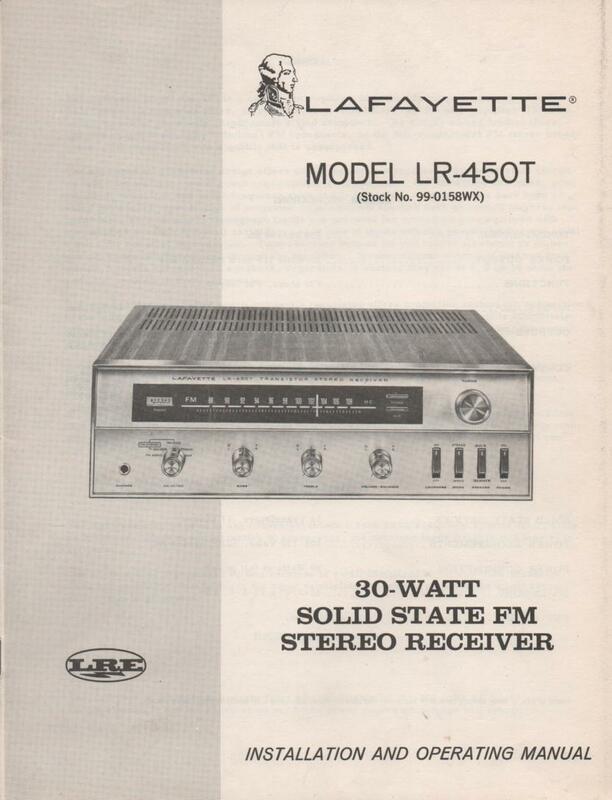 Manual LAFAYETTELR-450T Receiver Owners Service Manual. Owners manual with schematic. Stock No. 99-0158WX . PHOTO COPY! 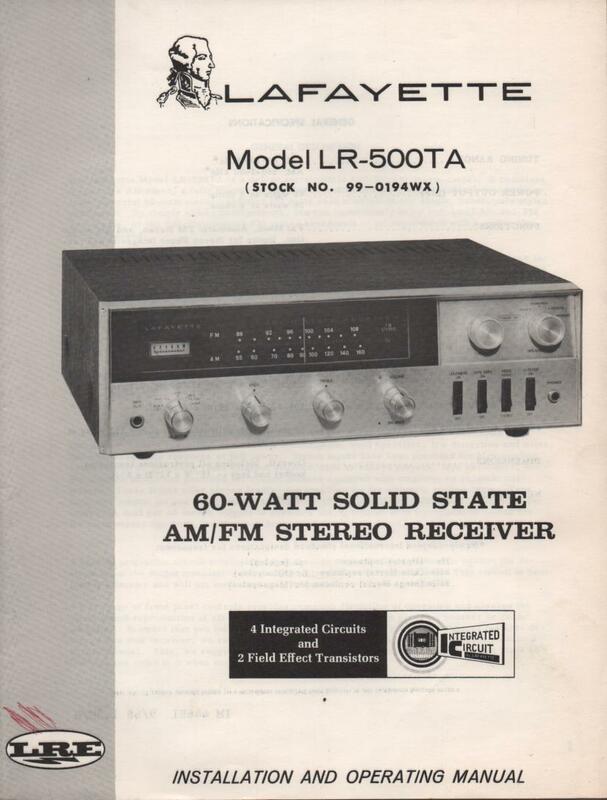 Manual LAFAYETTELR-500TA Receiver Owners Service Manual. Owners manual with schematic PHOTO COPY! 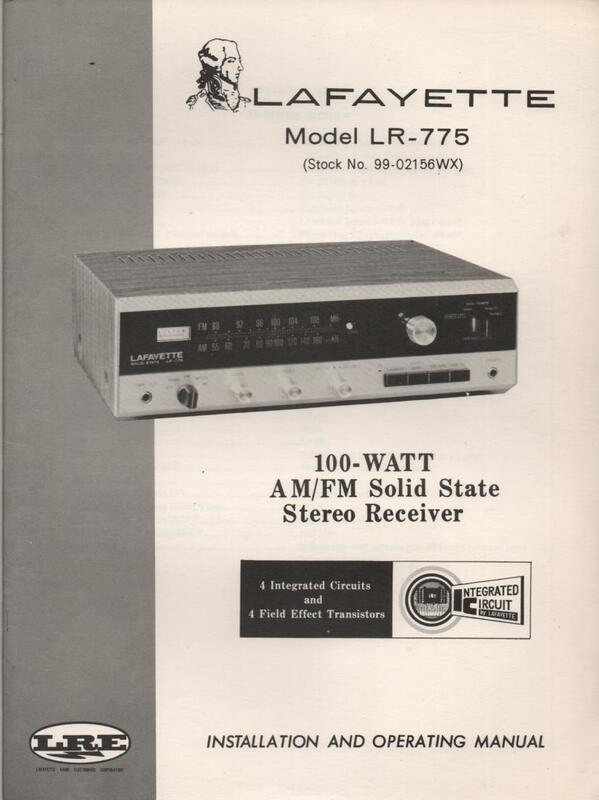 Manual LAFAYETTELR-775 Receiver Ownrrs Service Manual. Owners manual with schematic... PHOTO COPY! 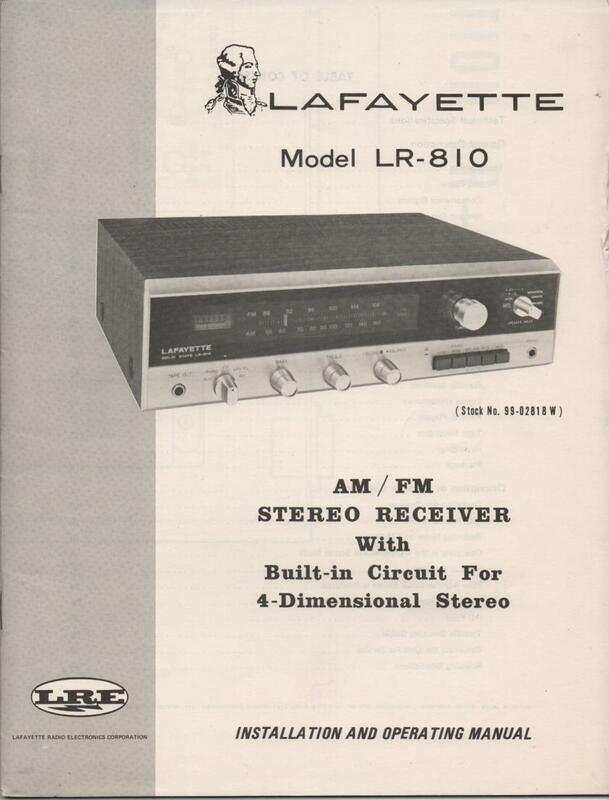 Manual LAFAYETTELR-810 Receiver Owners Service Manual. Owners manual with schematic.. Stock No. 99-02818W . PHOTO COPY! 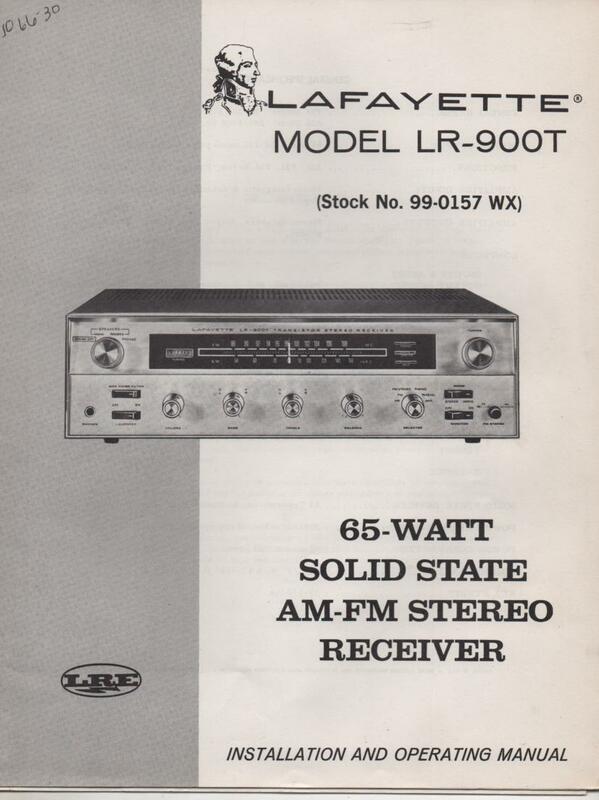 Manual LAFAYETTELR-900T Receiver Owners Service Manual. Owners manual with schematic. Stuck No. 99-0157WX . PHOTO COPY! 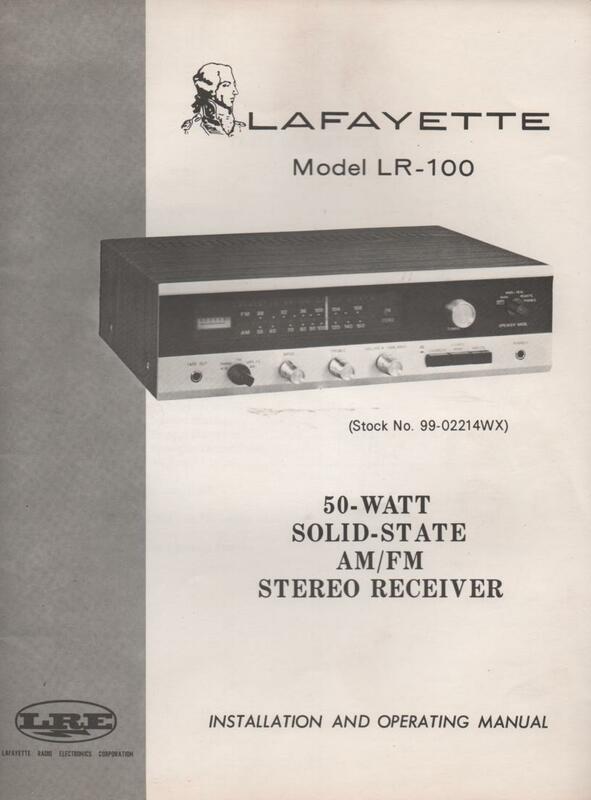 Manual LAFAYETTELR-910 Receiver Owners Service Manual. Owners manual with schematic.. PHOTO COPY! 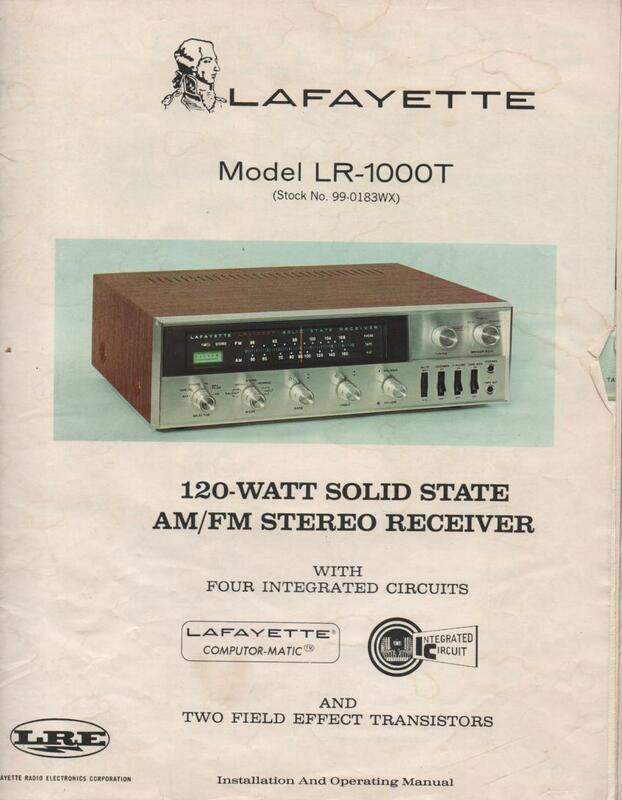 Manual LAFAYETTELR-1000t Receiver Owners Service Manual... Owners manual with schematic.. Stock No. 99-0183WX . PHOTO COPY! Manual LAFAYETTELRK-480 8-Track Receiver Owners Service Manual. Owners manual with large foldout schematic.. Stock No. 99-02677 . PHOTO COPY! 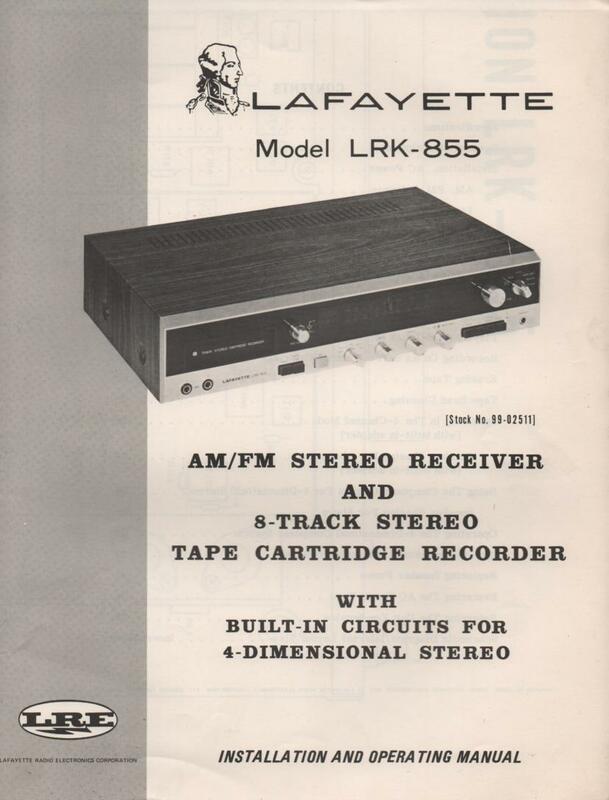 Manual LAFAYETTELRK-855 8-Track Receiver Owners Service Manual. 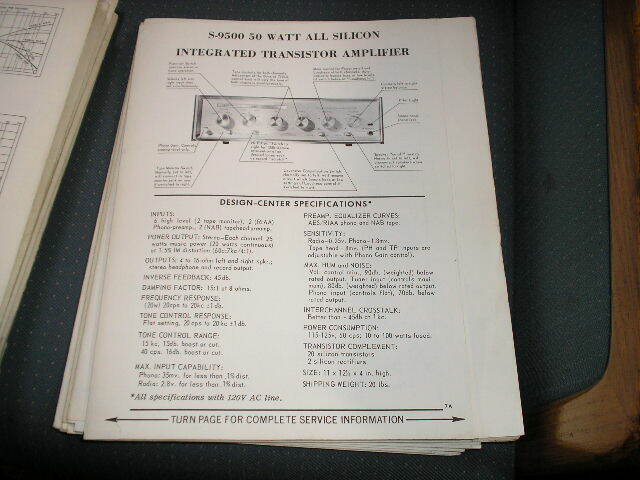 Owners manual with large foldout schematic. Stock No. 99-02511 . PHOTO COPY! Manual LAFAYETTELRK-900 8-Track Receiver Owners Service Manual. Owners manual with large foldout schematic. Stock No. 99-02529 PHOTO COPY! 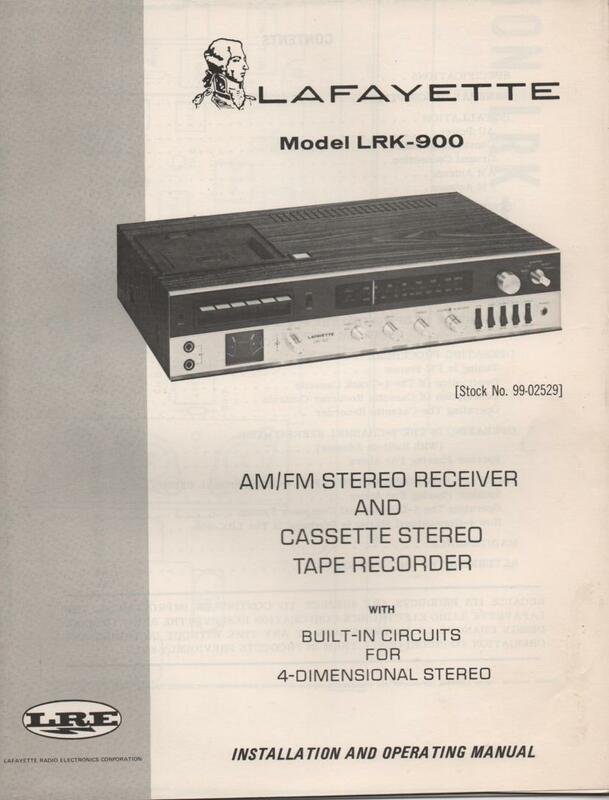 Manual LAFAYETTELRK-900A 8-Track Receiver Owners Service Manual. Owners manual with large foldout schematic. Stock No. 99-02 PHOTO COPY! 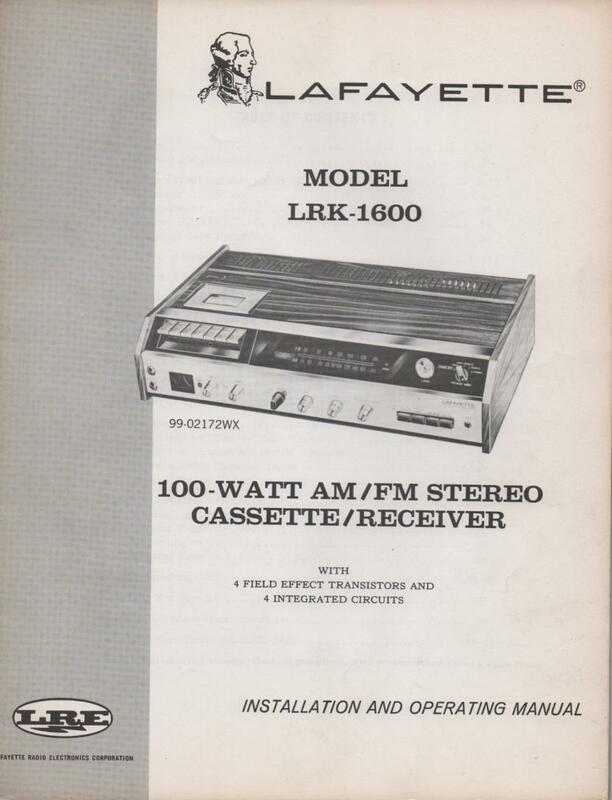 Manual LAFAYETTELRK-1600 Cassette Receiver Owners Service Manual. 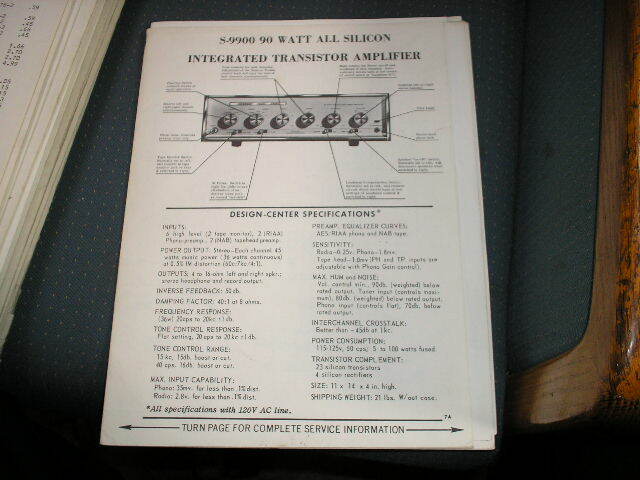 Owners manual with large foldouts and schematic. Stock No. 99-02172XW PHOTO COPY! 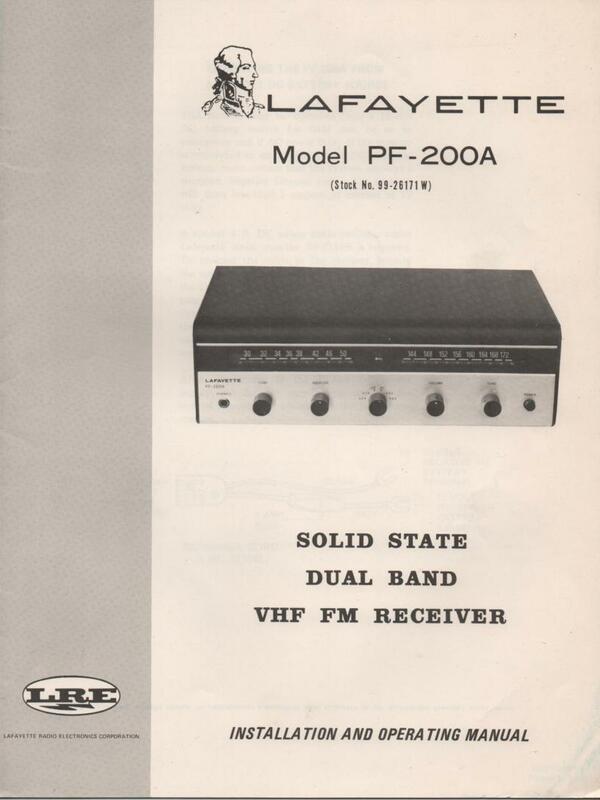 Manual LAFAYETTEPF-200 Dual Band FM Receiver Owners Service Manual. Owners manual with schematic, Stock No. 99-25983WX . PHOTO COPY! 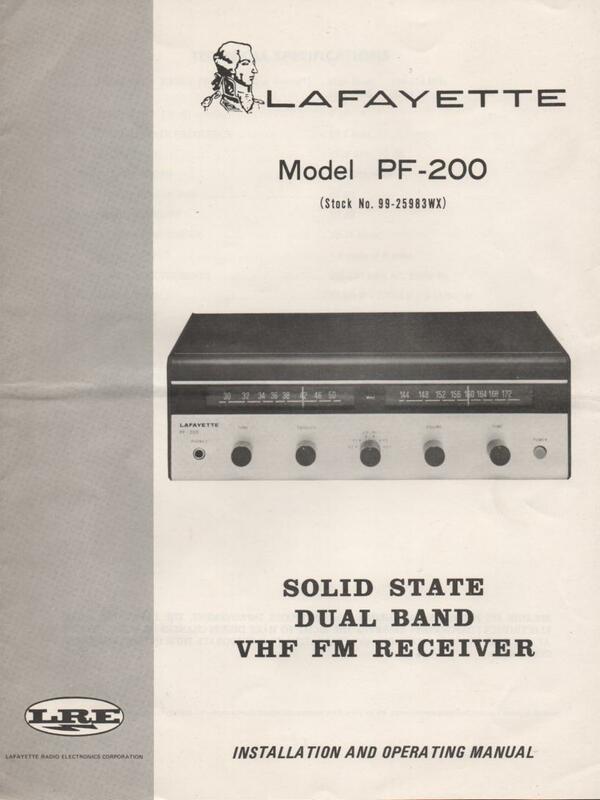 Manual LAFAYETTEPF-200A Dual Band FM Receiver Owners Service Manual. Owners manual with schematic. Stock No. 99-25983WX . PHOTO COPY! 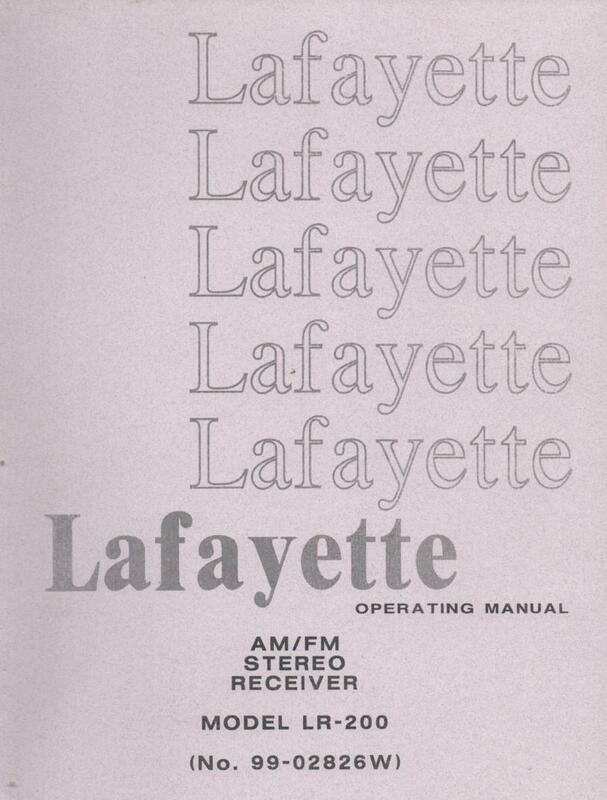 Manual LAFAYETTEPF-300 3-Band FM Receiver Owners Service Manual. Owners manual with large schematic. Stock No. 99-26163 . PHOTO COPY! Manual LAFAYETTELR-800 Receiver Service Installation Operating Manual with Schematic PHOTO COPY! Manual LAFAYETTELR-100 Receiver Owners Instruction Manual with Schematic PHOTO COPY! 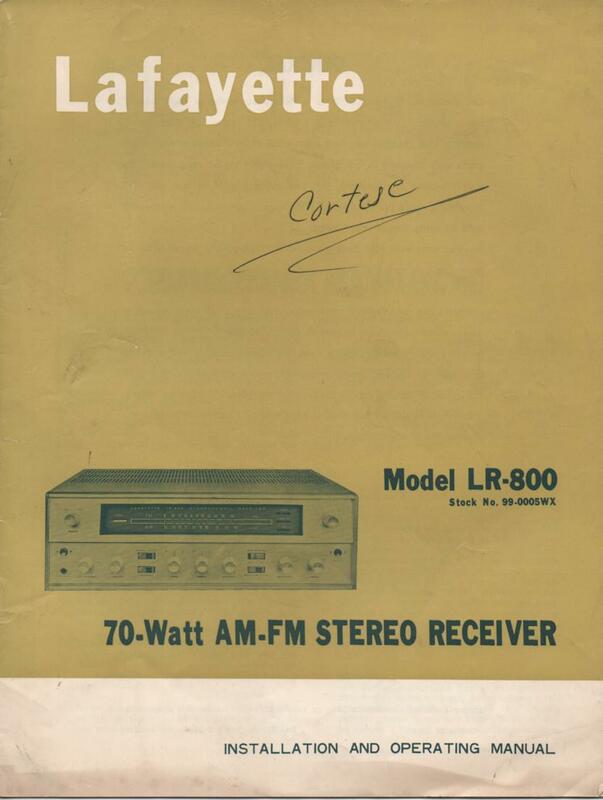 Manual LAFAYETTELR-500T 60 Watt Stereo Receiver Owners Service Manual PHOTO COPY! 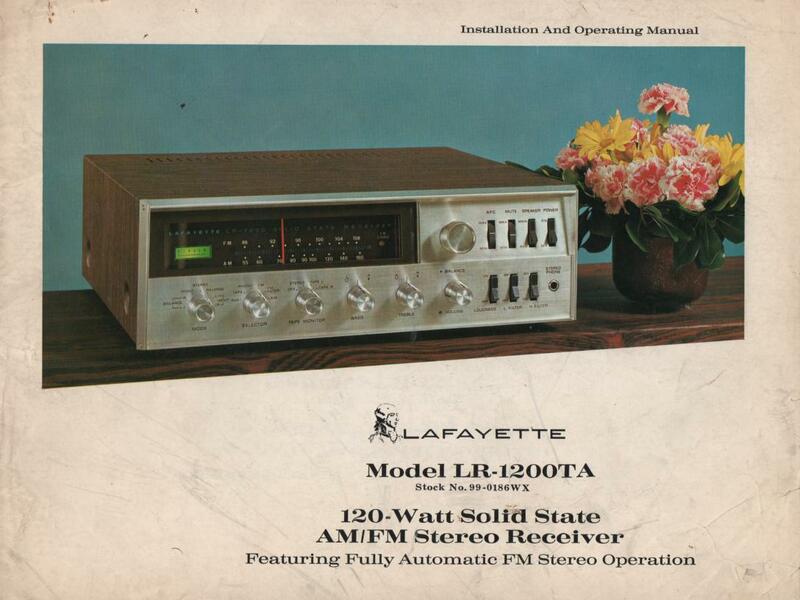 Manual LAFAYETTELR-1200TA 120 Watt Stereo Receiver Owners Service Manual. Owners manual with foldout schematic.. Stock No. 99-0186WX . PHOTO COPY! 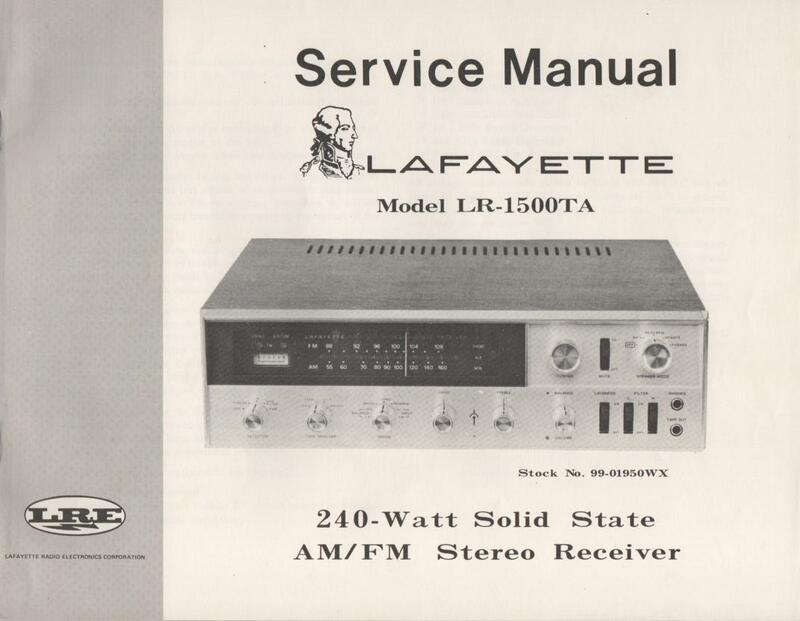 Manual LAFAYETTELR-4000 360 Watt Stereo Receiver Owners Service Manual with foldouts and schematic. PHOTO COPY! 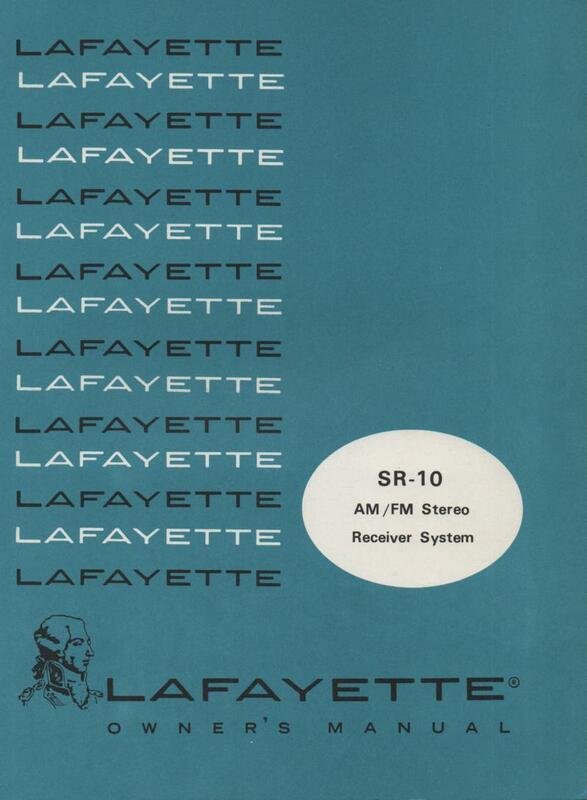 Manual LAFAYETTESR-10 Receiver Owners Service Manual PHOTO COPY! 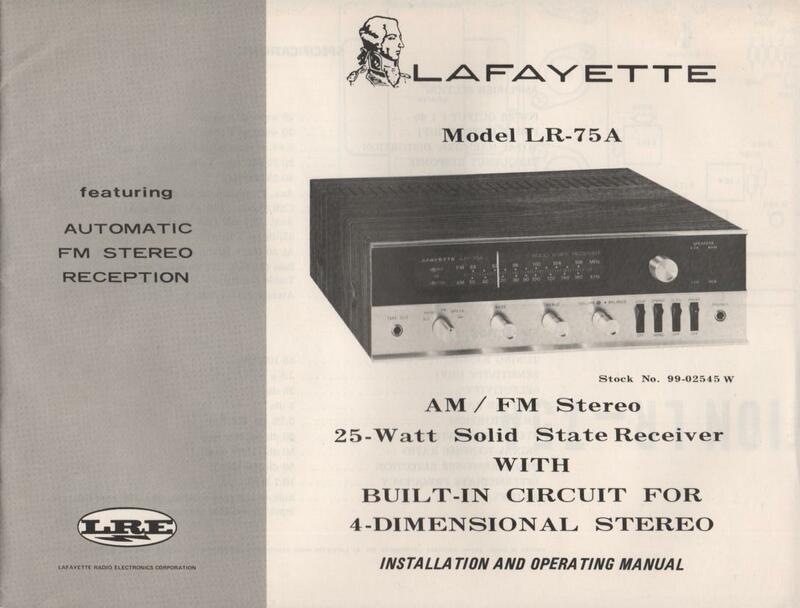 Manual LAFAYETTELR-3500 120 Watt Stereo Receiver Owners Manual PHOTO COPY! 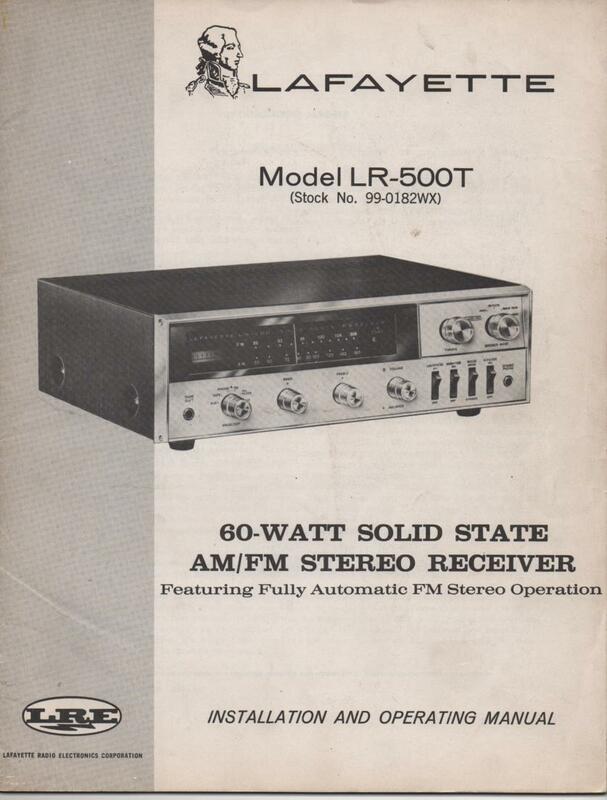 Manual LAFAYETTESR-50 Receiver Owners Service Manual. Stock No. 99-99699WM PHOTO COPY! Manual LAFAYETTELR-200 Receiver Owners Service Manual PHOTO COPY! Manual LAFAYETTELR-5555 55 Watt Stereo Receiver Owners Service Manual with foldouts. 99-03659W PHOTO COPY! Manual LAFAYETTELR-1500TA Stereo Receiver Service Manual PHOTO COPY! 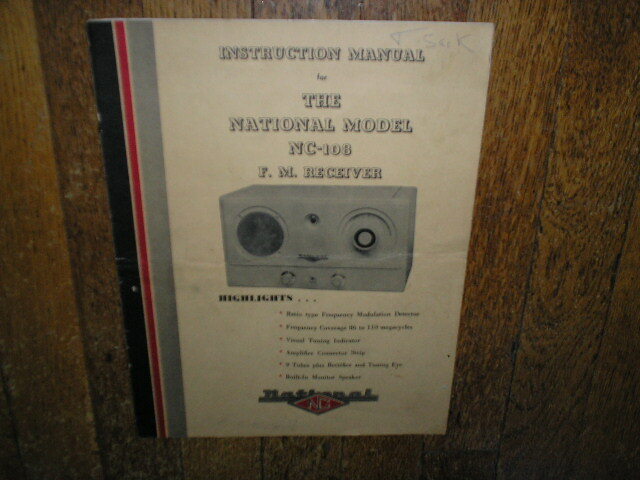 Manual LAFAYETTELR-221 Receiver Owners Service Manual.. Owners Manual with fold outs and schematic PHOTO COPY! 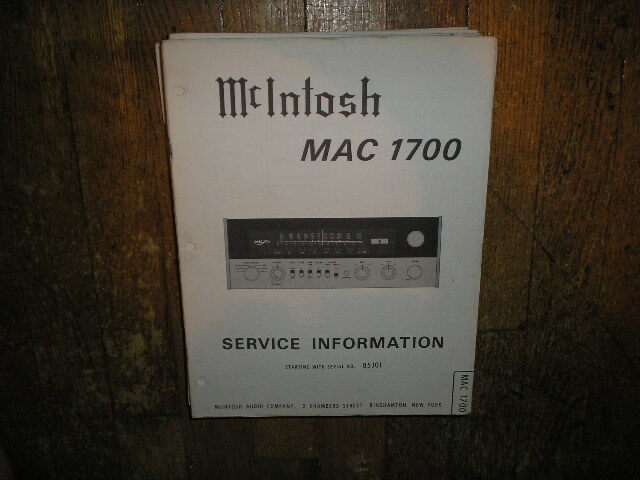 Manual McIntoshMAC 1700 Receiver Service Manual Starting with Serial No 10J01 PHOTO COPY! 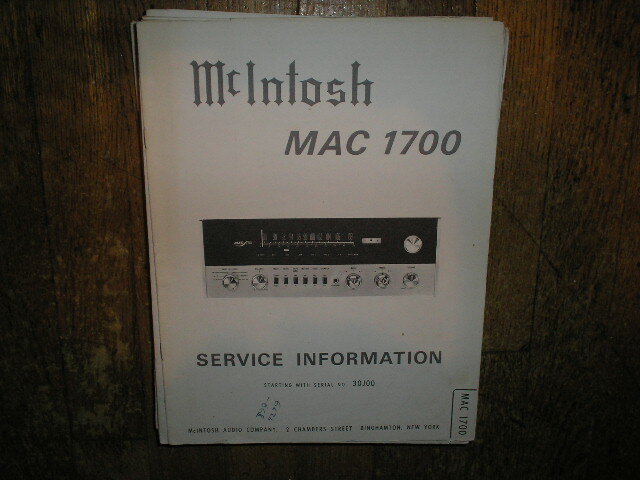 Manual McIntoshMAC 1700 Receiver Service Manual Starting with Serial No 10J01 to 85J00 PHOTO COPY! 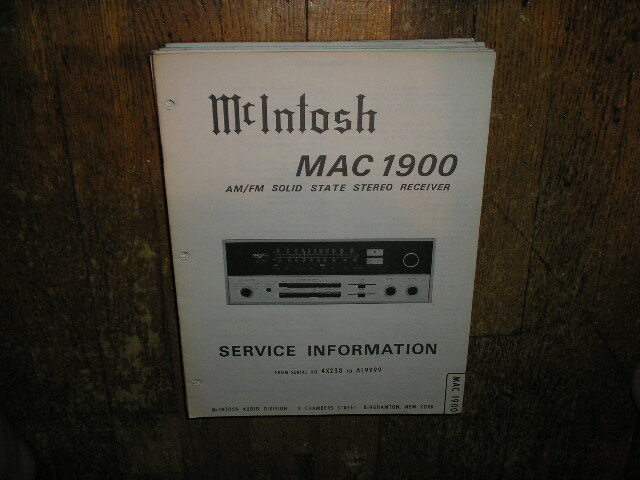 Manual McIntoshMAC 1700 Receiver Service Manual Starting with Serial No 30J00 PHOTO COPY! 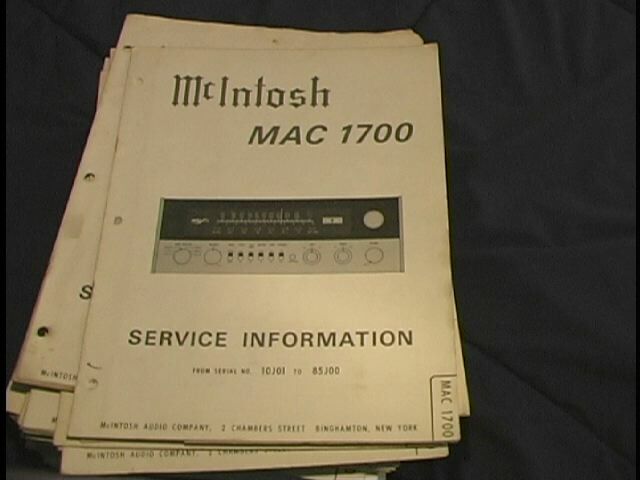 Manual McIntoshMAC 1700 Receiver Service Manual Starting with Serial No 85J01 PHOTO COPY! Manual McIntoshMAC 1900 Receiver Service Manual Starting with Serial No 4X230 PHOTO COPY! 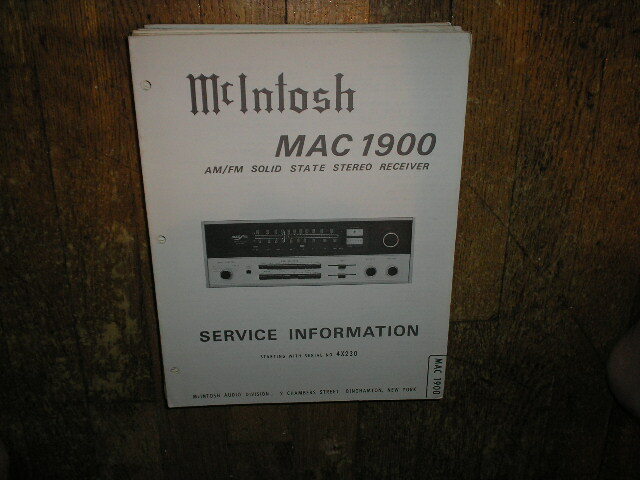 Manual McIntoshMAC 1900 Receiver Service Manual Starting with Serial No 4X230 to AL9999 PHOTO COPY! 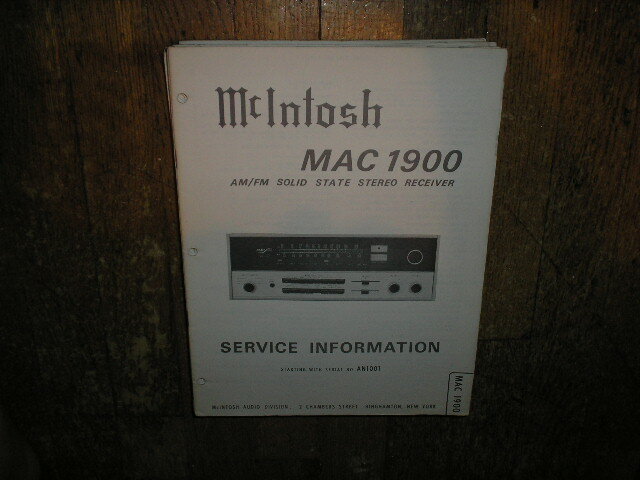 Manual McIntoshMAC 1900 Receiver Service Manual Starting with Serial No AN1001 PHOTO COPY! 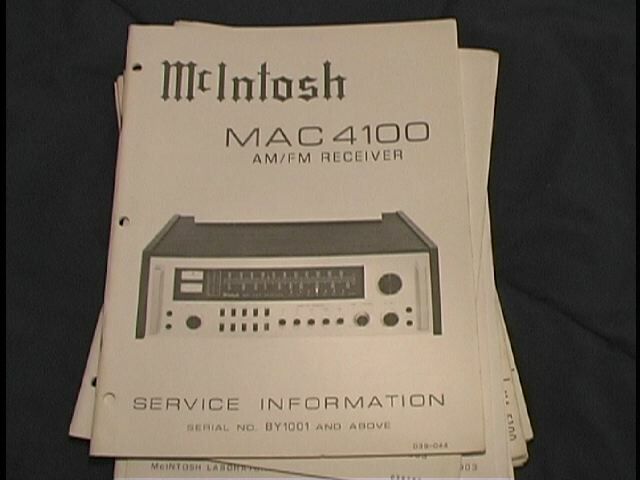 Manual McIntoshMAC 4100 Receiver Service Manual Starting with Serial No BY1001 and Above PHOTO COPY! 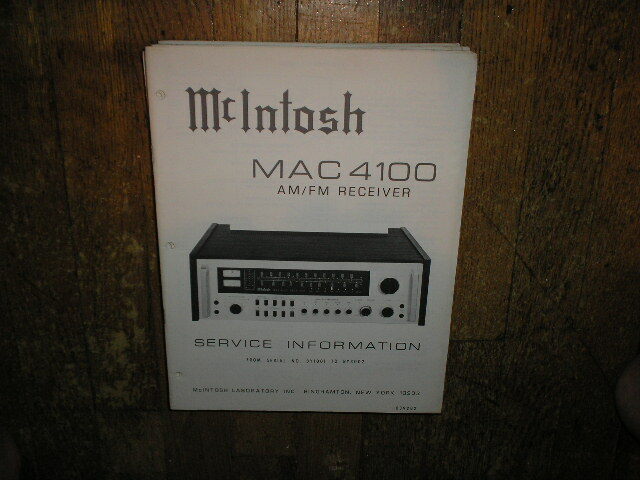 Manual McIntoshMAC 4100 Receiver Service Manual Starting with Serial No BY1001 to BY3002 PHOTO COPY! 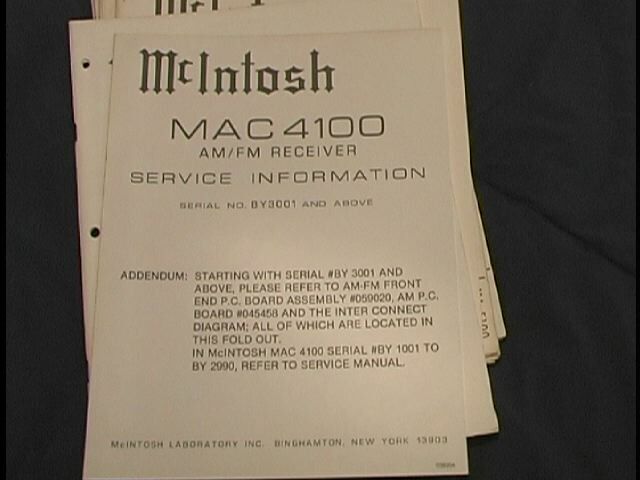 Manual McIntoshMAC 4100 Receiver Service Manual Addendum for Serial No BY1001 to BY3001 PHOTO COPY! 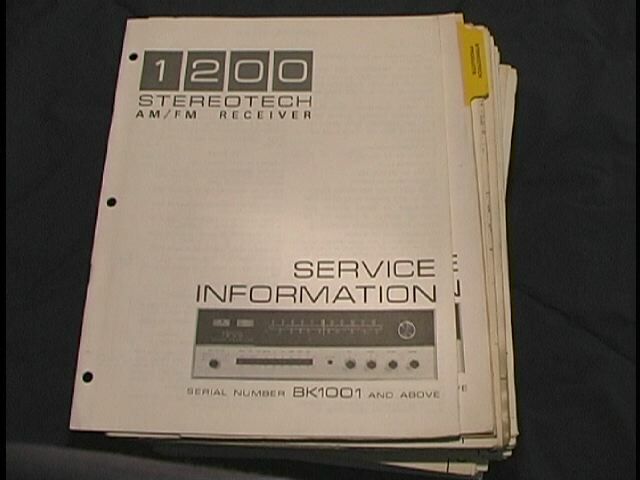 Manual McIntoshStereoTech 1200 Receiver Service Manual Starting with Serial No. BK1001 PHOTO COPY! Manual MitsubishiDA-50R DA-51 DA-51R CD Receiver Service Manual PHOTO COPY! 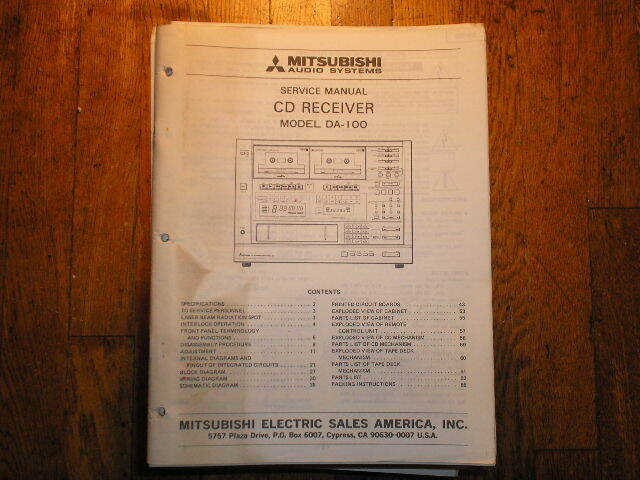 Manual MitsubishiDA-100 CD Receiver Service Manual PHOTO COPY! 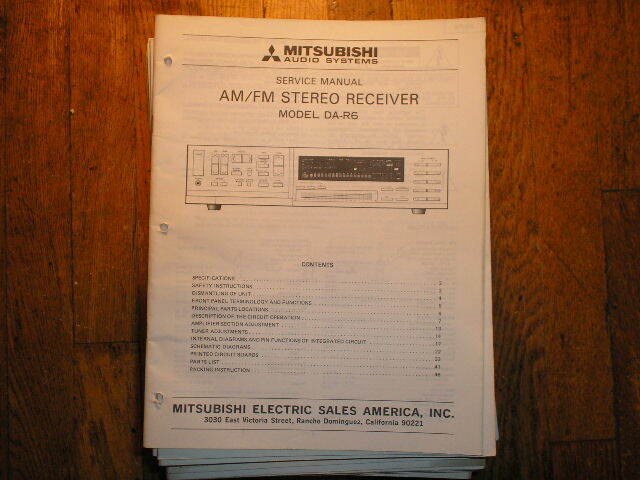 Manual MitsubishiDA-R3 Receiver Service Manual PHOTO COPY! 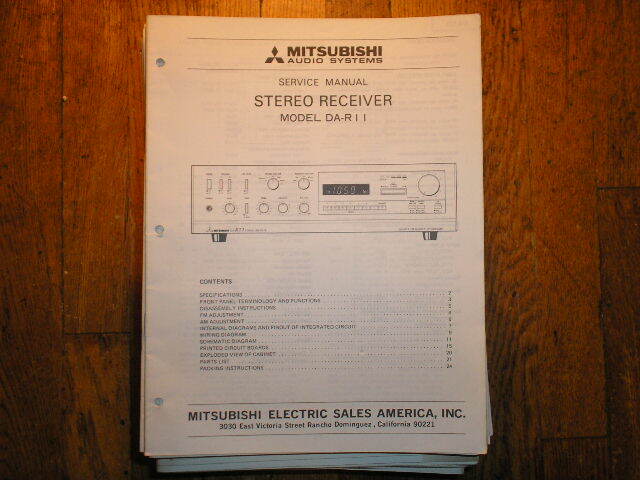 Manual MitsubishiDA-R5 Receiver Service Manual PHOTO COPY! 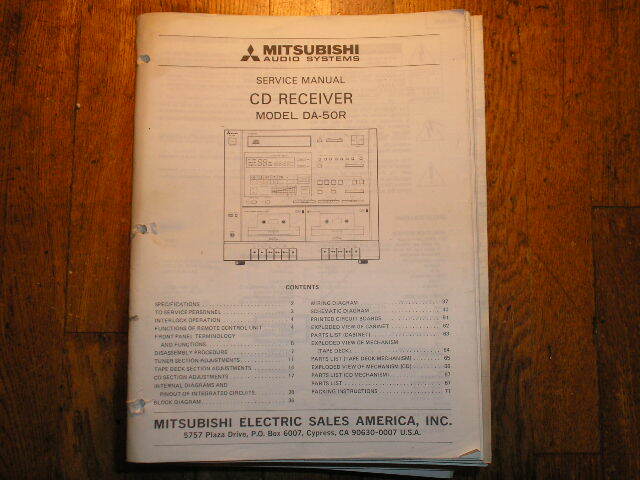 Manual MitsubishiDA-R6 Receiver Service Manual PHOTO COPY! 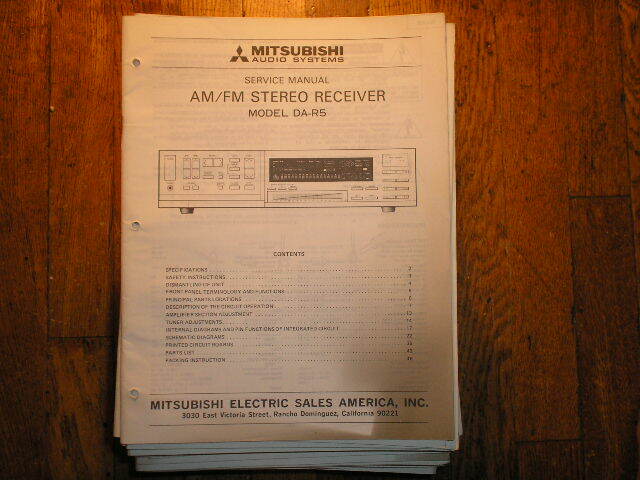 Manual MitsubishiDA-R11 Receiver Service Manual PHOTO COPY! 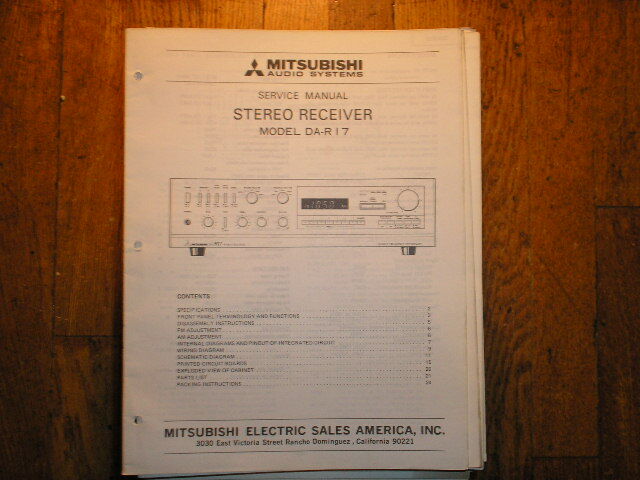 Manual MitsubishiDA-R17 Receiver Service Manual PHOTO COPY! 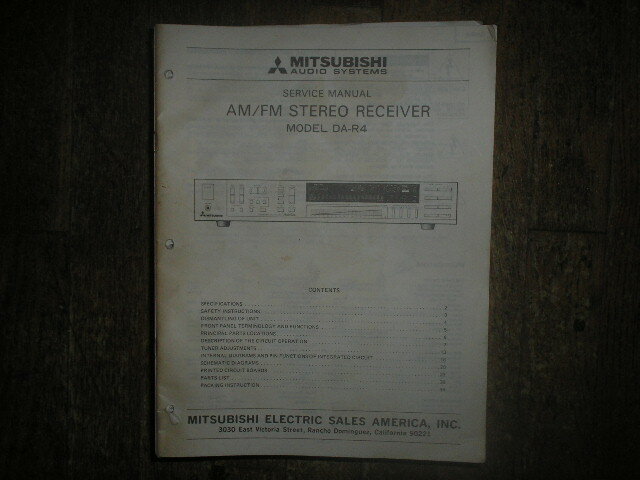 Manual MitsubishiDA-R46 DA-R56 Receiver Service Manual PHOTO COPY! 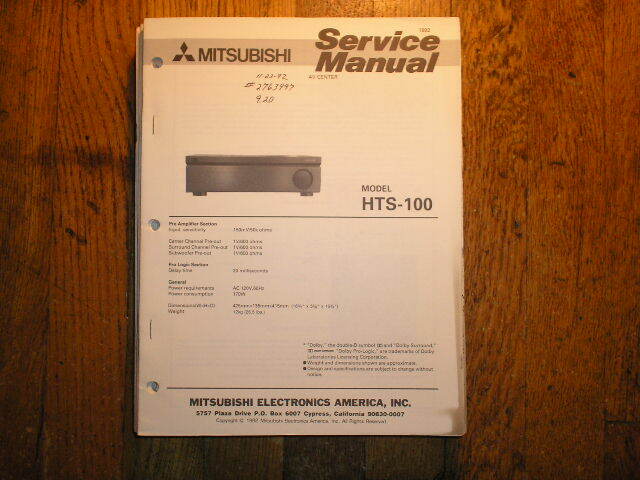 Manual MitsubishiHTS-100 AV Center Service Manual PHOTO COPY! 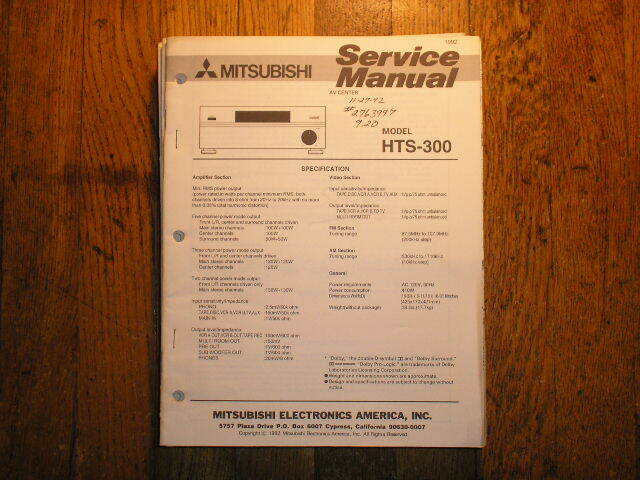 Manual MitsubishiHTS-300 AV Center Service Manual PHOTO COPY! Manual MitsubishiM-AV1 M-AV2 Audio Video Receiver Service Manual PHOTO COPY! 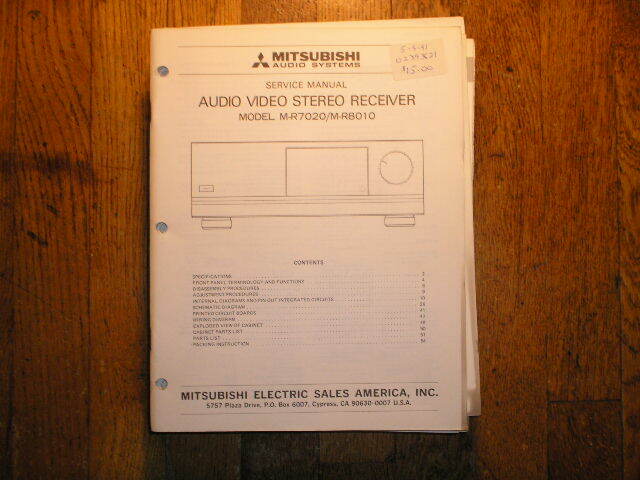 Manual MitsubishiM-AV3 Audio Video Receiver Service Manual PHOTO COPY! 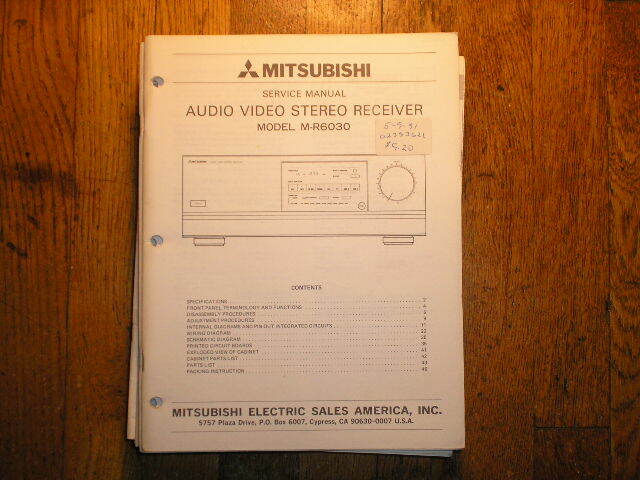 Manual MitsubishiM-R6030 Audio Video Receiver Service Manual PHOTO COPY! 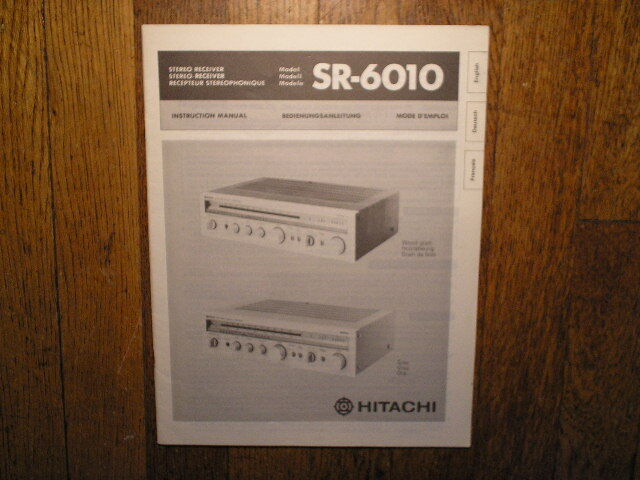 Manual MitsubishiM-R7020 M-R8010 Audio Video Receiver Service Manual PHOTO COPY! 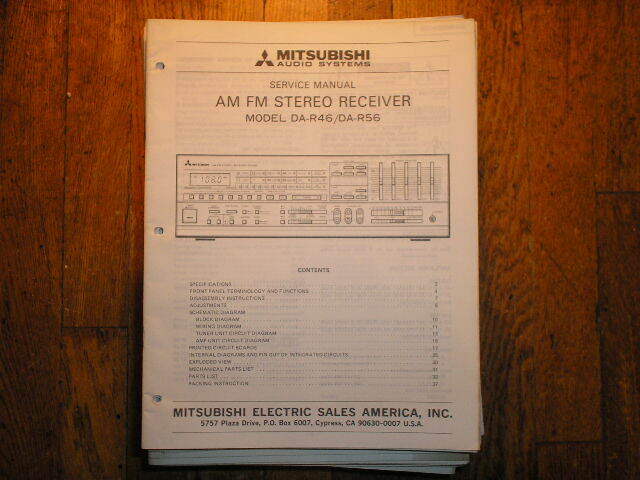 Manual MitsubishiDA-R4 Receiver Service Manual PHOTO COPY! Manual MitsubishiM-VR400 AV Receiver Service Manual. comes with large foldouts PHOTO COPY! Manual MitsubishiM-VR600 AV Receiver Service Manual. comes with large foldouts PHOTO COPY! Manual MitsubishiM-VR800 AV Receiver Service Manual. comes with large foldouts PHOTO COPY! Manual MitsubishiM-VR1000 AV Receiver Service Manual. comes with large foldout schematics... PHOTO COPY! 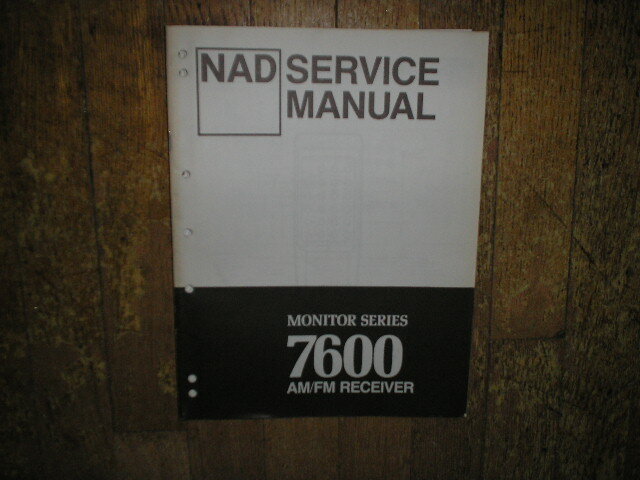 Manual NADMonitor Series 7600 Stereo Receiver Service Manual PHOTO COPY! 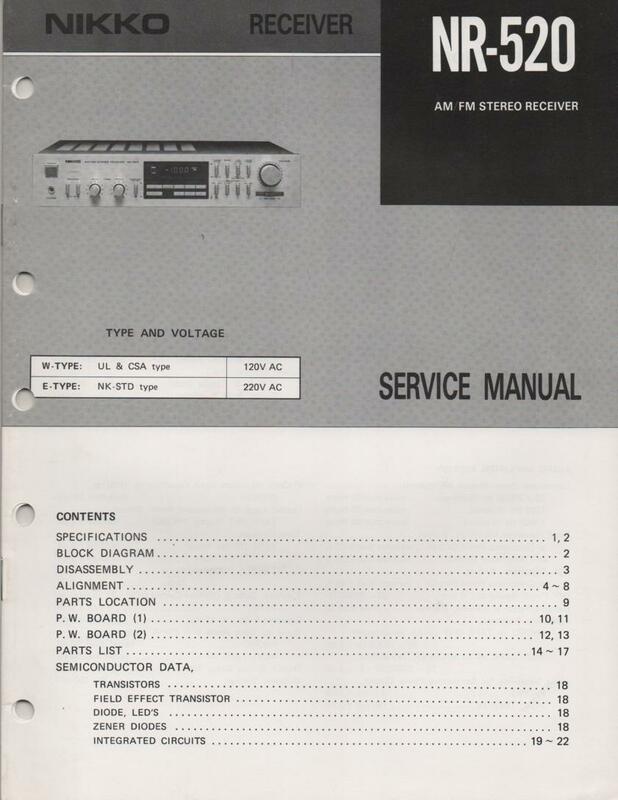 Manual NAD7240PE Stereo Receiver Service Manual PHOTO COPY! 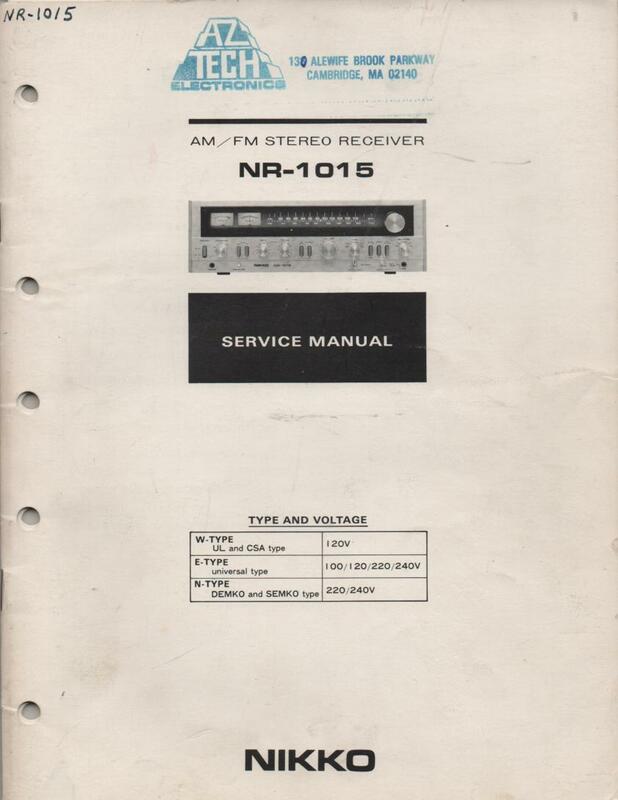 Manual NATIONALNC-108 FM Receiver Service Manual PHOTO COPY! 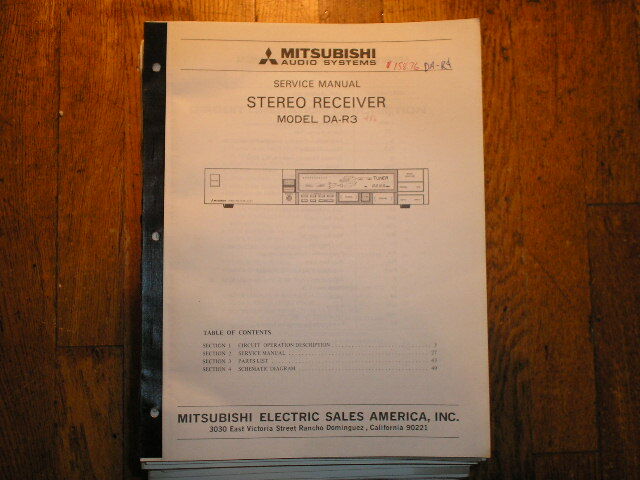 Manual NikkoSTA-501 AM FM Stereo Receiver Service Manual with Schematic PHOTO COPY! Manual NikkoSTA-701B AM FM Stereo Receiver Service Manual with Schematic PHOTO COPY! Manual NikkoSTA-2010 AM FM Stereo Receiver Service Manual with Schematic PHOTO COPY! 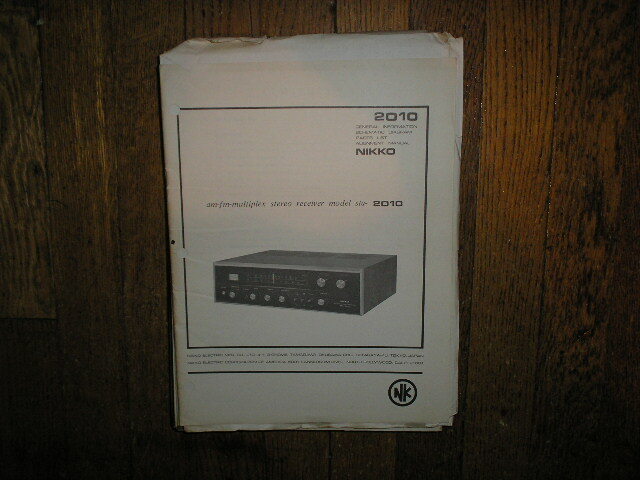 Manual Nikko3035 AM FM Stereo Receiver Service Manual with Schematic PHOTO COPY! 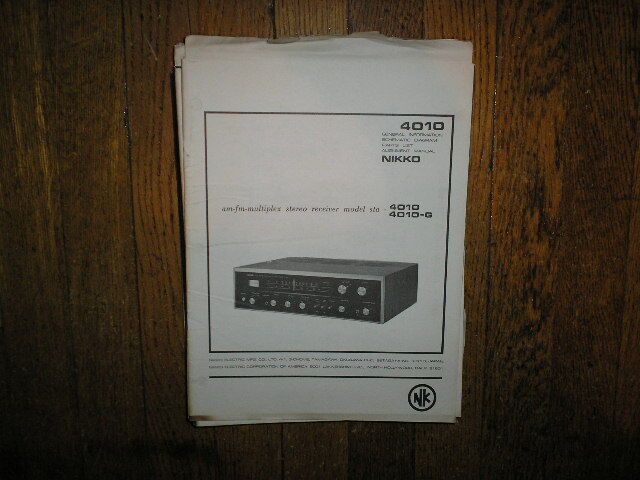 Manual NikkoSTA-4010 STA-4010-G AM FM Stereo Receiver Service Manual with Schematic PHOTO COPY! Manual NikkoSTA-5010 AM FM Stereo Receiver Service Manual with Schematic PHOTO COPY! 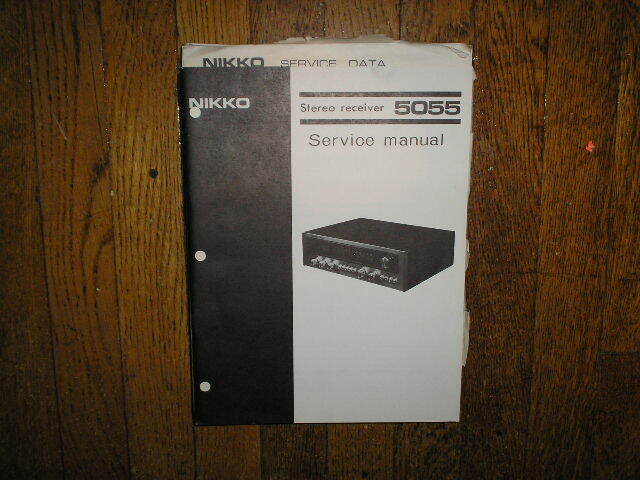 Manual Nikko5055 AM FM Stereo Receiver Service Manual with Schematic PHOTO COPY! Manual NikkoSTA-6010 AM FM Stereo Receiver Service Manual with Schematic PHOTO COPY! 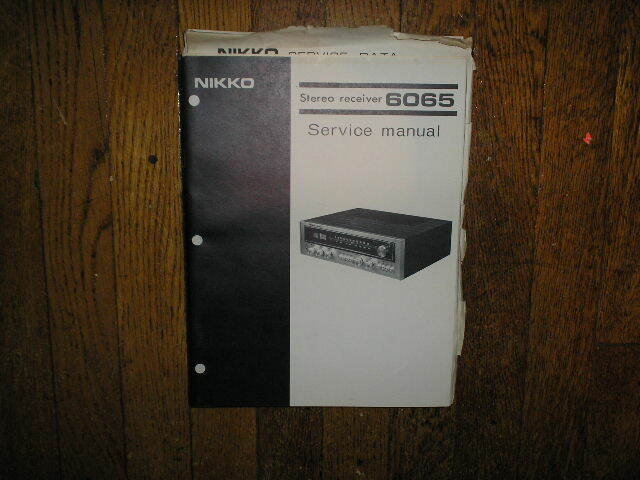 Manual Nikko6065 AM FM Stereo Receiver Service Manual with Schematic PHOTO COPY! Manual NikkoSTA-7070 AM FM Stereo Receiver Service Manual with Schematic PHOTO COPY! 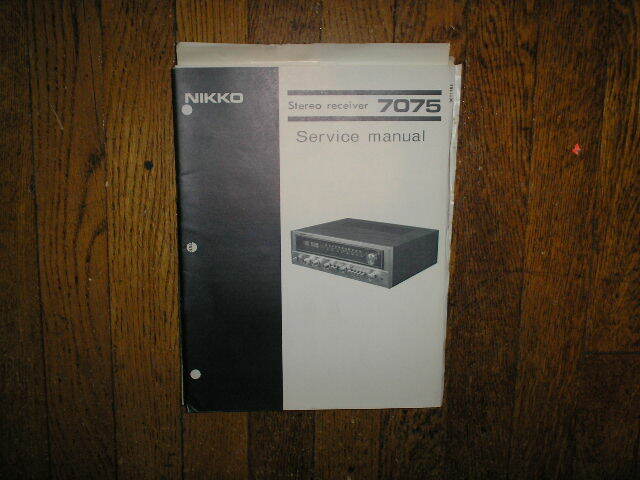 Manual Nikko7075 AM FM Stereo Receiver Service Manual with Schematic PHOTO COPY! 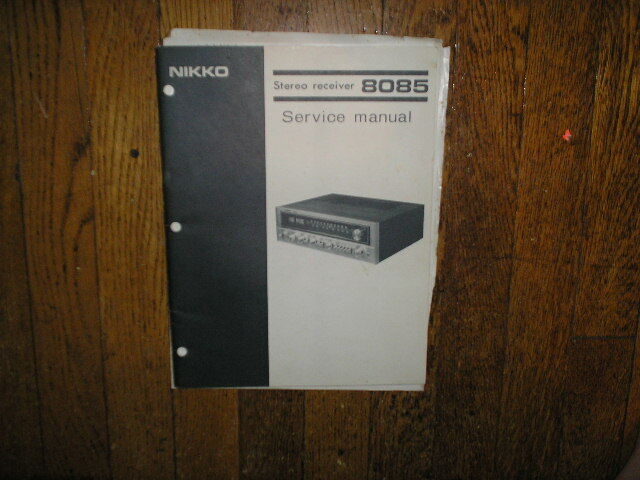 Manual Nikko8085 AM FM Stereo Receiver Service Manual with Schematic PHOTO COPY! Manual NikkoSTA-9010 AM FM Stereo Receiver Service Manual with Schematic PHOTO COPY! 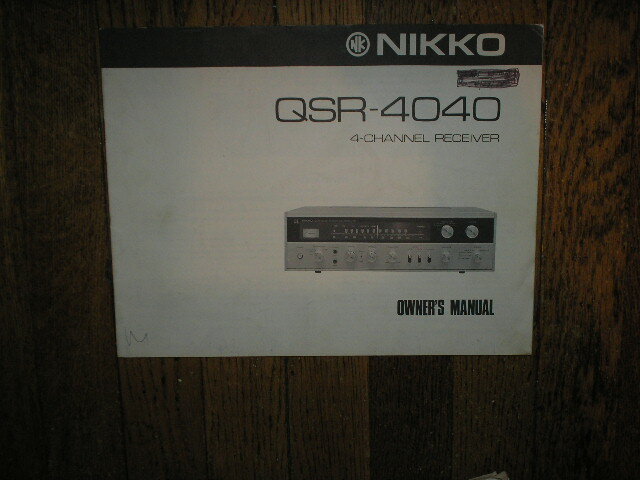 Manual NikkoQSR-4040 AM FM Stereo Receiver Owners Manual PHOTO COPY! Manual NikkoSTA-301 AM FM STEREO RECEIVER Service Manual with Schematic PHOTO COPY! 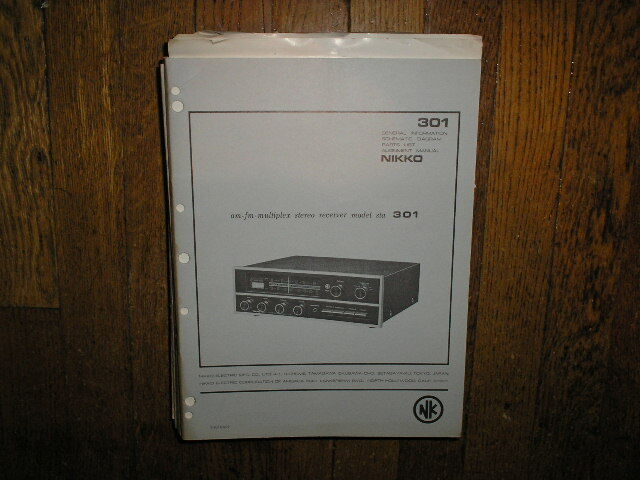 Manual NikkoNR-300 Receiver Service Manual PHOTO COPY! 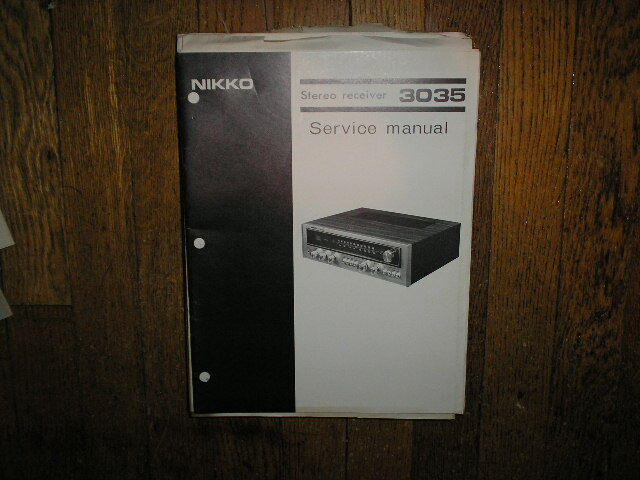 Manual NikkoNR-320 Receiver Service Manual PHOTO COPY! 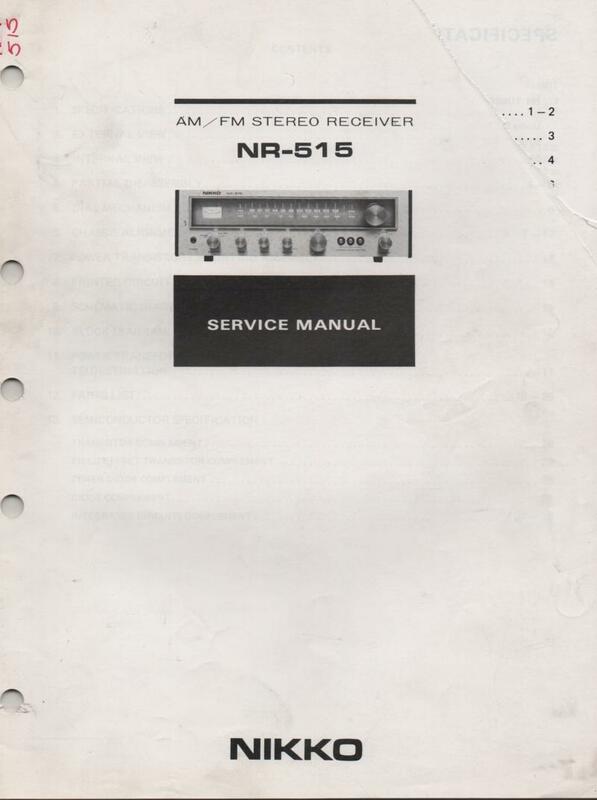 Manual NikkoNR-515 Receiver Service Manual PHOTO COPY! Manual NikkoNR-520 Receiver Service Manual PHOTO COPY! 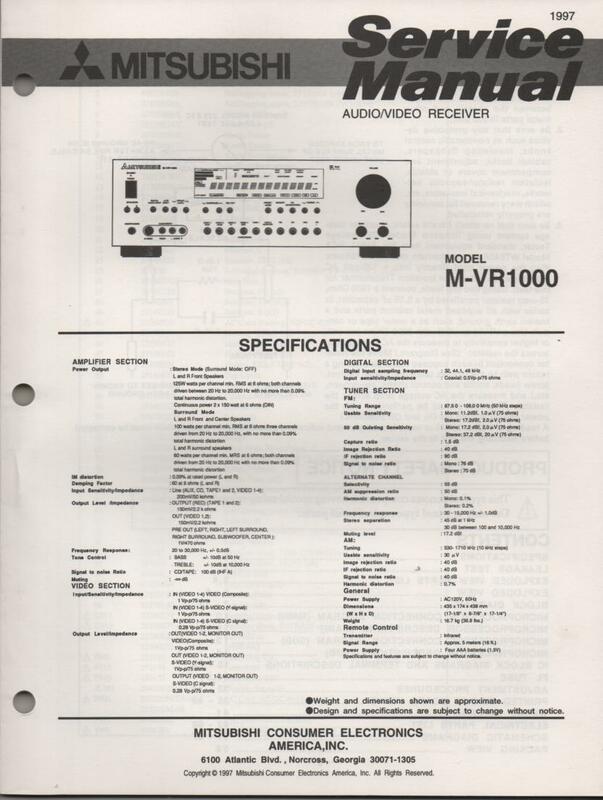 Manual NikkoNR-1000 Receiver Service Manual PHOTO COPY! 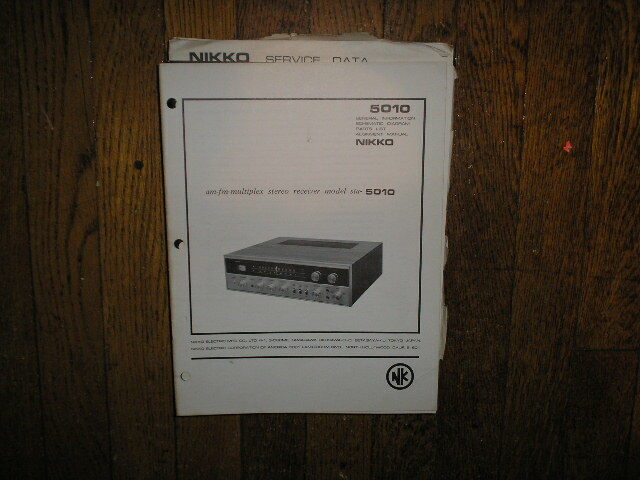 Manual NikkoNR-1015 Receiver Service Manual PHOTO COPY! 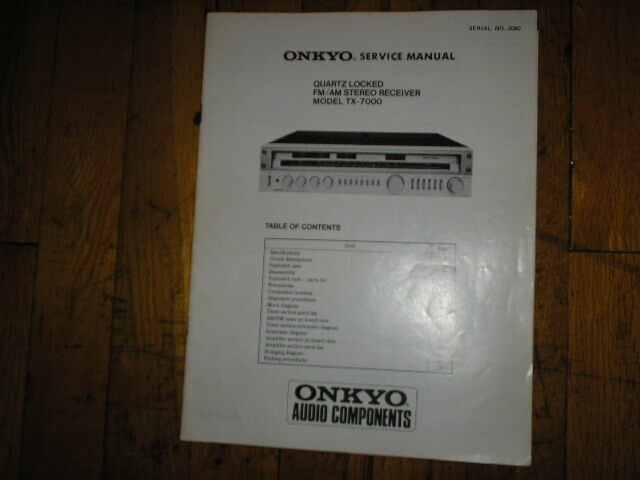 Manual ONKYOTX-7000 Receiver Service Manual PHOTO COPY! 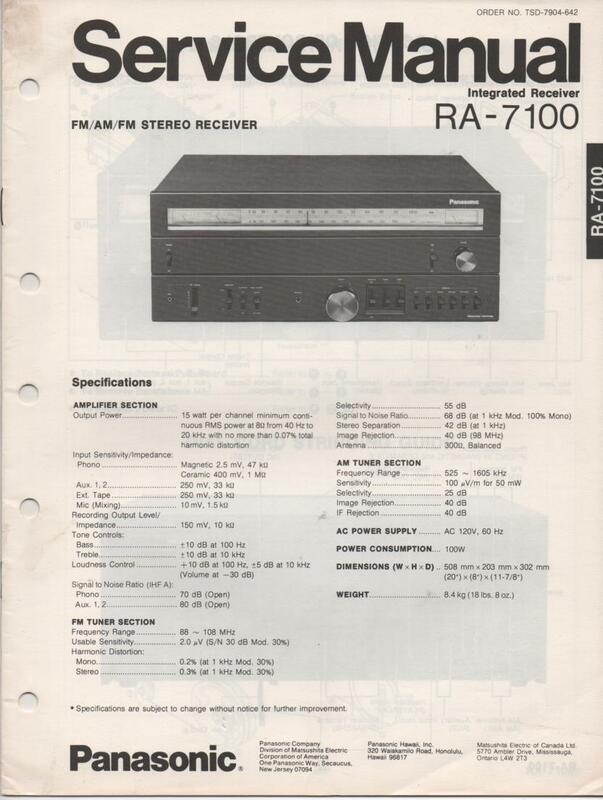 Manual PanasonicRA-7100 Receiver Service Manual PHOTO COPY! 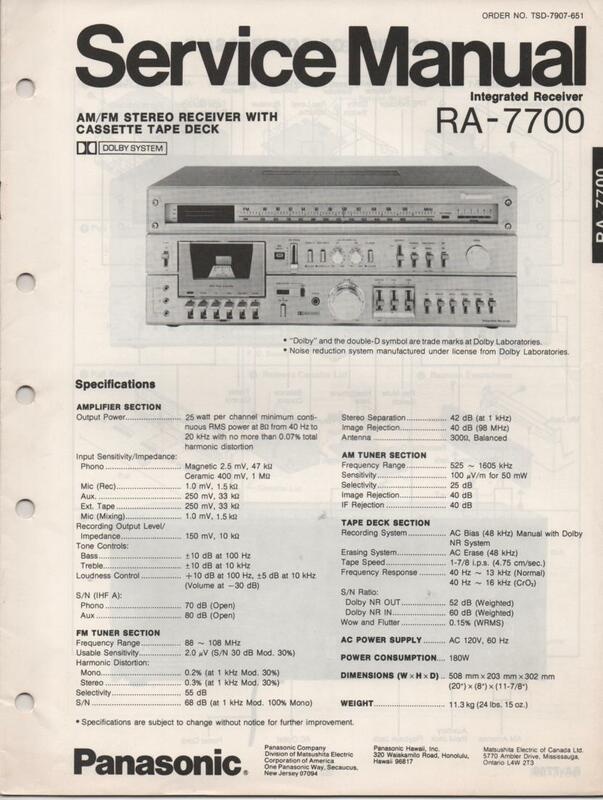 Manual PanasonicRA-7700 Receiver Service Manual PHOTO COPY! Manual PanasonicRA-7800 Receiver Service Manual PHOTO COPY! Manual PanasonicSE-60 Receiver Service Manual PHOTO COPY! 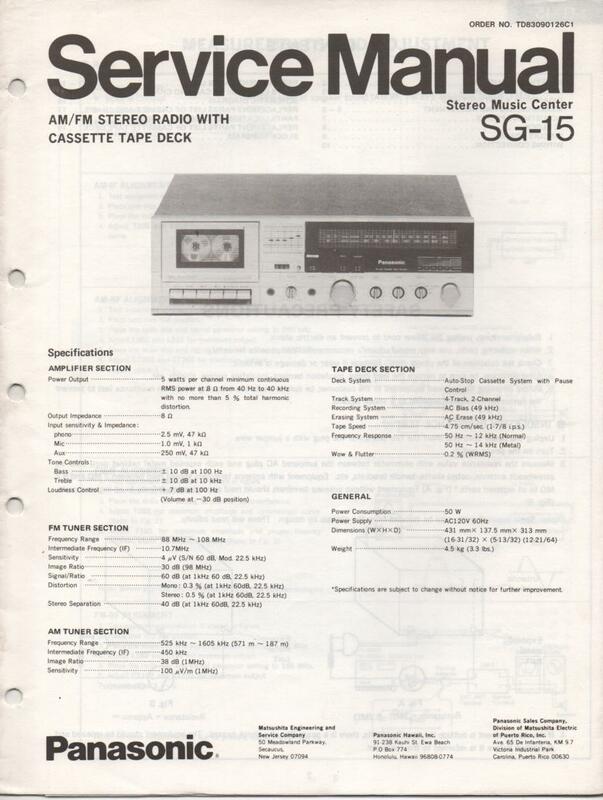 Manual PanasonicSG-15 Cassette Receiver Service Manual PHOTO COPY! Manual PanasonicSG-25 Cassette Receiver Service Manual PHOTO COPY! 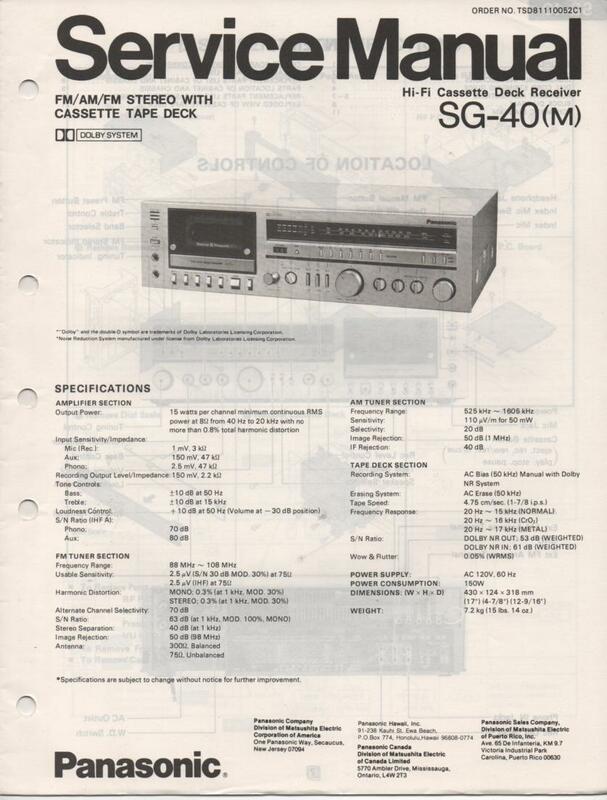 Manual PanasonicSG-40 Cassette Receiver Service Manual PHOTO COPY! 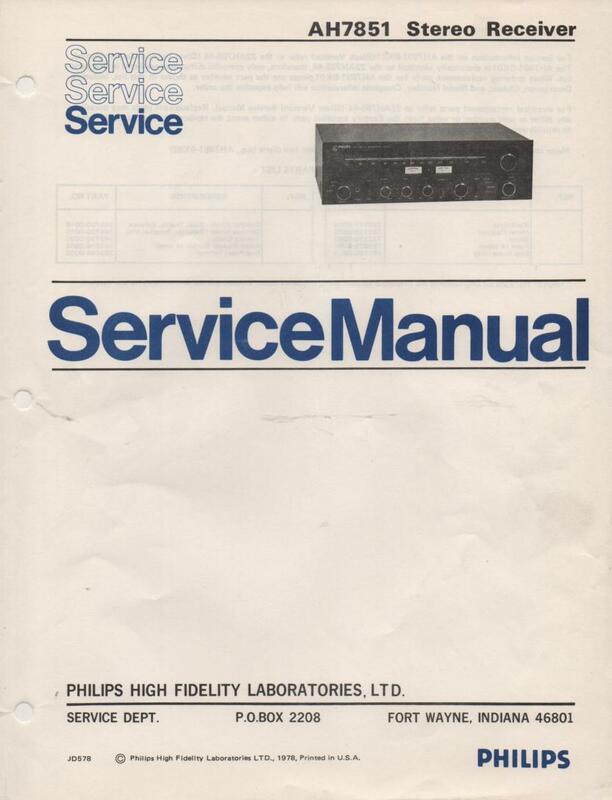 Manual PHILIPSAH7851 Stereo Receiver Service Manual PHOTO COPY! 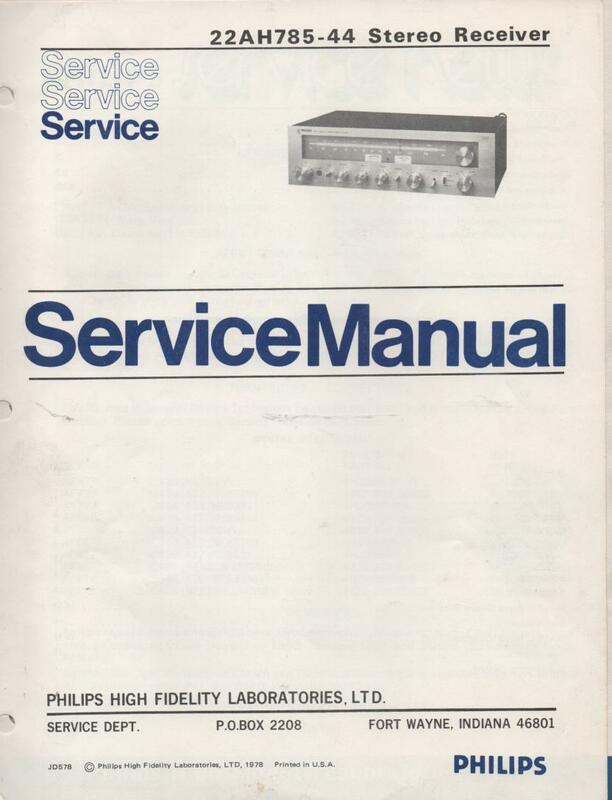 Manual PHILIPS22AH785-44 Stereo Receiver Service Manual PHOTO COPY! 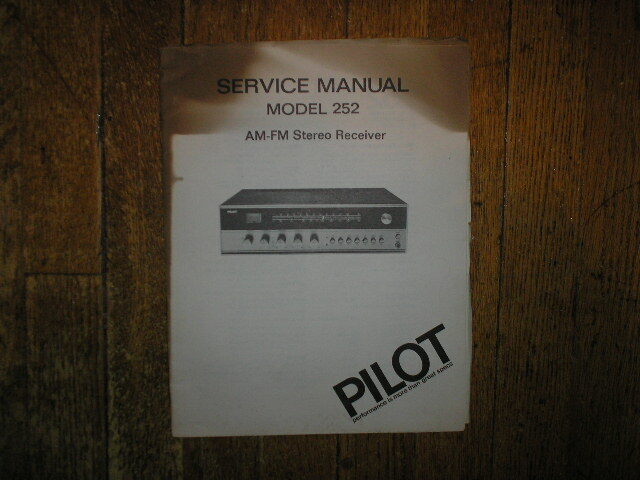 Manual Pilot252 Receiver Service Manual PHOTO COPY! 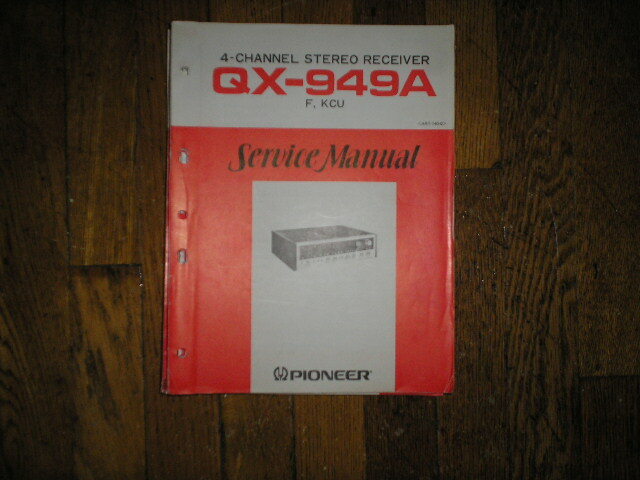 Manual PioneerQX-949A Receiver Service Manual ART-140 PHOTO COPY! 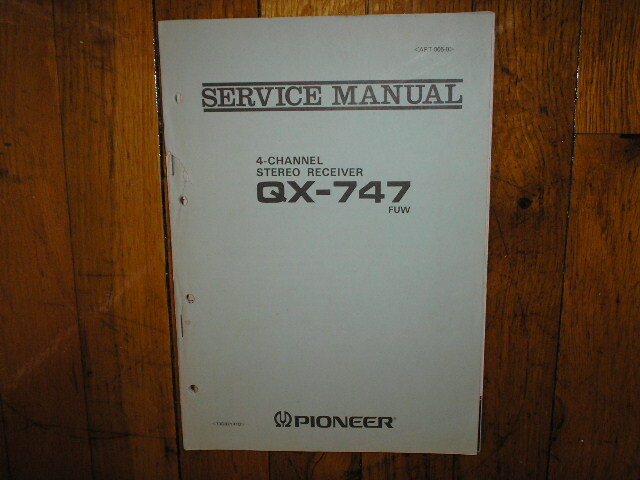 Manual PioneerQX-747A Receiver Service Manual ART-141 PHOTO COPY! 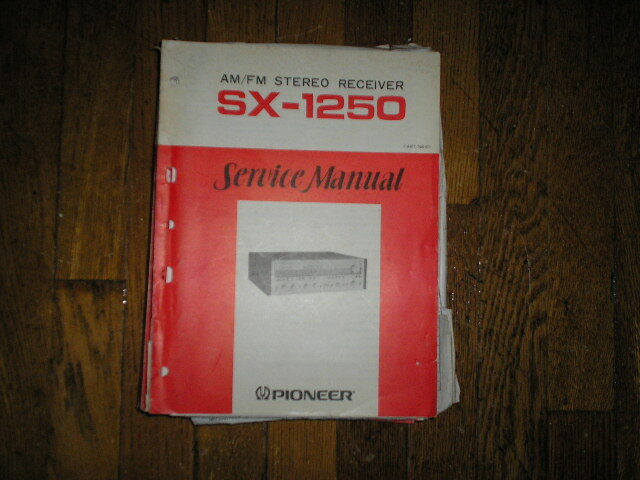 Manual PioneerSX-1250 Receiver Service Manual ART-158 PHOTO COPY! 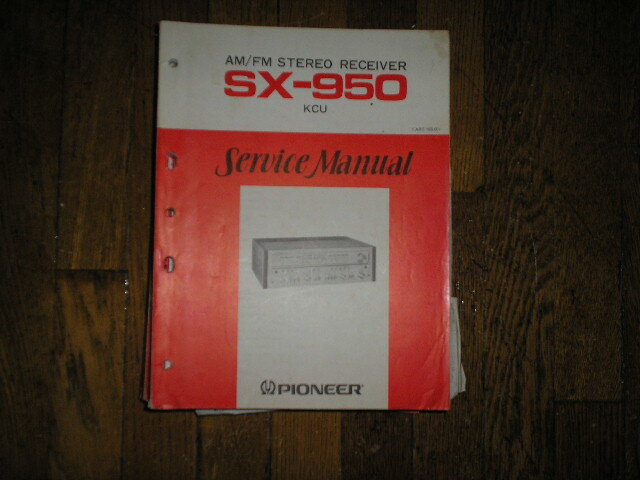 Manual PioneerSX-950 Receiver Service Manual ART-155 PHOTO COPY! 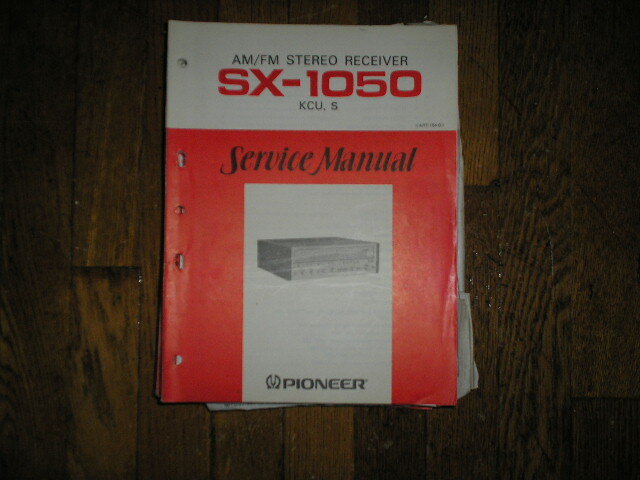 Manual PioneerSX-1050 Receiver Service Manual 105 pages with large foldout schematic... ART-154 PHOTO COPY! 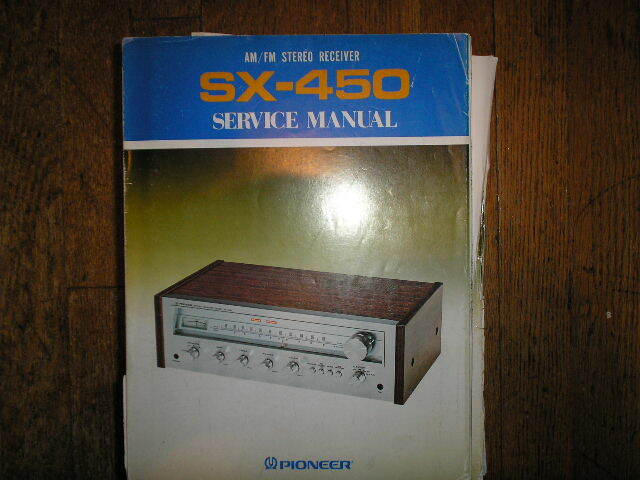 Manual PioneerSX-450 S HG KU KC Stereo Receiver Service Manual PHOTO COPY! 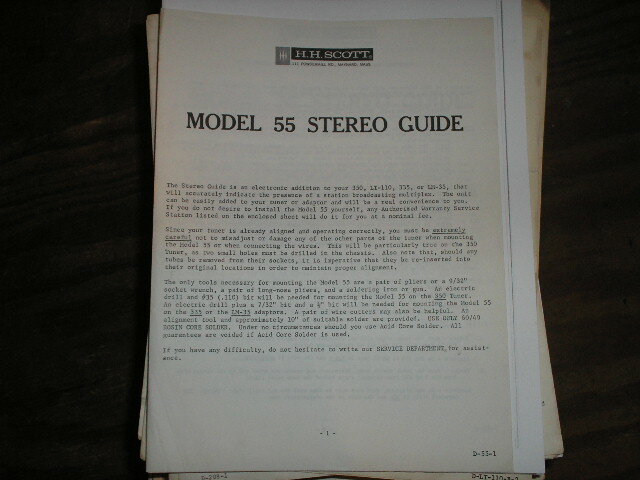 Manual PioneerSX-550 HG S Stereo Receiver Service Manual PHOTO COPY! 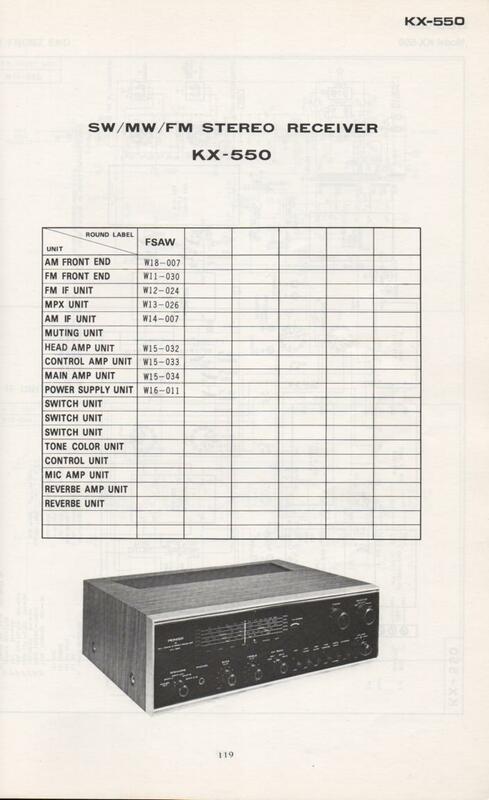 Manual PioneerSX-650 HG KU KC Stereo Receiver Service Manual PHOTO COPY! 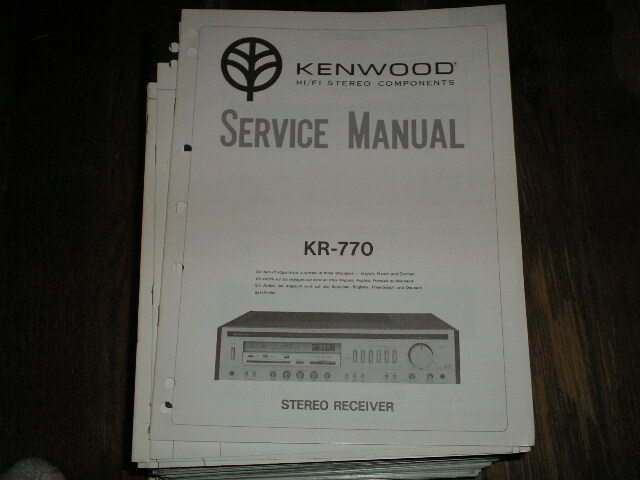 Manual PioneerSX-750 KU KC Stereo Receiver Service Manual PHOTO COPY! Manual PioneerSX-850 HG S KU KC Stereo Receiver Service Manual PHOTO COPY! Manual PioneerSX-980 HG S S/G KC Stereo Receiver Service Manual PHOTO COPY! Manual PioneerSX-1080 KU Stereo Receiver Service Manual PHOTO COPY! 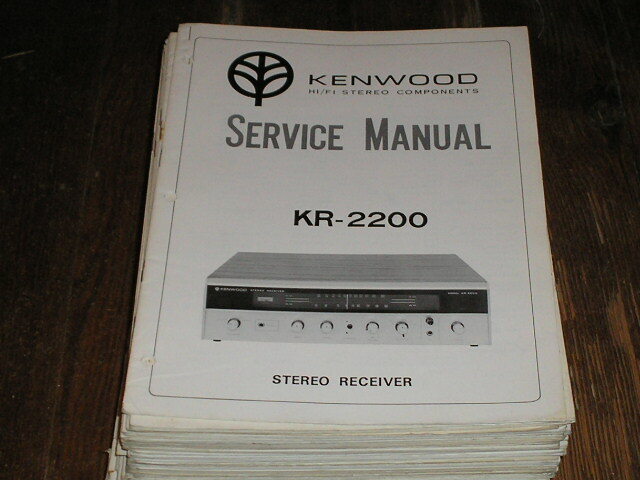 Manual PioneerSX-1280 KU KC S S/G Stereo Receiver Service Manual PHOTO COPY! 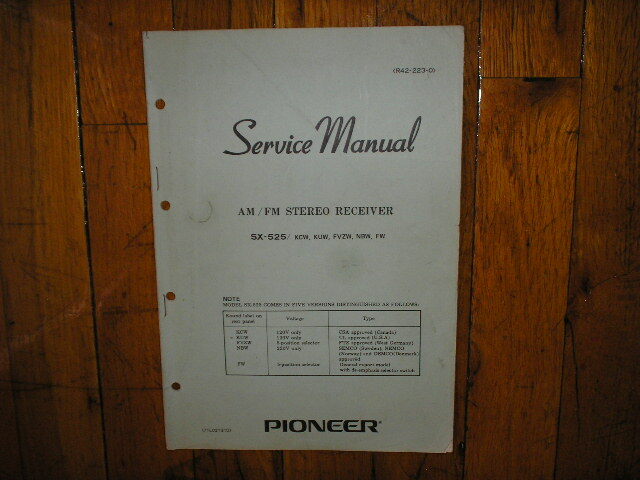 Manual PioneerSM-B200 Receiver Old Style Service Manual PHOTO COPY! 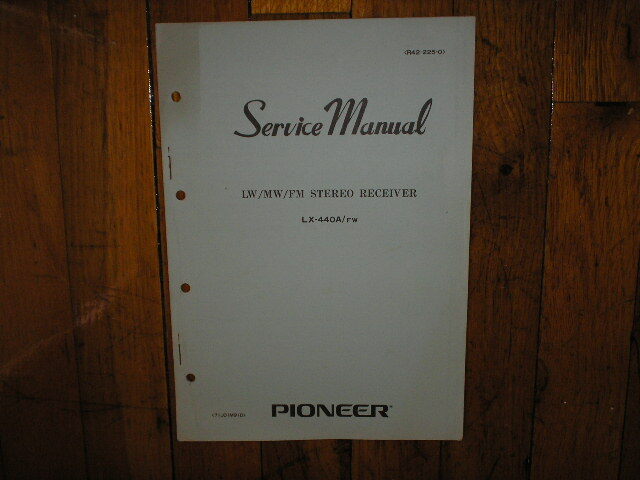 Manual PioneerSX-82 Stereo Receiver Service Manual PHOTO COPY! 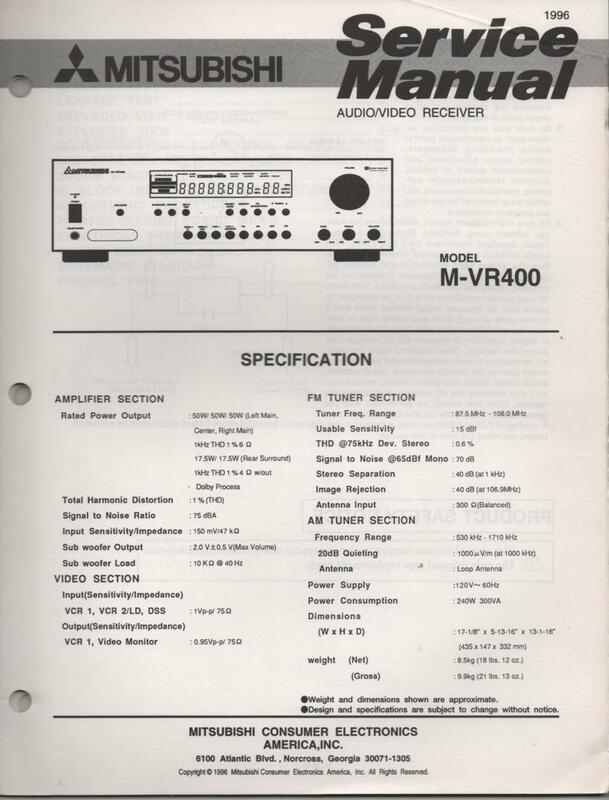 Manual PioneerSX-440 FVW Receiver Service Manual PHOTO COPY! 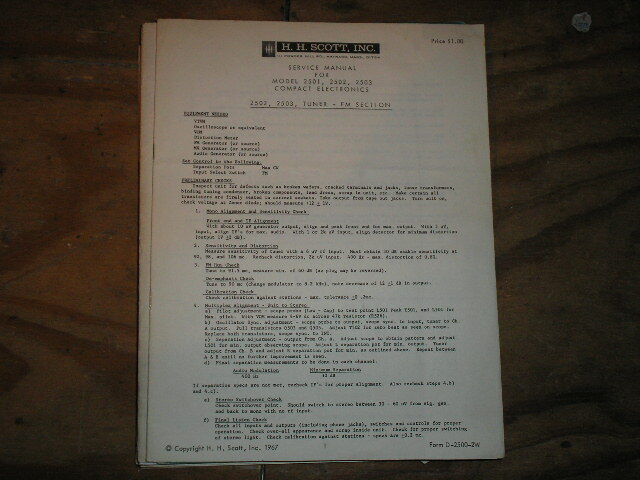 Manual PioneerSX-525 KCW KUW FVZW FW Receiver Service Manual PHOTO COPY! 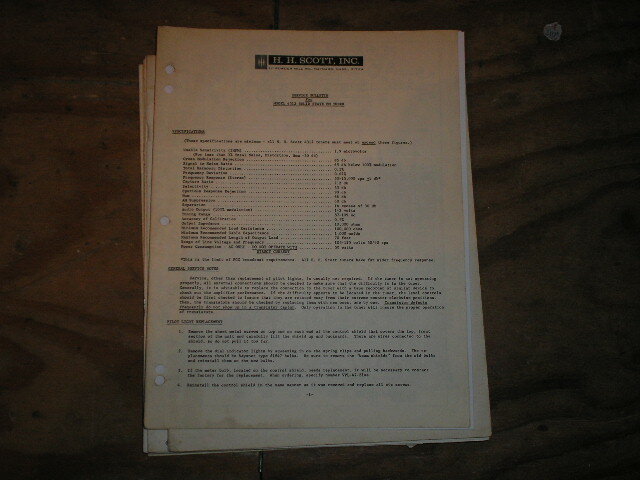 Manual PioneerSX-700T Receiver Service Manual PHOTO COPY! 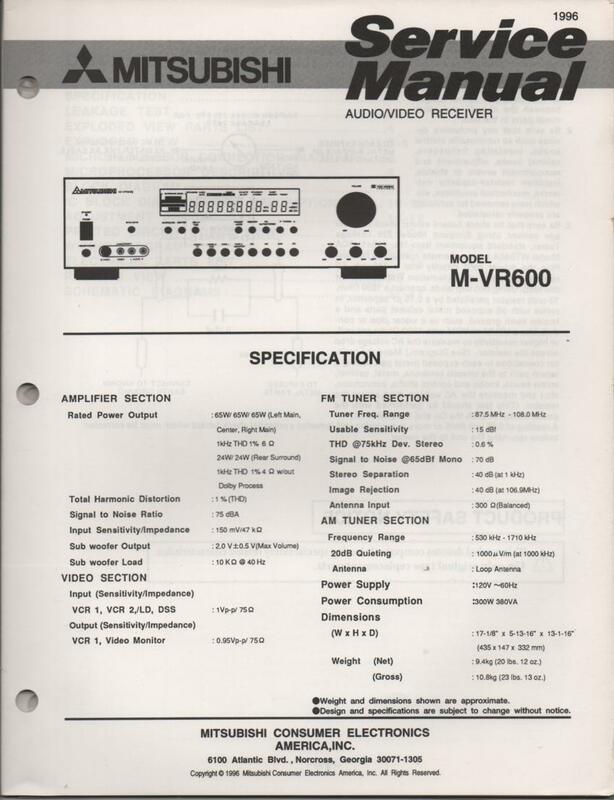 Manual PioneerSX-990 FVW Receiver Service Manual PHOTO COPY! 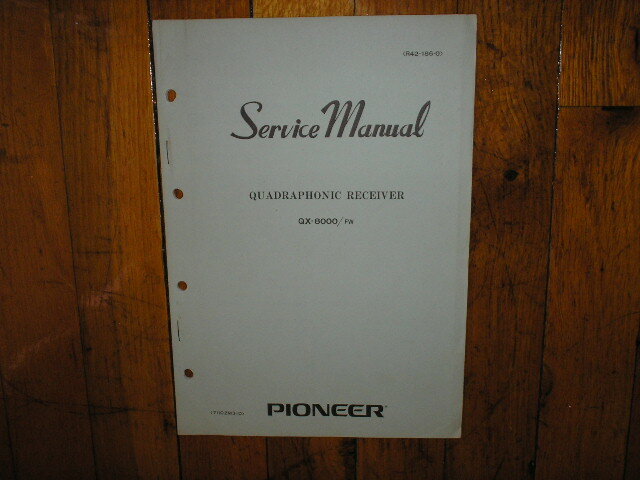 Manual PioneerSX-990 KUW Receiver Service Manual PHOTO COPY! 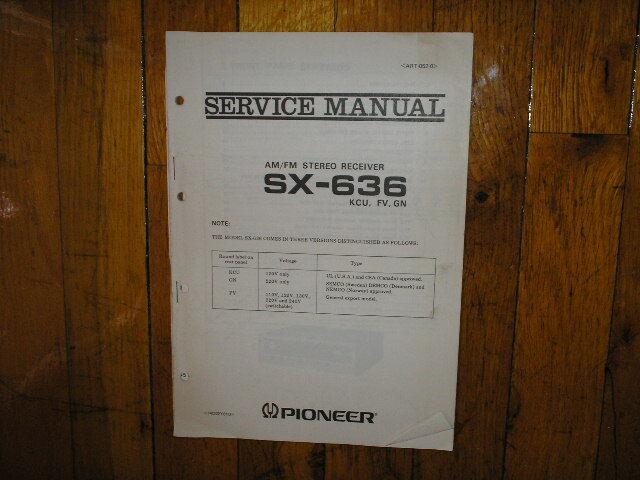 Manual PioneerSX-580 Receiver Service Manual PHOTO COPY! 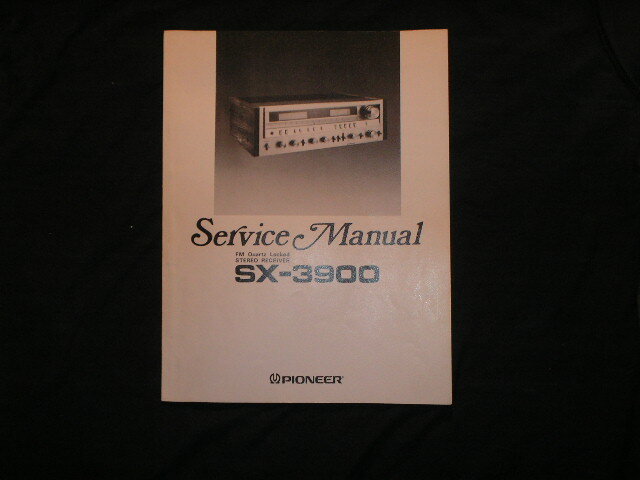 Manual PioneerSX-620 SX-3500 Receiver Service Manual PHOTO COPY! 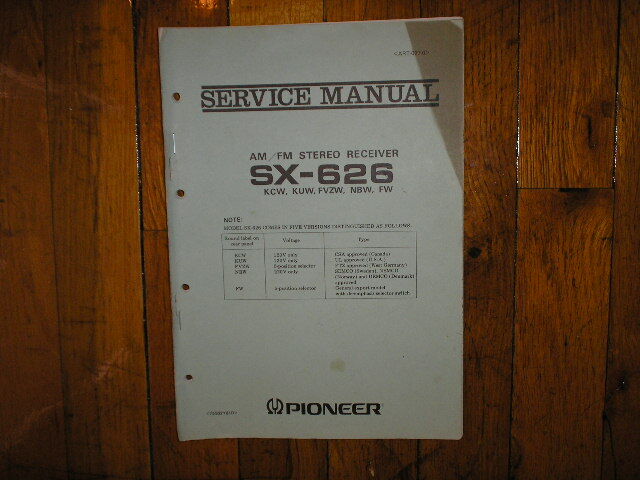 Manual PioneerSX-680 Receiver Service Manual PHOTO COPY! 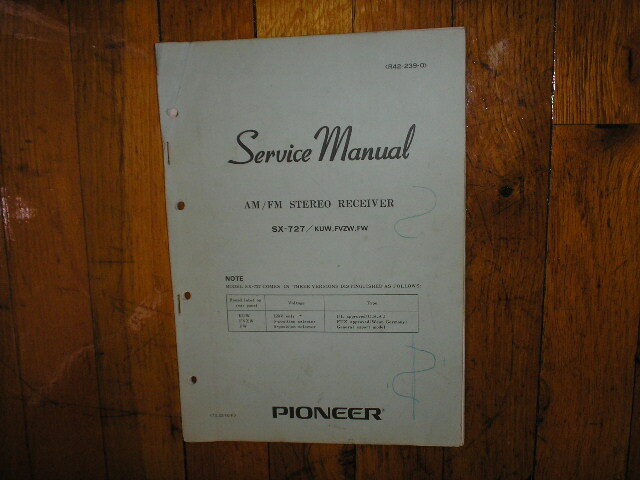 Manual PioneerSX-690 Receiver Service Manual PHOTO COPY! Manual PioneerSX-720 SX-3600 Receiver Service Manual PHOTO COPY! 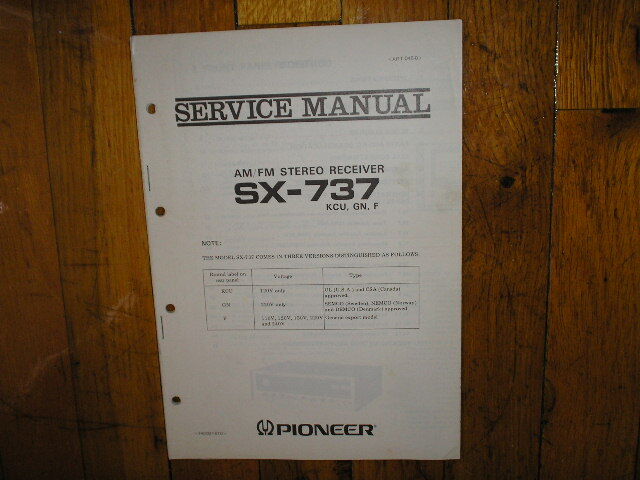 Manual PioneerSX-780 Receiver Service Manual PHOTO COPY! 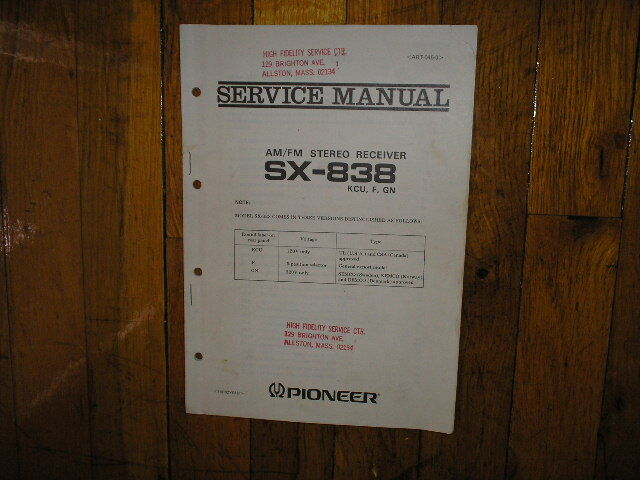 Manual PioneerSX-880 Receiver Service Manual PHOTO COPY! 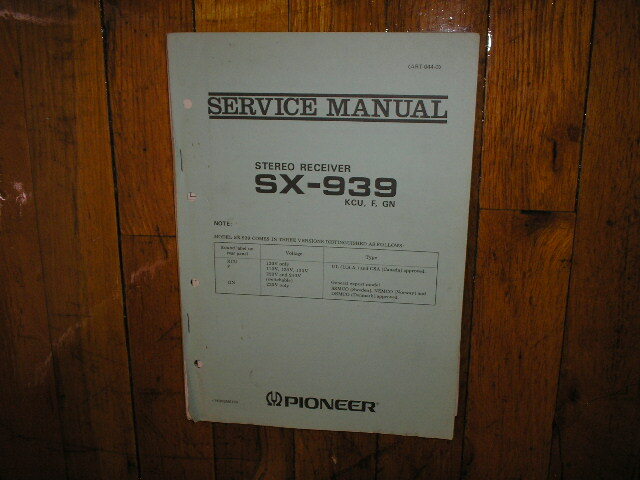 Manual PioneerSX-890 Receiver Service Manual PHOTO COPY! 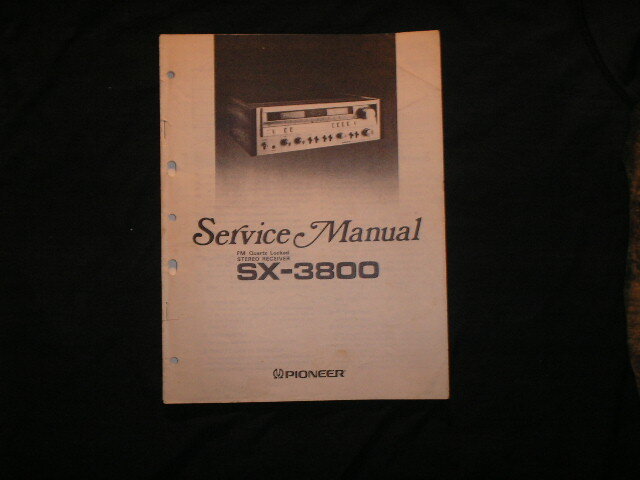 Manual PioneerSX-3400 Receiver Service Manual PHOTO COPY! Manual PioneerSX-3500 SX-620 Receiver Service Manual PHOTO COPY! 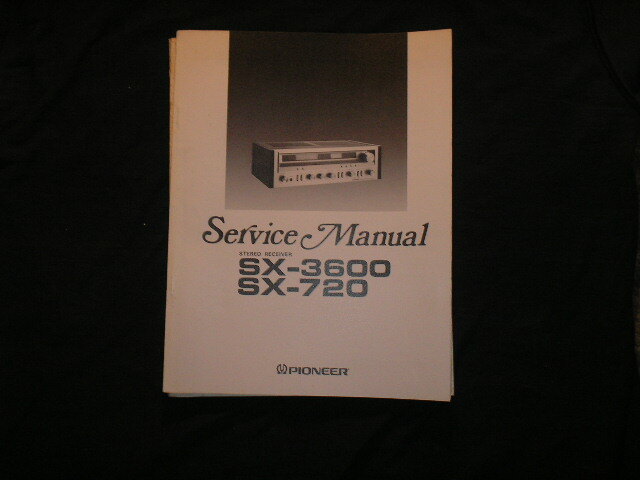 Manual PioneerSX-3600 SX-720 Receiver Service Manual PHOTO COPY! 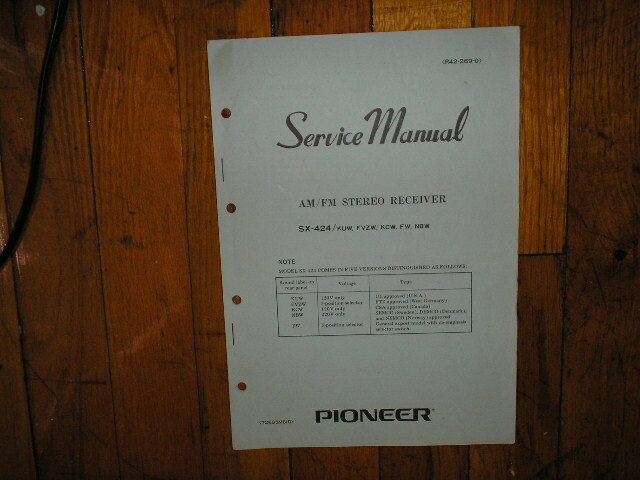 Manual PioneerSX-3700 Receiver Service Manual PHOTO COPY! 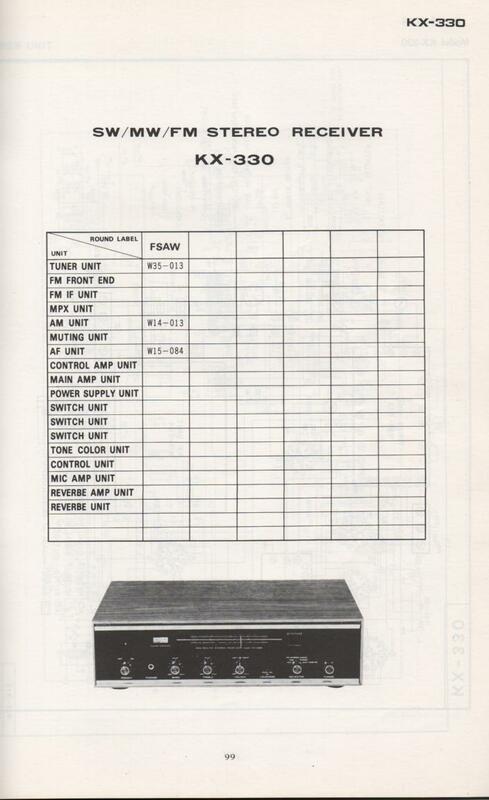 Manual PioneerSX-3800 Receiver Service Manual PHOTO COPY! 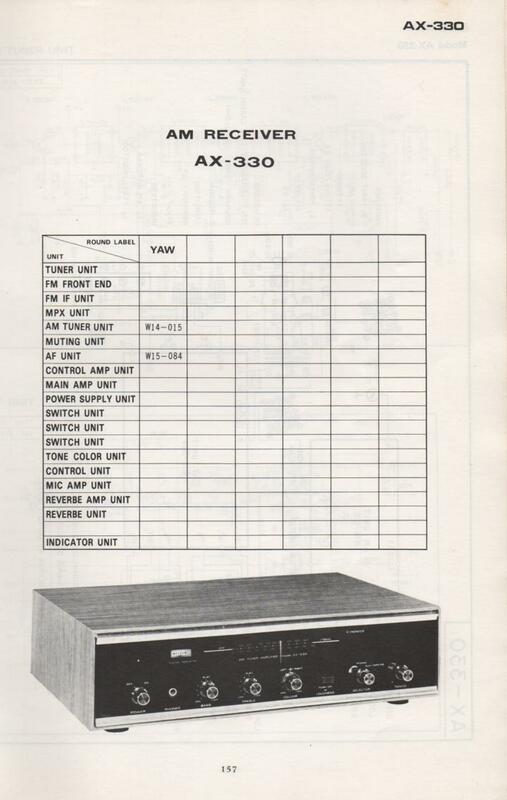 Manual PioneerSX-3900 Receiver Service Manual PHOTO COPY! 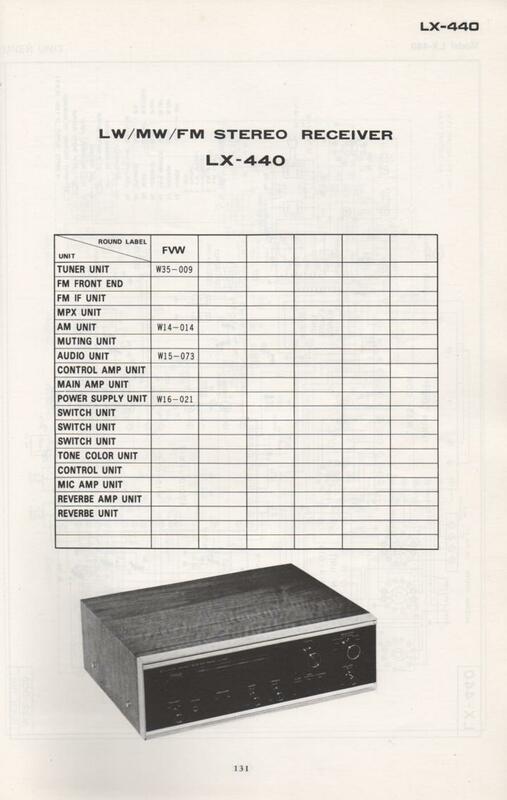 Manual PioneerLX-440A FW Longwave Multi-Band Receiver Service Manual PHOTO COPY! Manual PioneerQX-646 4-Channel Receiver Service Manual for KUW and FW Versions. 2 Manual Set.. PHOTO COPY! 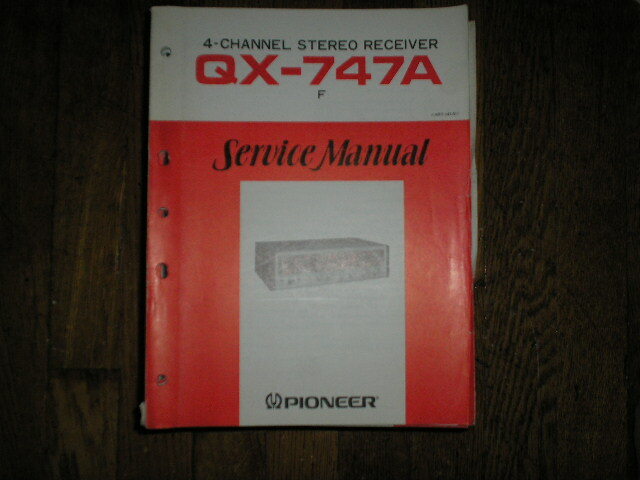 Manual PioneerQX-747 Receiver Service Manual. FUW Version. 2 Manuals and 2 Large fold-out schematics PHOTO COPY! 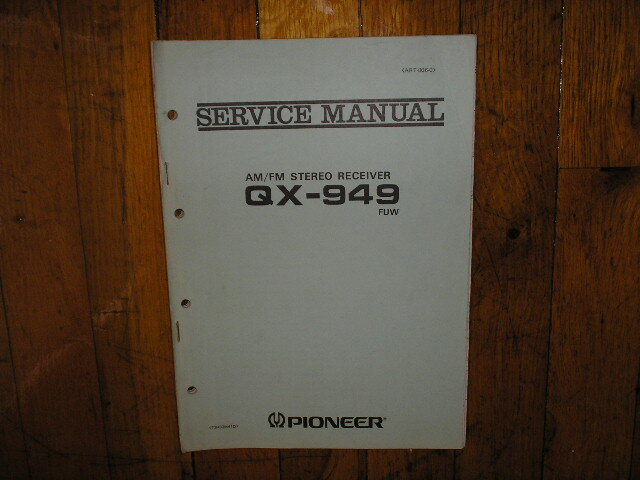 Manual PioneerQX-949 FUW Receiver Service Manual. 2 Manuals with large foldout schematic. PHOTO COPY! 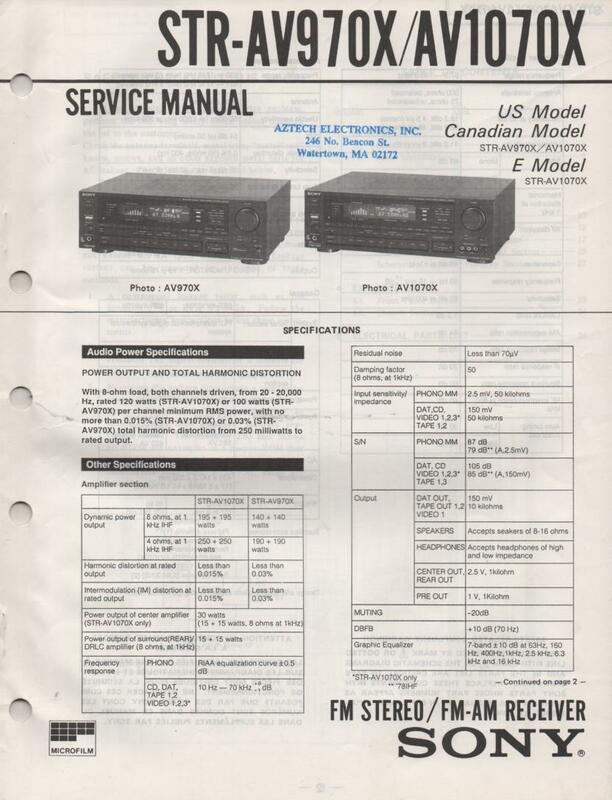 Manual PioneerQX-949 FUW Receiver Service Manual. 2 Manuals with large QX-949 FCUW foldout schematic. PHOTO COPY! 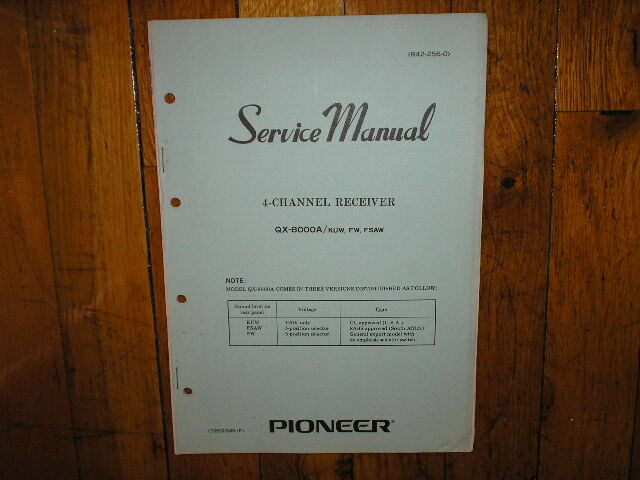 Manual PioneerQX-4000 4-Channel Receiver Service Manual. For KLUW and FW Versions. PHOTO COPY! Manual PioneerQX-8000 FW Receiver Service Manual. PHOTO COPY! 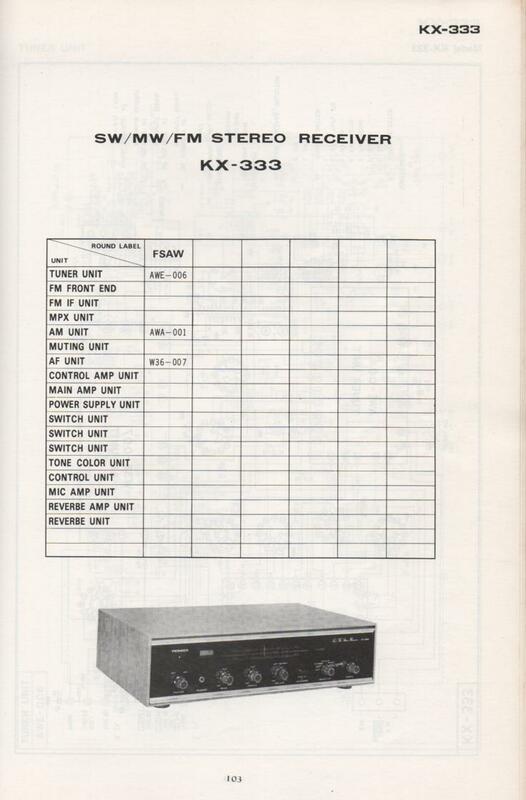 Manual PioneerQX-8000A 4-Channel Receiver Service Manual for KUW, FW, FSAW Versions PHOTO COPY! 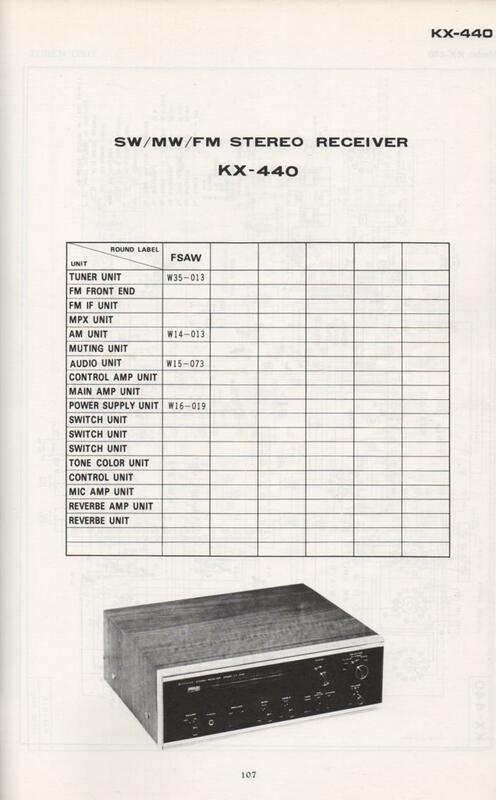 Manual PioneerSX-424 Receiver Service Manual for KUW, FVZW, KCW, FW, NBW, Versions. PHOTO COPY! 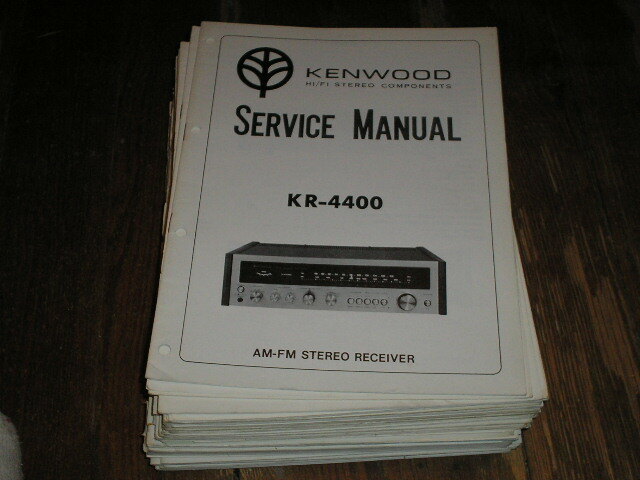 Manual PioneerSX-434 Receiver Service Manual For KCU, GN, and FV Versions.. PHOTO COPY! 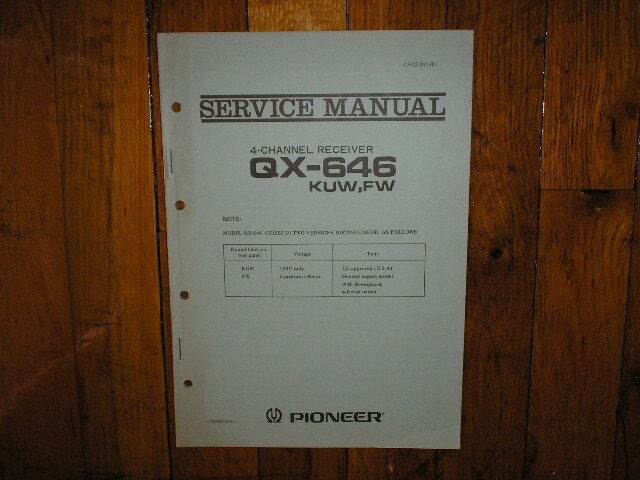 Manual PioneerSX-525 Receiver Service Manual for KCW, KUW, FZVW, NBW, FW, Versions.. PHOTO COPY! 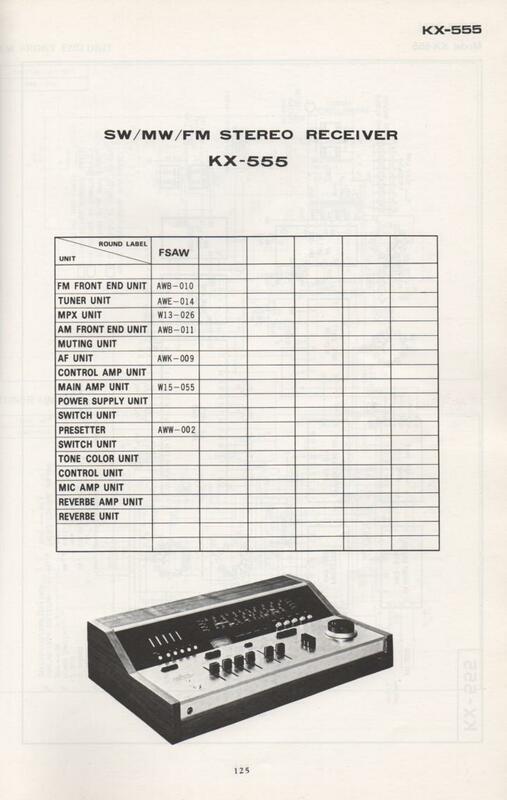 Manual PioneerSX-535 Receiver Service Manual for KCU, FV,and GN Versions. PHOTO COPY! Manual PioneerSX-626 Receiver Service Manual for KCW, KUW, FVZW, NBW, FW, Versions. July 1973 PHOTO COPY! Manual PioneerSX-636 KCU FV GN Versions Receiver Service Manual for KCU FV GN Versions. PHOTO COPY! Manual PioneerSX-727 Receiver Service Manual for KUW, FVZW, GN, Versions PHOTO COPY! Manual PioneerSX-737 Receiver Service Manual for KCU, GN, F, Versions. PHOTO COPY! Manual PioneerSX-828 Receiver Service Manual for KUW, FVZW, FW Versions. PHOTO COPY! 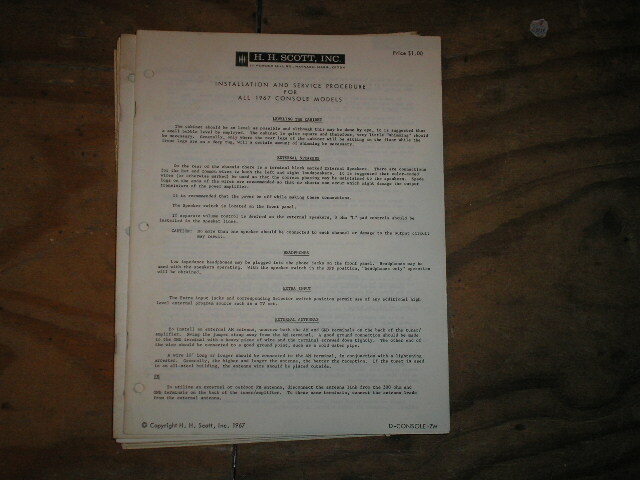 Manual PioneerSX-838 Receiver Service Manual for KCU, F,and GN Versions.. PHOTO COPY! 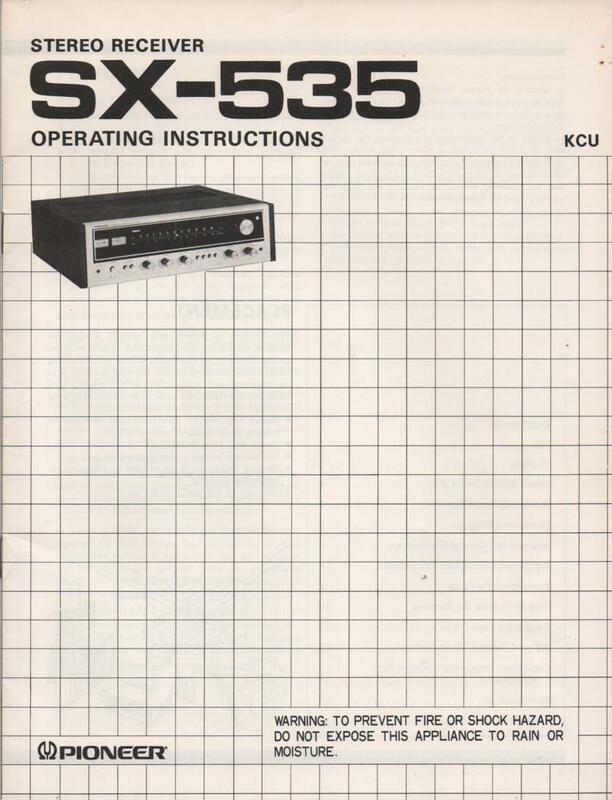 Manual PioneerSX-939 Receiver Service Manual for KCU, F, and GN, Versions. PHOTO COPY! 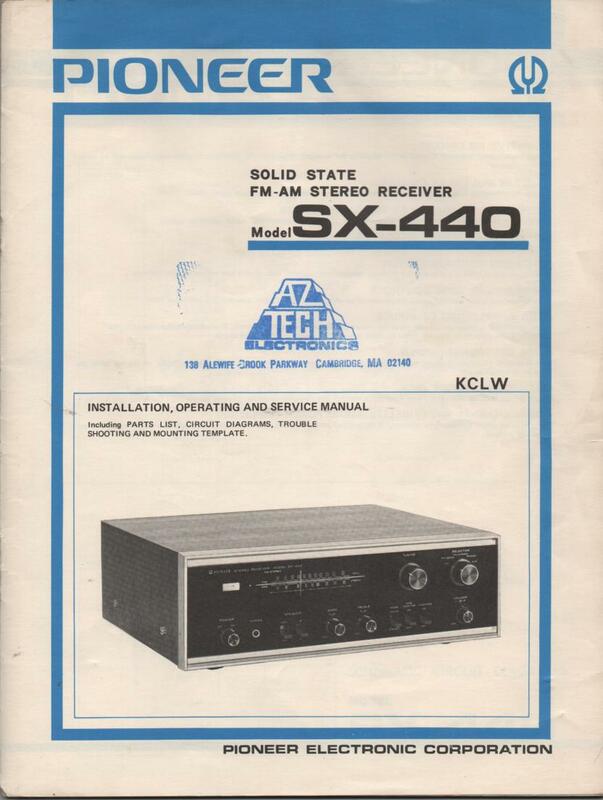 Manual PioneerSX-440 KCLW Receiver Owners Service Manual PHOTO COPY! 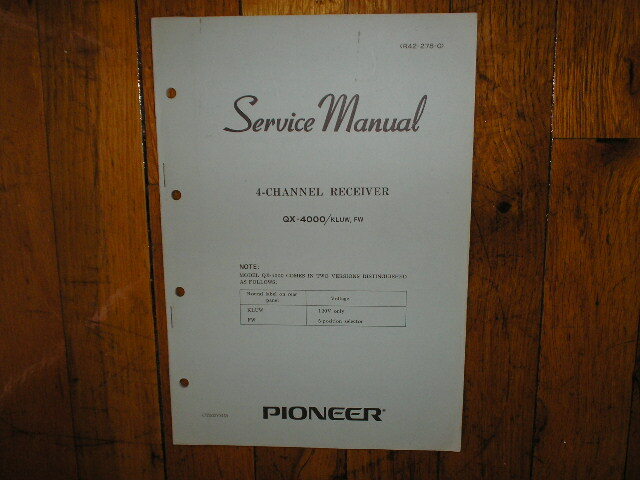 Manual PioneerSX-440 FW Receiver Owners Service Manual PHOTO COPY! Manual PioneerAFT12 schematic PHOTO COPY! 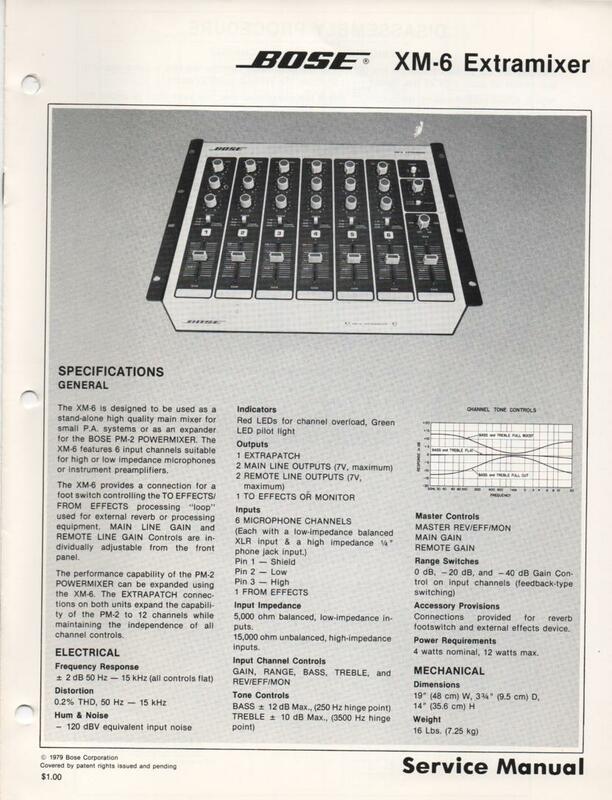 Manual PioneerER-420 Receiver schematic from diagram book 1 PHOTO COPY! 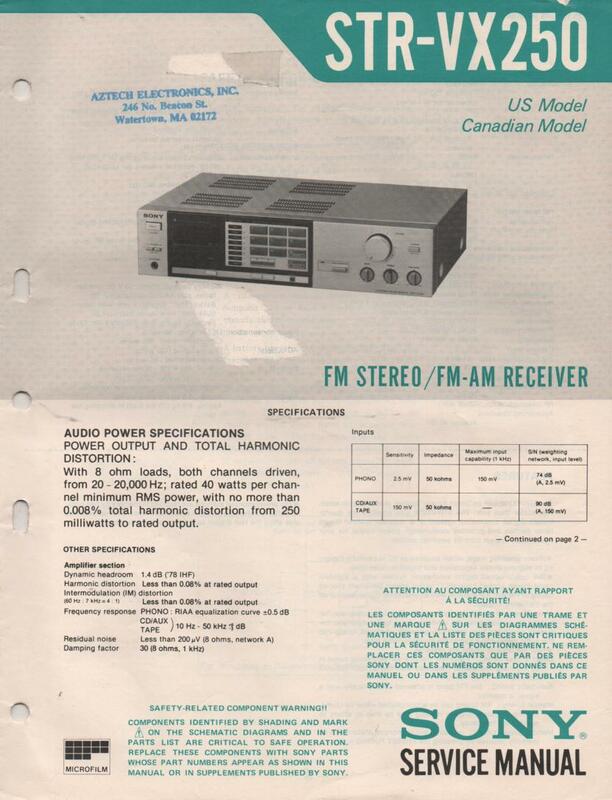 Manual PioneerFMB100 Receiver schematic...from diagram book 1 PHOTO COPY! 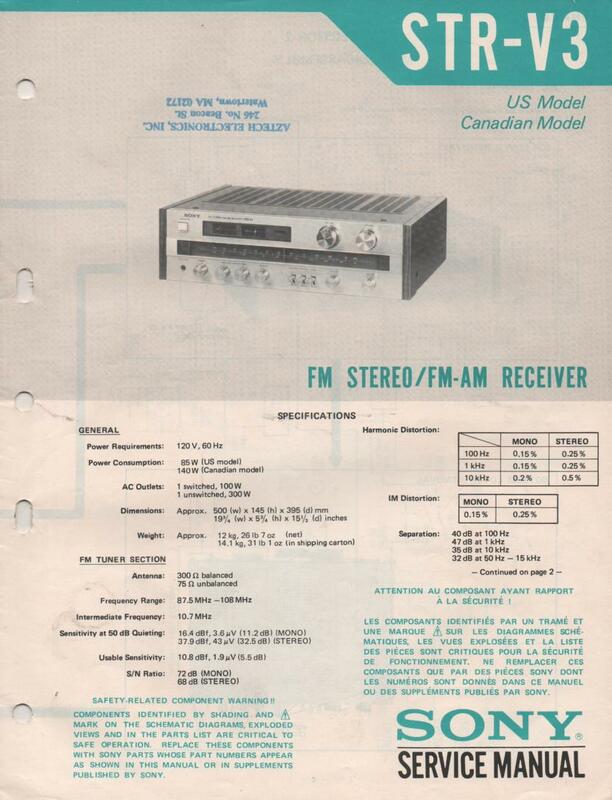 Manual PioneerFMB101 Receiver schematic...from diagram book 1 PHOTO COPY! 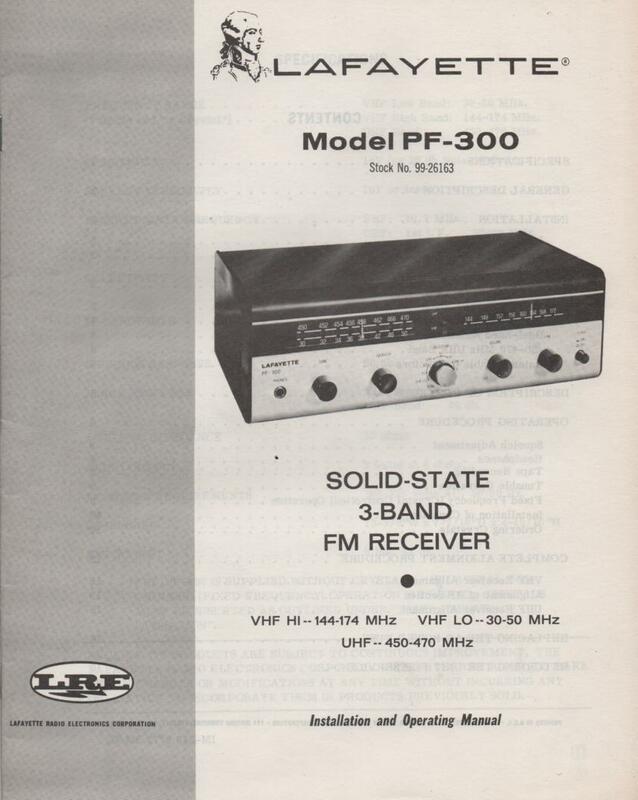 Manual PioneerFMB302 Receiver schematic...from diagram book 1 PHOTO COPY! 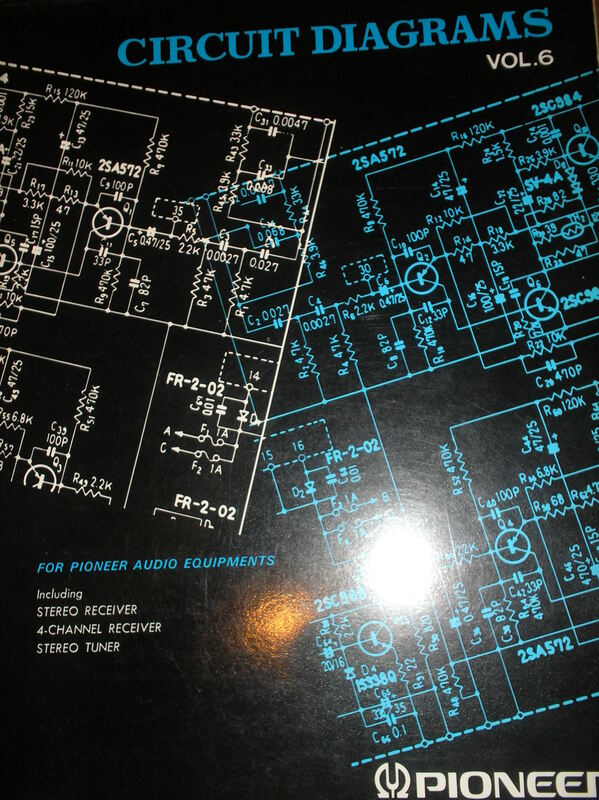 Manual PioneerFMR301 Receiver schematic...from diagram book 1 PHOTO COPY! Manual PioneerLK34 Receiver schematic...from diagram book 1 PHOTO COPY! Manual PioneerSMB160 Receiver Schematic PHOTO COPY! Manual PioneerSMB161 Receiver Schematic PHOTO COPY! Manual PioneerSMB180 Receiver Schematic PHOTO COPY! Manual PioneerSMB200 Receiver Schematic PHOTO COPY! Manual PioneerSMB200A Receiver Schematic PHOTO COPY! Manual PioneerSMB201 Receiver Schematic PHOTO COPY! Manual PioneerSM-G204 Receiver Schematic PHOTO COPY! Manual PioneerSM-G204B Receiver Schematic PHOTO COPY! Manual PioneerSM-G204E Receiver Schematic PHOTO COPY! Manual PioneerSMG205 Receiver Schematic PHOTO COPY! 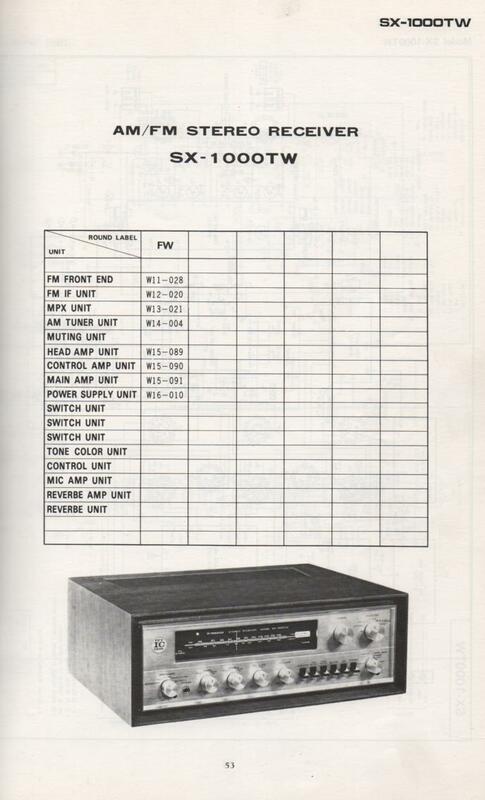 Manual PioneerSM-Q140 Receiver Schematic PHOTO COPY! Manual PioneerSM-Q141 Receiver Schematic PHOTO COPY! Manual PioneerSMQ300A Receiver Schematic PHOTO COPY! Manual PioneerSM-Q300B Receiver Schematic PHOTO COPY! Manual PioneerSMG300E Receiver Schematic PHOTO COPY! Manual PioneerSMG305 Receiver Schematic PHOTO COPY! Manual PioneerSMR150 Receiver Schematic PHOTO COPY! Manual PioneerSMR151 Receiver Schematic PHOTO COPY! Manual PioneerSX34 Receiver Schematic PHOTO COPY! Manual PioneerSX40 Receiver Schematic PHOTO COPY! Manual PioneerSX82 Receiver Schematic PHOTO COPY! Manual PioneerSX82E Receiver Schematic PHOTO COPY! Manual PioneerSX110 Receiver Schematic PHOTO COPY! 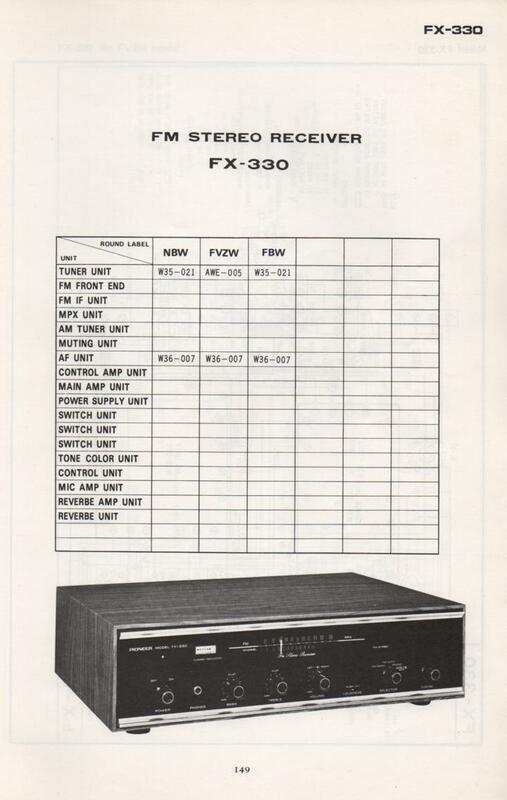 Manual PioneerSX800 Receiver Schematic PHOTO COPY! 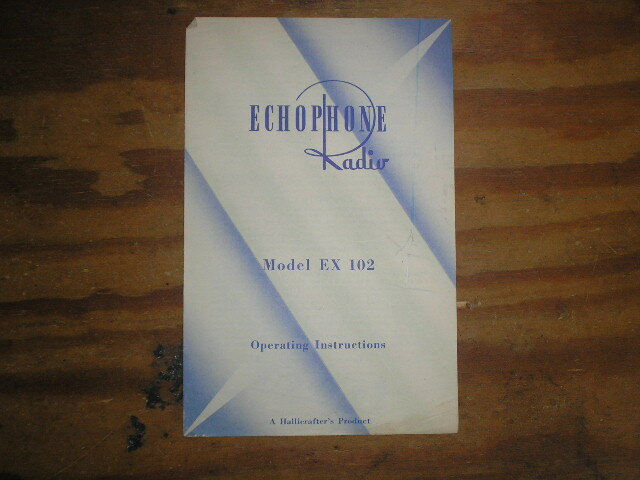 Manual PioneerSX1000T Receiver Schematic PHOTO COPY! Manual PioneerTX-5 Tuner Schematic PHOTO COPY! 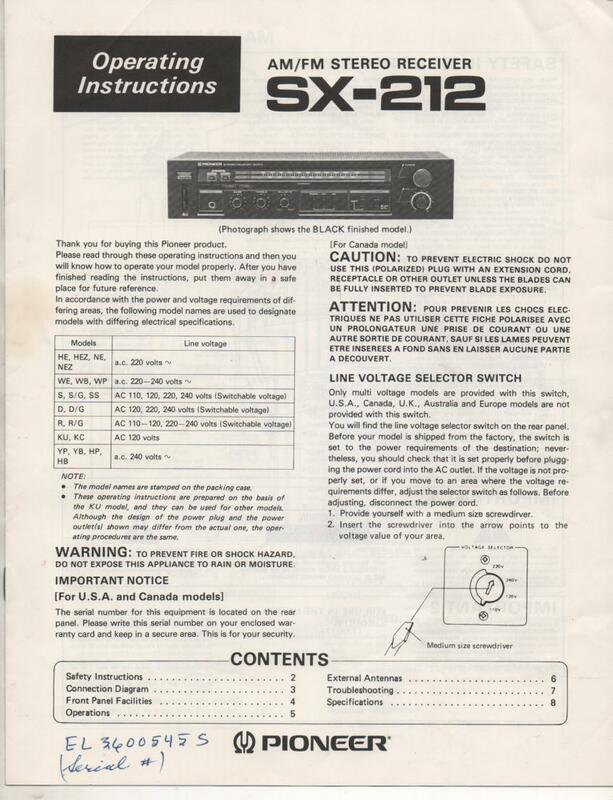 Manual PioneerSX-212 Receiver Owners Manual PHOTO COPY! 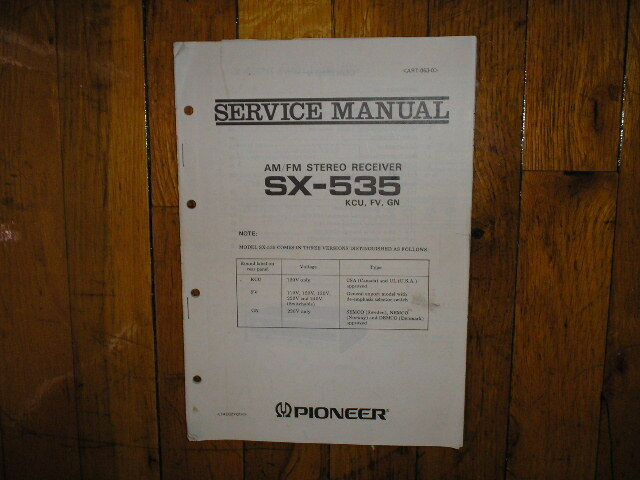 Manual PioneerSX-535 Receiver Owners Manual PHOTO COPY! Manual PIONEER SCHEMATIC MANUALSSX-330 Schematic Only. PHOTO COPY! Manual PIONEER SCHEMATIC MANUALSSX-440 Schematic Manual Only. It does not contain parts lists, alignments,etc. Schematics only. For SX-440 KCLW, FVW,FVZW,and NBW Types PHOTO COPY! Manual PIONEER SCHEMATIC MANUALSSX-525 Schematic Manual Only. It does not contain parts lists, alignments,etc. Schematics only PHOTO COPY! Manual PIONEER SCHEMATIC MANUALSSX-626 Schematic Manual Only. It does not contain parts lists, alignments,etc. Schematics only PHOTO COPY! 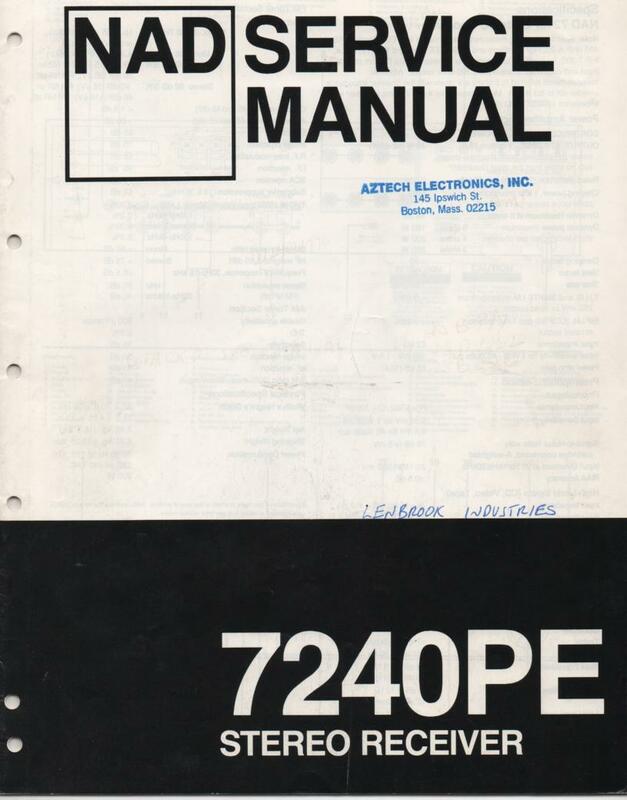 Manual PIONEER SCHEMATIC MANUALSSX-770 Schematic Manual Only. It does not contain parts lists, alignments,etc. Schematics only PHOTO COPY! Manual PIONEER SCHEMATIC MANUALSSX-990 Schematic Manual Only. It does not contain parts lists, alignments,etc. Schematics only PHOTO COPY! Manual PIONEER SCHEMATIC MANUALSSX-1000TW Schematic Manual Only. It does not contain parts lists, alignments,etc. Schematics only PHOTO COPY! 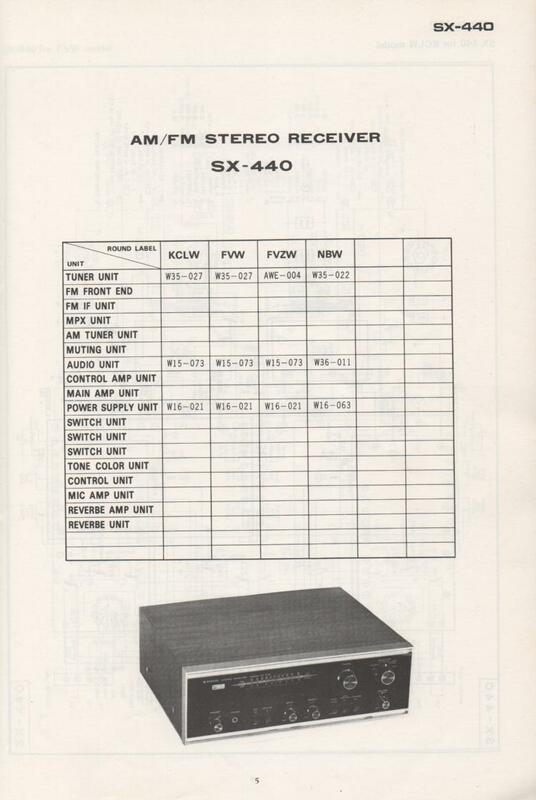 Manual PIONEER SCHEMATIC MANUALSSX-1500TD Receiver Schematic Only. PHOTO COPY! 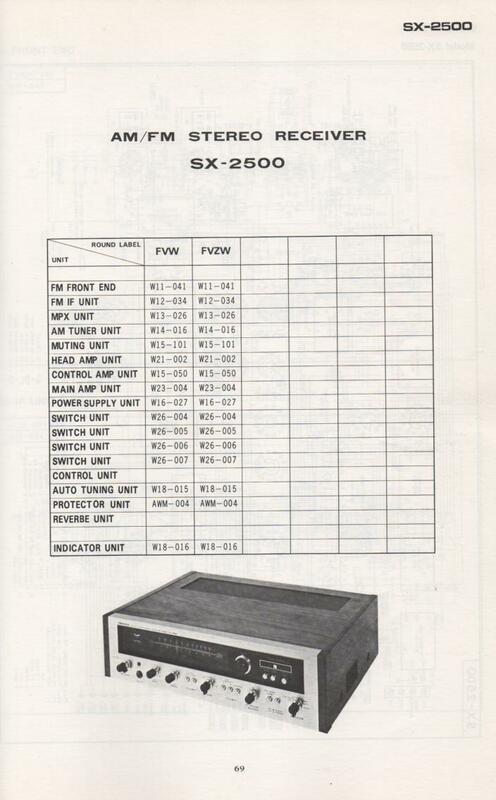 Manual PIONEER SCHEMATIC MANUALSSX-2500 Receiver Schematic PHOTO COPY! 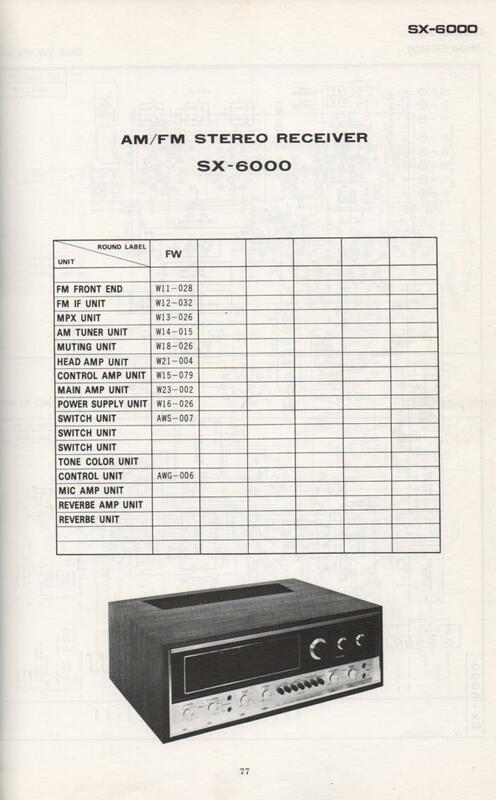 Manual PIONEER SCHEMATIC MANUALSSX-6000 Schematic Manual Only. It does not contain parts lists, alignments,etc. Schematics only PHOTO COPY! Manual PIONEER SCHEMATIC MANUALSSX-9000 Schematic Manual Only. It does not contain parts lists, alignments,etc. Schematics only PHOTO COPY! 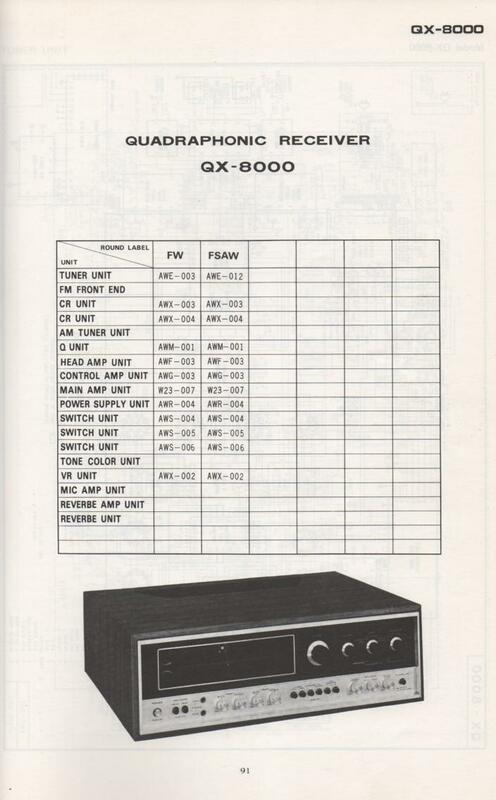 Manual PIONEER SCHEMATIC MANUALSQX-8000 Quadraphonic Receiver .. Schematic Manual Only. It does not contain parts lists, alignments,etc. Schematics only PHOTO COPY! Manual PIONEER SCHEMATIC MANUALSKX-330 Receiver Schematic Manual Only. It does not contain parts lists, alignments,etc. Schematics only PHOTO COPY! 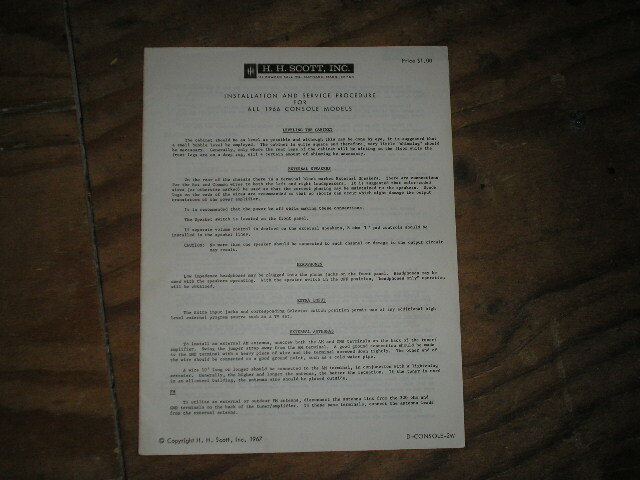 Manual PIONEER SCHEMATIC MANUALSKX-333 Receiver Schematic Manual Only. It does not contain parts lists, alignments,etc. Schematics only PHOTO COPY! Manual PIONEER SCHEMATIC MANUALSKX-440 Receiver Schematic Manual Only. It does not contain parts lists, alignments,etc. Schematics only PHOTO COPY! 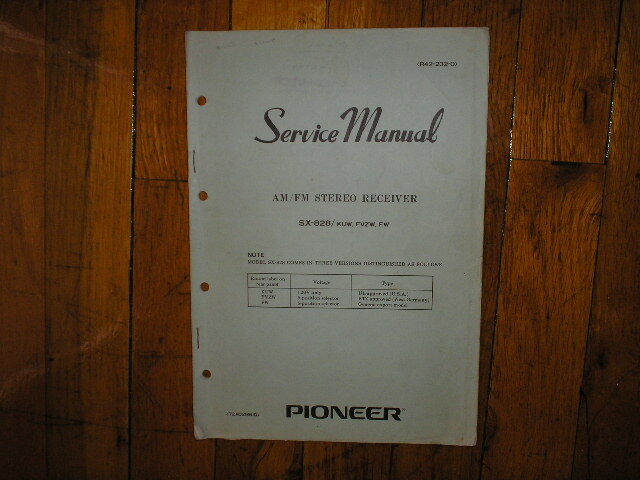 Manual PIONEER SCHEMATIC MANUALSKX-550 Receiver Schematic Manual Only. It does not contain parts lists, alignments,etc. Schematics only PHOTO COPY! Manual PIONEER SCHEMATIC MANUALSKX-555 Schematic Manual Only. It does not contain parts lists, alignments,etc. Schematics only PHOTO COPY! 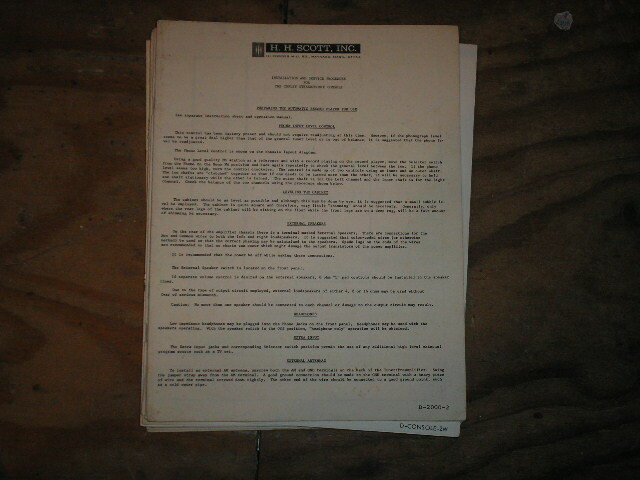 Manual PIONEER SCHEMATIC MANUALSLX-440 Receiver Schematic Manual Only. It does not contain parts lists, alignments,etc. Schematics only PHOTO COPY! Manual PIONEER SCHEMATIC MANUALSLX-440A Receiver Schematic Manual Only. It does not contain parts lists, alignments,etc. Schematics only PHOTO COPY! 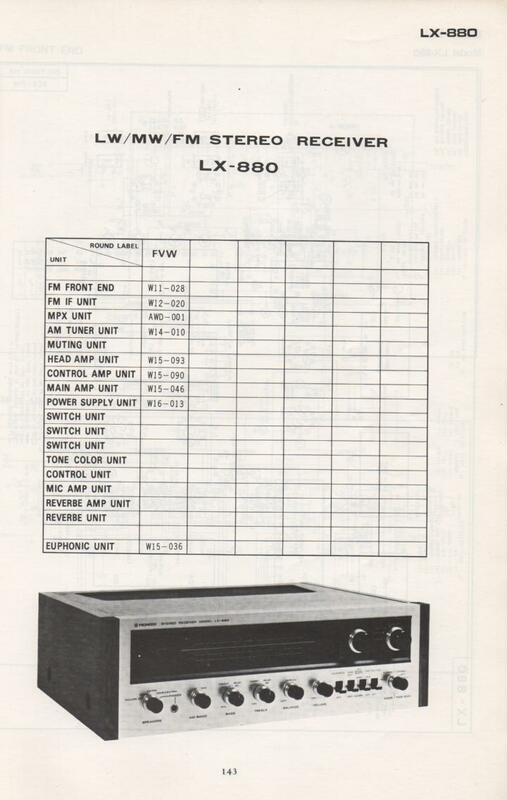 Manual PIONEER SCHEMATIC MANUALSLX-880 Receiver Schematic Manual Only. It does not contain parts lists, alignments,etc. Schematics only PHOTO COPY! Manual PIONEER SCHEMATIC MANUALSFX-330 Schematic Manual Only. It does not contain parts lists, alignments,etc. Schematics only PHOTO COPY! 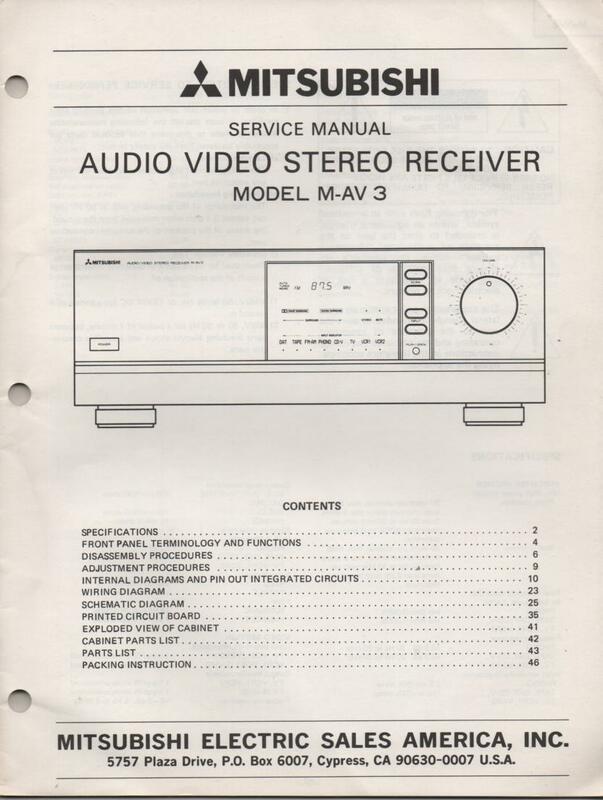 Manual PIONEER SCHEMATIC MANUALSAX-330 Receiver Schematic Manual Only. It does not contain parts lists, alignments,etc. Schematics only PHOTO COPY! 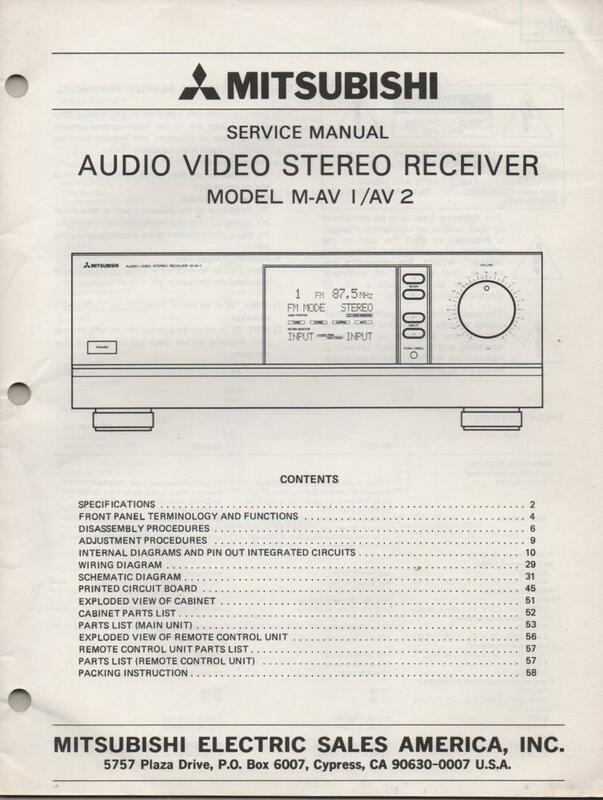 Manual PIONEER SCHEMATIC MANUALS300 Stereo Receiver fold out schematics. Book 6 PHOTO COPY! Manual PIONEER SCHEMATIC MANUALSKX-303 Receiver fold out schematics. Book 6 PHOTO COPY! 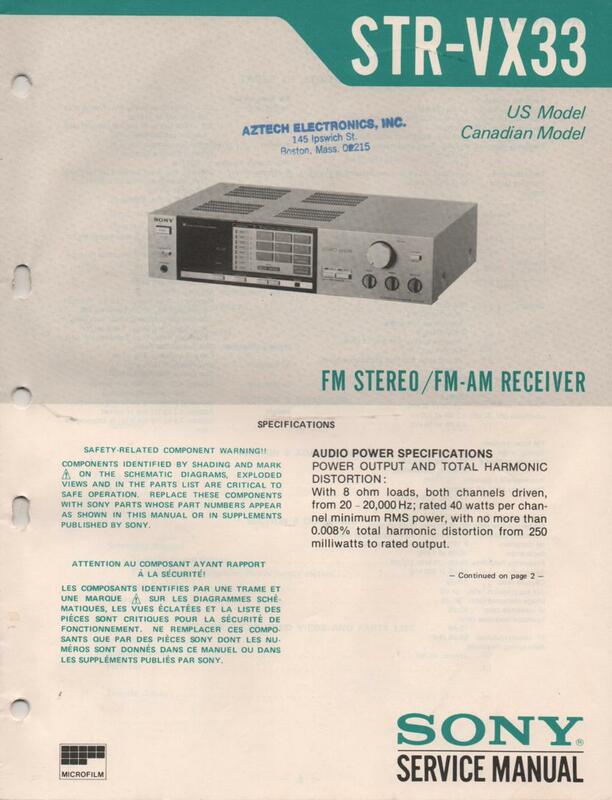 Manual PIONEER SCHEMATIC MANUALSKX-404 Stereo Receiver fold out schematics. Book 6 PHOTO COPY! 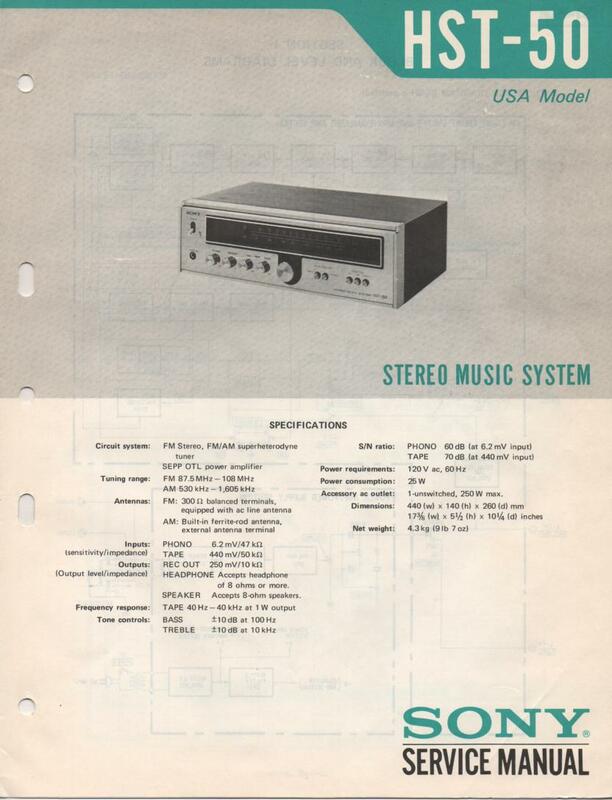 Manual PIONEER SCHEMATIC MANUALSKX-505 Stereo Receiver fold out schematics. Book 6 PHOTO COPY! 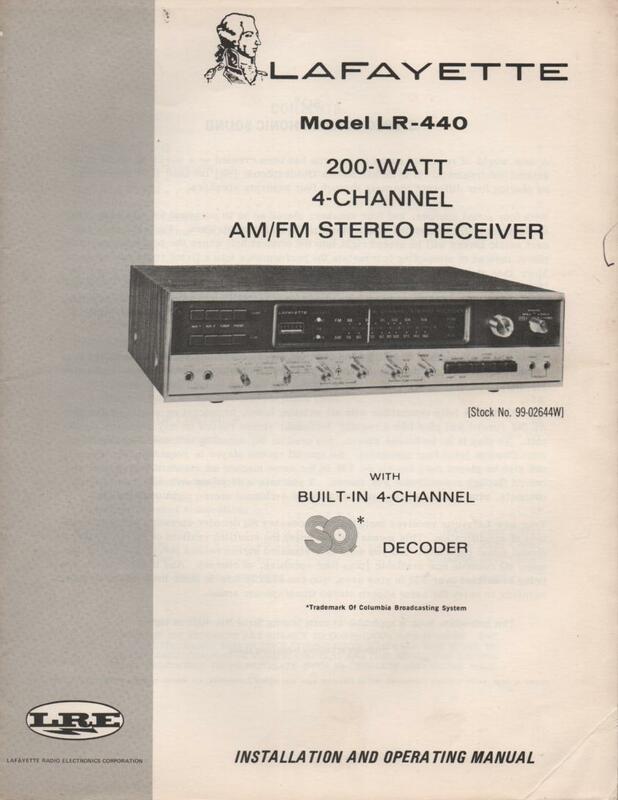 Manual PIONEER SCHEMATIC MANUALSLX-424 Stereo Receiver fold out schematics. Book 6 PHOTO COPY! 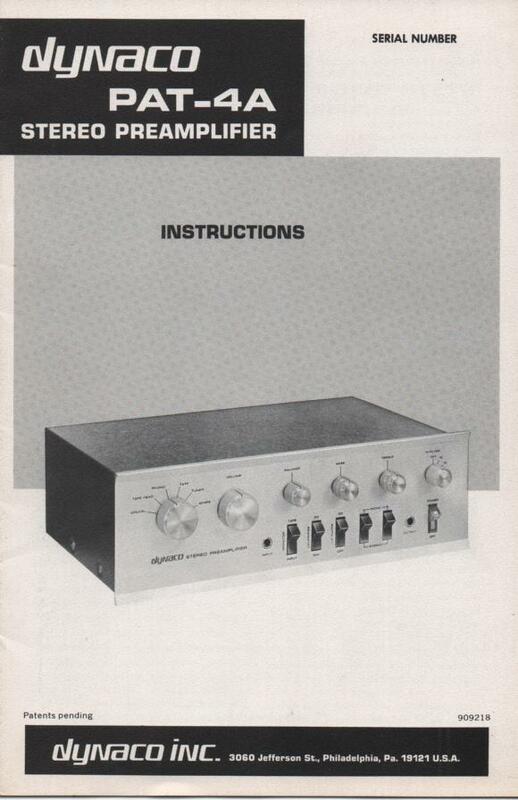 Manual PIONEER SCHEMATIC MANUALSLX-434 Stereo Receiver fold out schematics. Book 6 PHOTO COPY! Manual PIONEER SCHEMATIC MANUALSLX-626 Stereo Receiver fold out schematics. Book 6 PHOTO COPY! 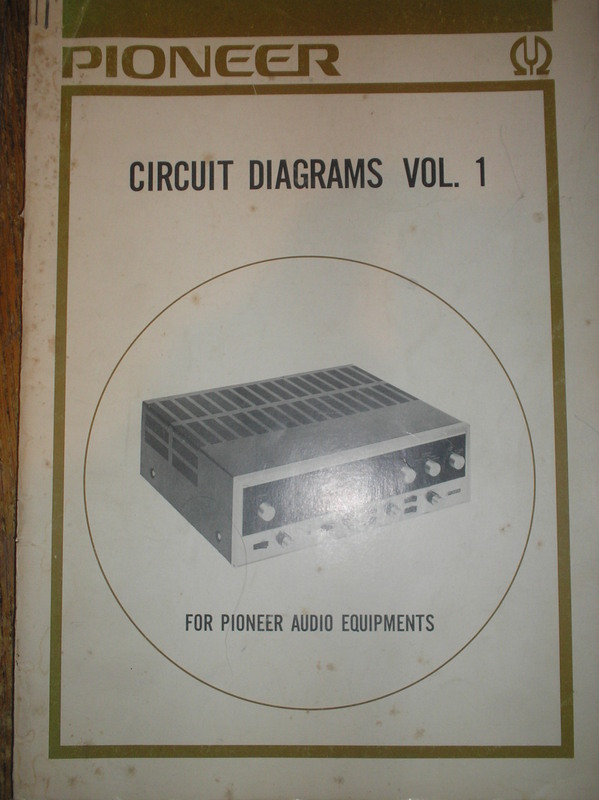 Manual PIONEER SCHEMATIC MANUALSQX-646 Stereo Receiver fold out schematics. Book 6 PHOTO COPY! 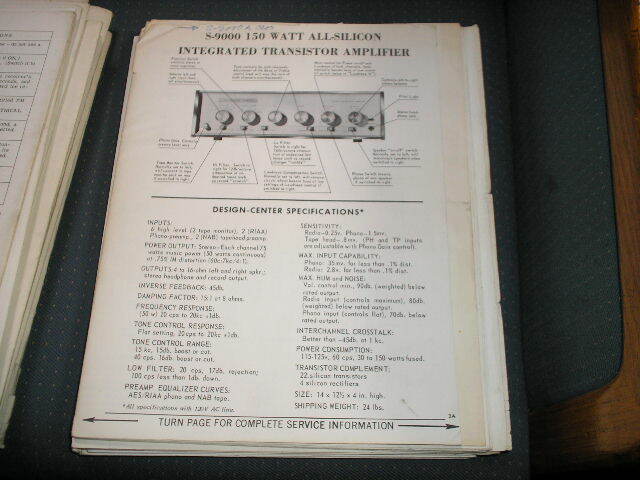 Manual PIONEER SCHEMATIC MANUALSQX-747 Stereo Receiver fold out schematics. Book 6 PHOTO COPY! Manual PIONEER SCHEMATIC MANUALSQX-949 Stereo Receiver fold out schematics. Book 6 PHOTO COPY! 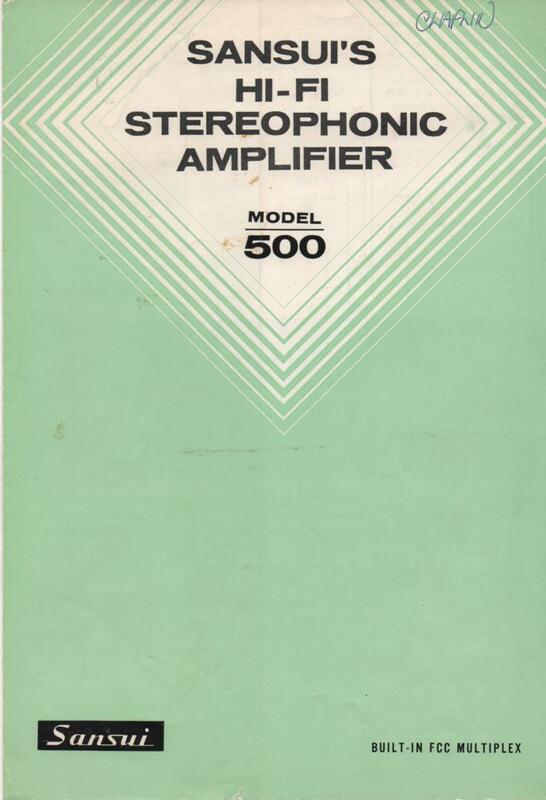 Manual PIONEER SCHEMATIC MANUALSSX-300 Stereo Receiver schematics. Book 6 PHOTO COPY! 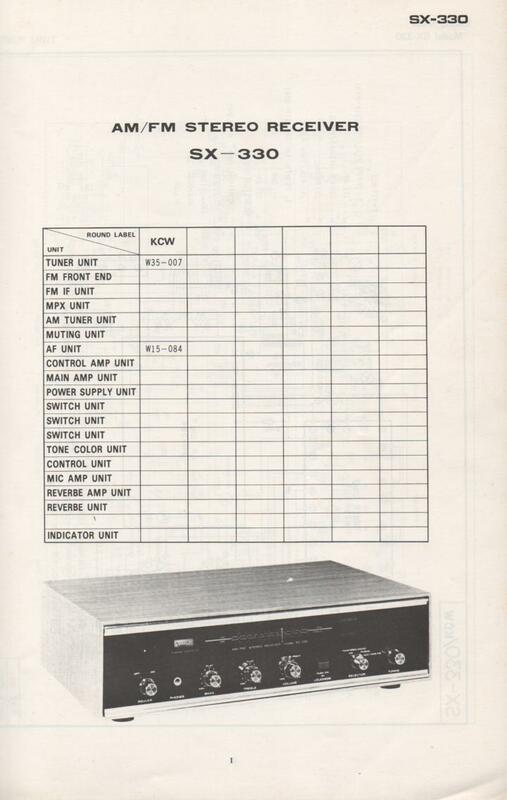 Manual PIONEER SCHEMATIC MANUALSSX-300D Stereo Receiver schematics. Book 6 PHOTO COPY! 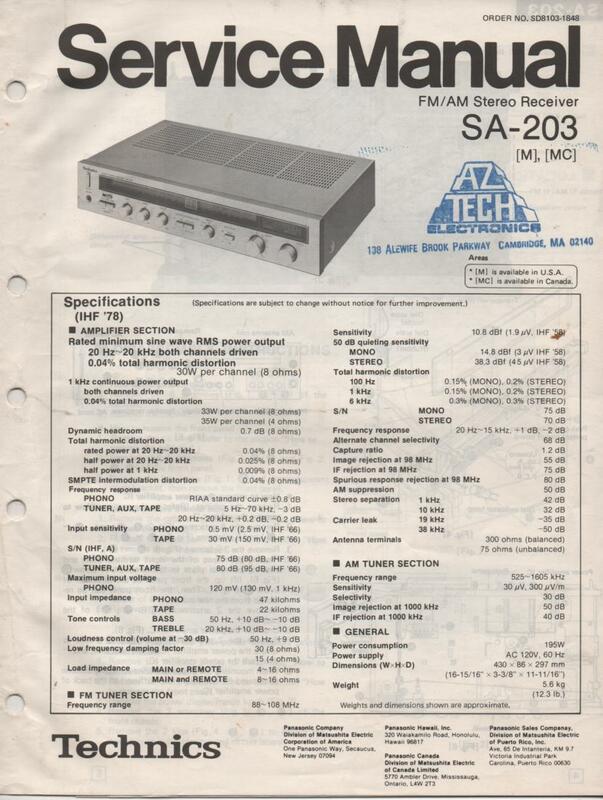 Manual PIONEER SCHEMATIC MANUALSSX-300W Stereo Receiver fold out schematics. Book 6 PHOTO COPY! 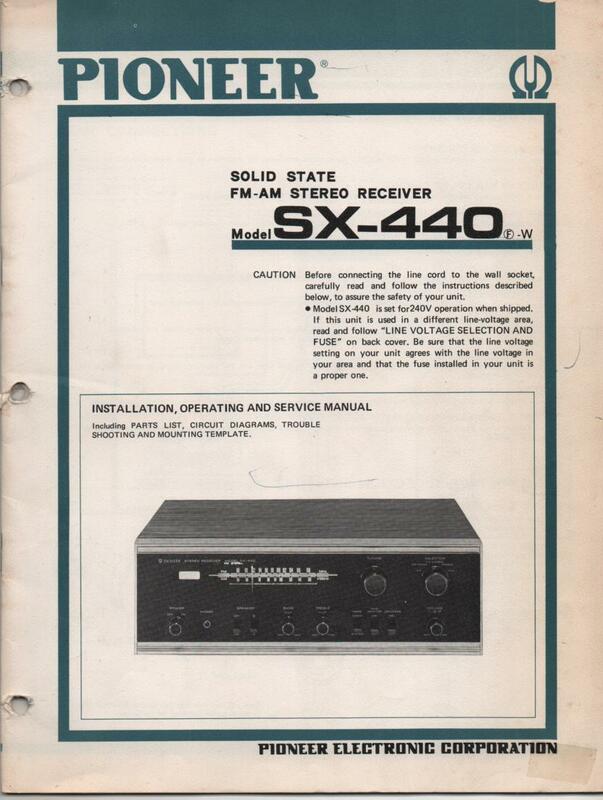 Manual PIONEER SCHEMATIC MANUALSSX-424 Stereo Receiver fold out schematics. Book 6 PHOTO COPY! 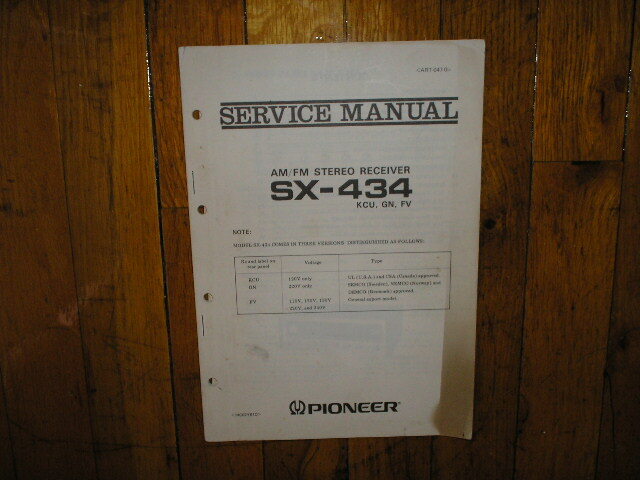 Manual PIONEER SCHEMATIC MANUALSSX-434 Stereo Receiver fold out schematics. Book 6 PHOTO COPY! Manual PIONEER SCHEMATIC MANUALSSX-525 Stereo Receiver schematic. Book 6 PHOTO COPY! 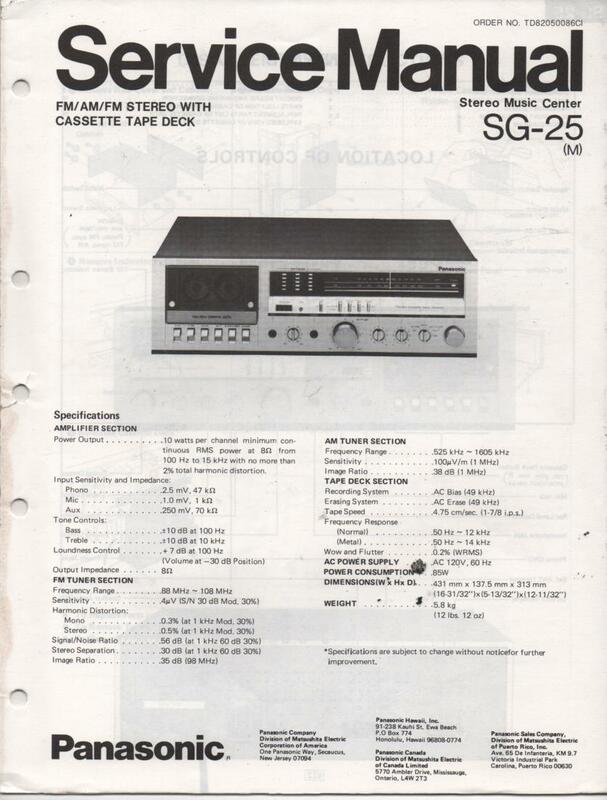 Manual PIONEER SCHEMATIC MANUALSSX-535 Stereo Receiver fold out schematics. Book 6 PHOTO COPY! Manual PIONEER SCHEMATIC MANUALSSX-626 Stereo Receiver schematics. Book 6 PHOTO COPY! 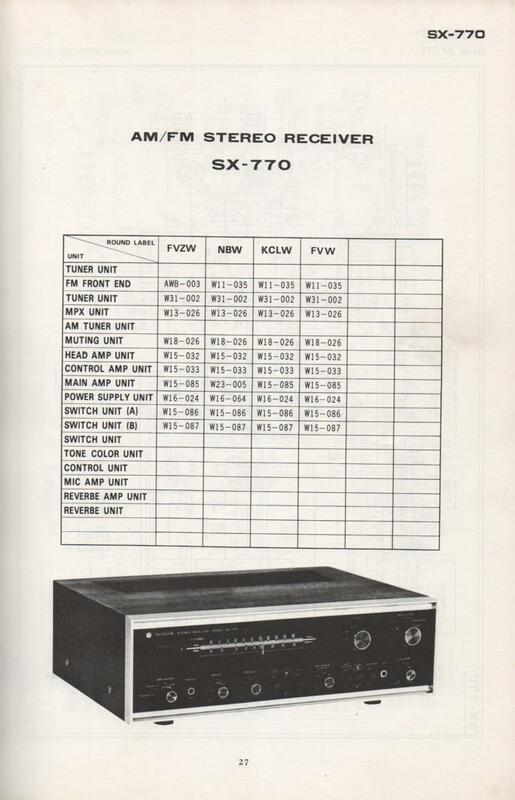 Manual PIONEER SCHEMATIC MANUALSSX-727 Stereo Receiver fold out schematics. Book 6 PHOTO COPY! Manual PIONEER SCHEMATIC MANUALSSX-737 Stereo Receiver fold out schematics. Book 6 PHOTO COPY! Manual PIONEER SCHEMATIC MANUALSSX-828 Stereo Receiver fold out schematics. Book 6 PHOTO COPY! 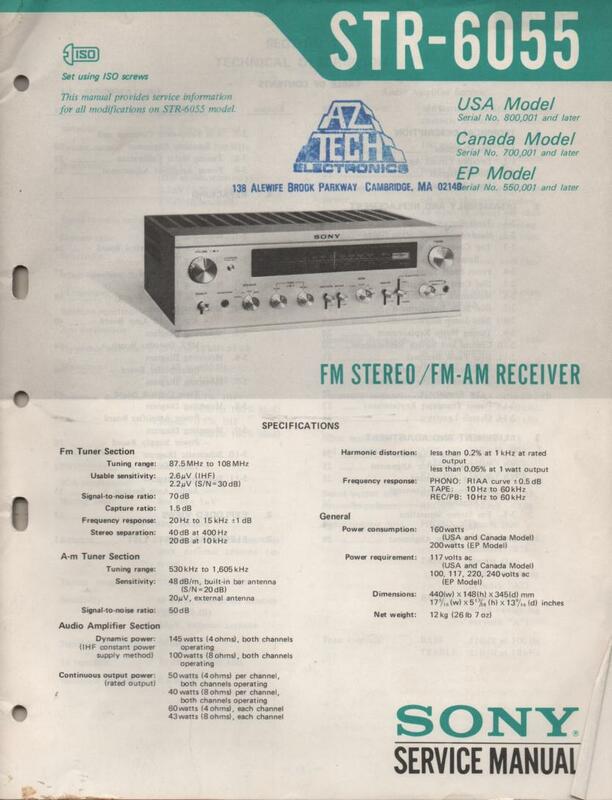 Manual PIONEER SCHEMATIC MANUALSSX-838 Stereo Receiver fold out schematics. Book 6 PHOTO COPY! 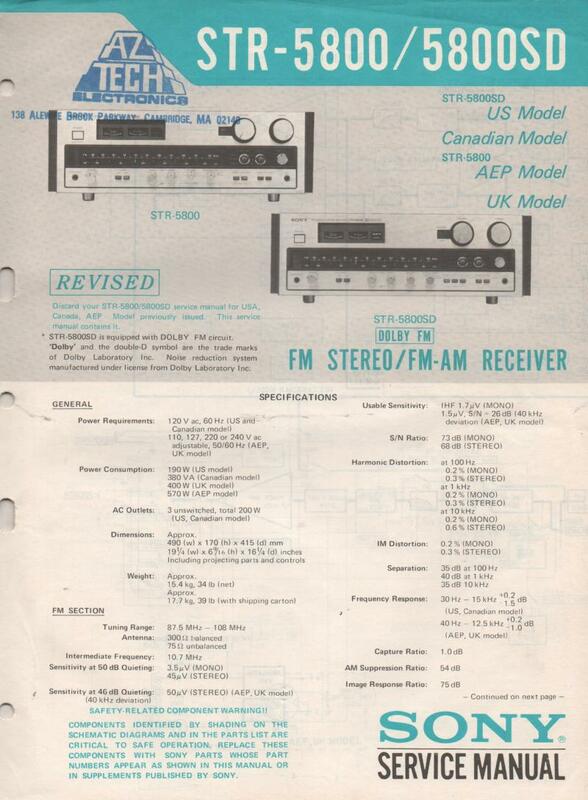 Manual PIONEER SCHEMATIC MANUALSSX-939 Stereo Receiver fold out schematics. Book 6 PHOTO COPY! 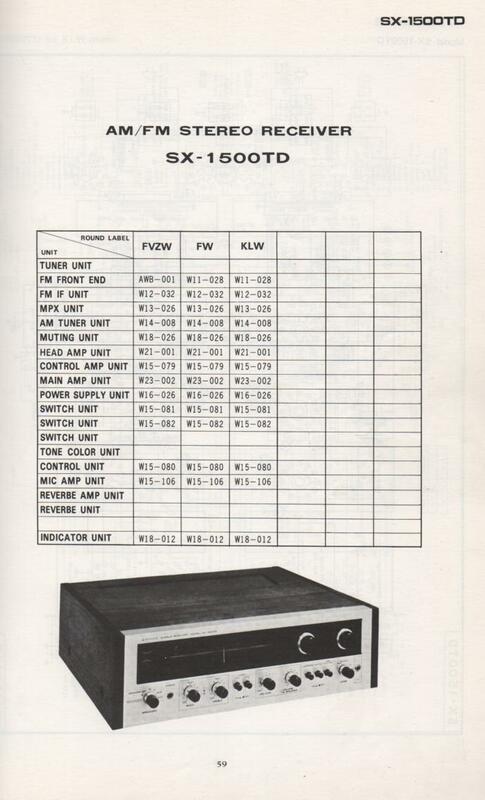 Manual PIONEER SCHEMATIC MANUALSSX-1010 Stereo Receiver fold out schematics. Book 6 PHOTO COPY! Manual PIONEER SCHEMATIC MANUALSSX-3000 Stereo Receiver schematics. Book 6 PHOTO COPY! 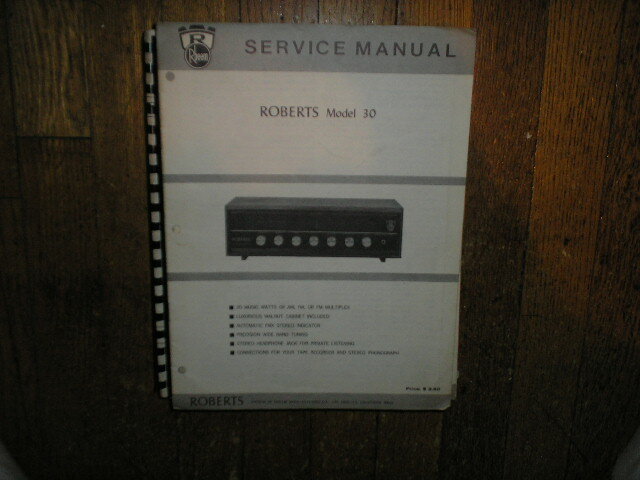 Manual ROBERTS30 Stereo Receiver Service Manual PHOTO COPY! 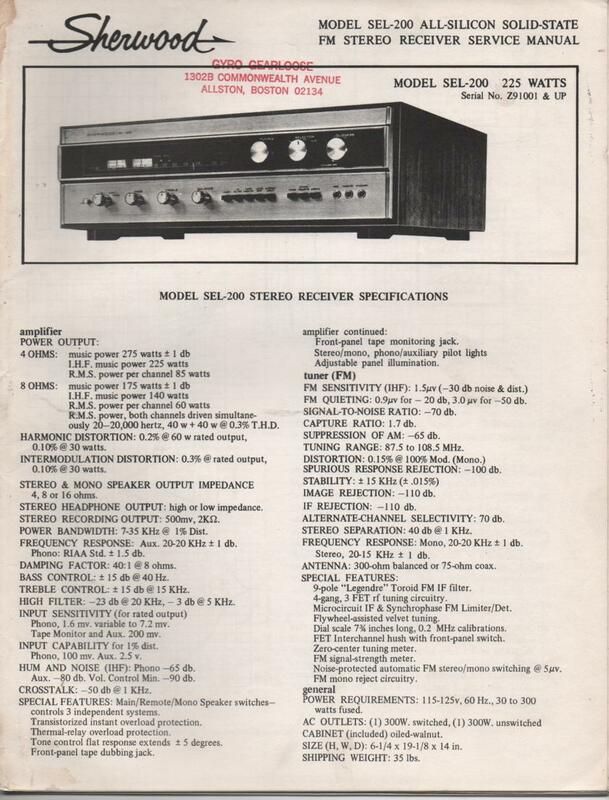 Manual ROBERTS30 50 Stereo Receiver Owners Manual PHOTO COPY! 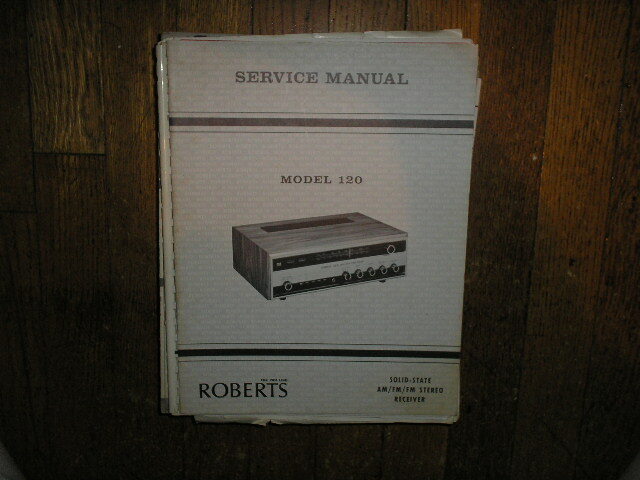 Manual ROBERTS120 Stereo Receiver Service Manual PHOTO COPY! Manual ROBERTS5000X Schematic Only PHOTO COPY! 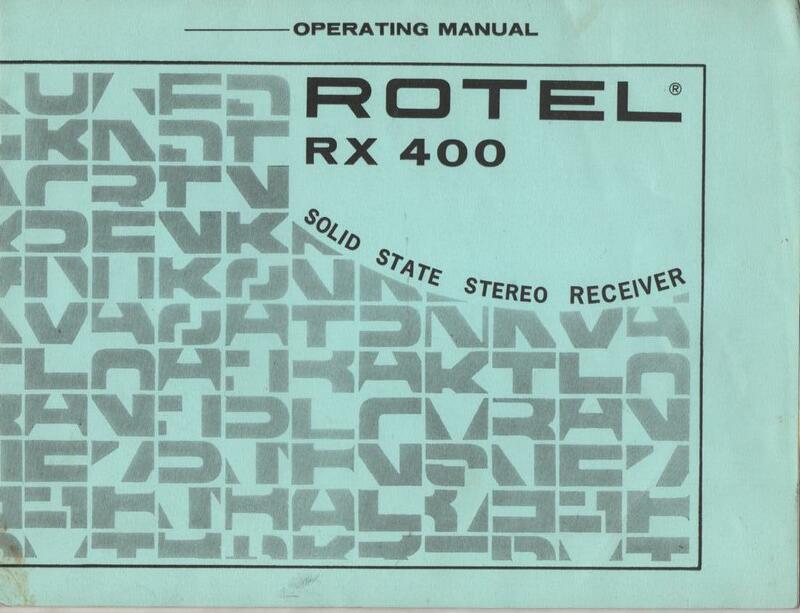 Manual ROTELRX-400 Receiver Owners Manual with Schematic PHOTO COPY! 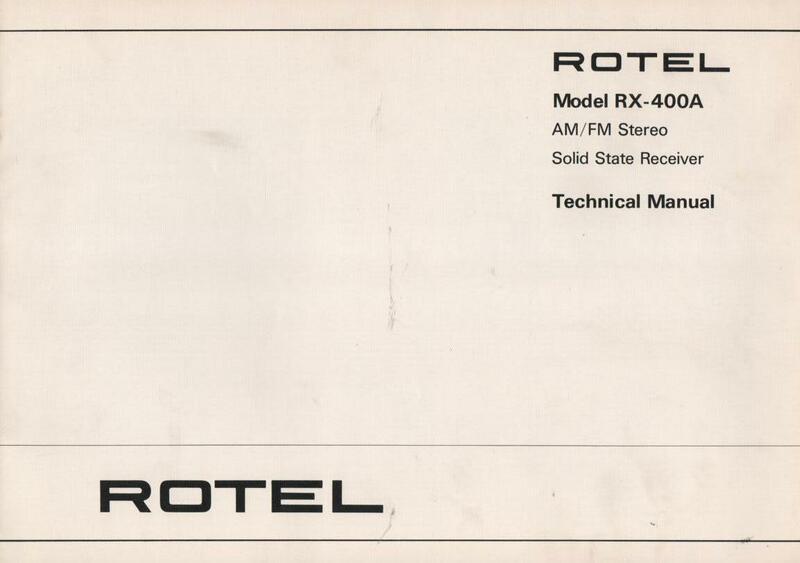 Manual ROTELRX-400A Receiver Service Manual PHOTO COPY! 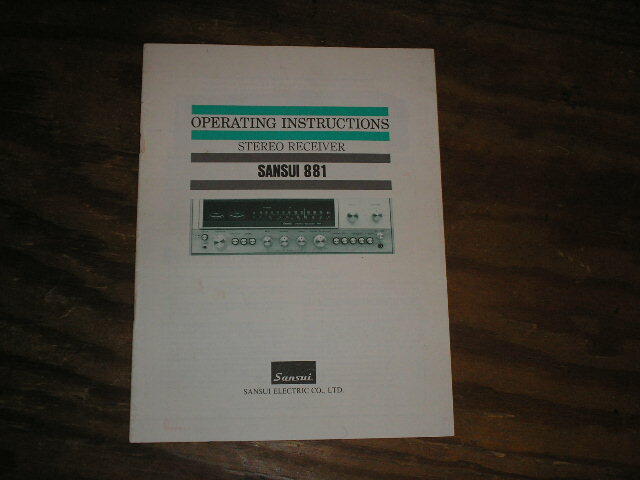 Manual Sansui881 Receiver Operating Instruction Manual PHOTO COPY! 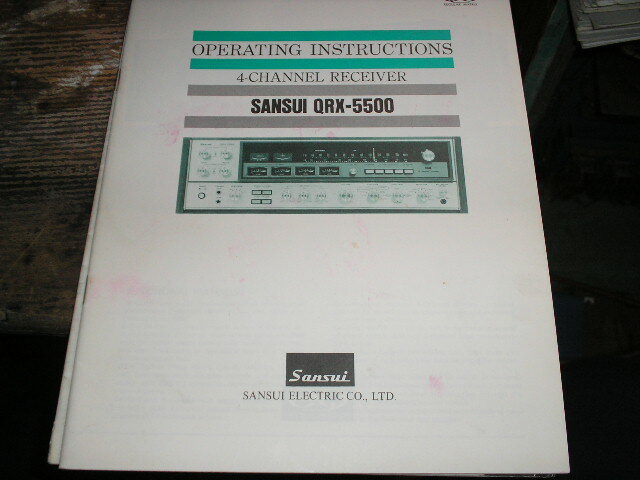 Manual SansuiQRX-5500 Receiver Operating Instruction Manual PHOTO COPY! 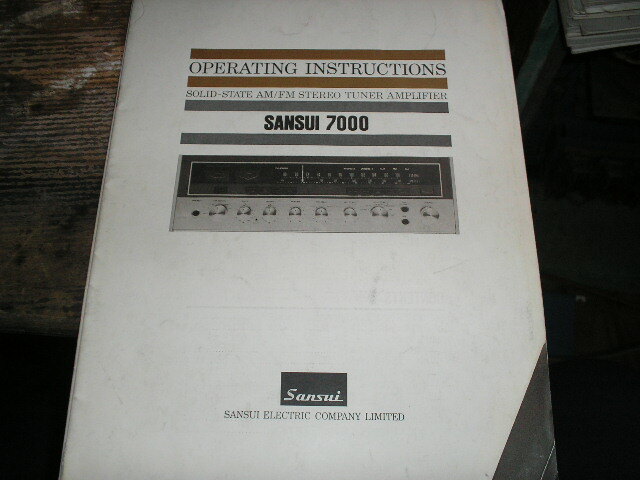 Manual Sansui7000 Receiver Operating Instruction Manual PHOTO COPY! 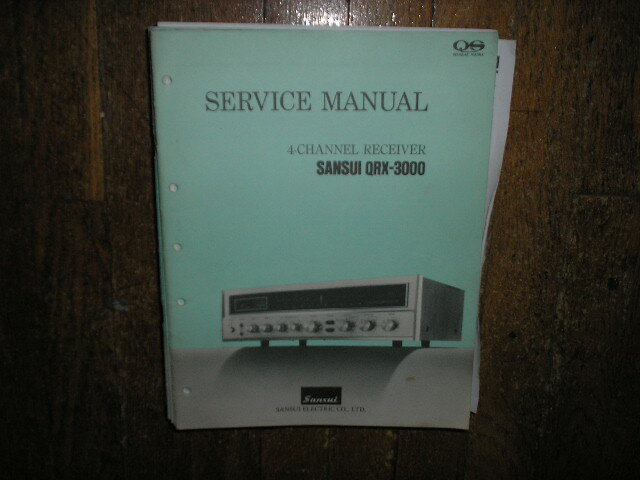 Manual SansuiQRX-3000 Receiver Service Manual PHOTO COPY! 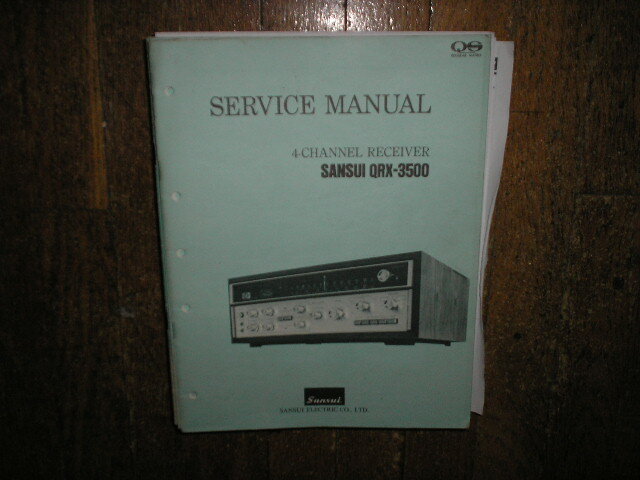 Manual SansuiQRX-3500 Receiver Service Manual PHOTO COPY! Manual SansuiQRX-5500 Receiver Service Manual PHOTO COPY! 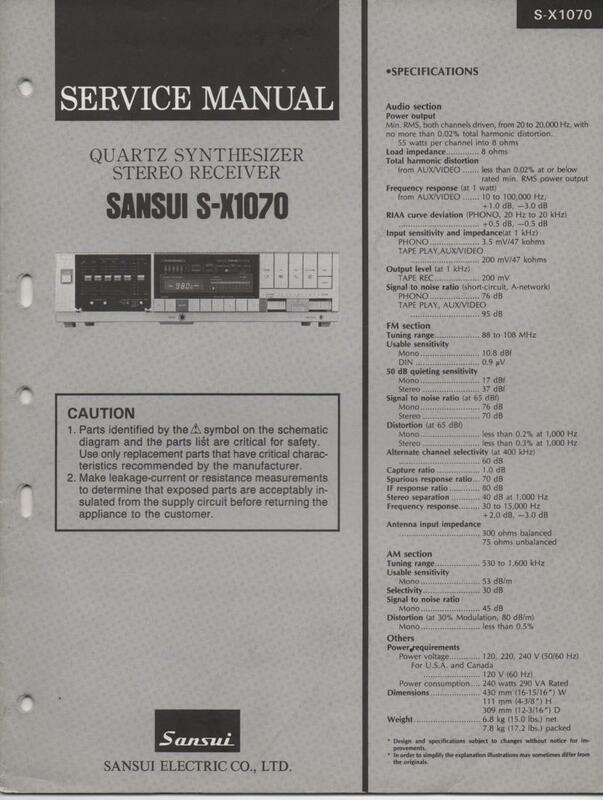 Manual SansuiQRX-7001 Receiver Service Manual PHOTO COPY! 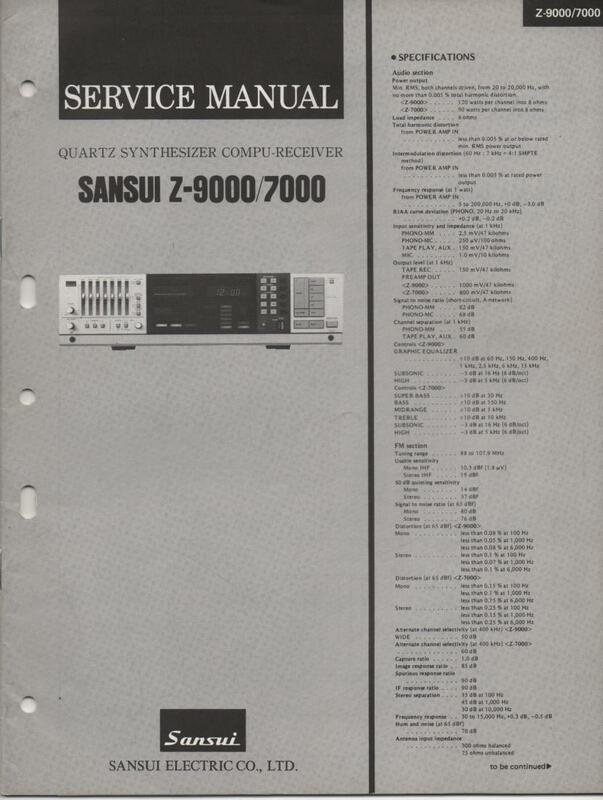 Manual SansuiQRX-7500 Receiver Service Manual PHOTO COPY! Manual Sansui221 331 331L 331SS Receiver Service Manual PHOTO COPY! 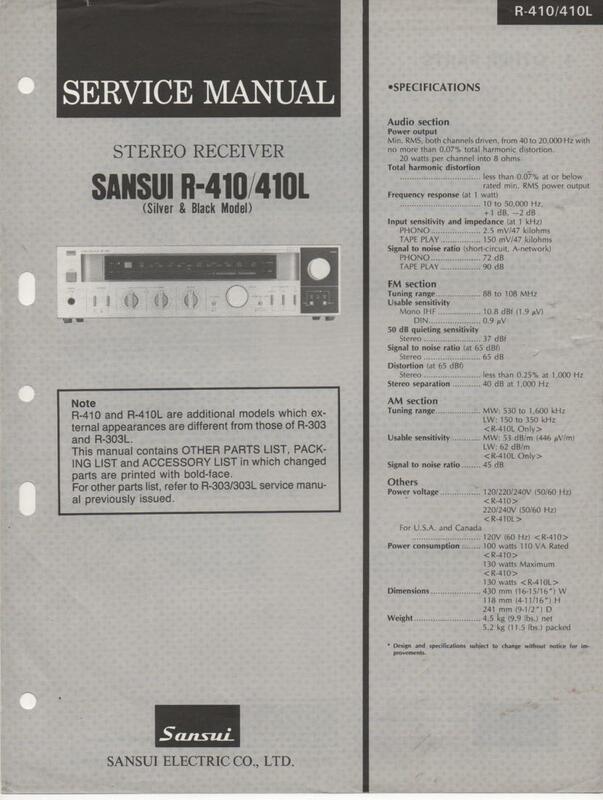 Manual Sansui441 Receiver Service Manual PHOTO COPY! 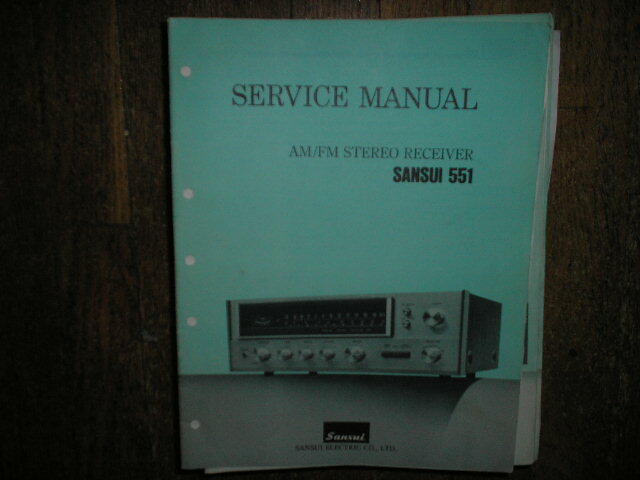 Manual Sansui551 Receiver Service Manual PHOTO COPY! 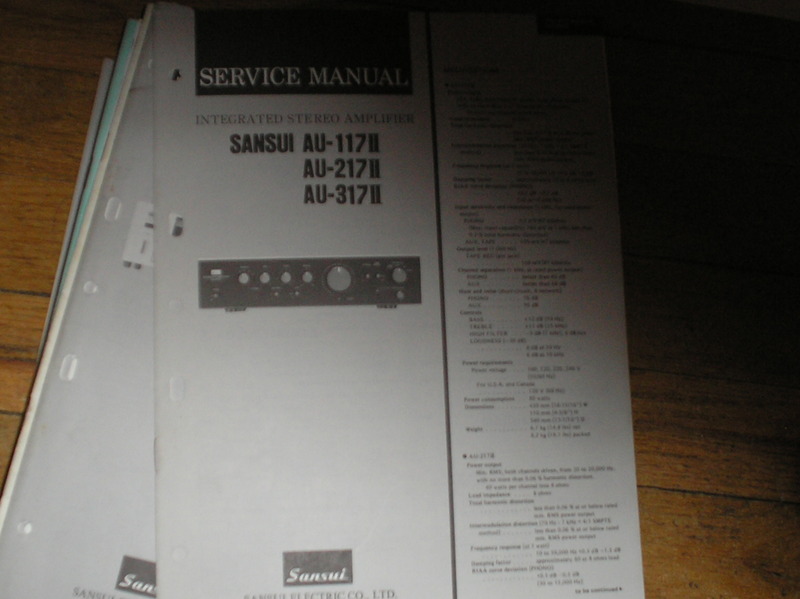 Manual Sansui661 Receiver Service Manual PHOTO COPY! Manual Sansui550 5050 6060 Receiver Service Manual PHOTO COPY! 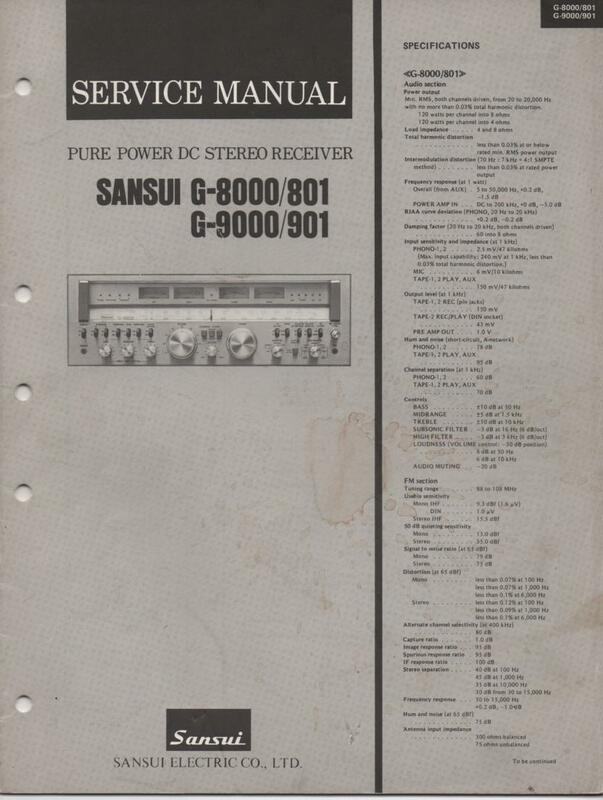 Manual Sansui8080DB 9090DB 890DB 990DB Receiver Service Manual PHOTO COPY! 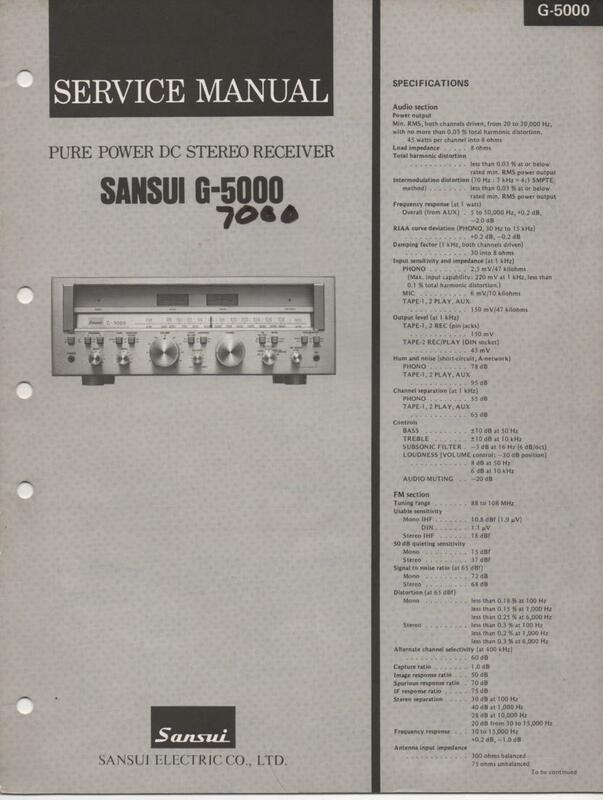 Manual Sansui8080 9090DB Receiver Service Manual PHOTO COPY! 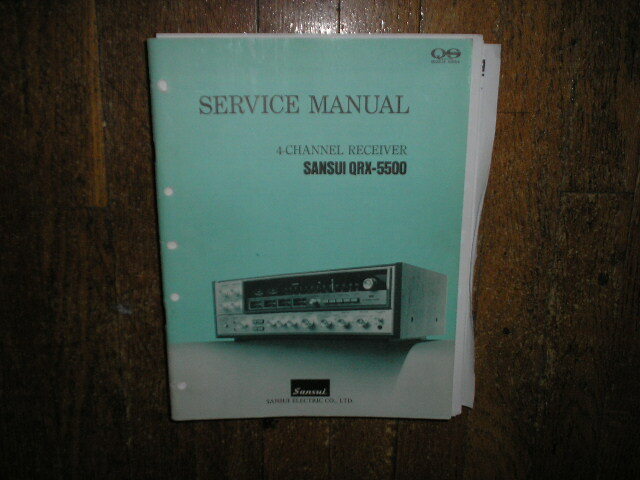 Manual SansuiQRX-5001 Receiver Service Manual PHOTO COPY! 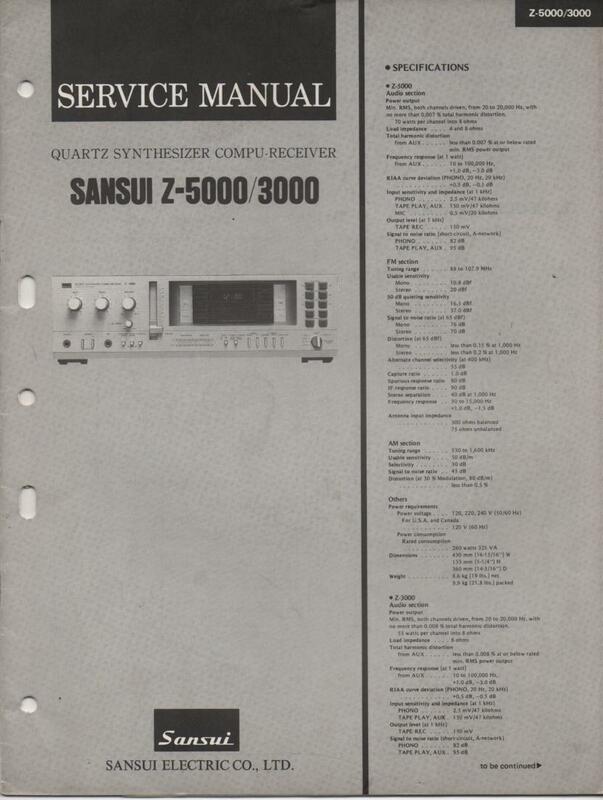 Manual SansuiQR-4500 Receiver Service Manual PHOTO COPY! 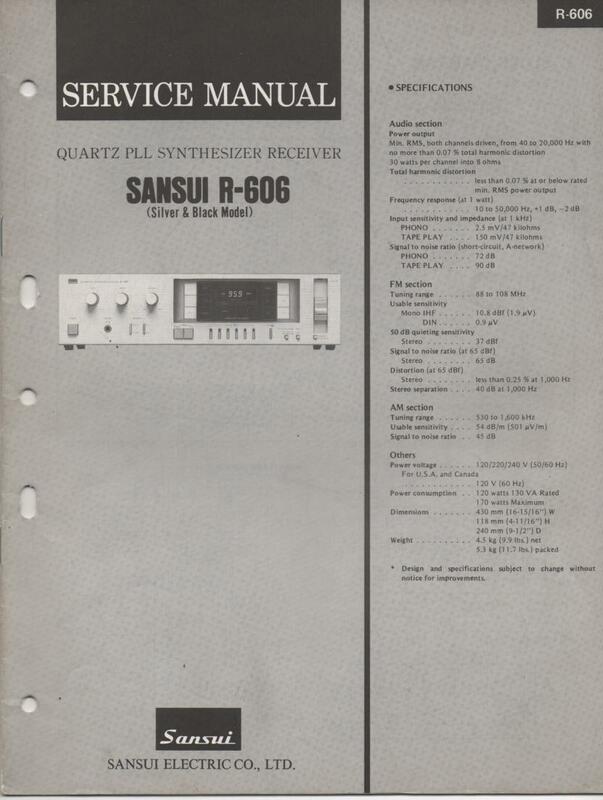 Manual SansuiQR-6500 Receiver Service Manual PHOTO COPY! 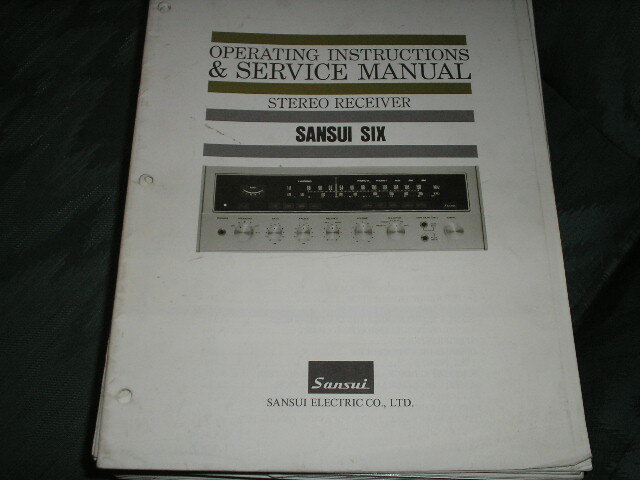 Manual Sansui6 Six Receiver Operating Instruction Manual PHOTO COPY! 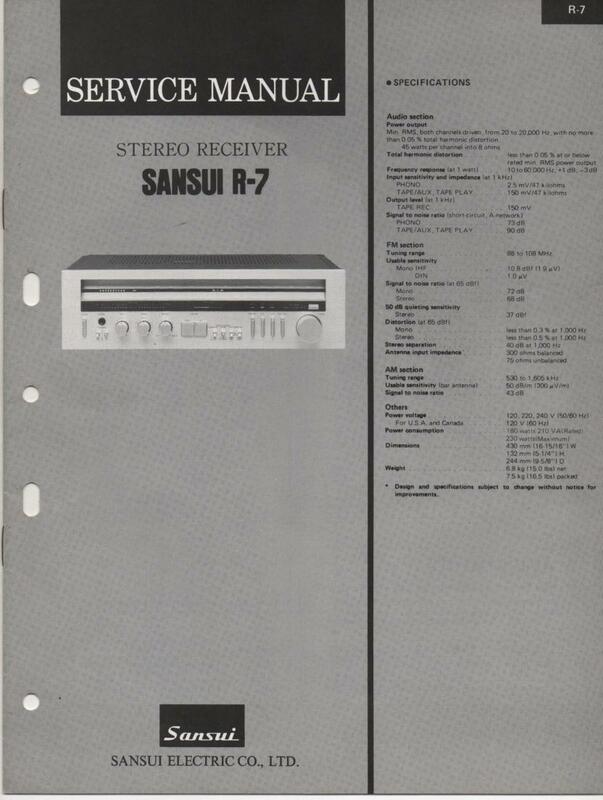 Manual Sansui7 Seven Receiver Operating Instruction Manual PHOTO COPY! 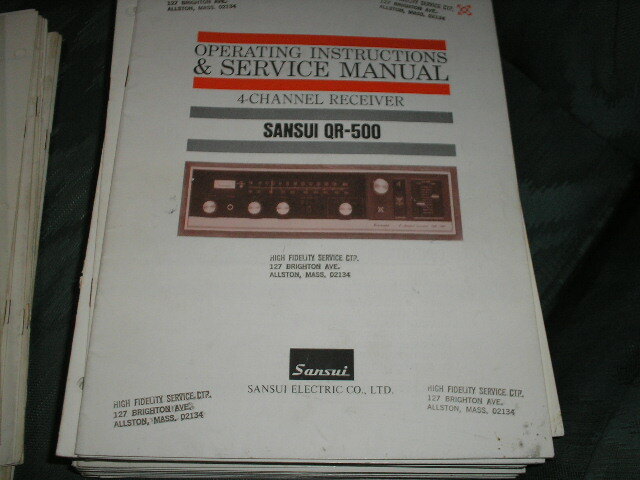 Manual SansuiQR-500 Receiver Operating Instruction Service Manual PHOTO COPY! 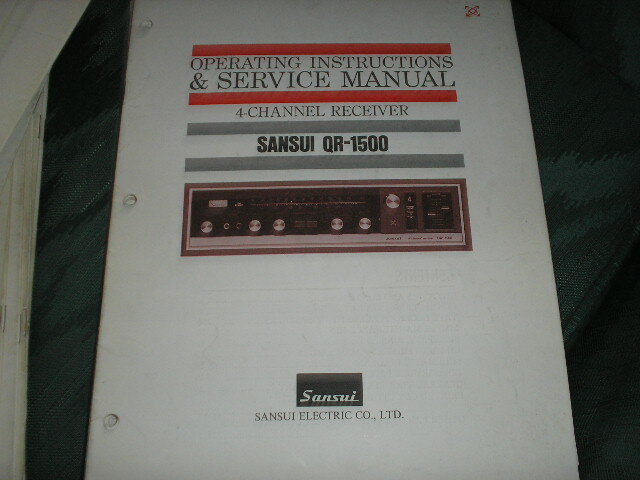 Manual SansuiQR-1500 Receiver Operating Instruction Service Manual PHOTO COPY! 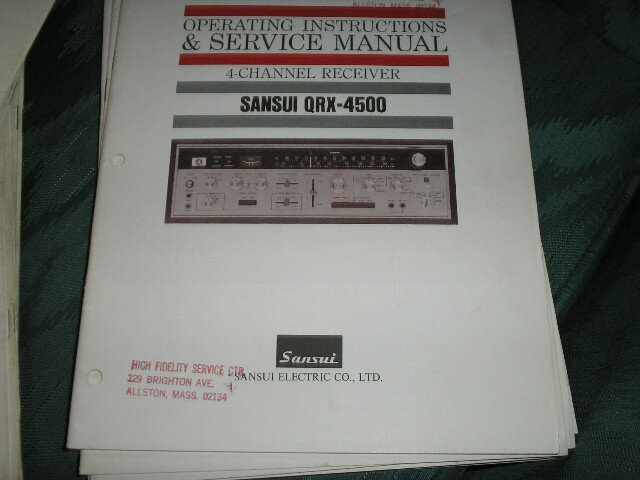 Manual SansuiQRX-4500 Receiver Operating Instruction Service Manual PHOTO COPY! 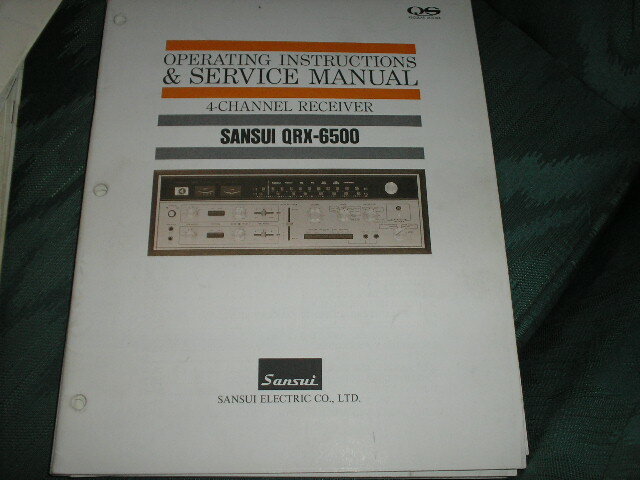 Manual SansuiQRX-6500 Receiver Operating Instruction Service Manual PHOTO COPY! 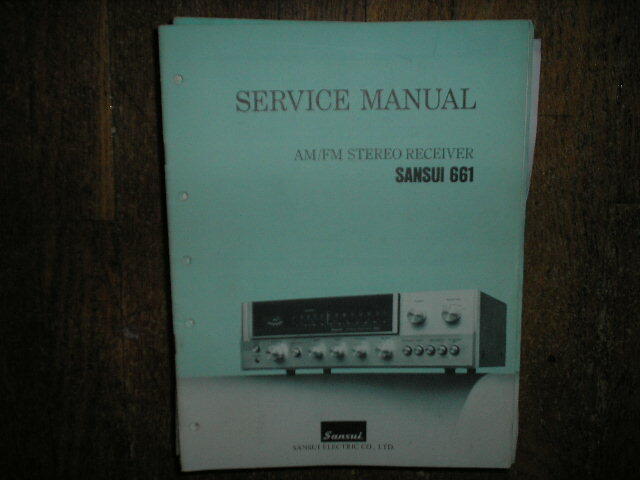 Manual Sansui6 Six Receiver Service Instruction Manual PHOTO COPY! 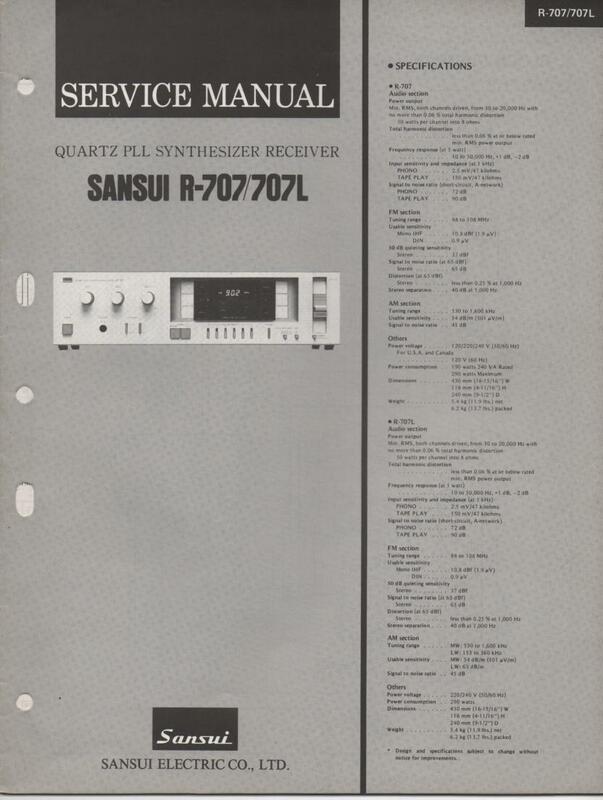 Manual Sansui7 Seven Receiver Service Instruction Manual PHOTO COPY! 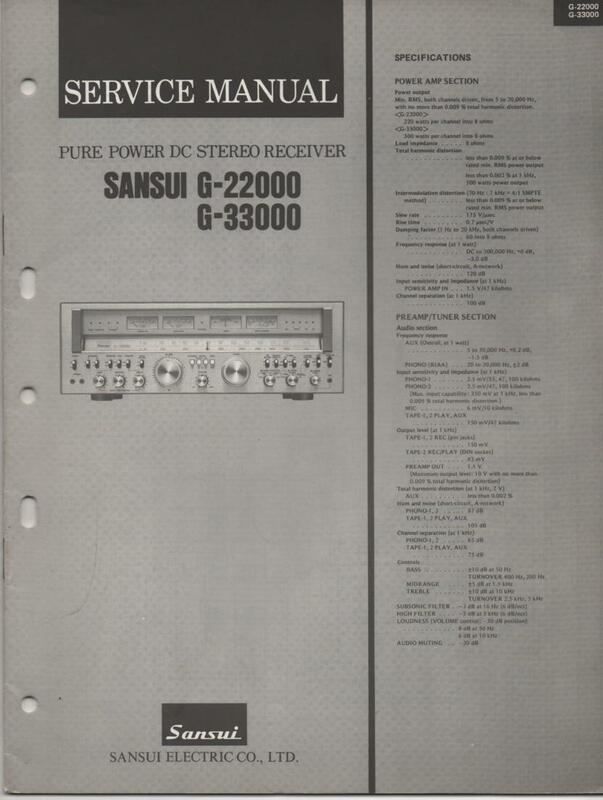 Manual Sansui3900Z 4900Z 5900Z Receiver Service Manual PHOTO COPY! 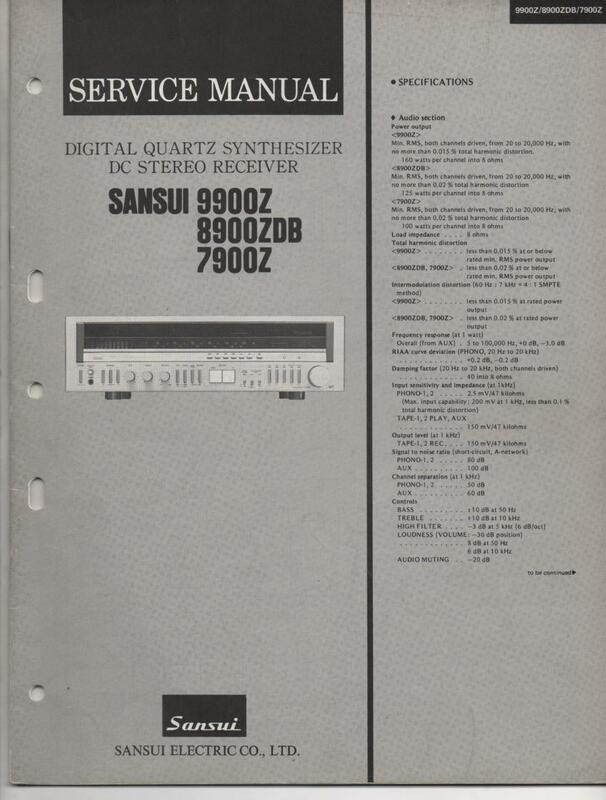 Manual Sansui7900Z 8900ZDB 9900Z Receiver Service Manual PHOTO COPY! 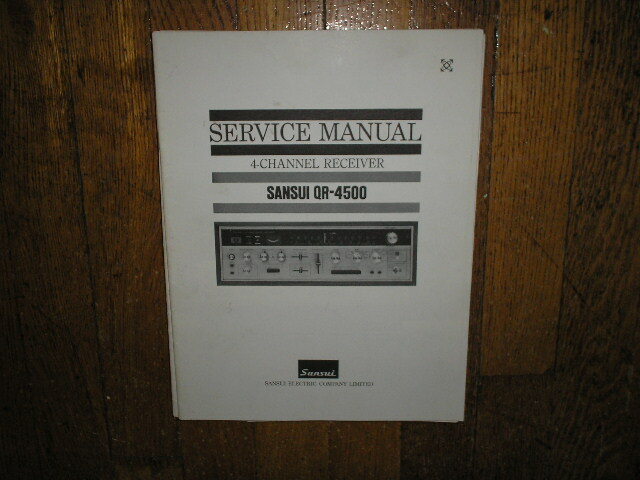 Manual SansuiG-301 G-401 G-3500 G-4500 Receiver Service Manual PHOTO COPY! 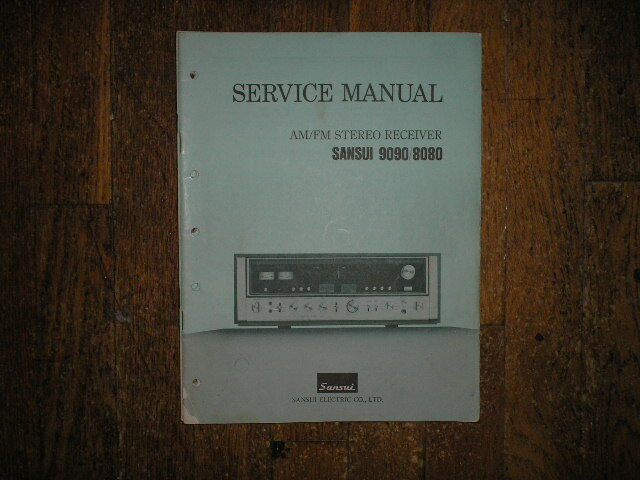 Manual SansuiG-801 G-901 G-8000 G-9000 Receiver Service Manual PHOTO COPY! 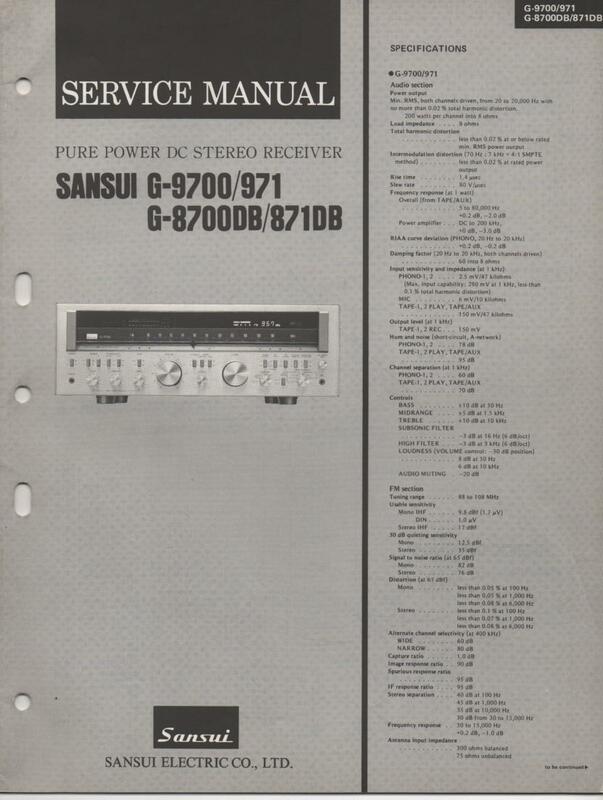 Manual SansuiG-871DB G-971 G-8700DB G-9700 Receiver Service Manual PHOTO COPY! 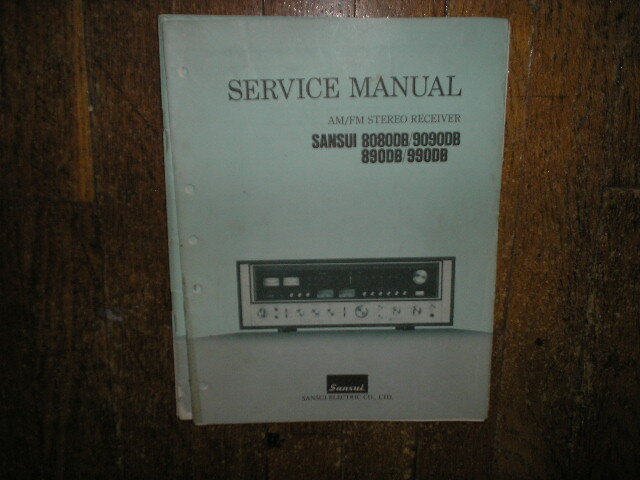 Manual SansuiG-2000 G-3000 Receiver Service Manual PHOTO COPY! 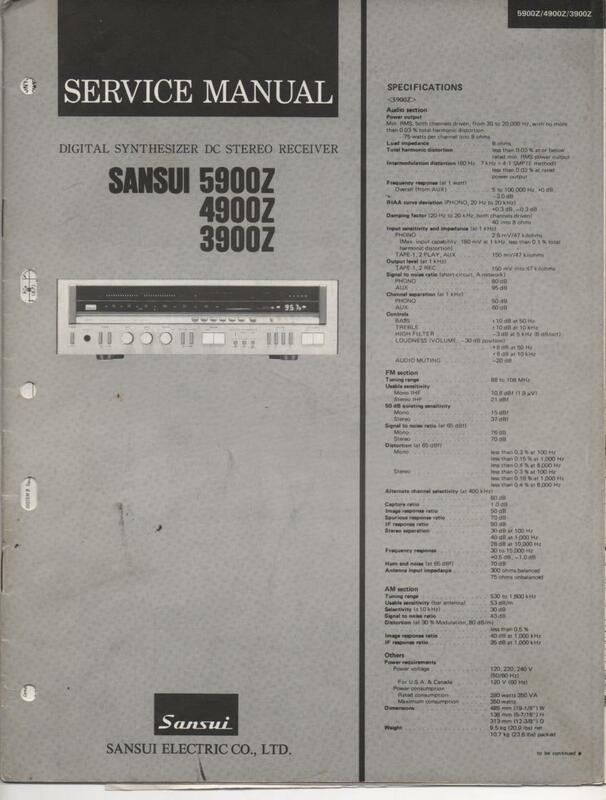 Manual SansuiG-5000 G-7000 Receiver Service Manual PHOTO COPY! 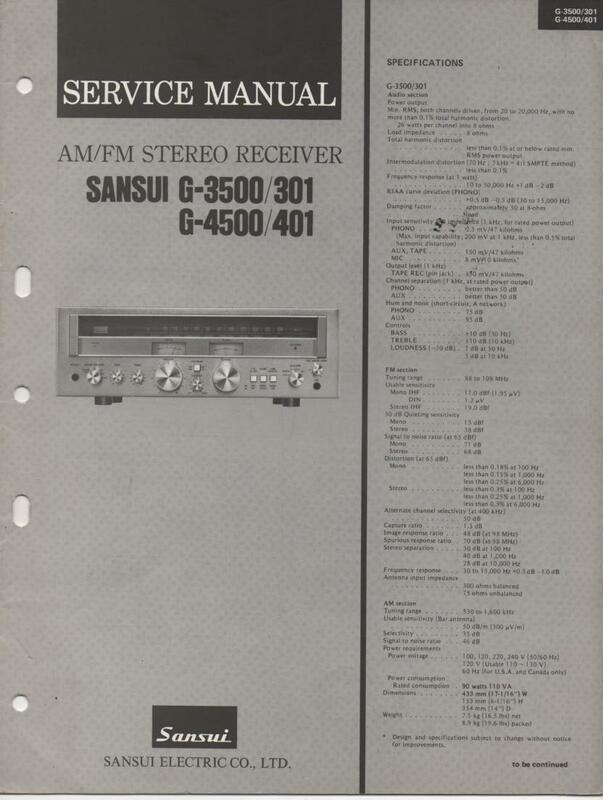 Manual SansuiG-5500 Receiver Service Manual PHOTO COPY! 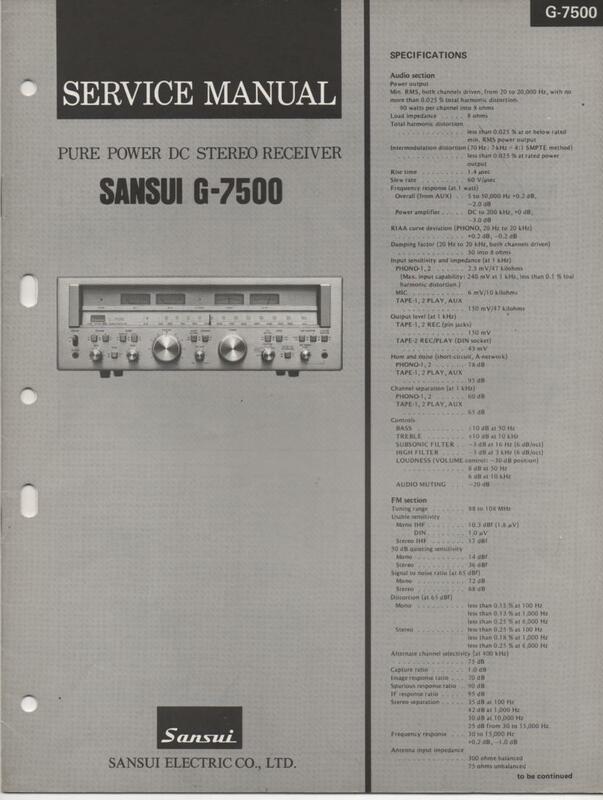 Manual SansuiG-7500 Receiver Service Manual PHOTO COPY! 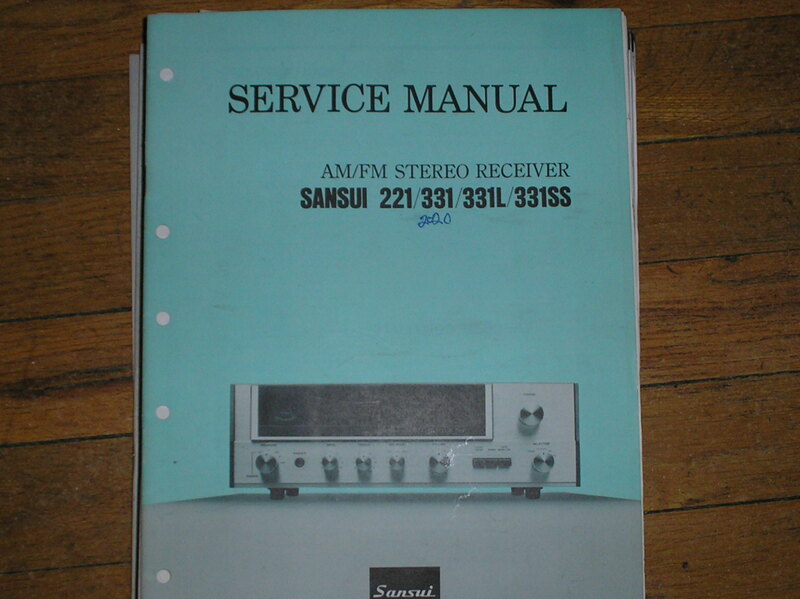 Manual SansuiG-22000 G-33000 Receiver Service Manual PHOTO COPY! 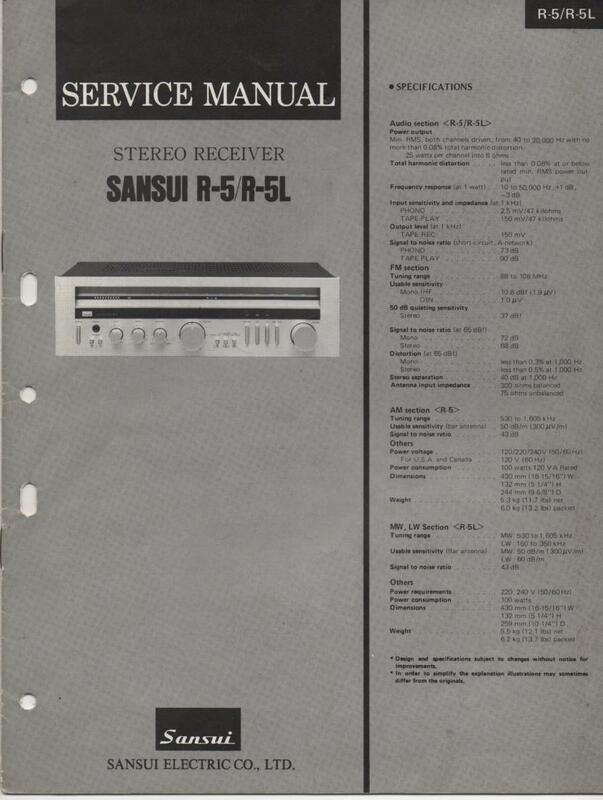 Manual SansuiR-5 R-5L Receiver Service Manual PHOTO COPY! 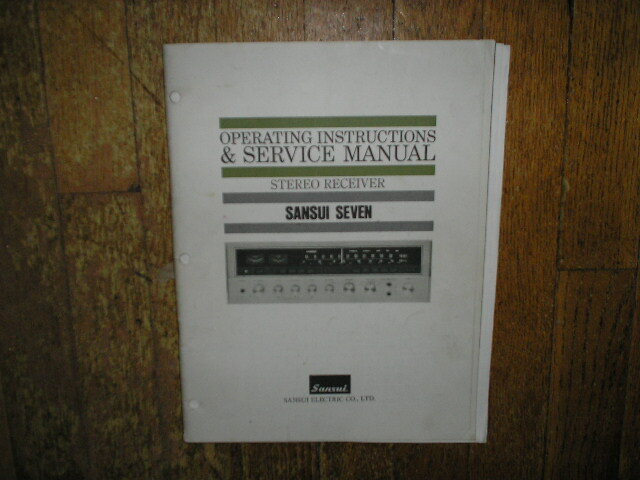 Manual SansuiR-7 Receiver Service Manual PHOTO COPY! 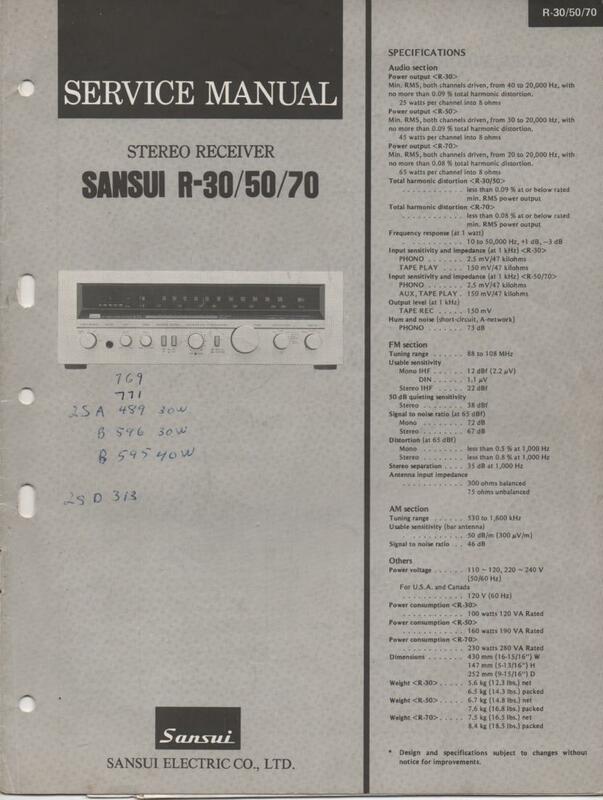 Manual SansuiR-30 R-50 R-70 Receiver Service Manual PHOTO COPY! 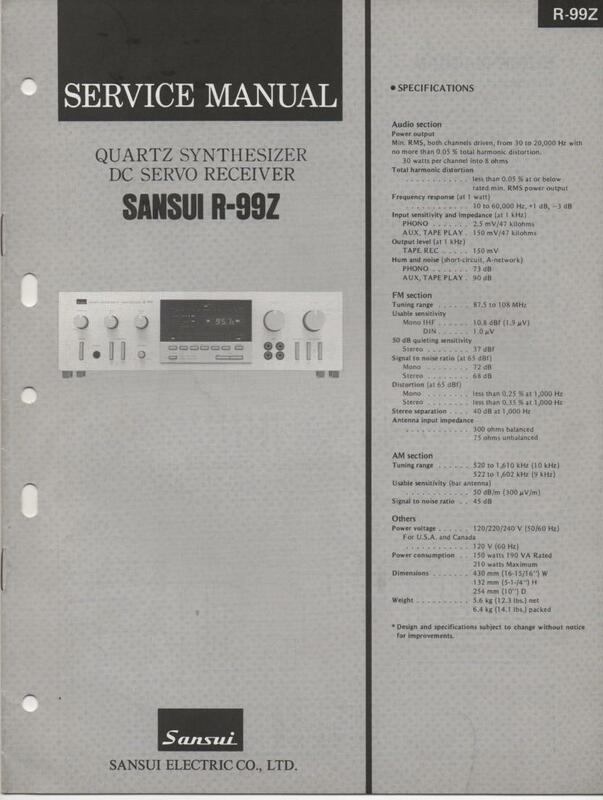 Manual SansuiR-99Z Receiver Service Manual PHOTO COPY! 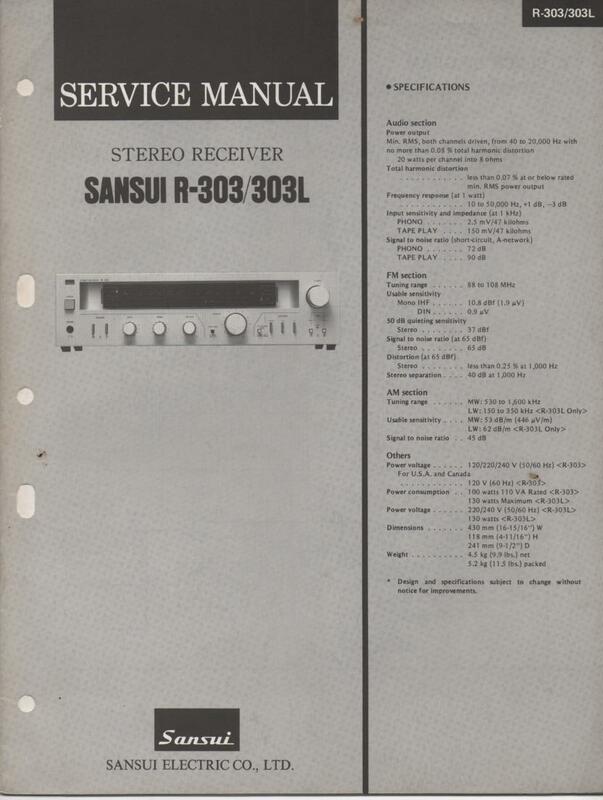 Manual SansuiR-303 R-303L Receiver Service Manual PHOTO COPY! 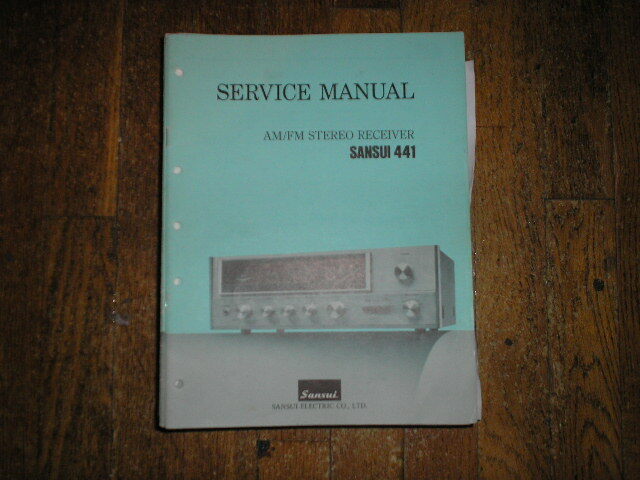 Manual SansuiR-410 R-410L Receiver Service Manual PHOTO COPY! 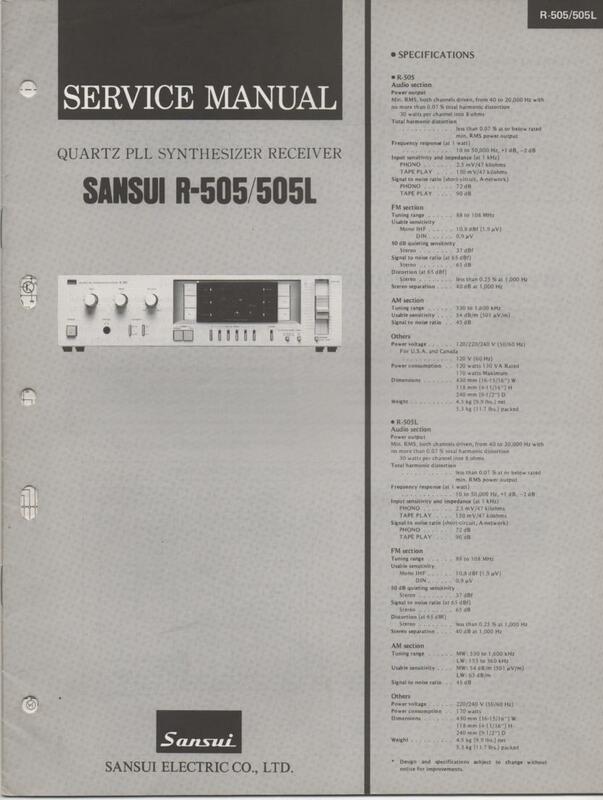 Manual SansuiR-505 R-505L Receiver Service Manual PHOTO COPY! 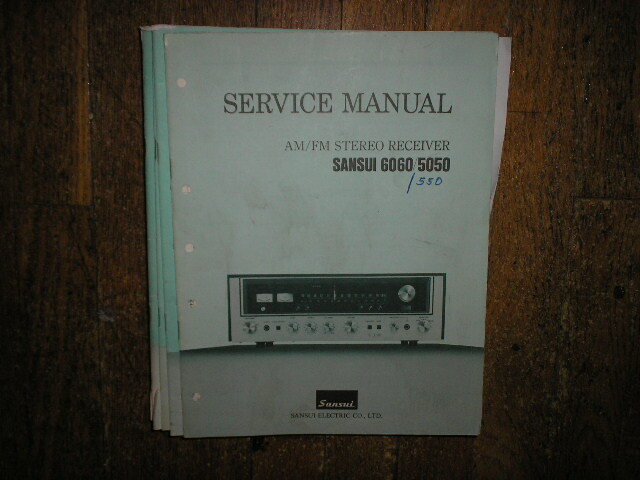 Manual SansuiR-606 Receiver Service Manual PHOTO COPY! 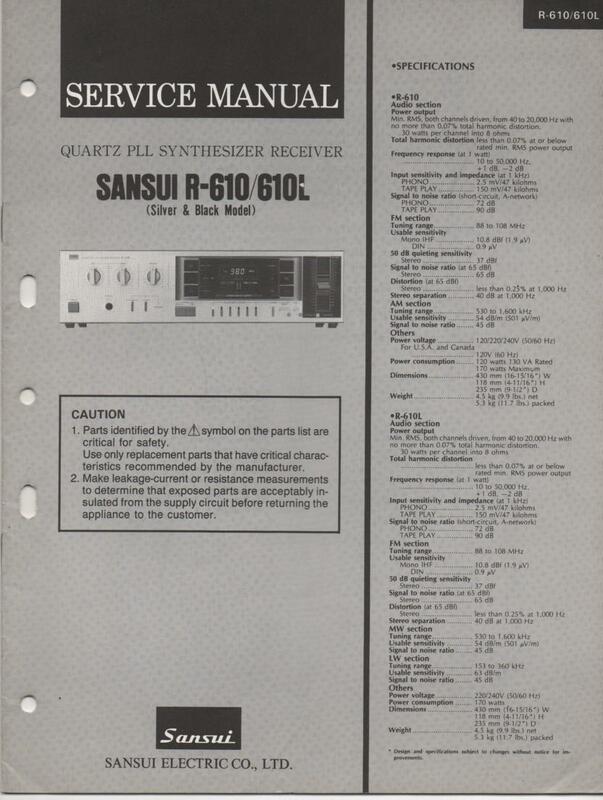 Manual SansuiR-610 R-610L Receiver Service Manual PHOTO COPY! 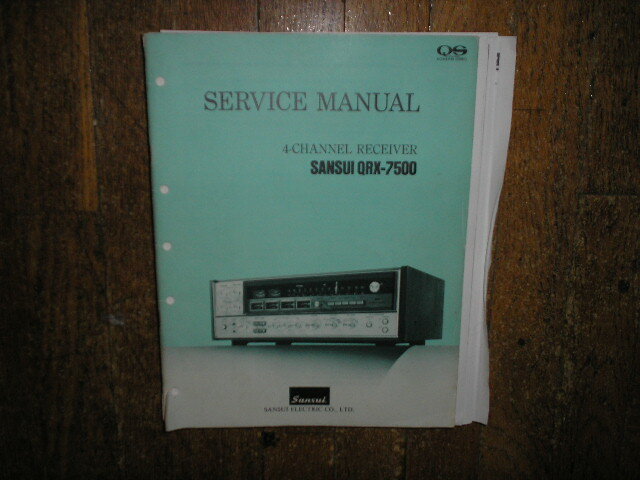 Manual SansuiR-707 R-707L Receiver Service Manual PHOTO COPY! 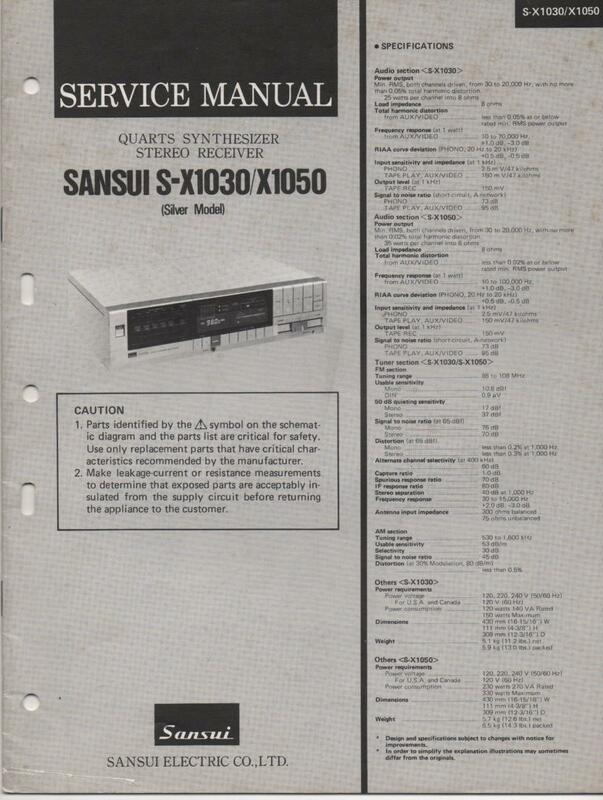 Manual SansuiS-X1030 S-X1050 Receiver Service Manual PHOTO COPY! 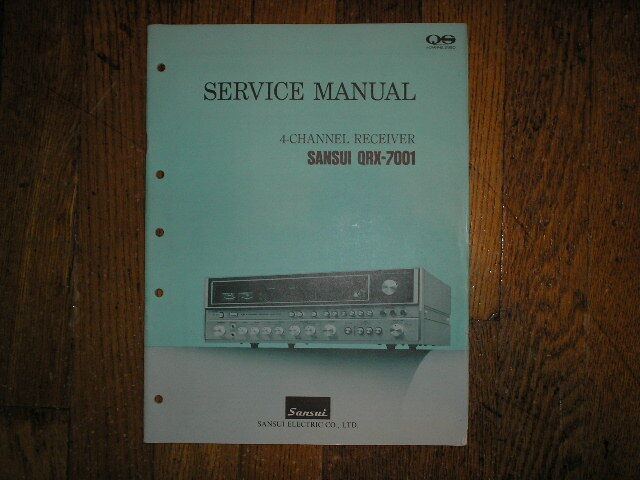 Manual SansuiS-X1070 Receiver Service Manual PHOTO COPY! 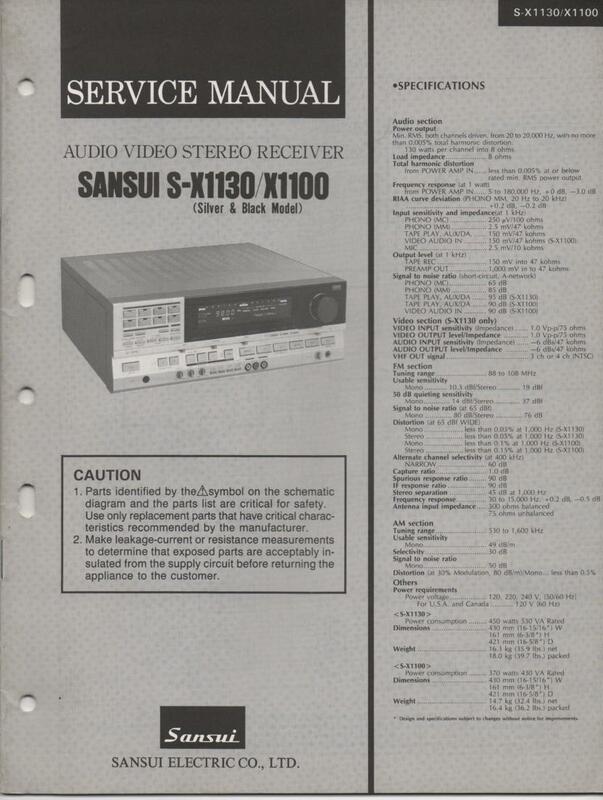 Manual SansuiS-X1100 S-X1130 Receiver Service Manual PHOTO COPY! 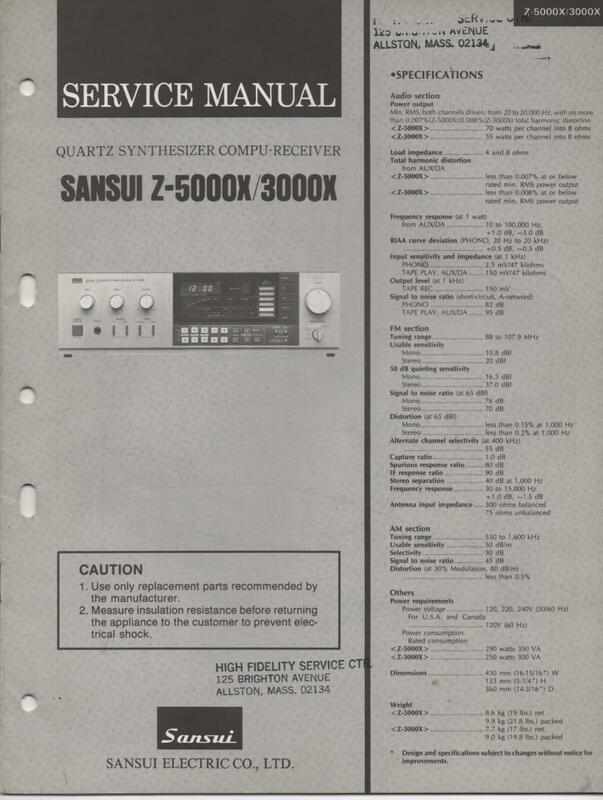 Manual SansuiZ-3000 Z-5000 Receiver Service Manual PHOTO COPY! Manual SansuiZ-3000X Z-5000X Receiver Service Manual PHOTO COPY! 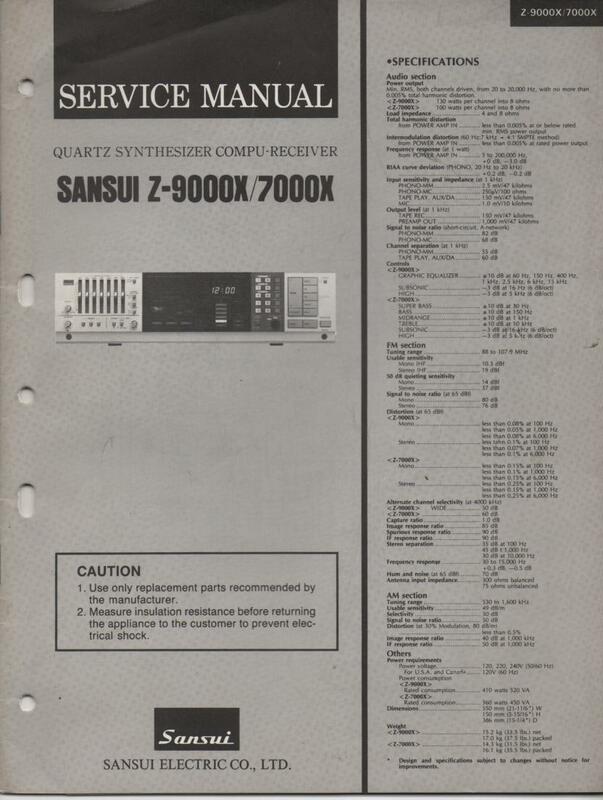 Manual SansuiZ-7000 Z-9000 Receiver Service Manual PHOTO COPY! Manual SansuiZ-7000X Z-9000X Receiver Service Manual PHOTO COPY! 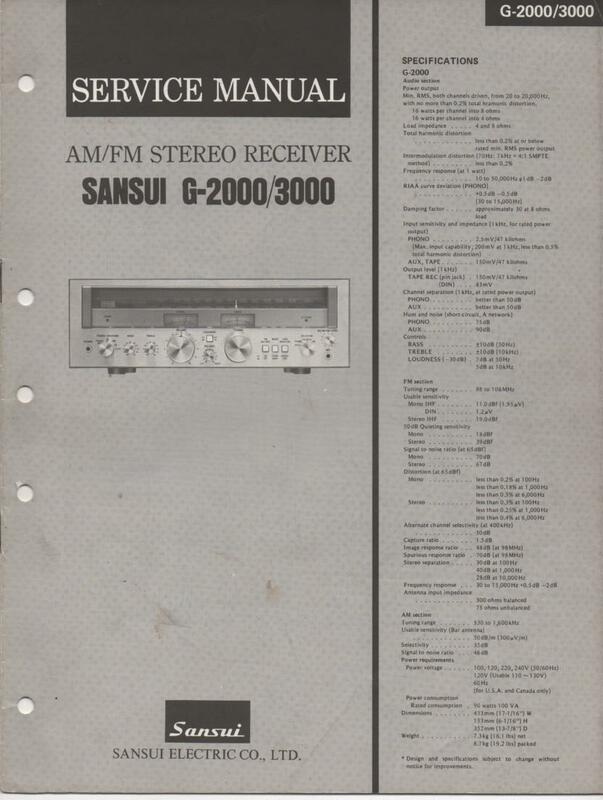 Manual Sansui500 Amplifier Receiver Operating Manual PHOTO COPY! 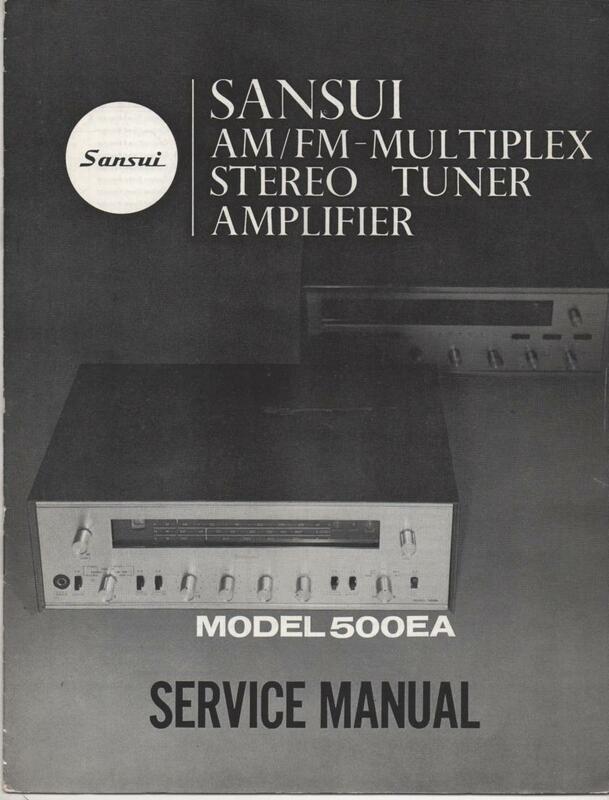 Manual Sansui500 Amplifier Service Manual.. Contains AM FM alignments, parts list, schematic and picture diagram.. PHOTO COPY! 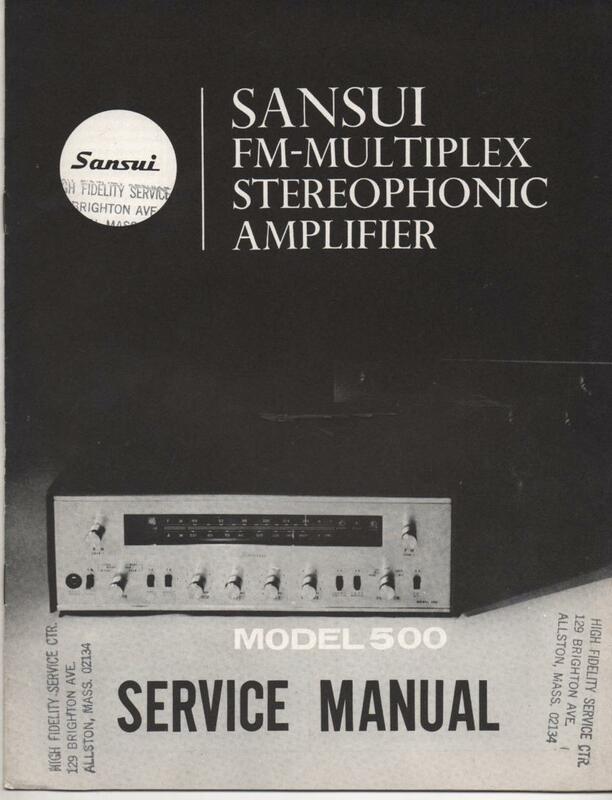 Manual Sansui500EA Amplifier Service Manual.. Contains AM FM alignments, parts list, schematic and picture diagram.. PHOTO COPY! 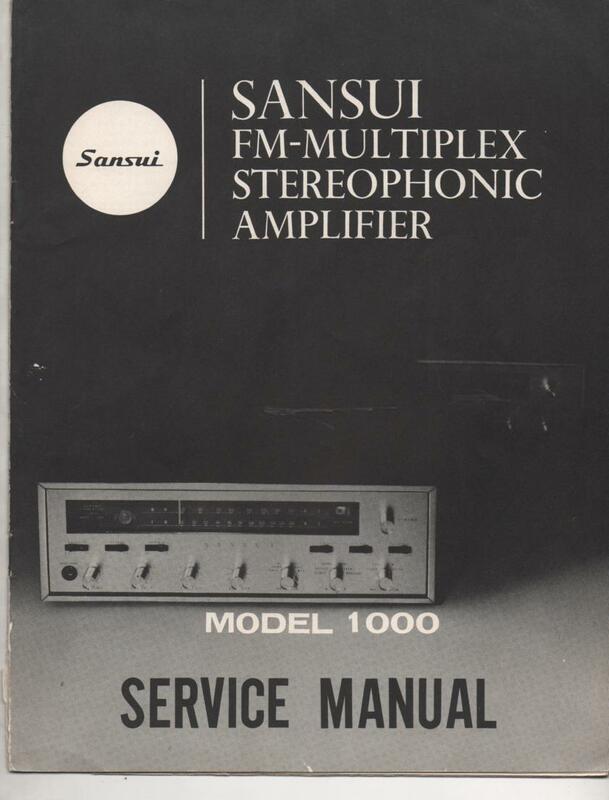 Manual Sansui1000 Amplifier Service Manual.. Contains AM FM alignments, parts list, schematic and picture diagram.. PHOTO COPY! 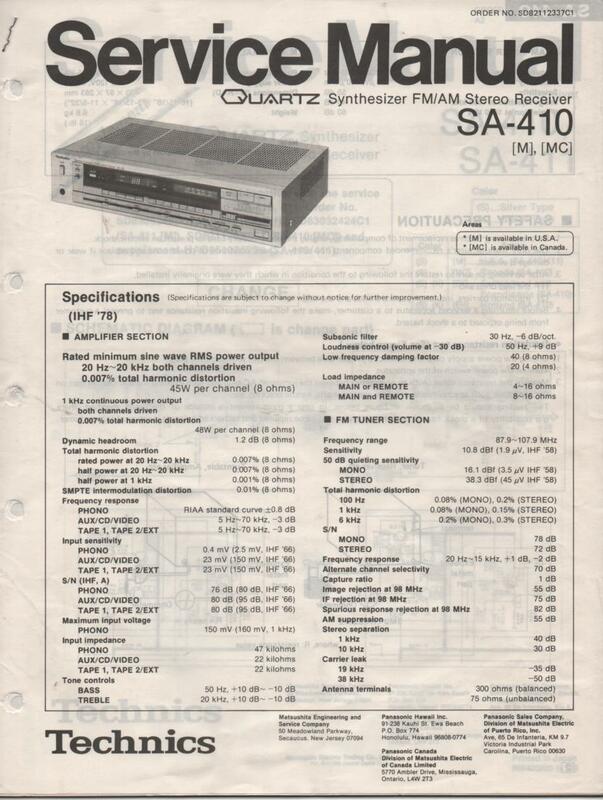 Manual SansuiAU-117II AU-217 II AU-317 II Amplifier Service Manual PHOTO COPY! 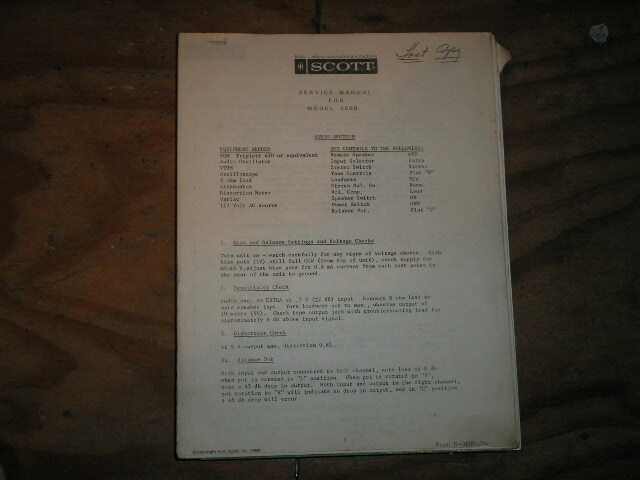 Manual ScottLC-21 Pre-Amplifier Assembly Manual PHOTO COPY! 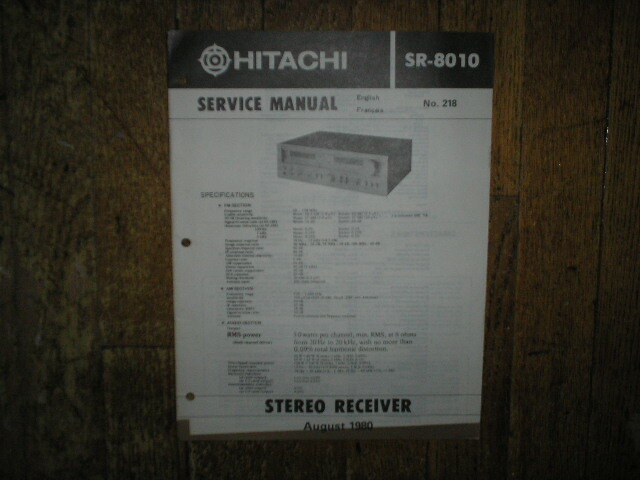 Manual ScottHHS-20 FM Stereo Receiver Service Manual PHOTO COPY! 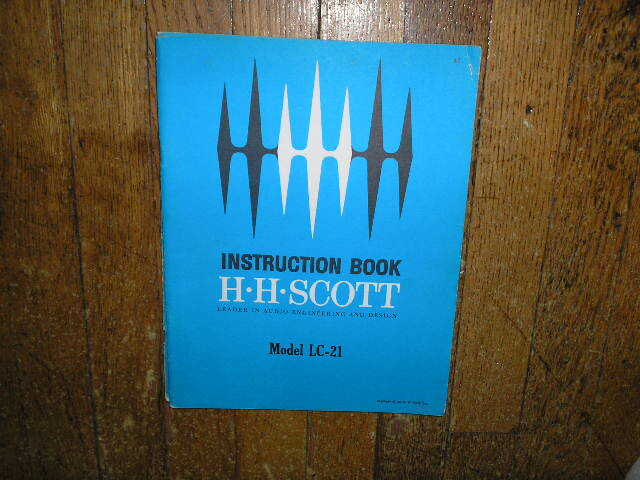 Manual ScottModel 55 Operating Instruction Manual PHOTO COPY! 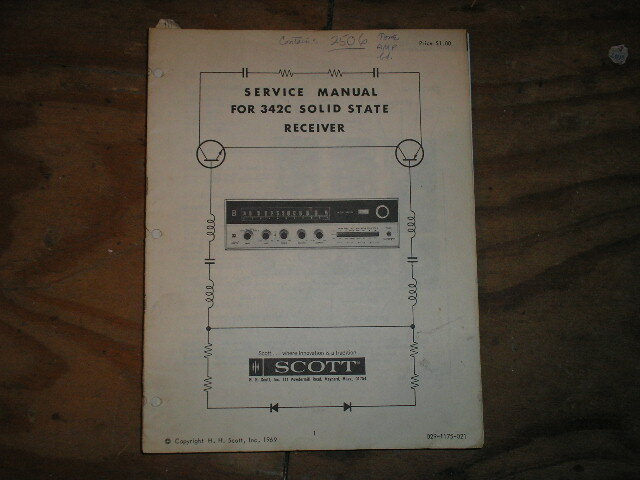 Manual Scott341 Receiver Service Manual PHOTO COPY! 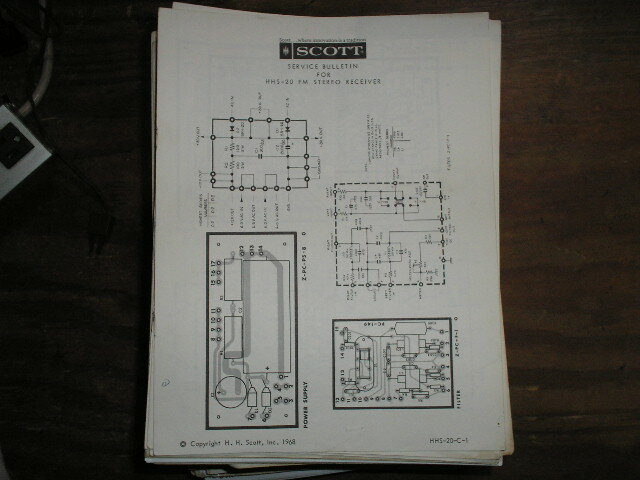 Manual Scott342-C Service Manual.. Schematic is dated September 28th 1963 PHOTO COPY! 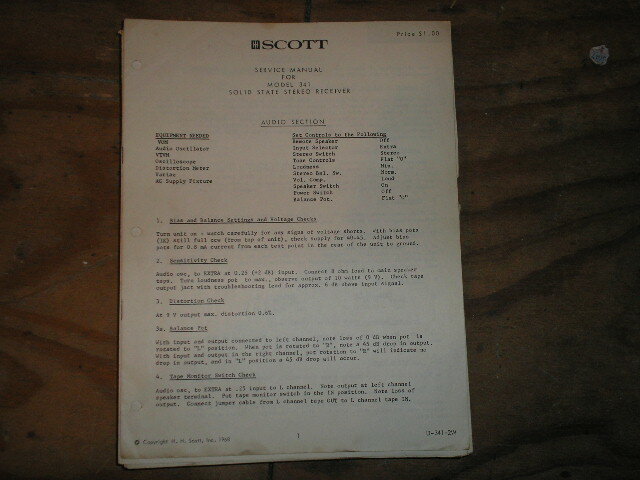 Manual Scott2501 2502 2503 Service Manual PHOTO COPY! 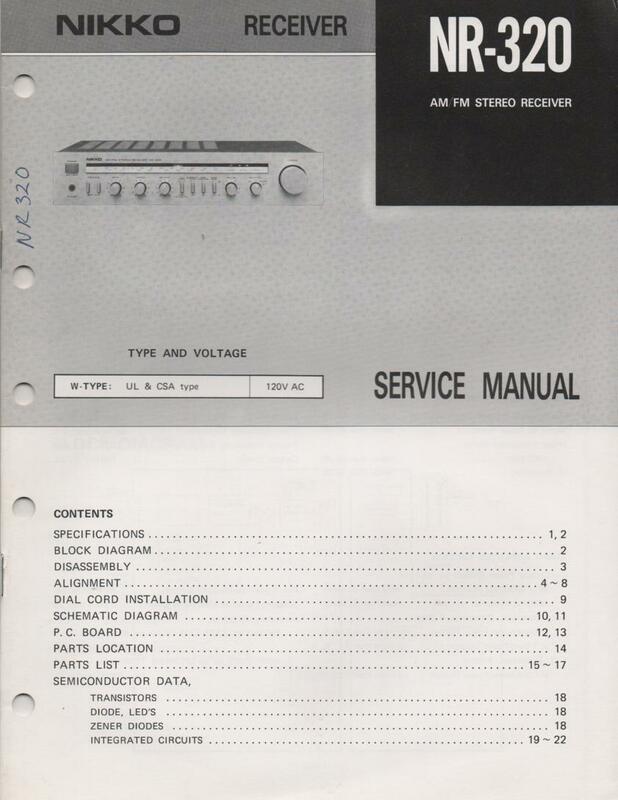 Manual Scott4312 Receiver Service Manual PHOTO COPY! Manual ScottCopley Console Service Manual PHOTO COPY! Manual Scott1966 COMPACT UNITS SERVICE MANUAL PHOTO COPY! Manual Scott1967 CONSOLE UNITS SERVICE MANUAL PHOTO COPY! 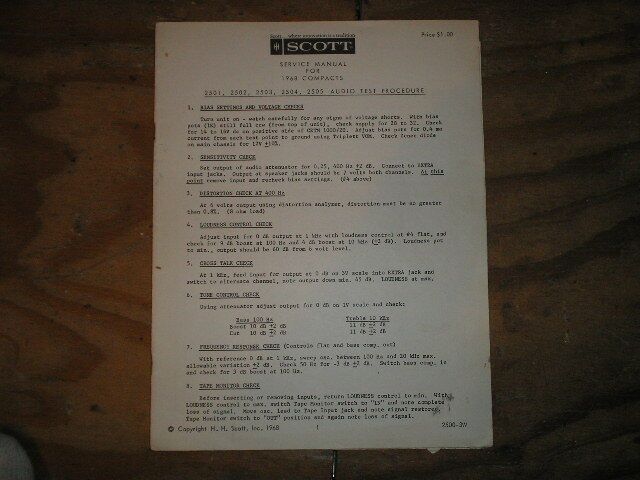 Manual Scott1968 COMPACT UNITS SERVICE MANUAL PHOTO COPY! Manual Scott3600 Service Manual PHOTO COPY! 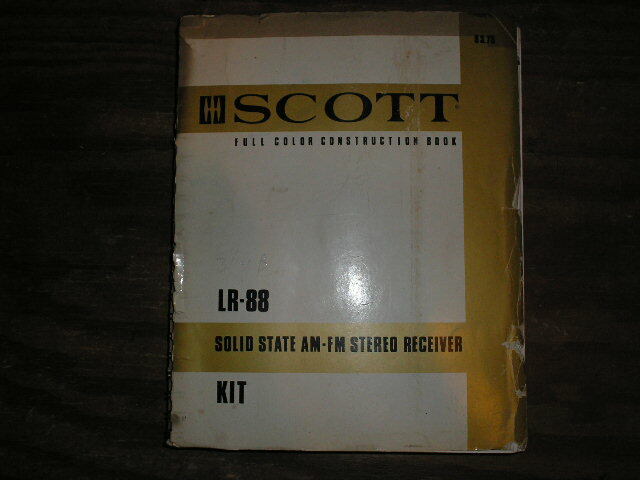 Manual ScottLR-88 Receiver Assembly Manual PHOTO COPY! Manual ScottAssembly Manual PHOTO COPY! 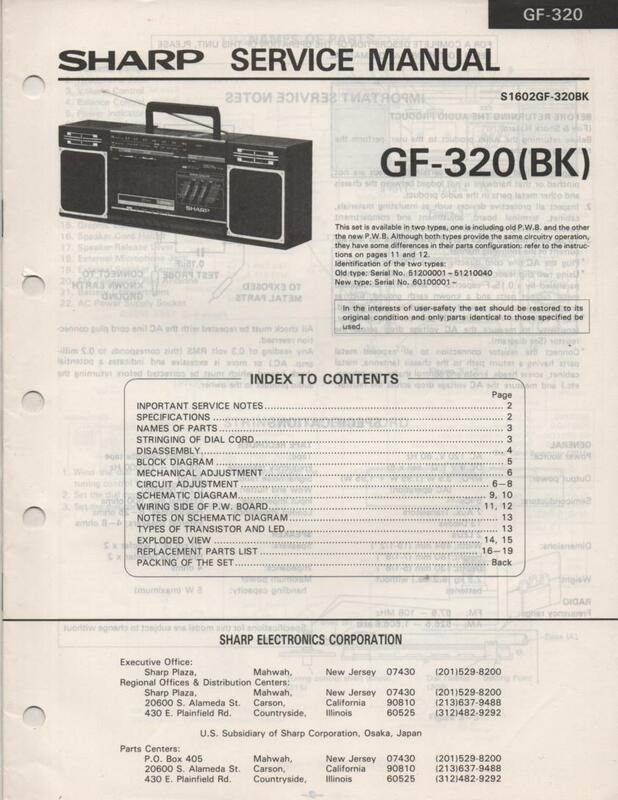 Manual SHARPGF-330 Radio Service Manual PHOTO COPY! 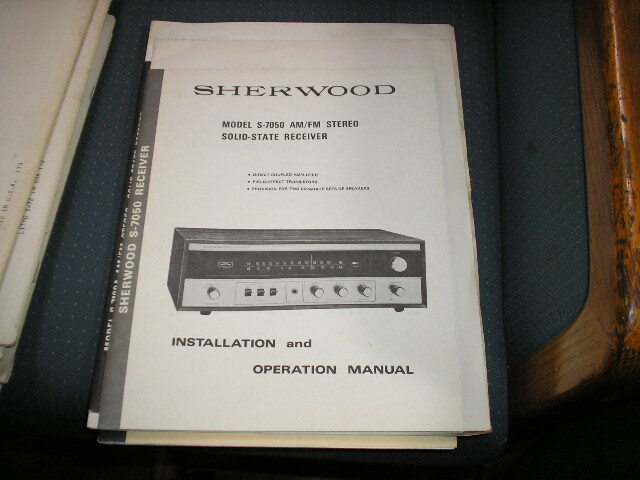 Manual Sherwood S-8000 Stereo Receiver Operation, Installation, Service Manual. for Serial no. 813001 and up. Tubes are 4 7868 5 12AX7 1 12AU7A 1 12AT7A 1 EM84 1 6AL5 3 6AU6 1 6BS8 1 6EA8 1 6CB6A 2 6AU8 PHOTO COPY! Manual Sherwood S-8000 Stereo Receiver Operation Installation, Service Manual. for Serial no. 825001 and up. Tubes are 4 7868 4 12AX7 2 6EU7 1 12AU7A 1 12AT7A 1 6EA8 1 6AL5 1 EM87 1 6AU8 1 6BN6 2 6AU6 1 6CB6A 1 6BS8 PHOTO COPY! Manual Sherwood S-8000 II Stereo Receiver Operation Installation Service Manual. for Serial no. 826251 and up. Tubes are 4 7868 7 6EU7 1 12AU7A 1 6EA8 1 6AU8 1 6BN6 2 6AU6 1 EM87 1 12AT7A 1 6BS8 1 6CB6A PHOTO COPY! Manual Sherwood S-7100 Stereo Receiver Parts and Alignment Manual PHOTO COPY! 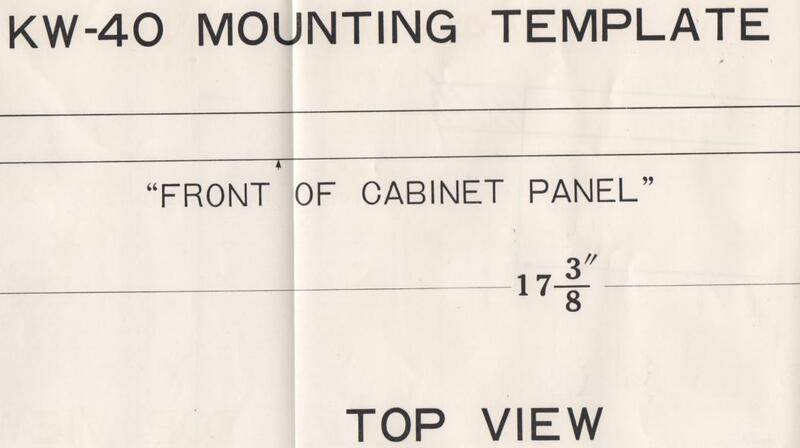 Manual Sherwood S-7100A Stereo Receiver Installation Manual and Schematic PHOTO COPY! Manual Sherwood S-7100A Stereo Receiver Service Manual PHOTO COPY! 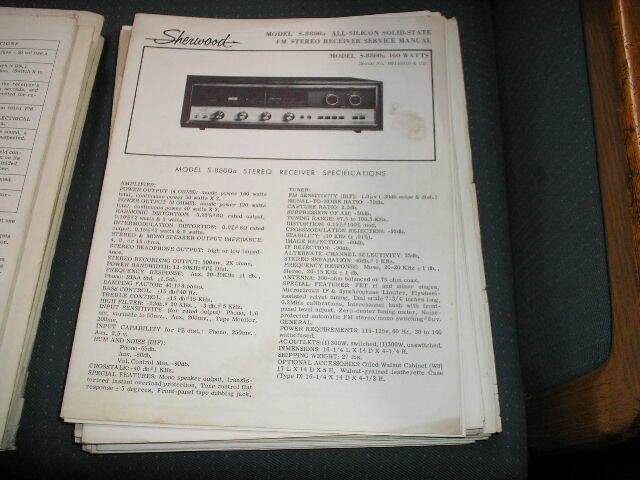 Manual Sherwood S-7150CP Stereo Receiver Service Manual PHOTO COPY! Manual Sherwood S-7200 Stereo Receiver Service Manual PHOTO COPY! Manual Sherwood S-7250CP Stereo Receiver Service Manual PHOTO COPY! Manual Sherwood S-7300 Stereo Receiver Service Manual PHOTO COPY! 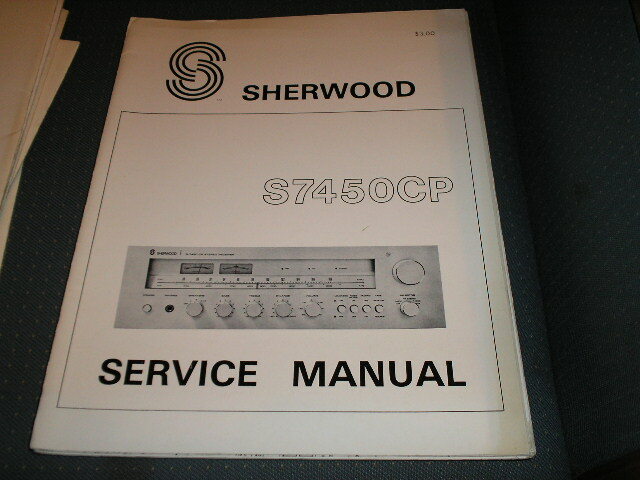 Manual Sherwood S-7450CP Stereo Receiver Service Manual PHOTO COPY! Manual Sherwood S-7500 S-8500 Receiver Service Manual Serial NO. A16001 and UP PHOTO COPY! Manual Sherwood S-7500 S-8500 Receiver Service Manual Serial NO. A95001 and UP PHOTO COPY! Manual Sherwood S-7600 Receiver Service Manual Serial NO.A701001-A702102 PHOTO COPY! Manual Sherwood S-7600 Receiver Service Manual Serial NO.A802201-A803200 PHOTO COPY! Manual Sherwood S-7600A Receiver Service Manual Serial NO.A904501 and Up PHOTO COPY! 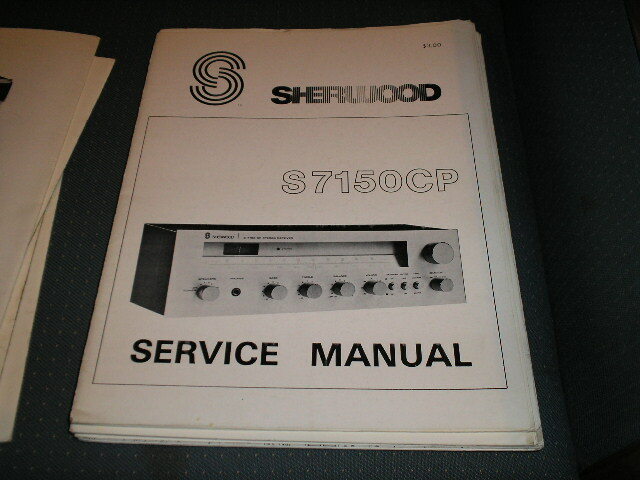 Manual Sherwood S-7650P Receiver Service Manual Serial No. 765801001 and Up. PHOTO COPY! 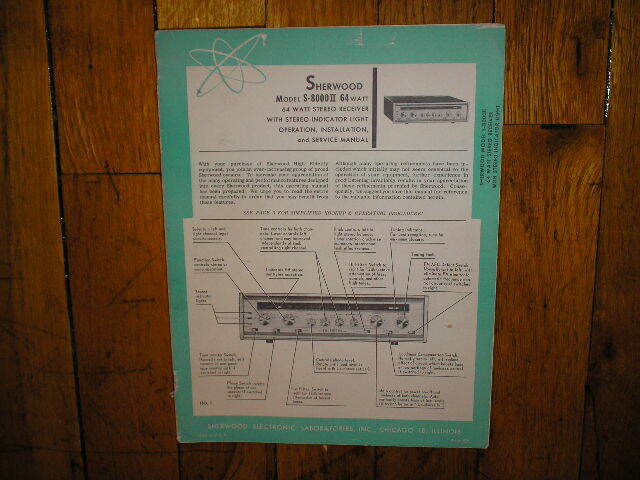 Manual Sherwood S-7900 Receiver Schematic Only Serial No. 791001 and Up PHOTO COPY! 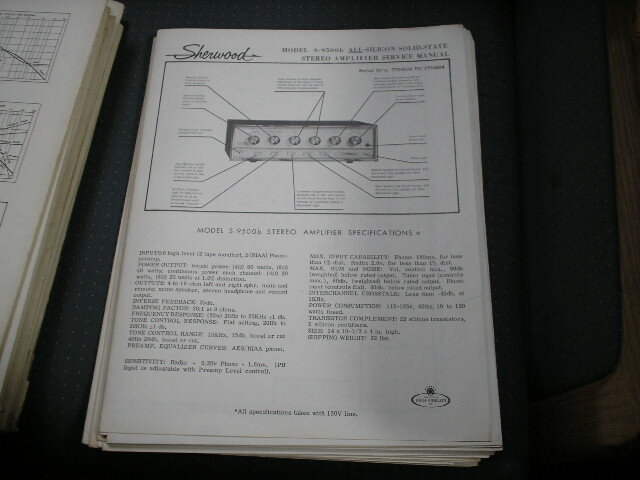 Manual Sherwood S-7900A S-8900A Receiver Service Manual for Serial No. 7R316050-7R317849 PHOTO COPY! 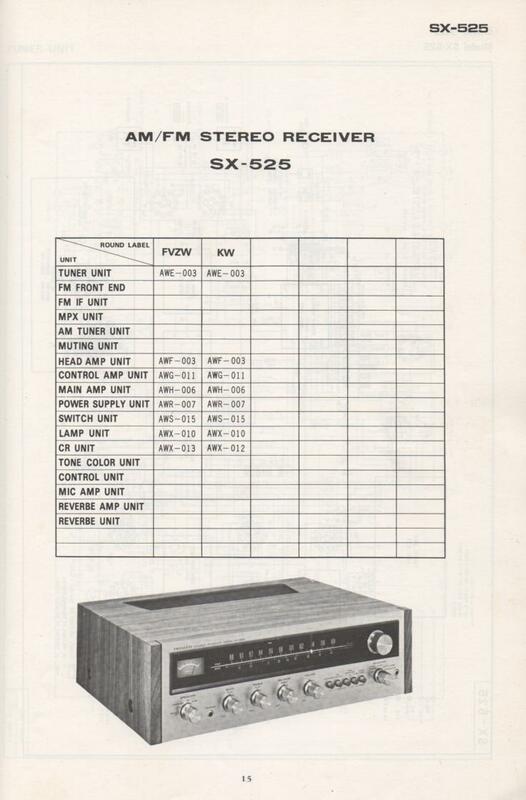 Manual Sherwood S-7900A S-8900A Receiver Service Manual for Serial No. 7R317850-7R320399 PHOTO COPY! 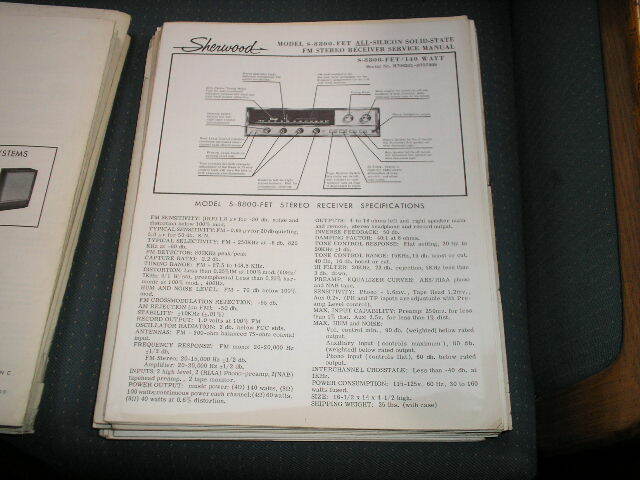 Manual Sherwood S-7900A S-8900A Receiver Service Manual for Serial No. 7R420400-7R422949 PHOTO COPY! 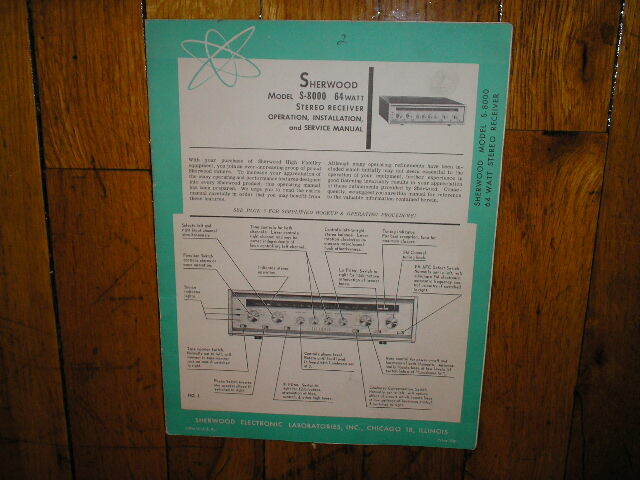 Manual Sherwood S-7900A S-8900A Receiver Operating and Installation Manual PHOTO COPY! 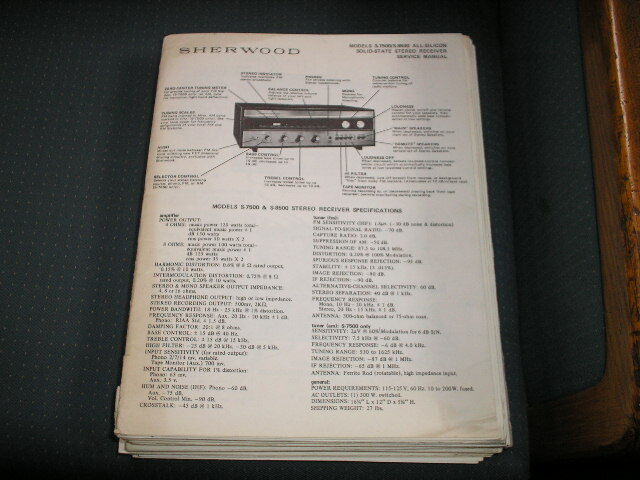 Manual Sherwood S-8600 Receiver Service Manual for Serial No. 661001-663000 PHOTO COPY! 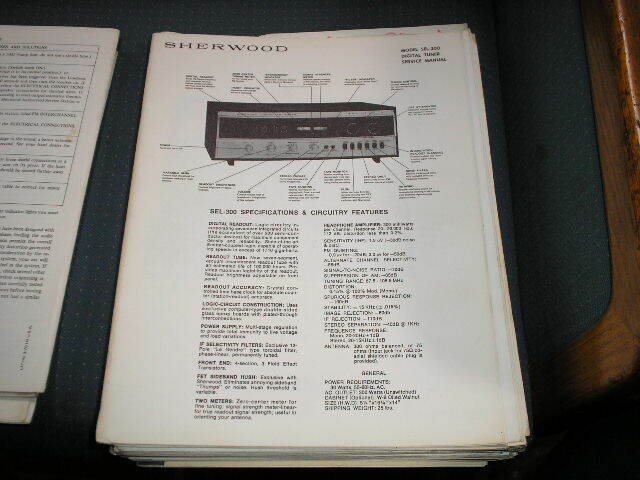 Manual Sherwood S-8600 Receiver Service Manual for Serial No. 673001-674000 PHOTO COPY! 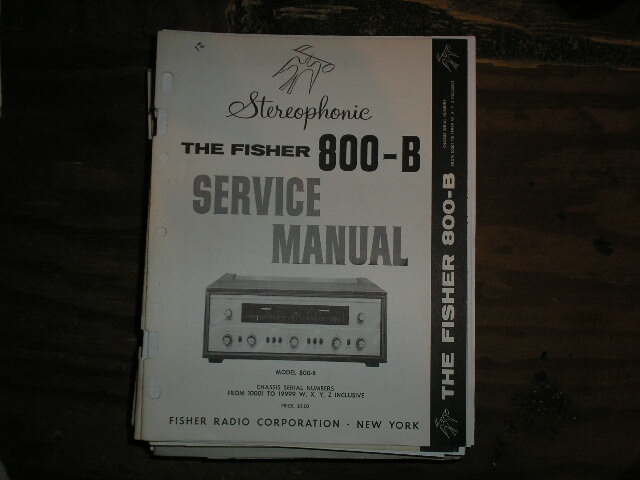 Manual Sherwood S-8600A Receiver Service Manual for Serial No. 684001-685000 PHOTO COPY! 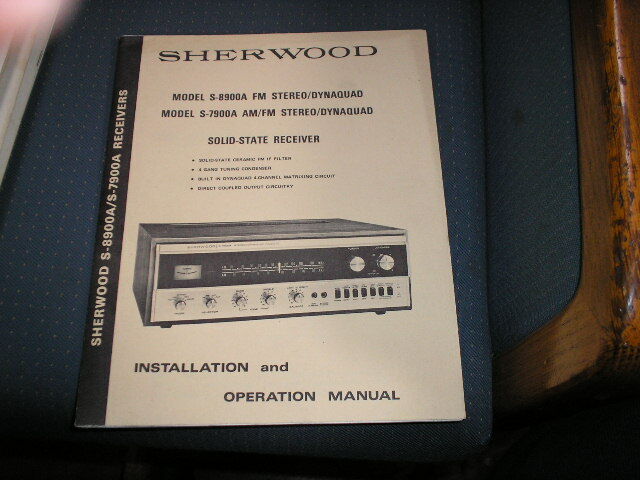 Manual Sherwood S-8600A Receiver Service Manual for Serial No. 685001-686750 PHOTO COPY! 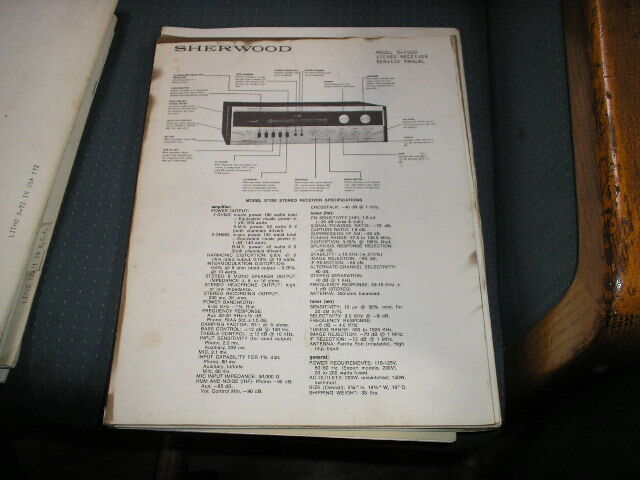 Manual Sherwood S-8800 Receiver Service Manual for Serial No. R518001 and Up PHOTO COPY! 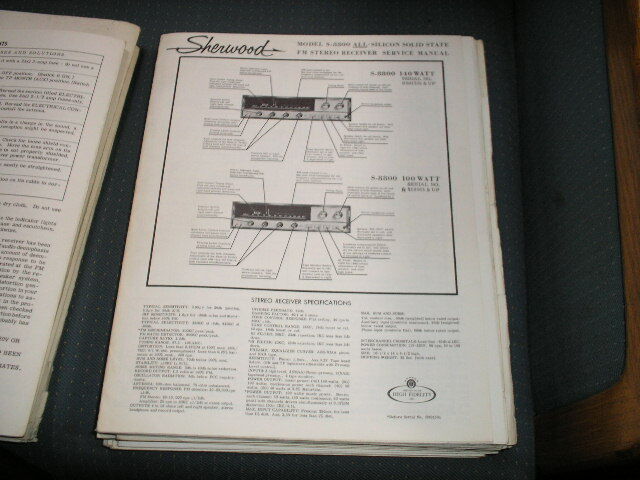 Manual Sherwood S-8800 Receiver Service Manual 140 Watt for Serial No. R601501 and Up. PHOTO COPY! 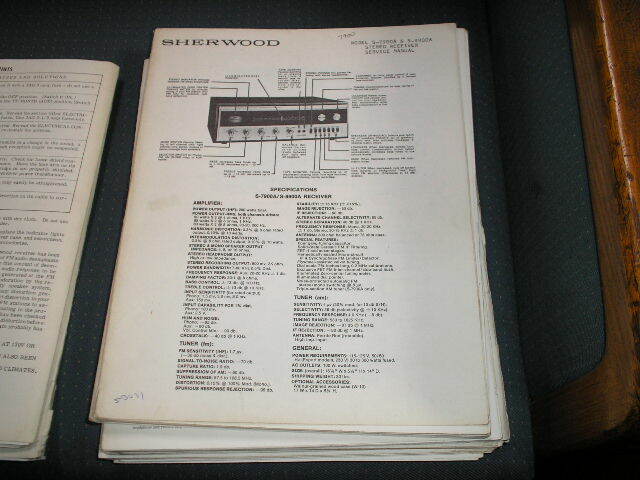 Manual Sherwood S-8800 Receiver Service Manual 140 Watt for Serial No. R606200 and Up. PHOTO COPY! 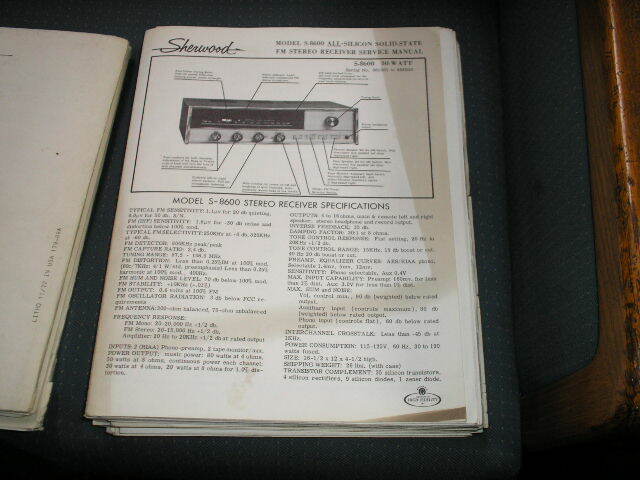 Manual Sherwood S-8800 Receiver Service Manual 140 Watt for Serial No. R8110018 and Up. PHOTO COPY! 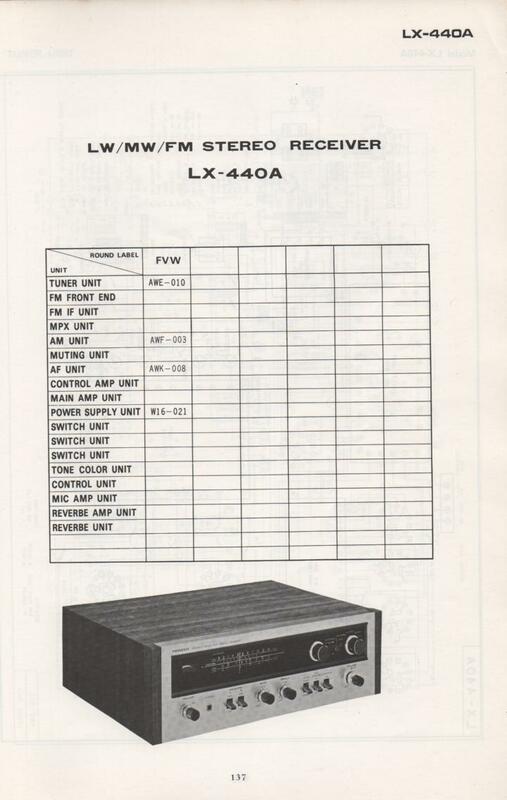 Manual Sherwood S-8800-FET Receiver Service Manual 140 Watt for Serial No. R706201 - R707999 PHOTO COPY! 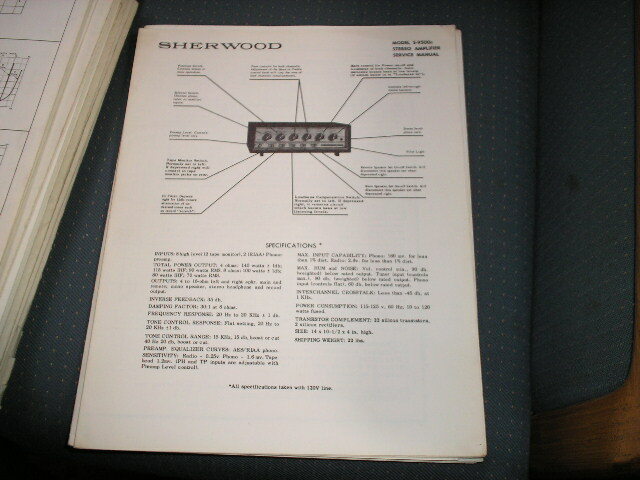 Manual Sherwood S-8800-FET Receiver Service Manual 140 Watt for Serial No. R813001 and Up PHOTO COPY! 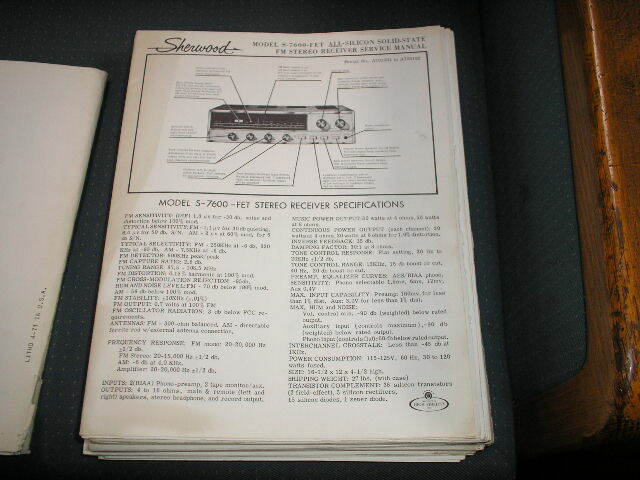 Manual Sherwood S-9000 Receiver Service Manual 150 Watt for Serial No. R9400001 and Up PHOTO COPY! 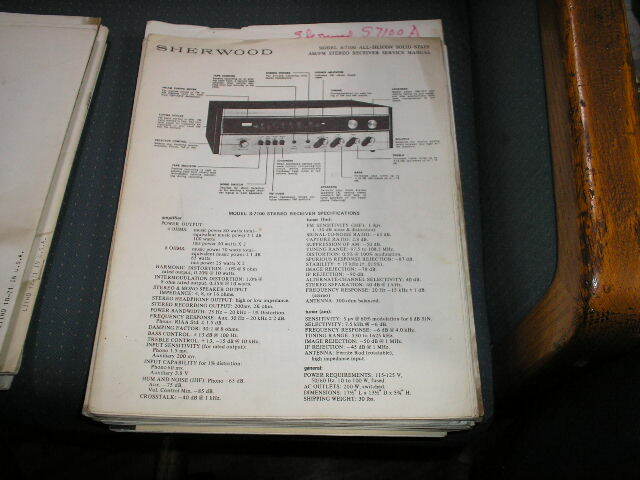 Manual Sherwood S-9000A Receiver Service Manual 150 Watt for Serial No. R951110 and Up PHOTO COPY! 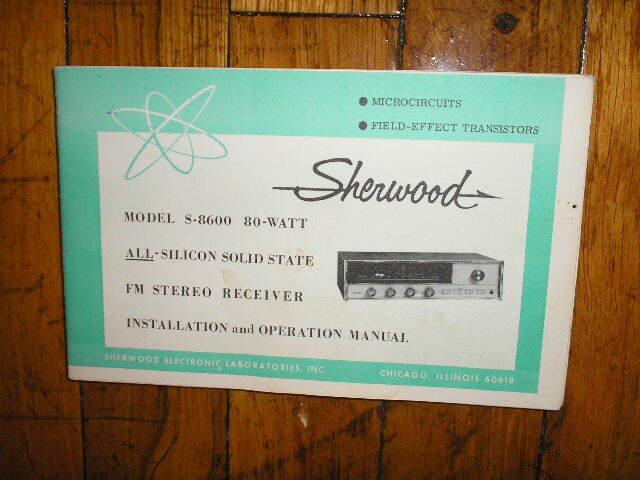 Manual Sherwood S-9500 Receiver Service Manual 50 Watt for Serial No. T400001 and Up PHOTO COPY! 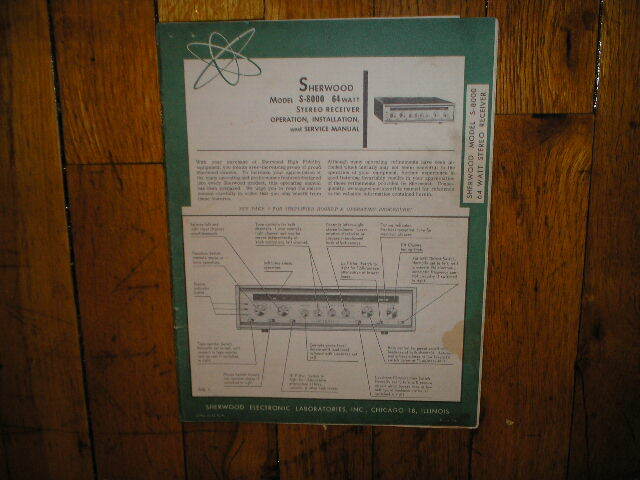 Manual Sherwood S-9500 Receiver Service Manual 50 Watt for Serial No. T401001 and Up PHOTO COPY! 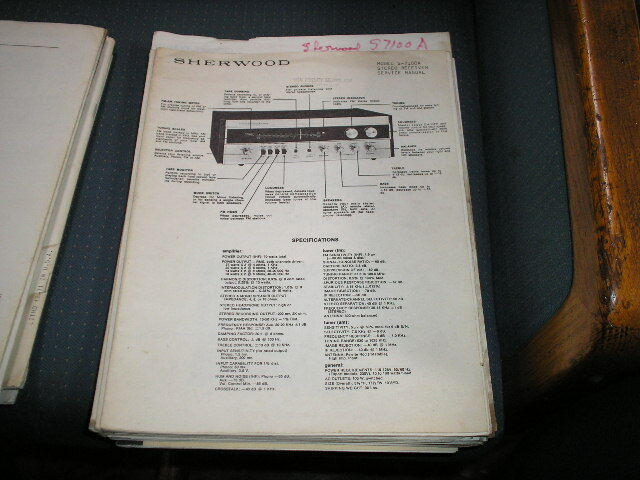 Manual Sherwood S-9500b Receiver Service Manual for Serial No. T704104-T704604 PHOTO COPY! 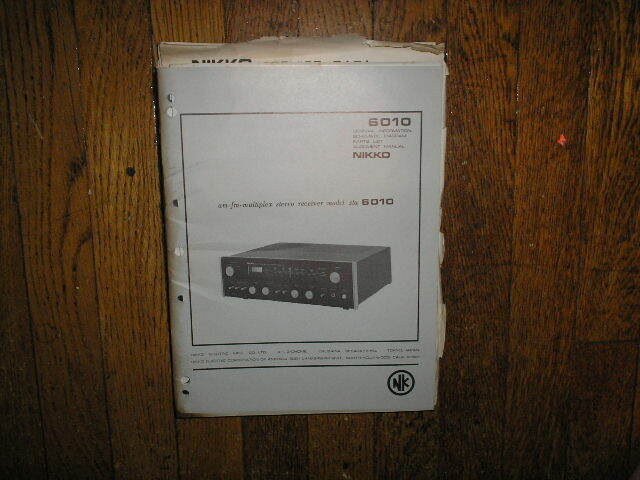 Manual Sherwood S-9500b Receiver Service Manual for Serial No.T906001 and UP PHOTO COPY! Manual Sherwood S-9500c Receiver Service Manual for Serial No.T007003 and UP PHOTO COPY! 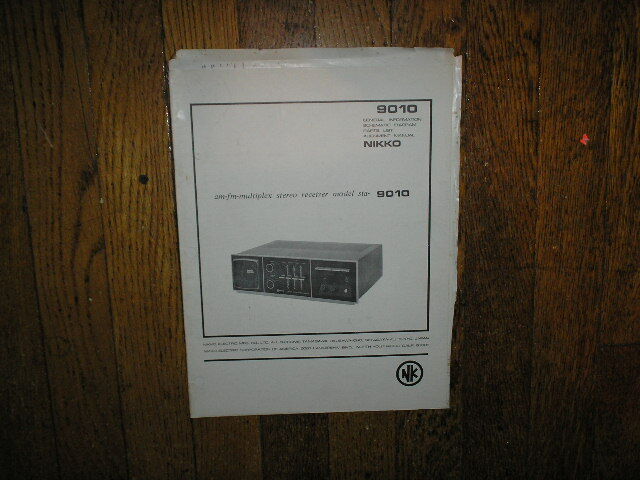 Manual Sherwood S-9900 Receiver Service Manual for Serial No.Q500001 and UP PHOTO COPY! 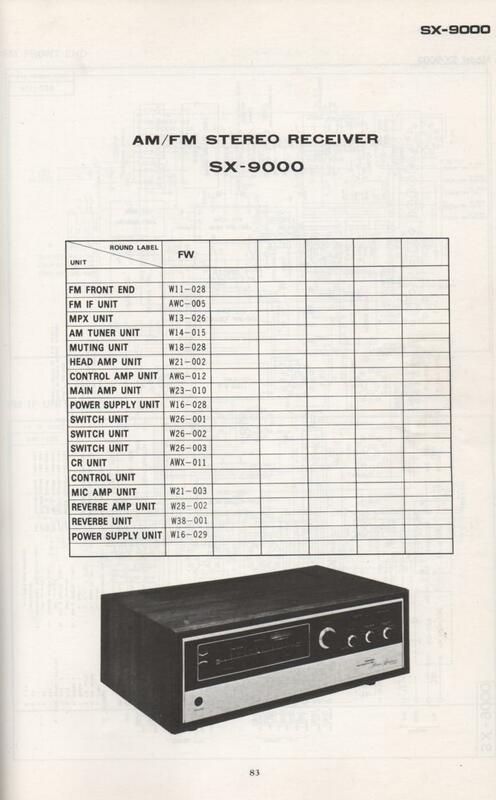 Manual Sherwood S-9900A Receiver Service Manual for Serial No.Q601001 and UP PHOTO COPY! 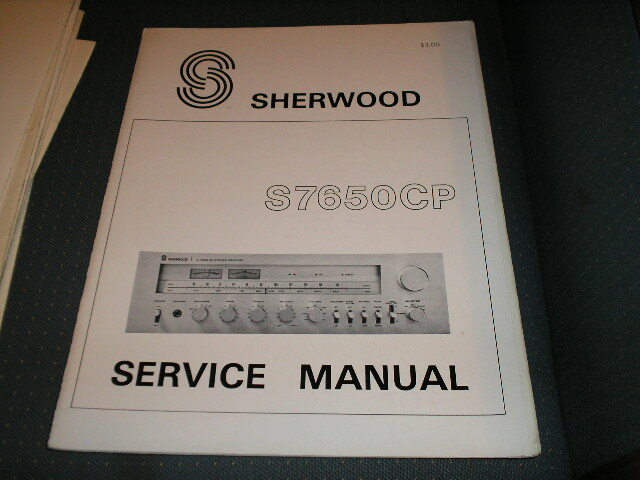 Manual Sherwood S-9900A Receiver Service Manual for Serial No.Q702000 and UP PHOTO COPY! 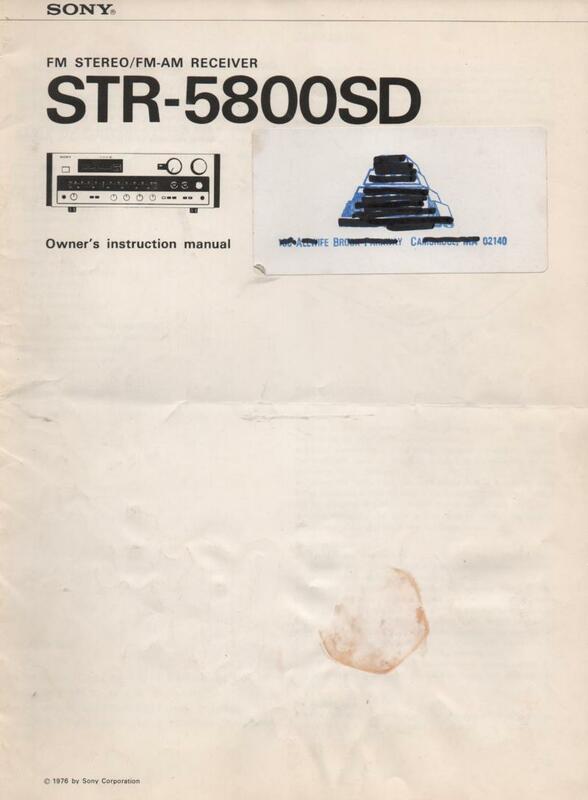 Manual Sherwood S-9900A Receiver Service Manual for Serial No.Q802501 and UP PHOTO COPY! 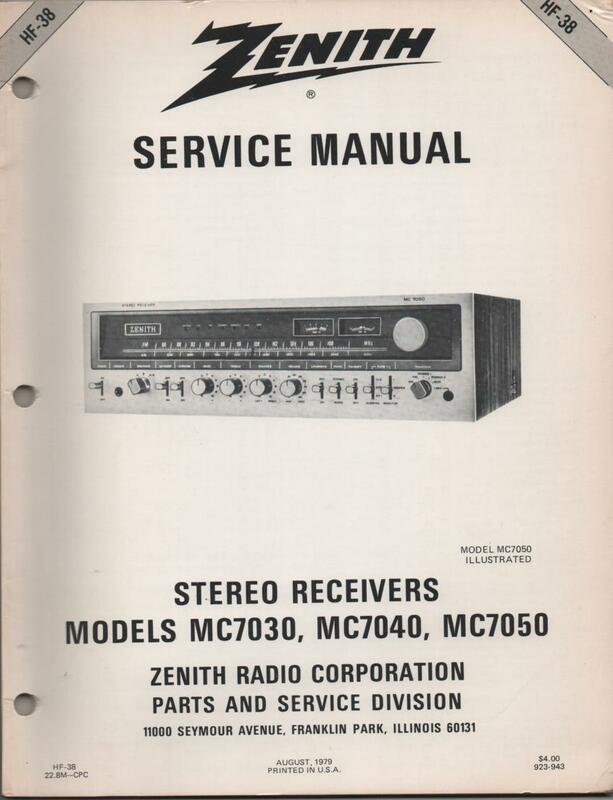 Manual Sherwood SEL-200 Receiver Service Manual for Serial No.Z02001 and UP. PHOTO COPY! 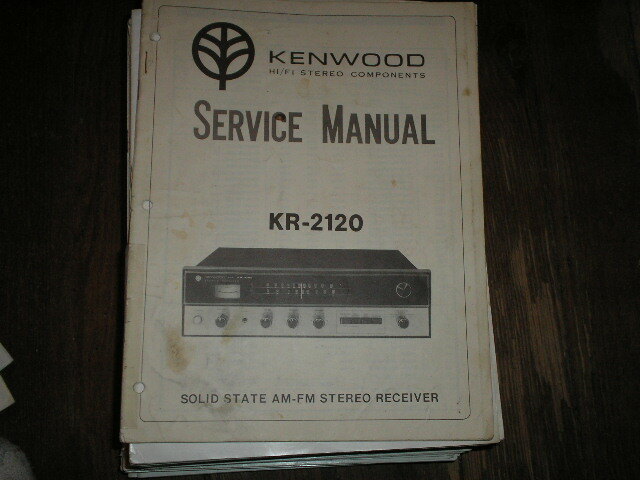 Manual Sherwood SEL-200 Receiver Service Manual for Serial No.Z23101 - Z23626. PHOTO COPY! 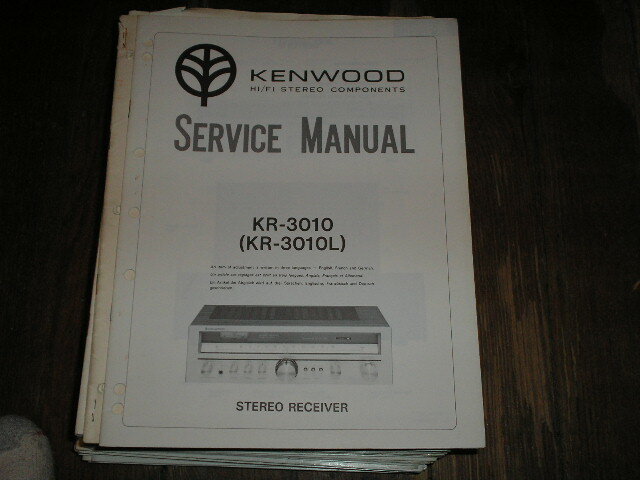 Manual Sherwood SEL-300 Receiver Service Manual for Serial No.DT11001 and UP PHOTO COPY! 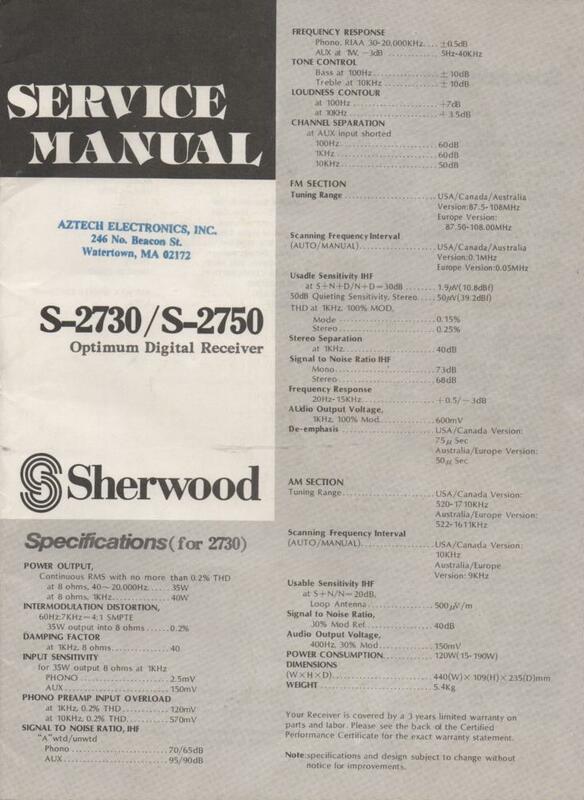 Manual Sherwood SEL-300 Receiver Service Manual for Serial No.DT21601-DT22126 PHOTO COPY! 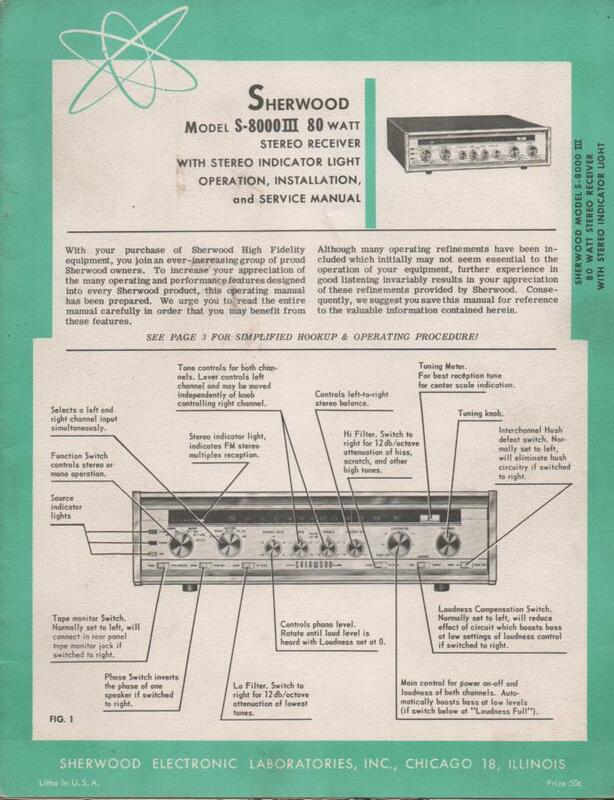 Manual Sherwood S-8600 Receiver Operating and Installation Manual PHOTO COPY! 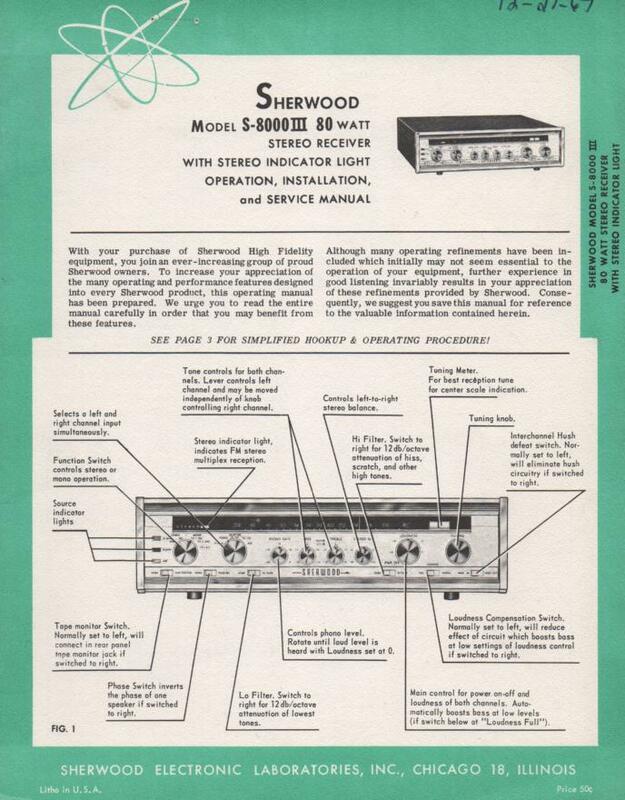 Manual Sherwood S-8000III S-8000 III Receiver Operating Installation and Service Manual for Serial No.837501 and up. Tubes in this unit are as follows.. 6-6EU7 4-7868 3-6GH8 2-6AU6 1-6BN6 1-6BS8 1-12AT7 1-12AU7.. PHOTO COPY! 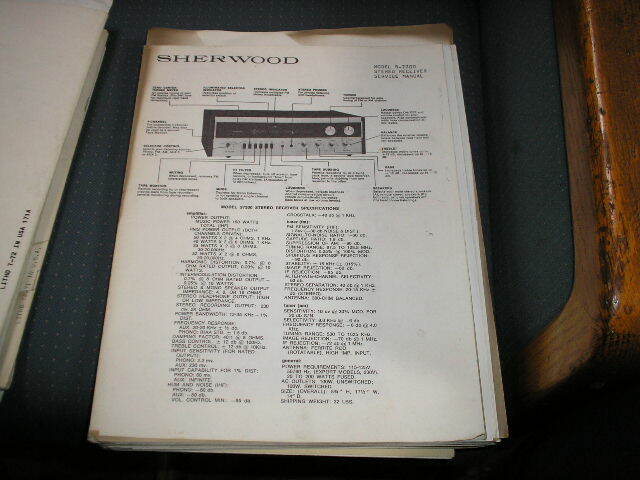 Manual Sherwood S-2730 Receiver Service Manual PHOTO COPY! 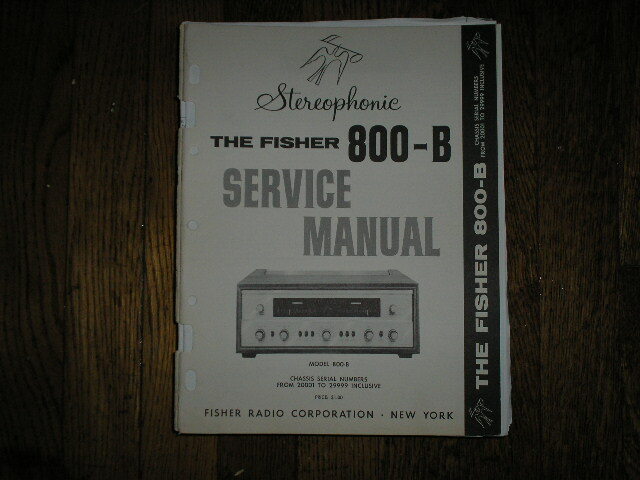 Manual Sherwood S-8000 III Receiver Service Owners Manual Serial No.839100 and up. PHOTO COPY! 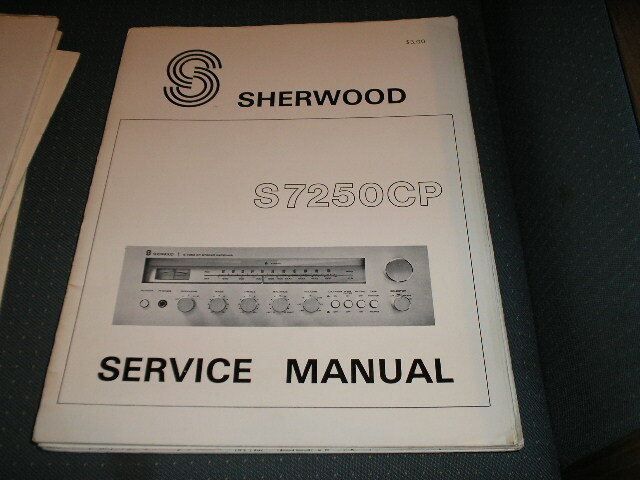 Manual Sherwood S-2750 Receiver Service Manual PHOTO COPY! 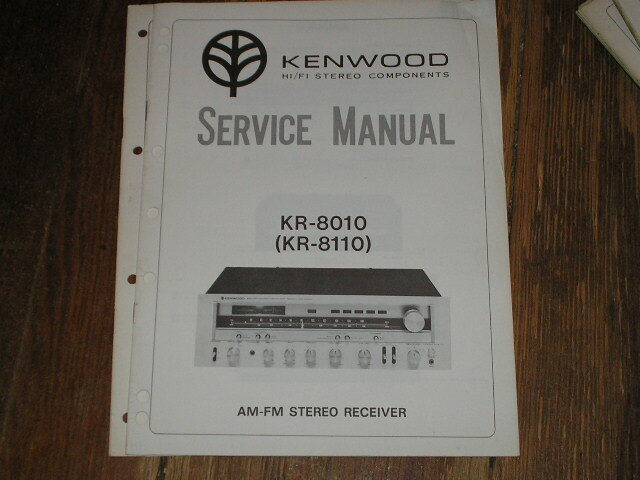 Manual Sherwood SEL-200 Receiver Service Manual for Serial No.Z91001 and UP PHOTO COPY! 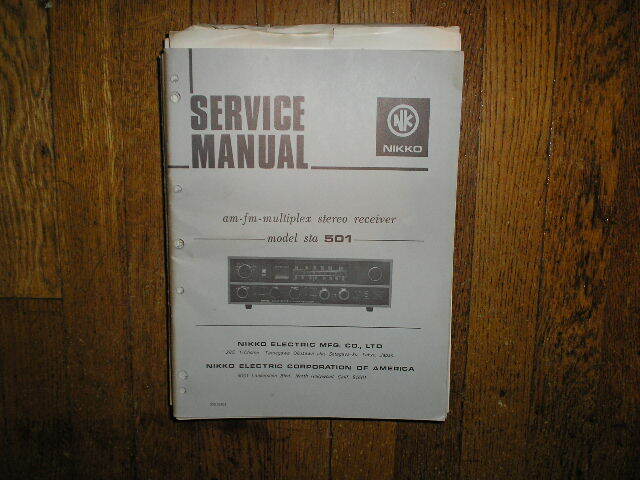 Manual Sherwood SEL-200 Receiver Service Manual for Serial No.Z91501 and UP PHOTO COPY! Manual SONYHST-50 Receiver Service Manual PHOTO COPY! Manual Sony STR-5800 STR-5800SD Receiver Service Manual PHOTO COPY! Manual Sony STR-5800SD Receiver Owners Instruction Manual PHOTO COPY! Manual Sony STR-6055 Receiver Service Instruction Manual PHOTO COPY! Manual Sony STR-AV910 STR-AV1010 Receiver Service Instruction Manual PHOTO COPY! Manual Sony STR-AV990X STR-AV1070X Service Instruction Manual PHOTO COPY! 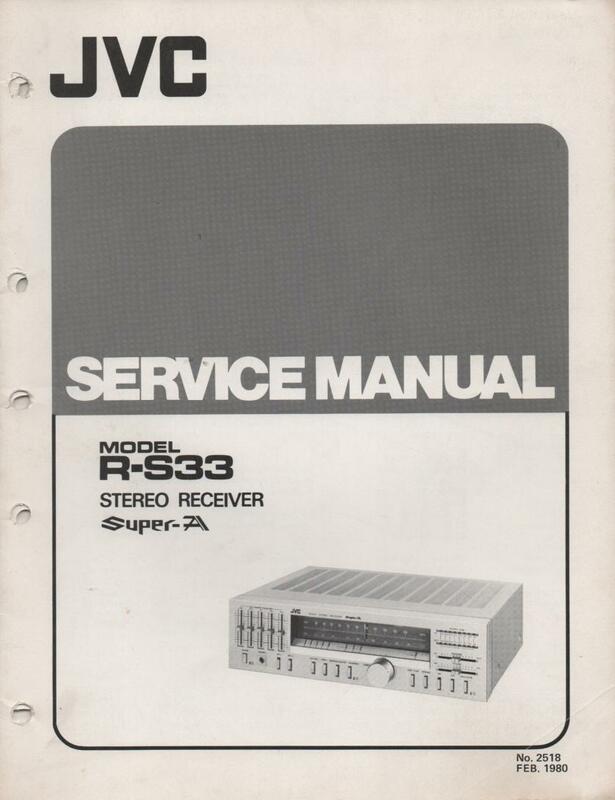 Manual Sony STR-V3 Receiver Service Instruction Manual PHOTO COPY! Manual Sony STR-VX33 Receiver Service Instruction Manual PHOTO COPY! Manual Sony STR-VX250 Receiver Service Instruction Manual PHOTO COPY! 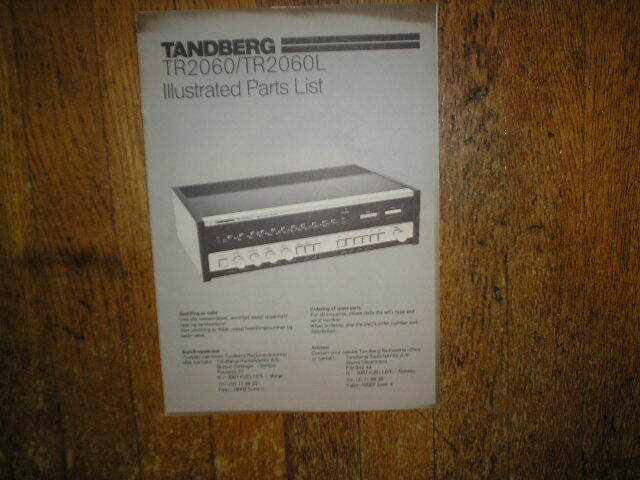 Manual TANDBERGTR-1000 TR-1010 Receiver Service Manual PHOTO COPY! 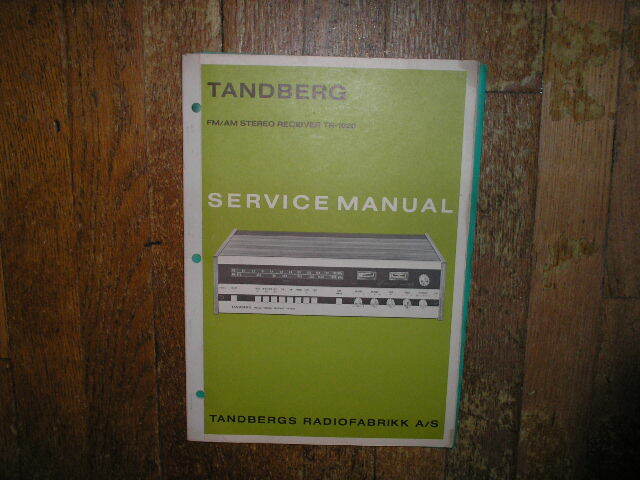 Manual TANDBERGTR-1020 Receiver Service Manual PHOTO COPY! 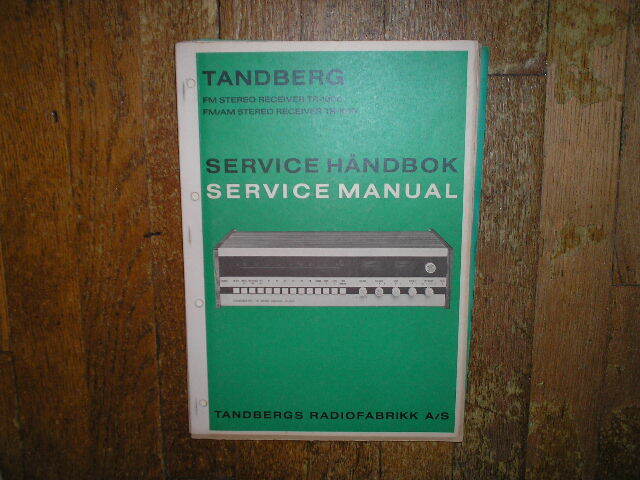 Manual TANDBERGTR-2060 TR-2060L Receiver Service Manual.. Contains parts manual and electronic schematics diagram manual.. PHOTO COPY! Manual TEACAG-3000 Receiver Service Manual PHOTO COPY! 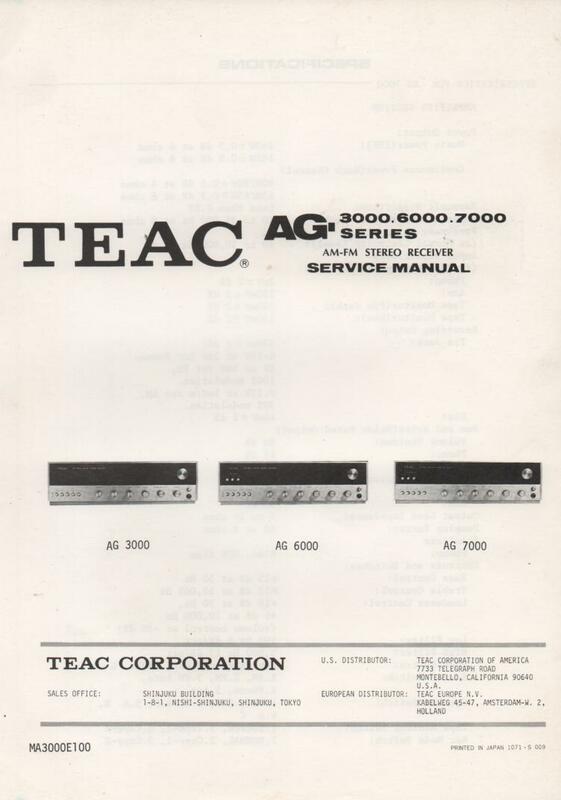 Manual TEACAG-6000 Receiver Service Manual PHOTO COPY! 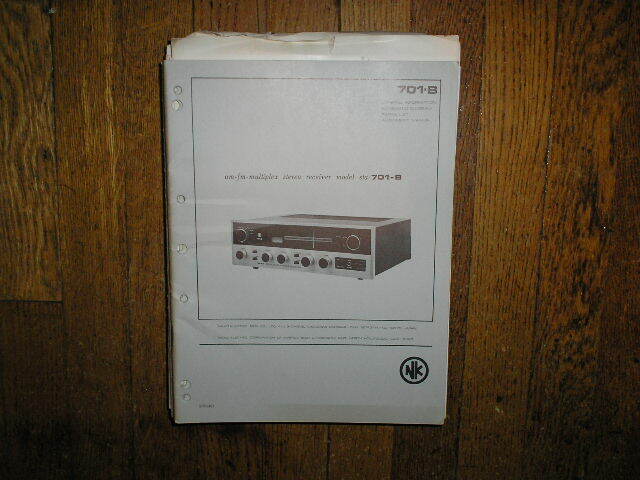 Manual TEACAG-7000 Receiver Service Manual PHOTO COPY! 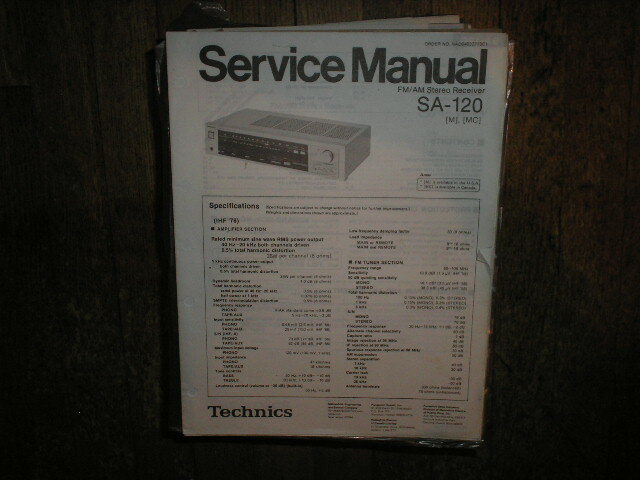 Manual Technics SA-120 Receiver Service Manual PHOTO COPY! 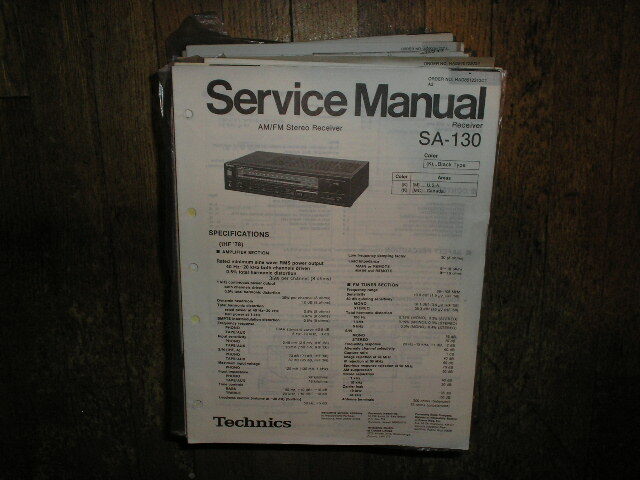 Manual Technics SA-130 Receiver Service Manual PHOTO COPY! 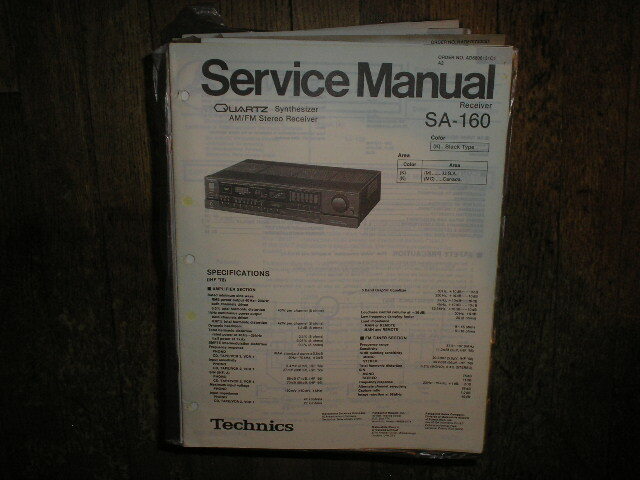 Manual Technics SA-160 Receiver Service Manual PHOTO COPY! 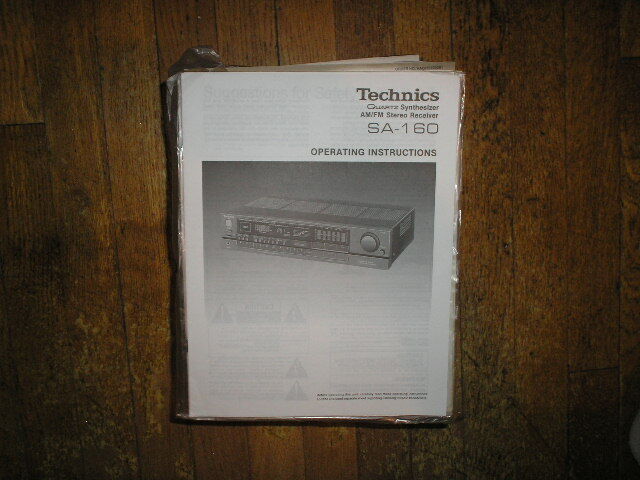 Manual Technics SA-160 Receiver Operator Manual PHOTO COPY! 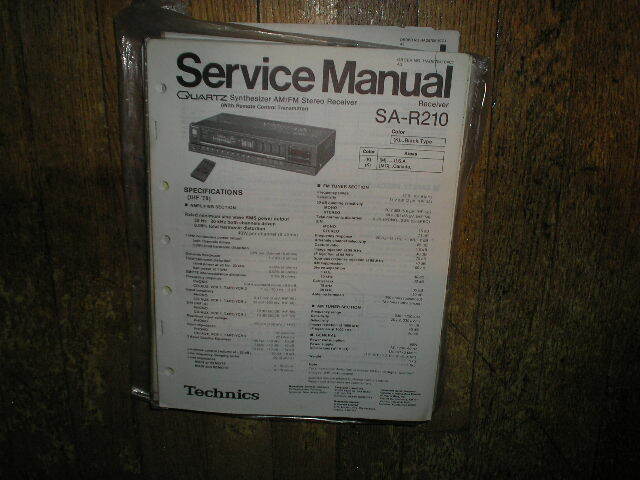 Manual Technics SA-200 Receiver Service Manual PHOTO COPY! 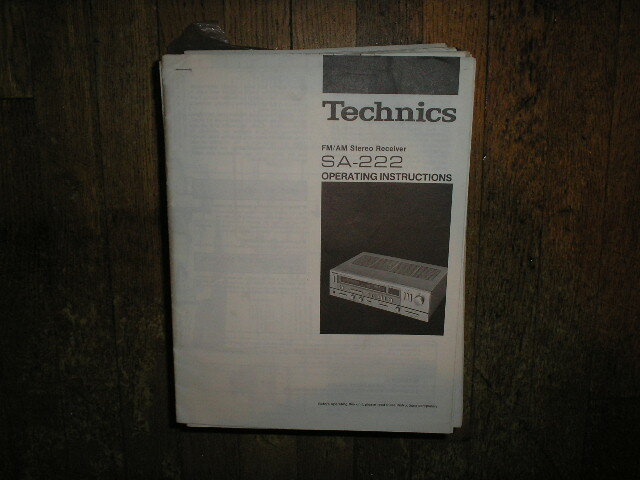 Manual Technics SA-222 Receiver Operator Manual PHOTO COPY! 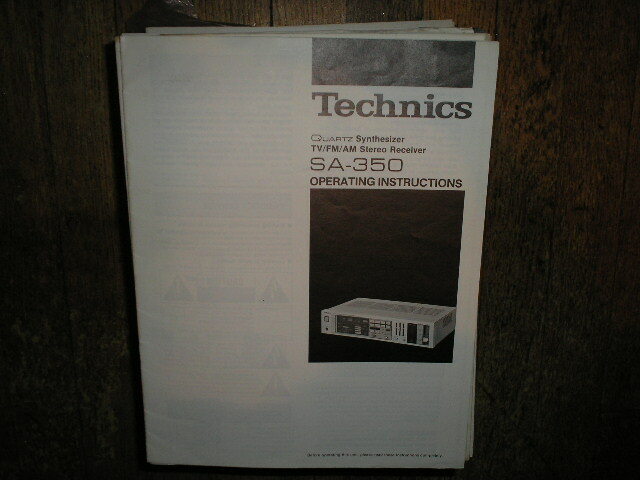 Manual Technics SA-350 Receiver Service Manual PHOTO COPY! 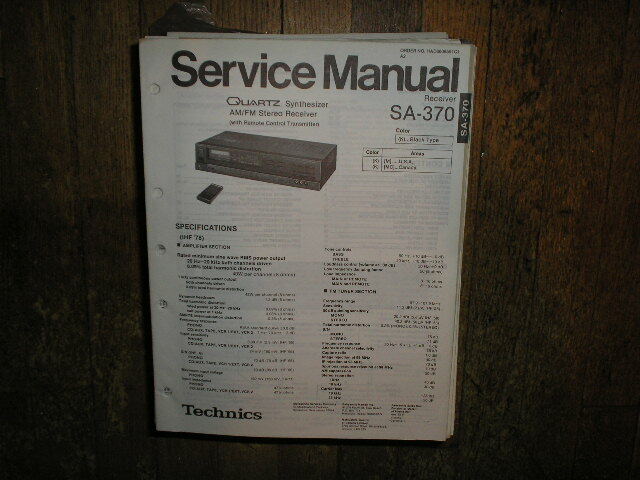 Manual Technics SA-370 Receiver Service Manual PHOTO COPY! 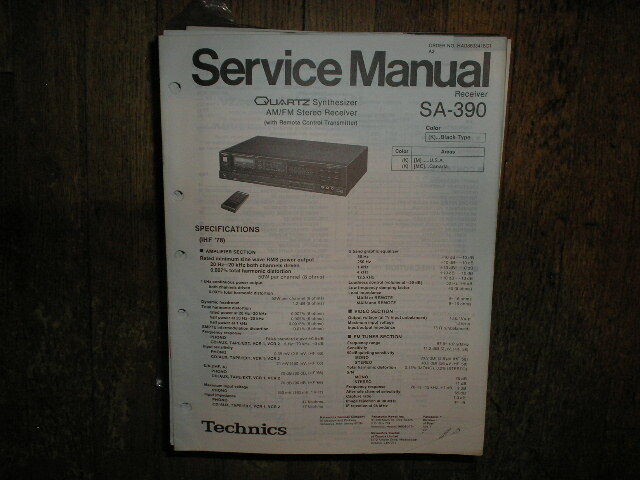 Manual Technics SA-390 Receiver Service Manual PHOTO COPY! 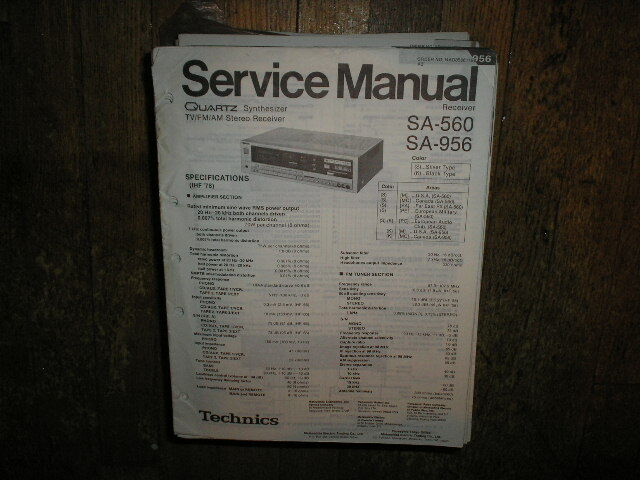 Manual Technics SA-560 Receiver Service Manual PHOTO COPY! 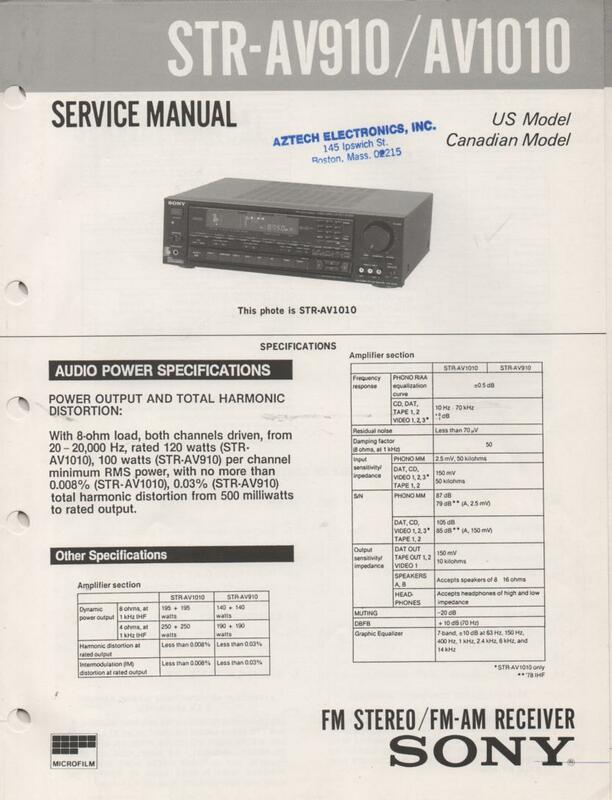 Manual Technics SA-590 Receiver Service Manual PHOTO COPY! 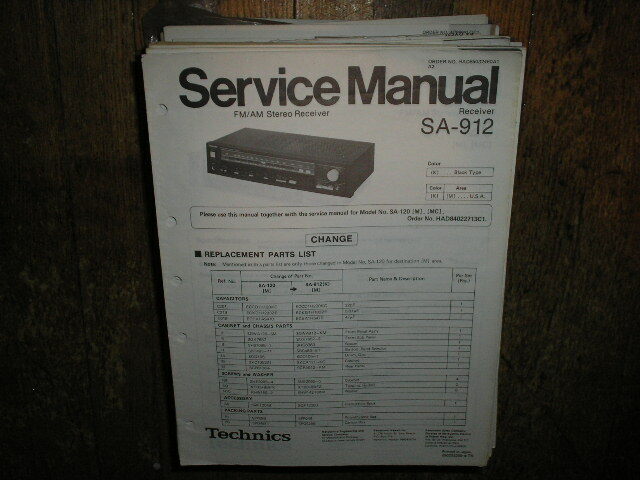 Manual Technics SA-912 Receiver Service Manual PHOTO COPY! 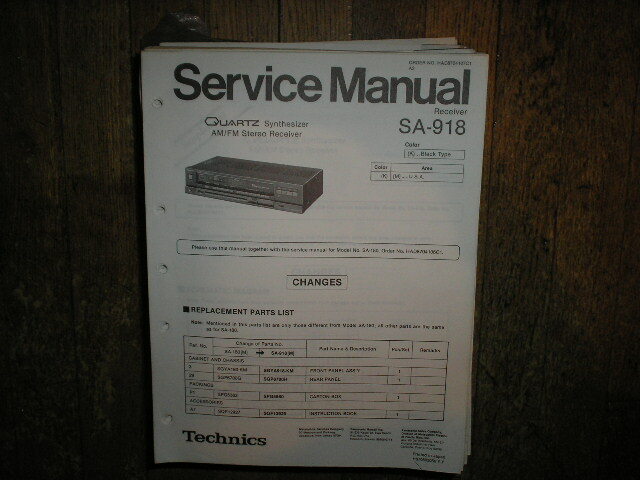 Manual Technics SA-918 Receiver Service Manual PHOTO COPY! 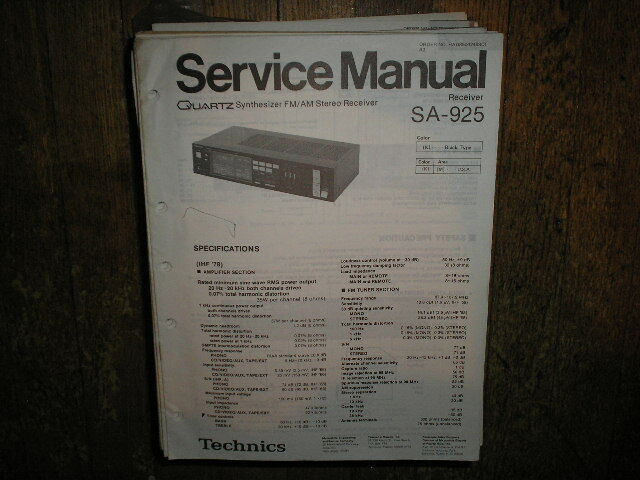 Manual Technics SA-925 Receiver Service Manual PHOTO COPY! 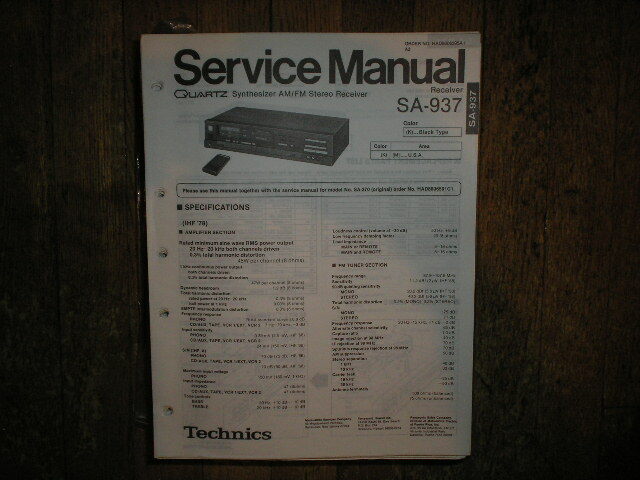 Manual Technics SA-937 Receiver Service Manual PHOTO COPY! 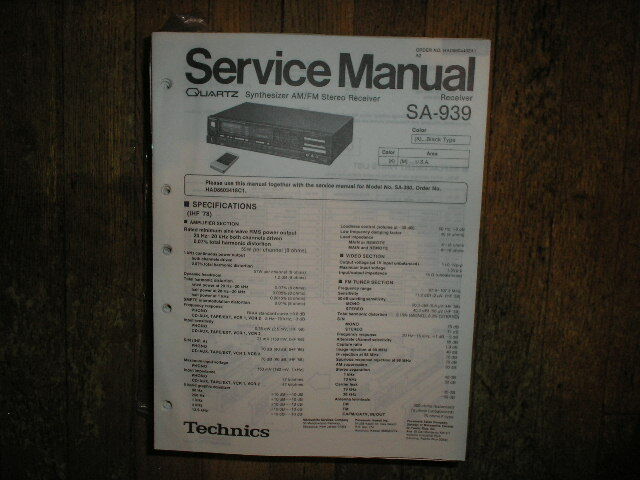 Manual Technics SA-939 Receiver Service Manual PHOTO COPY! 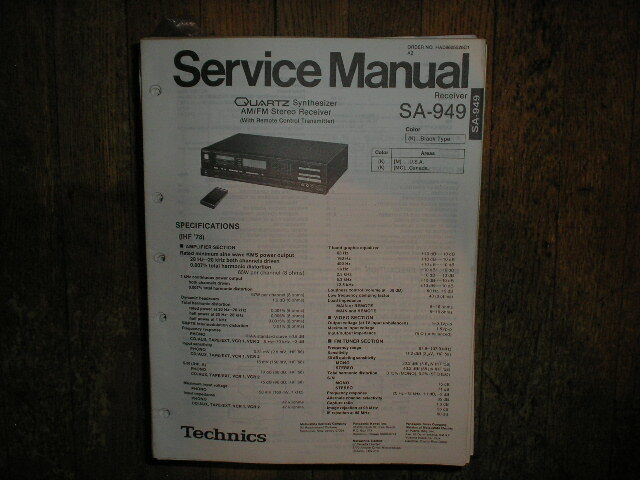 Manual Technics SA-949 Receiver Service Manual PHOTO COPY! 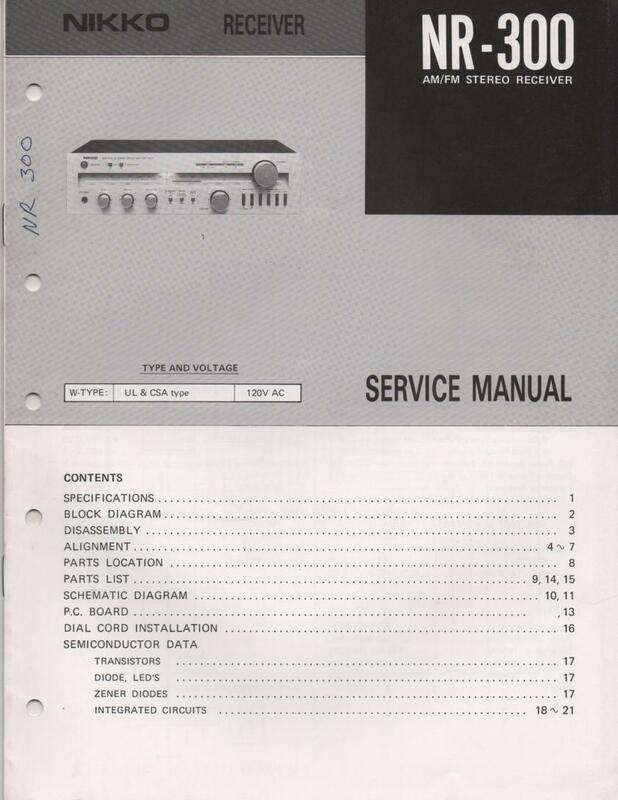 Manual Technics SA-3036 Receiver Service Manual PHOTO COPY! 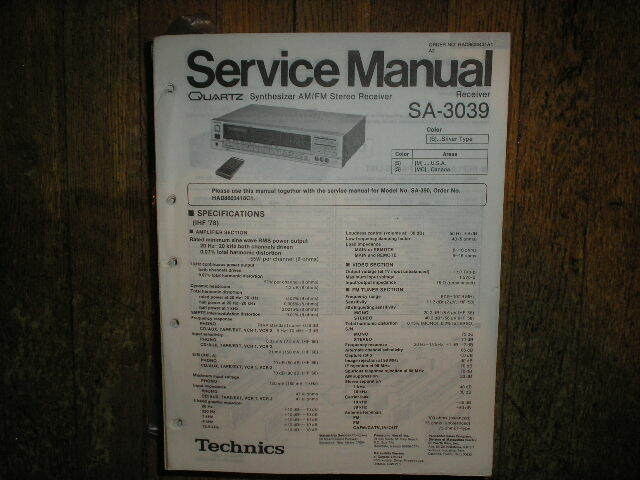 Manual Technics SA-3039 Receiver Service Manual PHOTO COPY! 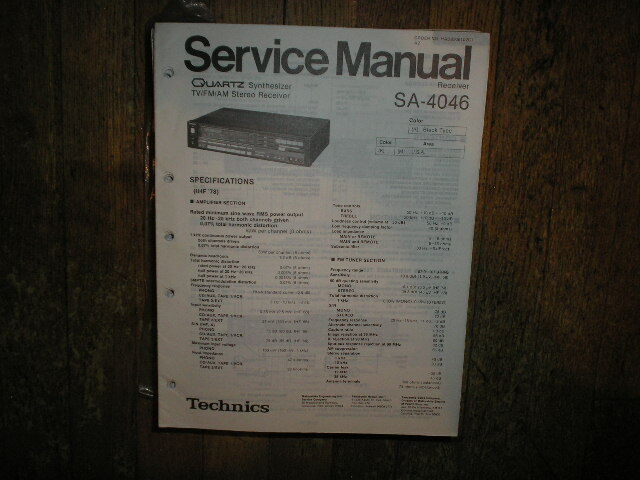 Manual Technics SA-4046 Receiver Service Manual PHOTO COPY! 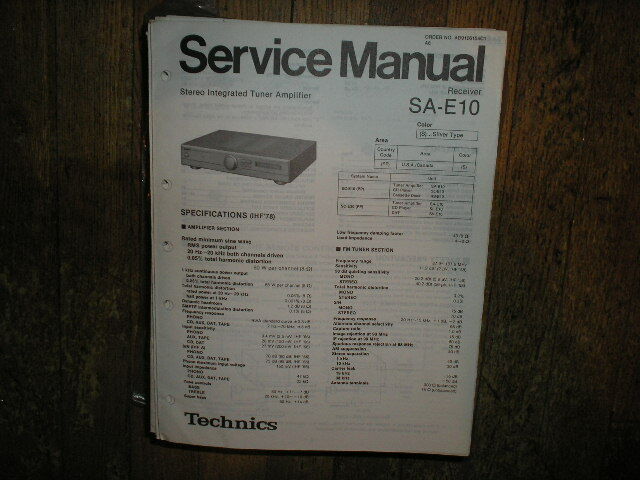 Manual Technics SA-E10 Receiver Service Manual PHOTO COPY! 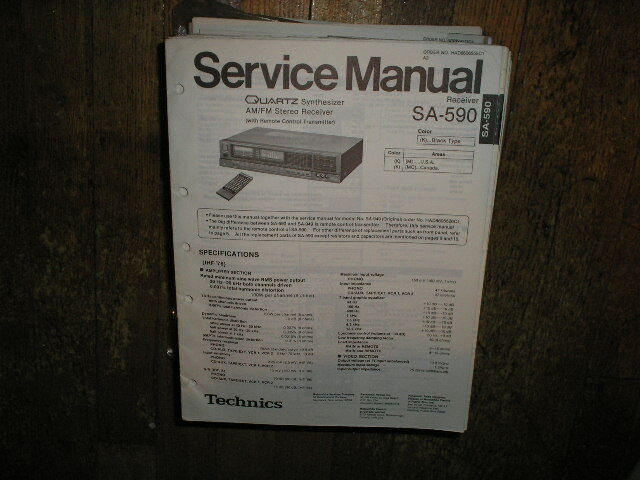 Manual Technics SA-EX800 Receiver Service Manual PHOTO COPY! 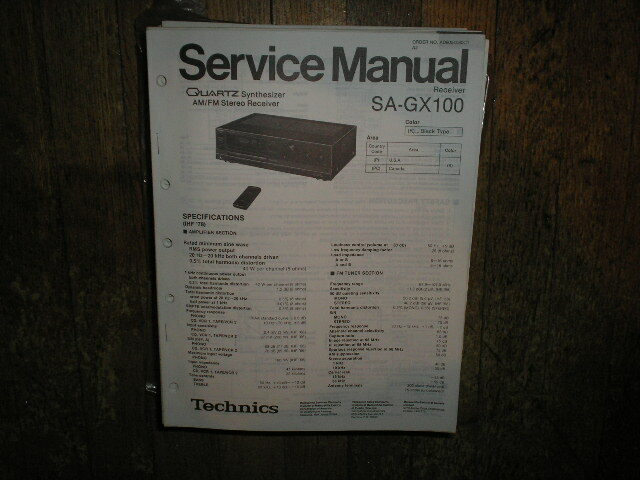 Manual Technics SA-GX100 Receiver Service Manual PHOTO COPY! 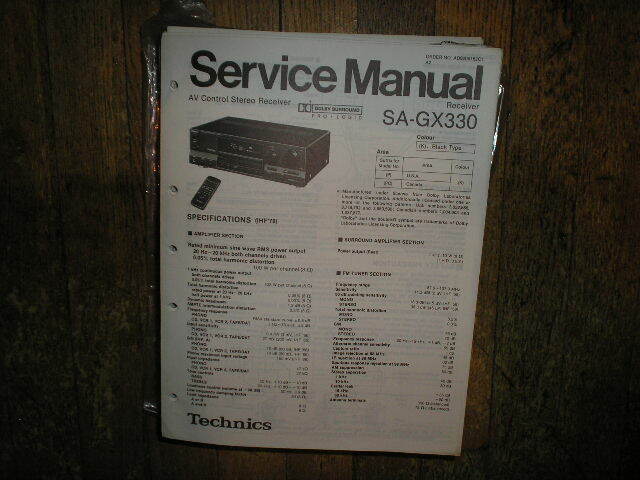 Manual Technics SA-GX300 Receiver Service Manual PHOTO COPY! 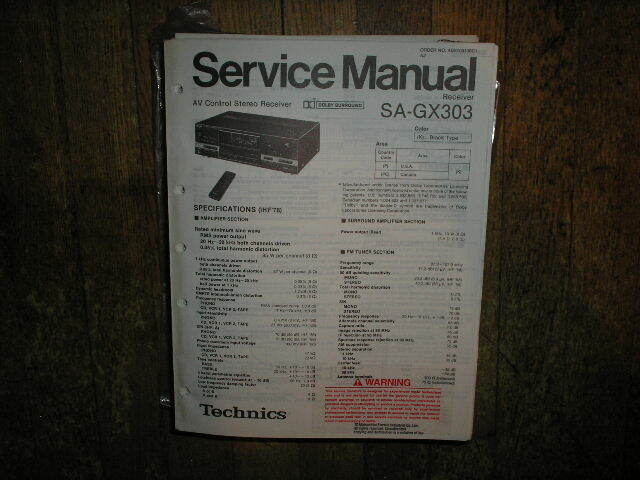 Manual Technics SA-GX303 Receiver Service Manual PHOTO COPY! 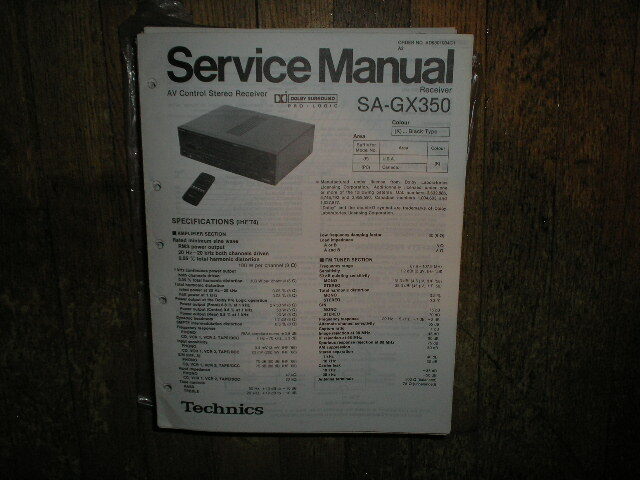 Manual Technics SA-GX330 Receiver Service Manual PHOTO COPY! 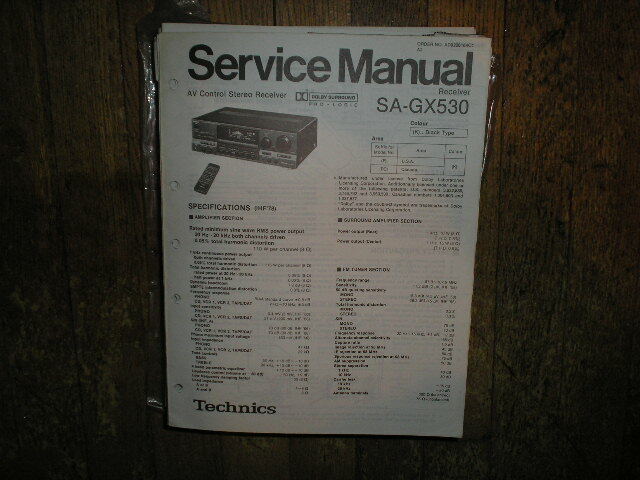 Manual Technics SA-GX350 Receiver Service Manual PHOTO COPY! 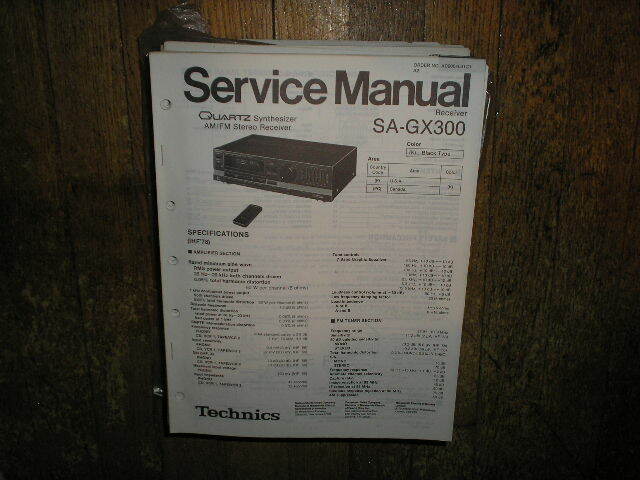 Manual Technics SA-GX500 Receiver Service Manual PHOTO COPY! 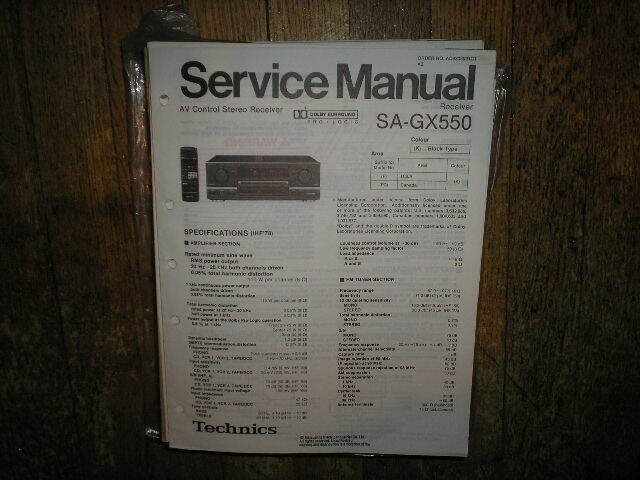 Manual Technics SA-GX530 Receiver Service Manual PHOTO COPY! 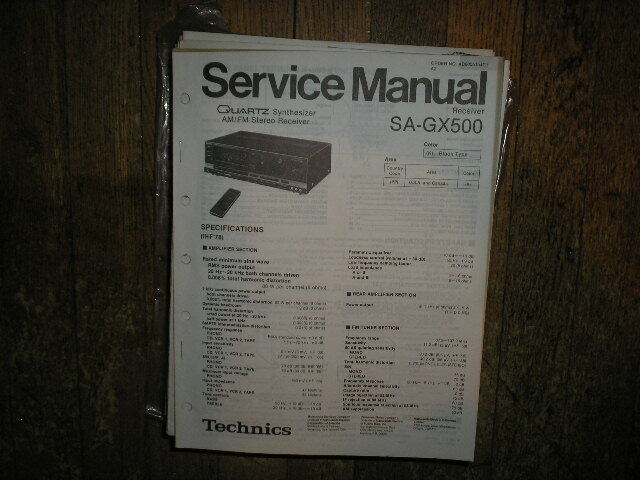 Manual Technics SA-GX550 Receiver Service Manual PHOTO COPY! 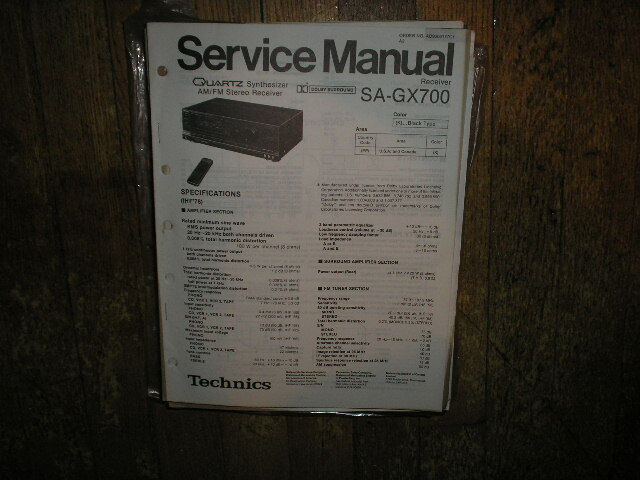 Manual Technics SA-GX700 Receiver Service Manual PHOTO COPY! 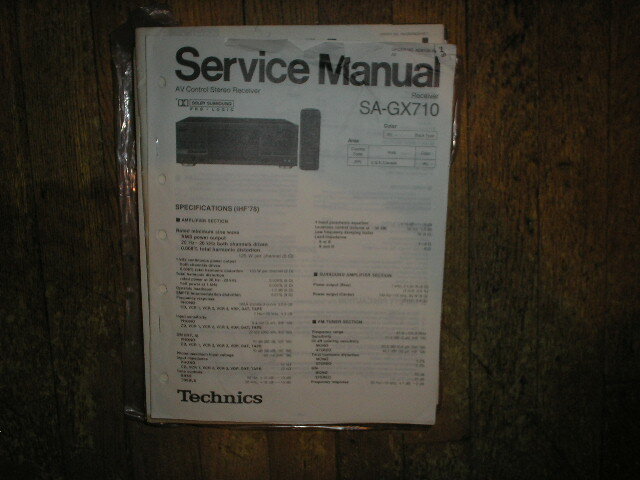 Manual Technics SA-GX710 Receiver Service Manual PHOTO COPY! 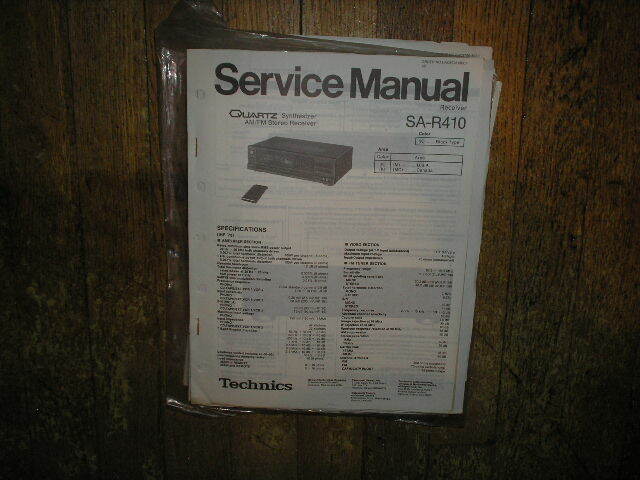 Manual Technics SA-R100 Receiver Service Manual PHOTO COPY! 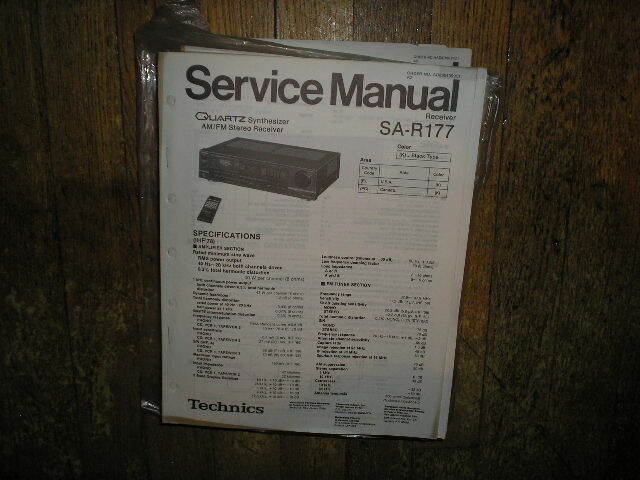 Manual Technics SA-R177 Receiver Service Manual PHOTO COPY! 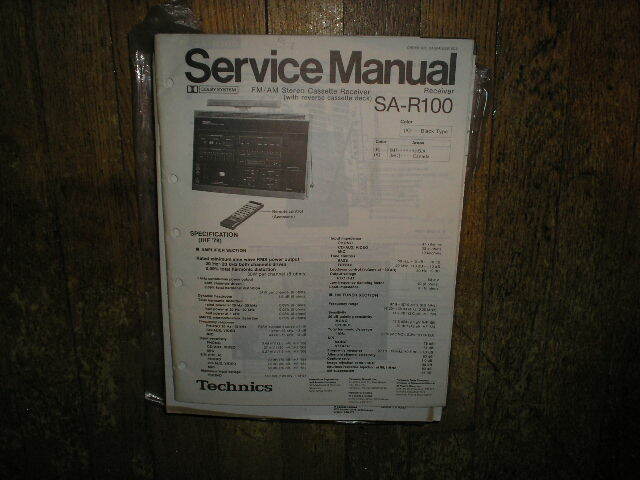 Manual Technics SA-R210 Receiver Service Manual PHOTO COPY! 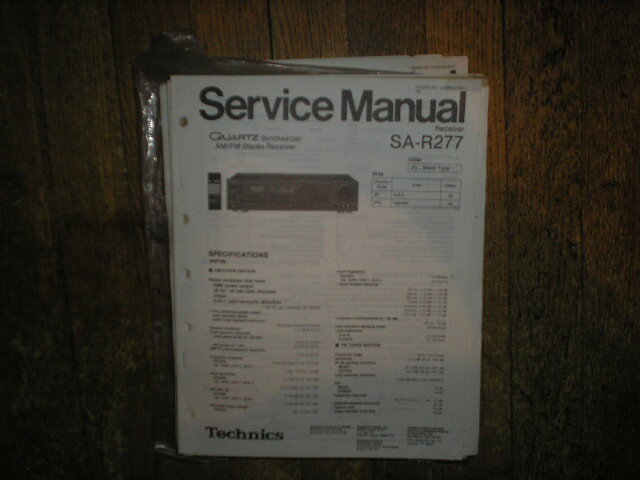 Manual Technics SA-R277 Receiver Service Manual PHOTO COPY! Manual Technics SA-R310 Receiver Service Manual PHOTO COPY! 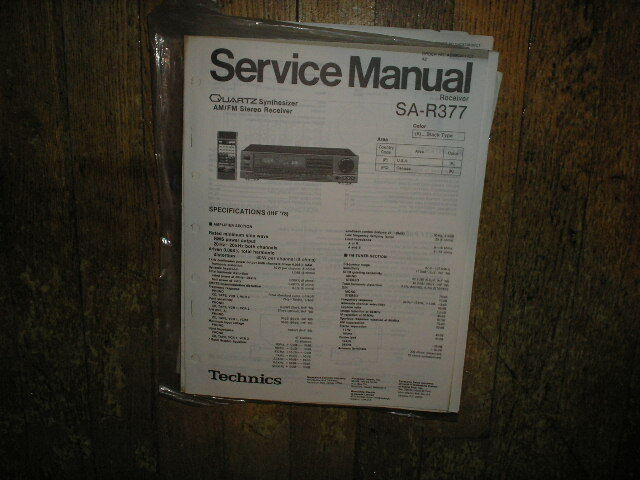 Manual Technics SA-R377 Receiver Service Manual PHOTO COPY! 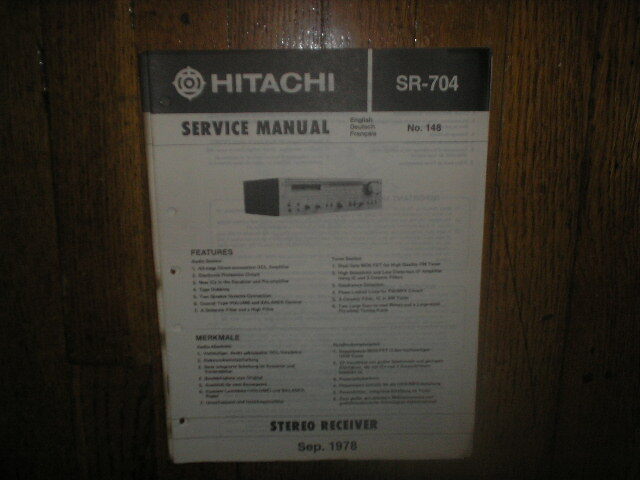 Manual Technics SA-R410 Receiver Service Manual PHOTO COPY! 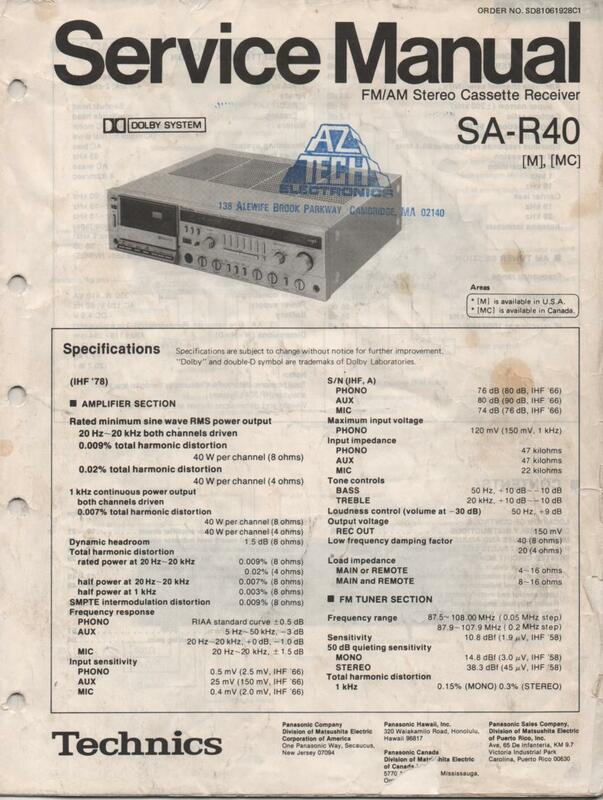 Manual Technics SA-R430 Receiver Operating Manual PHOTO COPY! 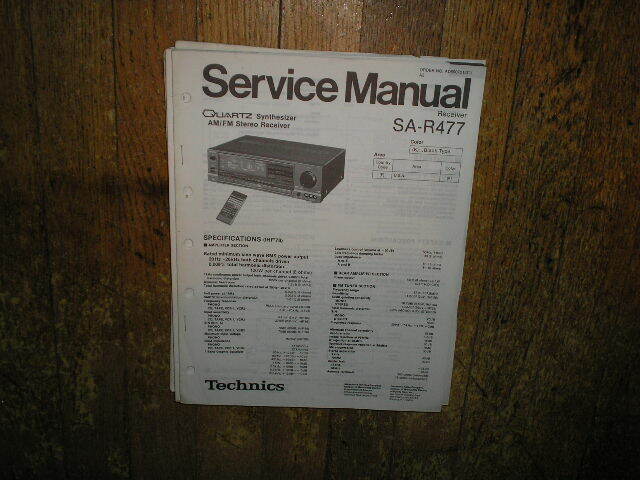 Manual Technics SA-R477 Receiver Service Manual PHOTO COPY! 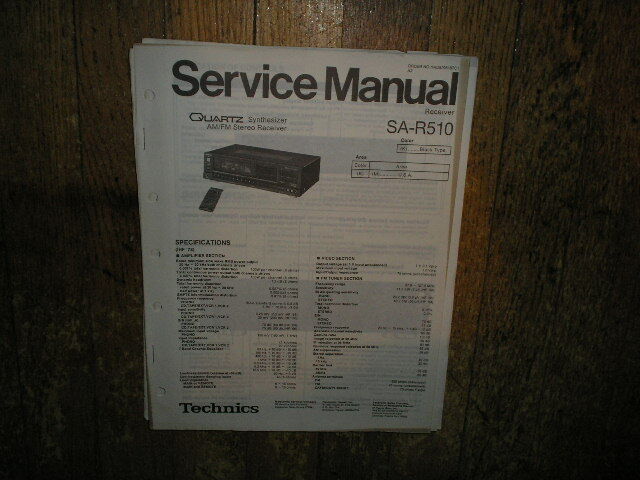 Manual Technics SA-R510 Receiver Service Manual PHOTO COPY! 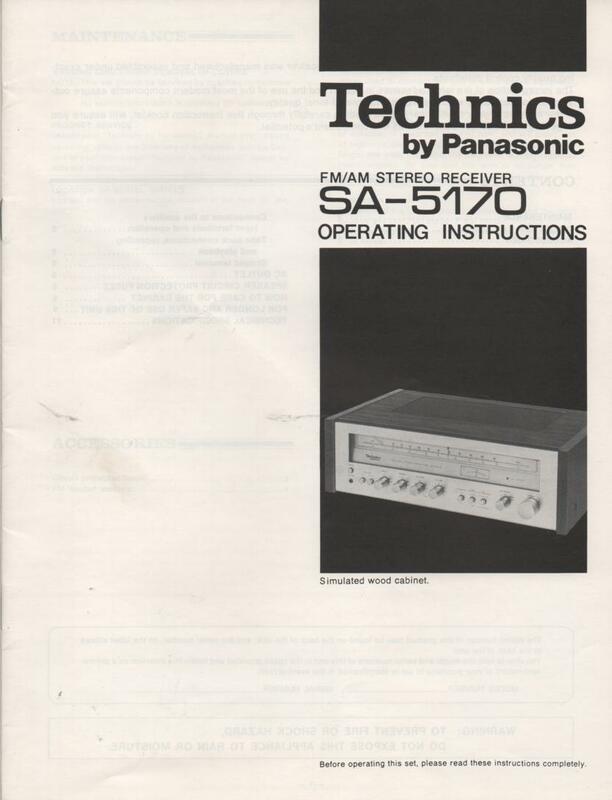 Manual Technics SA-5170 Receiver Owners Operating Instruction Manual PHOTO COPY! 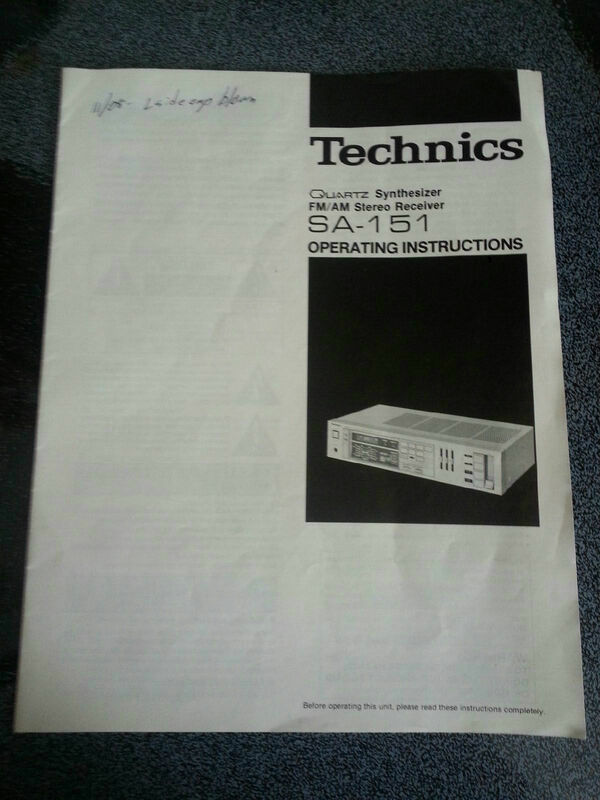 Manual Technics SA-151 Receiver Owners Manual PHOTO COPY! 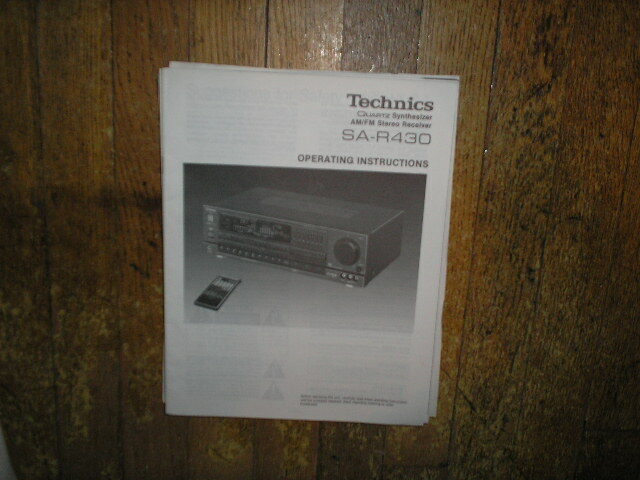 Manual Technics SA-R40 Cassette Receiver Service Instruction Manual PHOTO COPY! 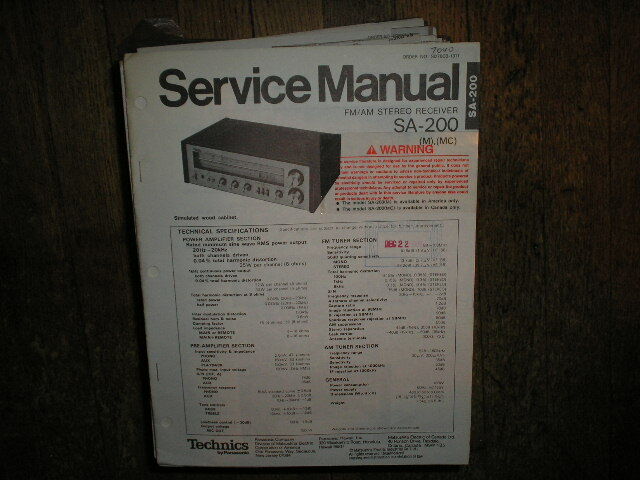 Manual Technics SA-203 Receiver Service Instruction Manual PHOTO COPY! 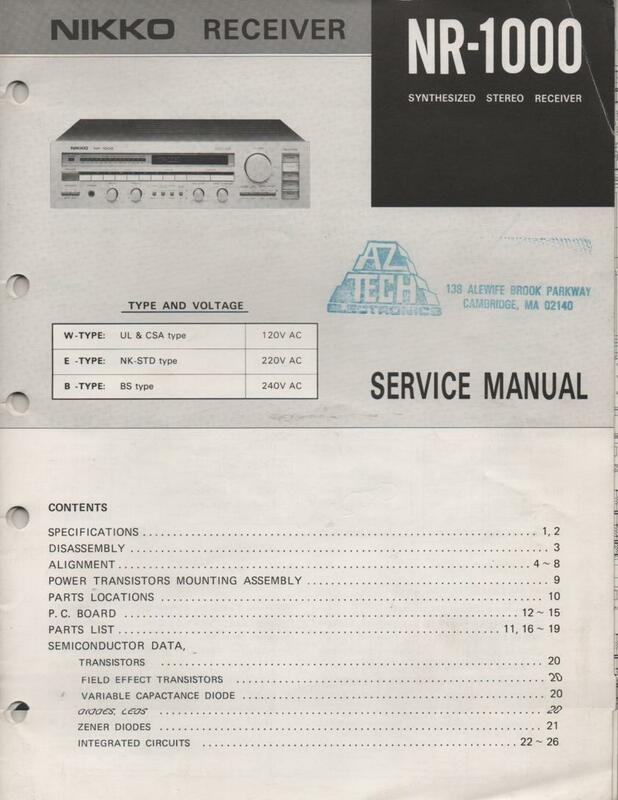 Manual Technics SA-410 Receiver Service Instruction Manual PHOTO COPY! 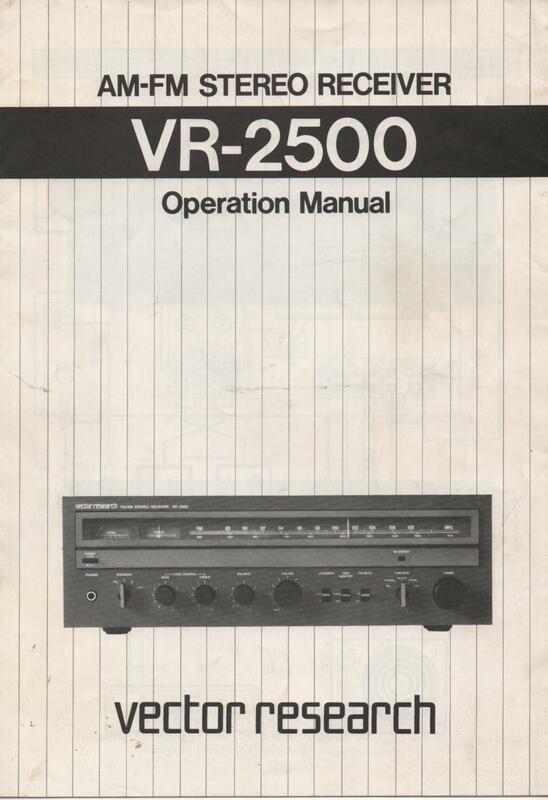 Manual Vector ResearchVR-2500 Stereo Receiver Owners Operating Instruction Manual with schematic PHOTO COPY! 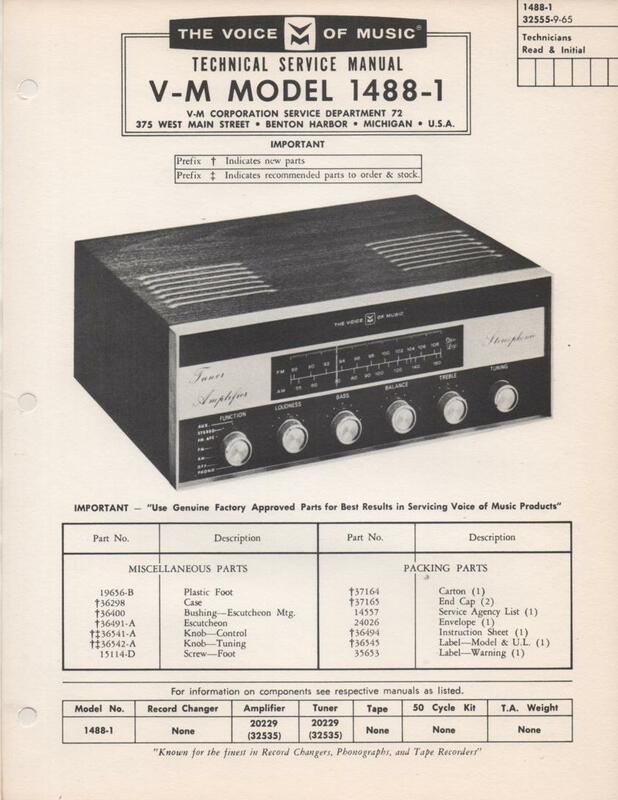 Manual VOICE OF MUSIC1484 Receiver Service Manual PHOTO COPY! 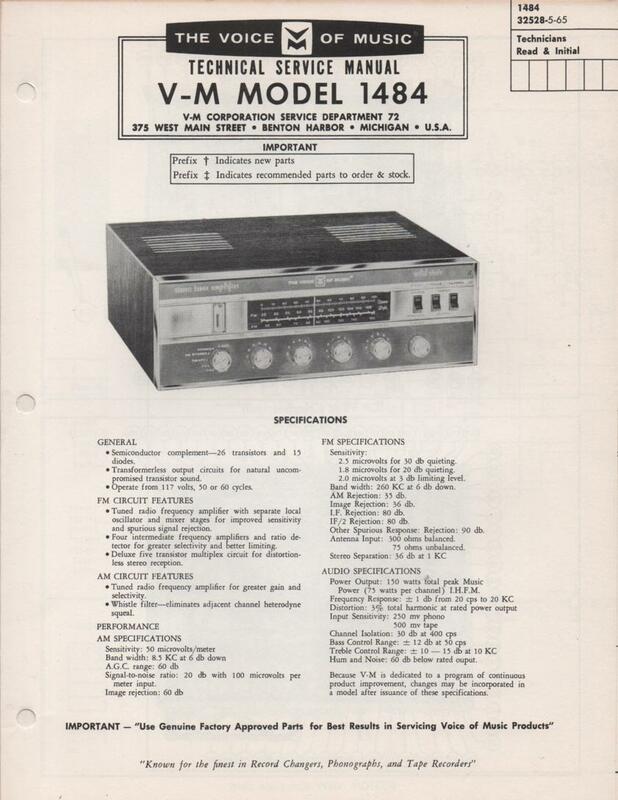 Manual VOICE OF MUSIC1488-1 Receiver Service Manual. Comes with 20229 Amplifier Tuner manual PHOTO COPY! 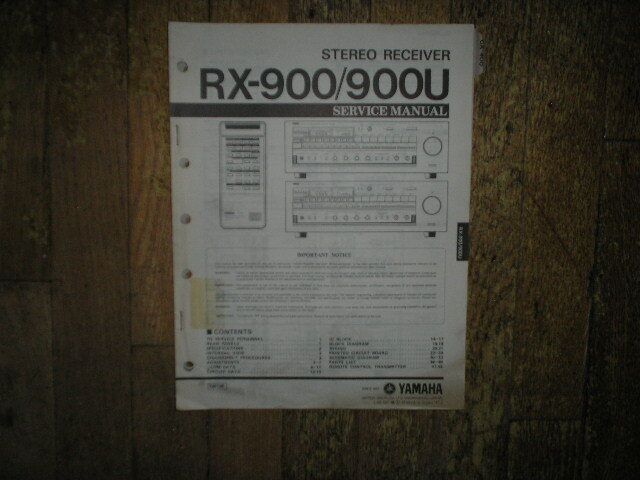 Manual YAMAHARX-900 RX-900U Stereo Receiver Service Manual PHOTO COPY! 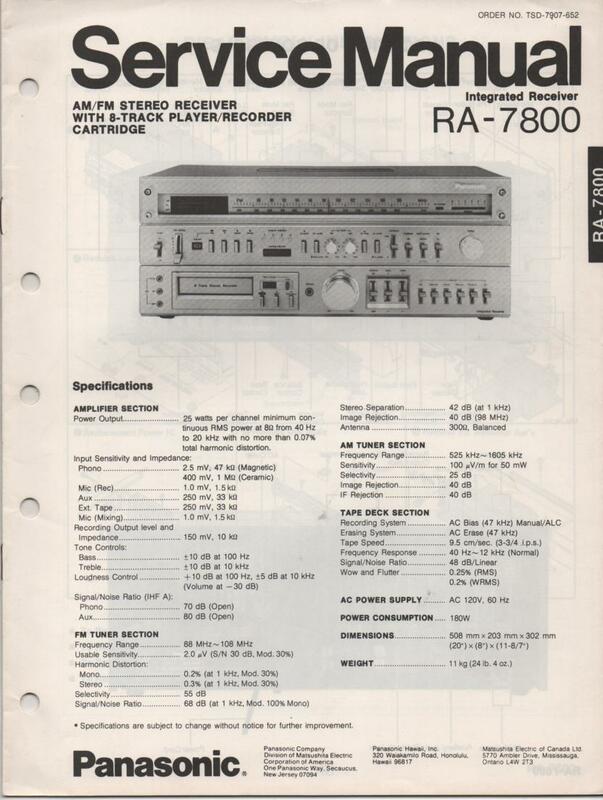 Manual YAMAHACR-800 Receiver Owners Manual PHOTO COPY! 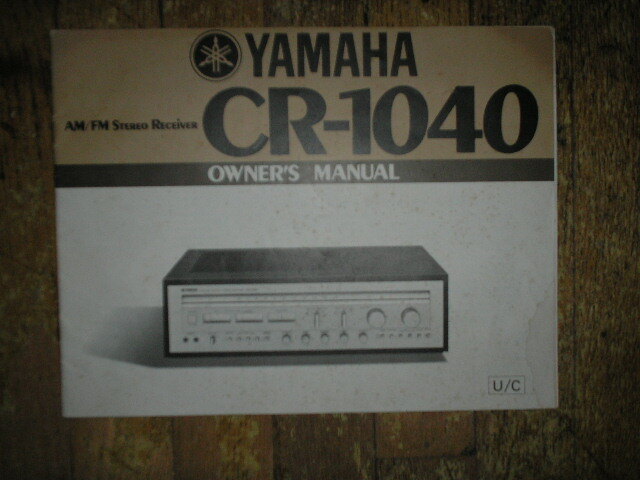 Manual YAMAHACR-1040 Receiver Owners Manual PHOTO COPY! 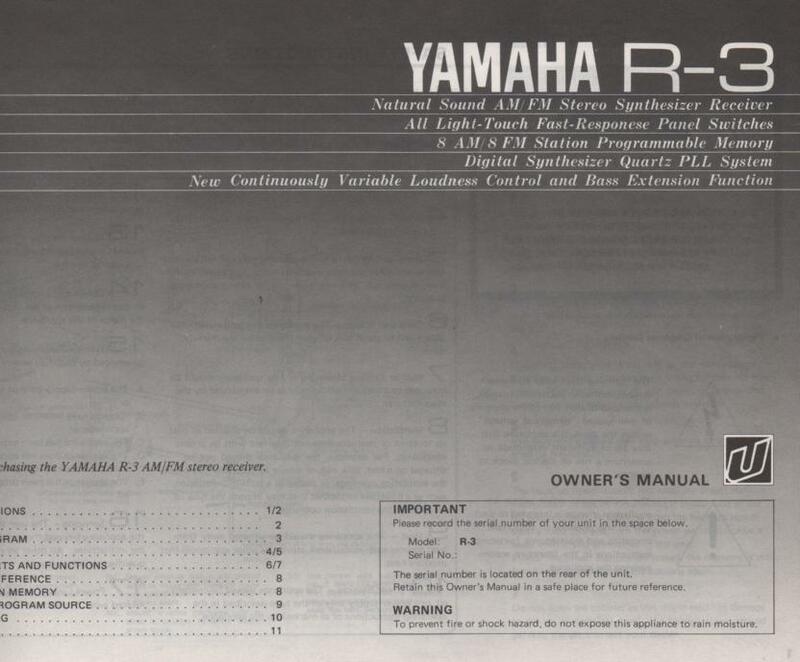 Manual YAMAHAR-3 Receiver Owners Instruction Manual PHOTO COPY! 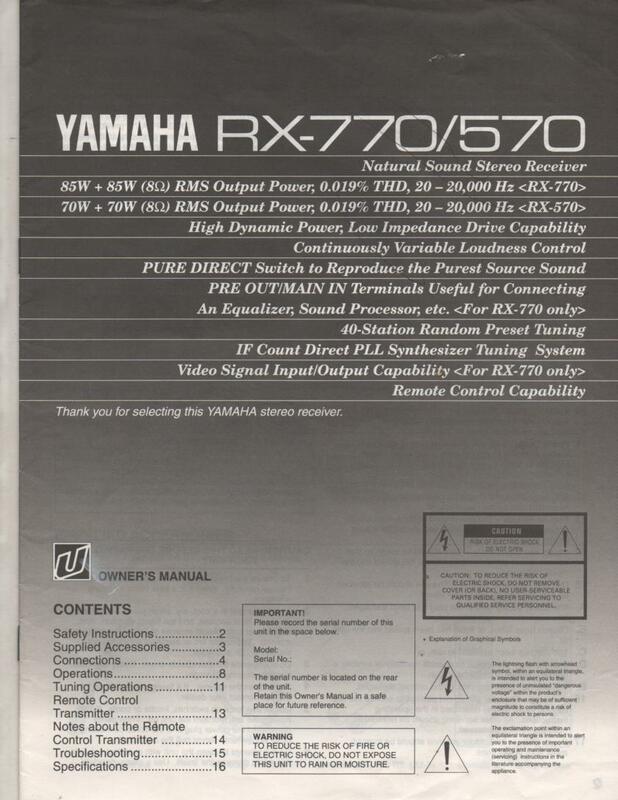 Manual YAMAHARX-570 RX-770 Receiver Owners Instruction Manual PHOTO COPY! 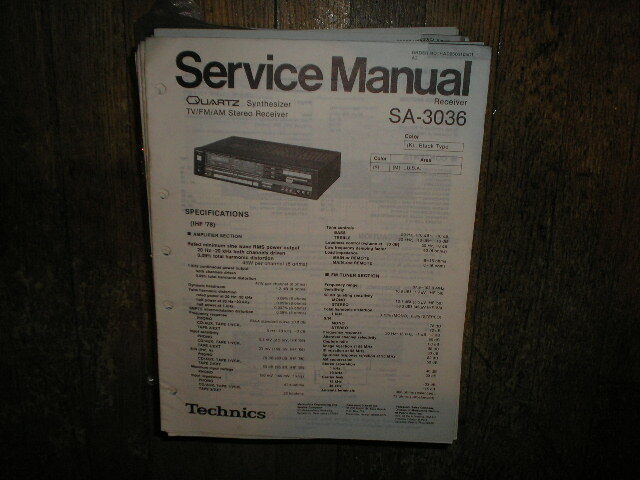 Manual ZenithMC6010-1 Stereo System Service Manual HF37S1 PHOTO COPY! 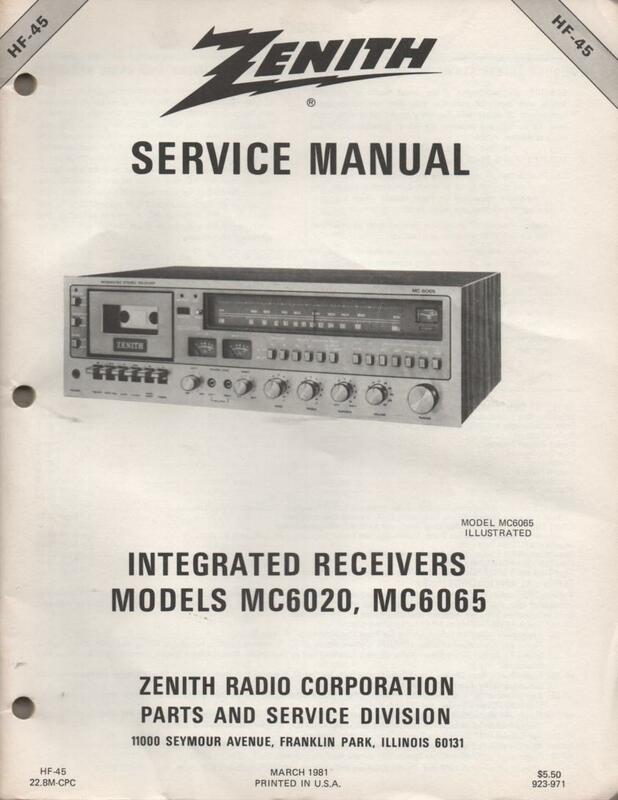 Manual ZenithMC6020 MC6065 Stereo System Service Manual HF45 PHOTO COPY! 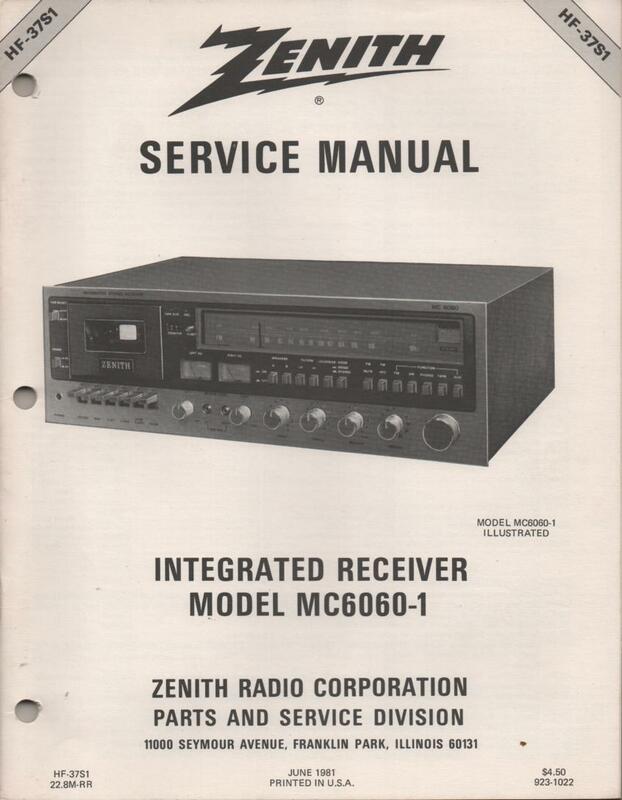 Manual ZenithMC7030 MC7040 MC7050 Stereo System Service Manual HF38 PHOTO COPY! 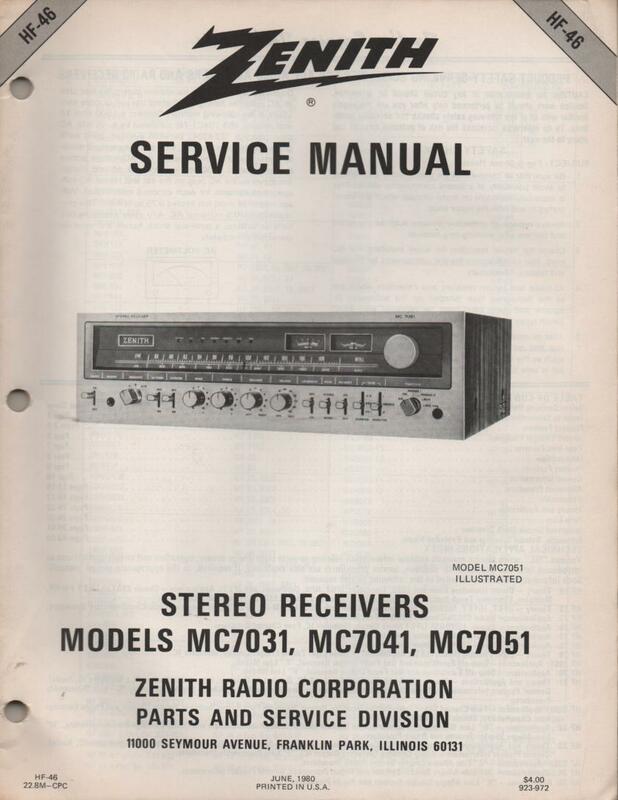 Manual ZenithMC7031 MC7041 MC7051 Stereo Receiver Service Manual HF46 PHOTO COPY! 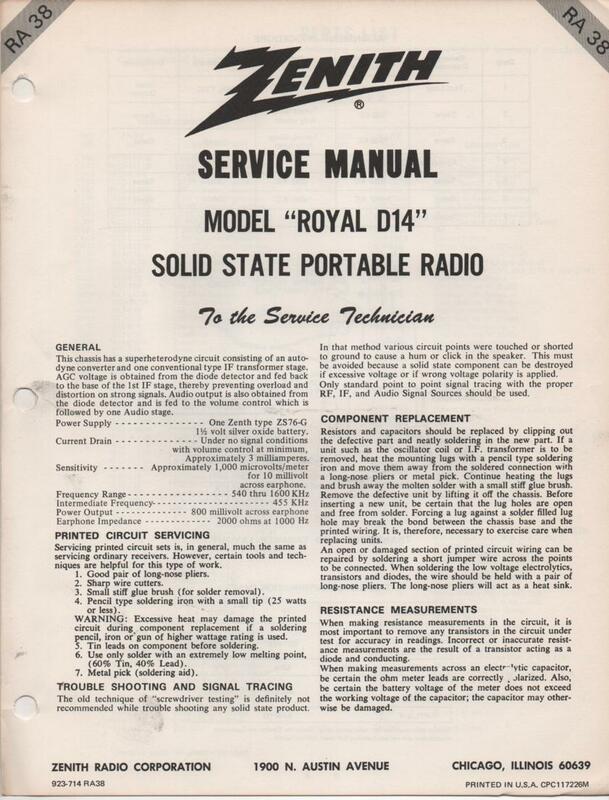 Manual ZenithD14 Royal D14 Portable Radio Service Manual RA38 PHOTO COPY! 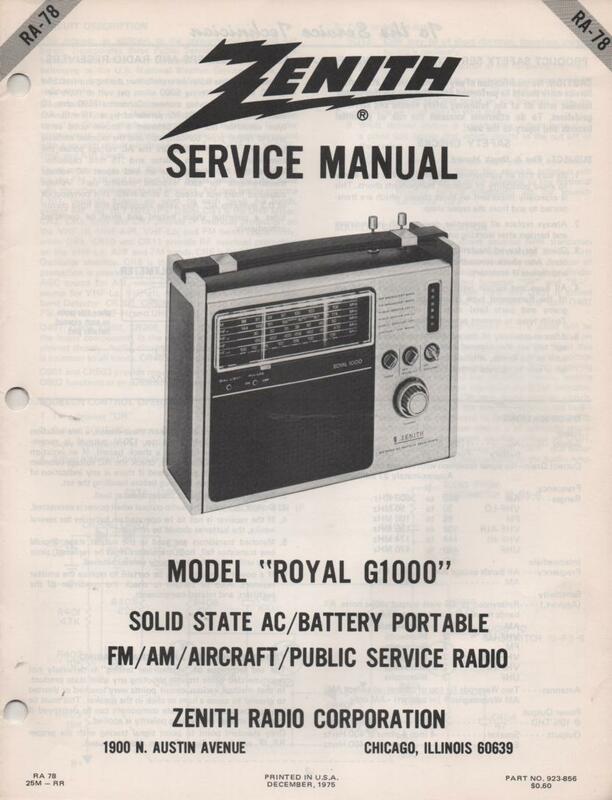 Manual ZenithG1000 Royal G1000 Multi-Band Radio Service Manual RA78 PHOTO COPY!